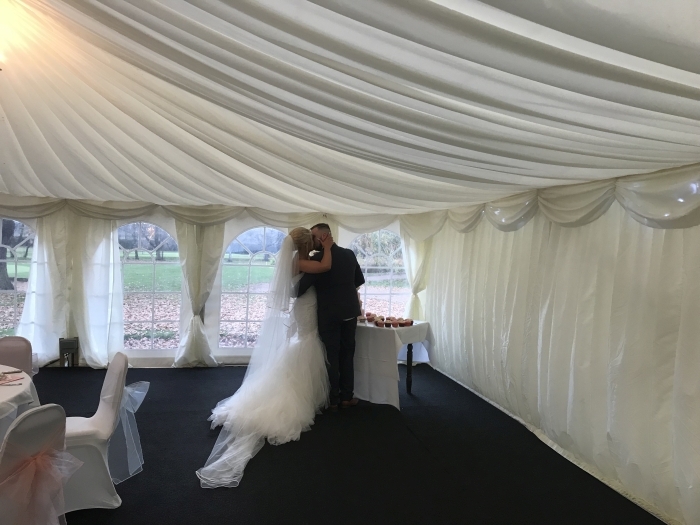 Monday 19th November 2018 was the Wedding of Michael & Paignton in a marquee at the fabulous Shrewsbury Golf Club, Condover, Shropshire. 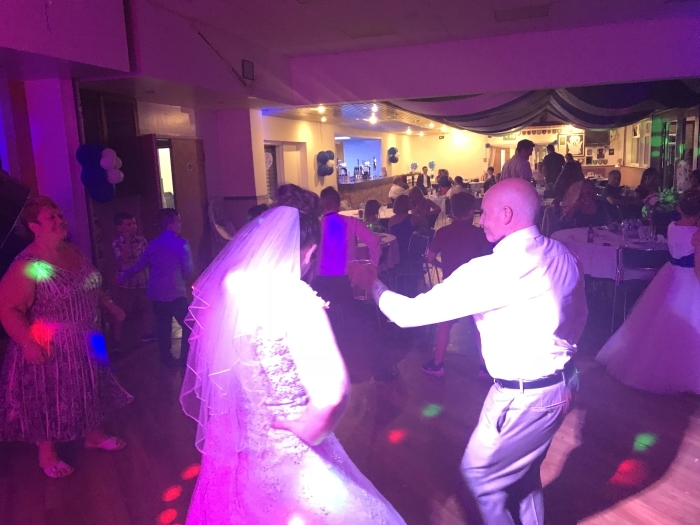 Supplying my full day and night package starting at 2:30pm with background music for guest arrival and working through the last dance of the evening at 11:00pm. 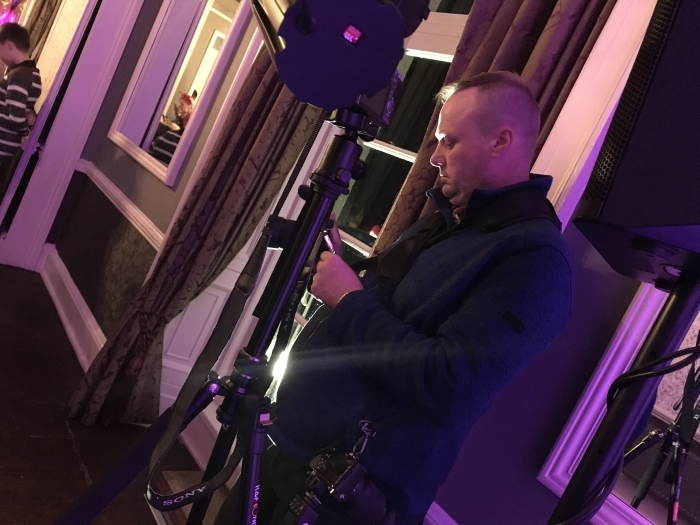 This short video shows the setup I used for this wedding and what it looked like. 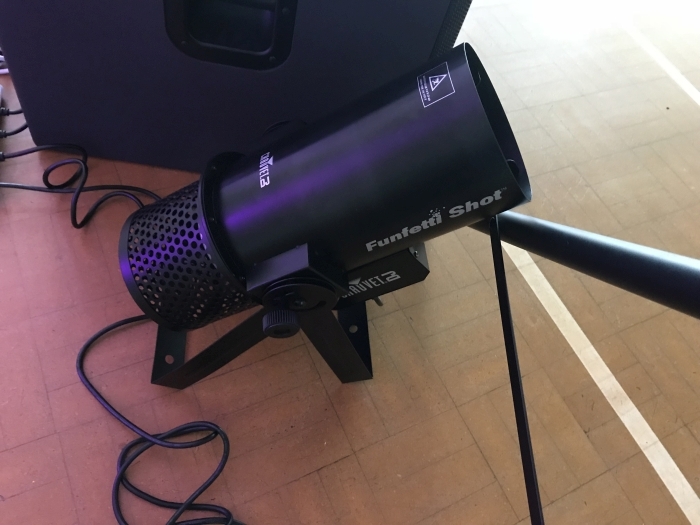 A selection of photos I took while setting up and of the setup. 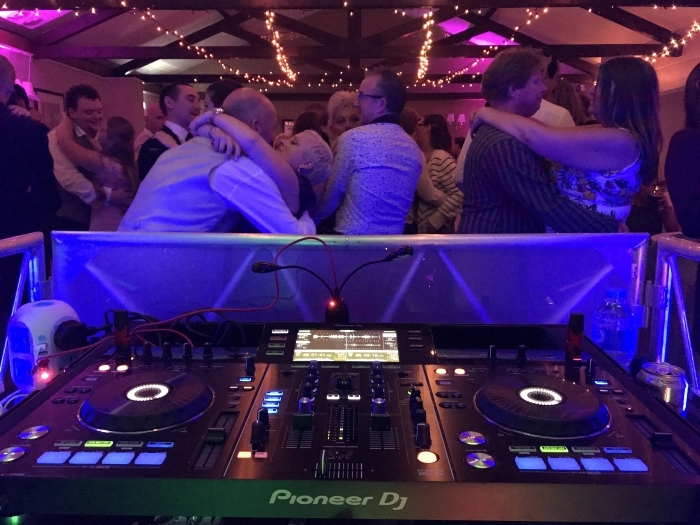 This selection of photos were taken mainly from the DJ booth. 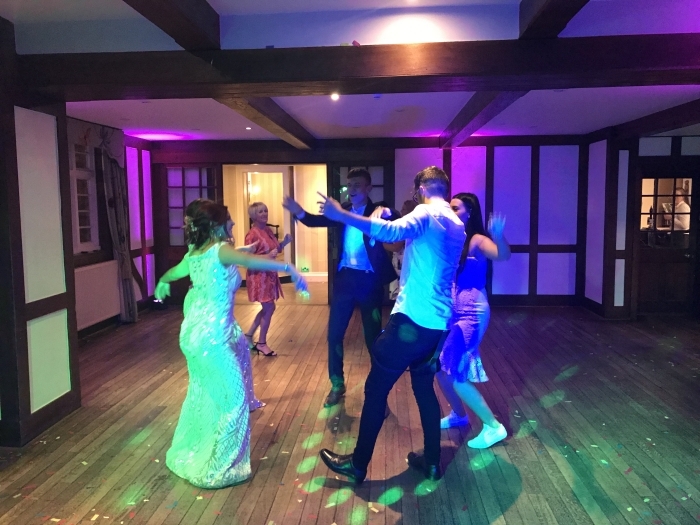 Its great to get everyone up and around the dancefloor for the first dance. 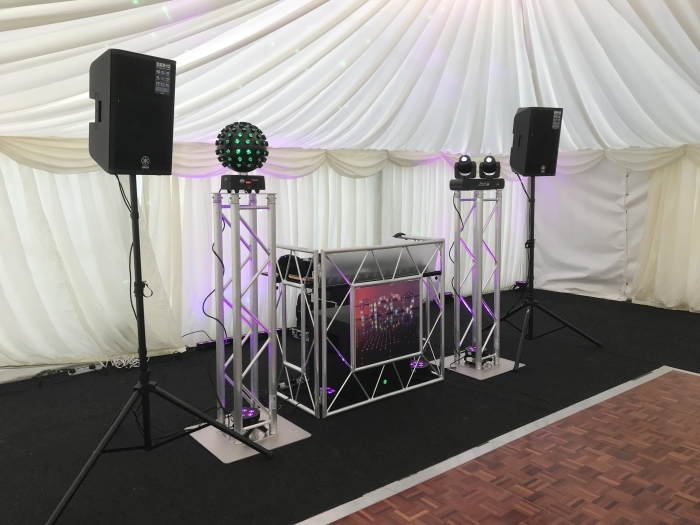 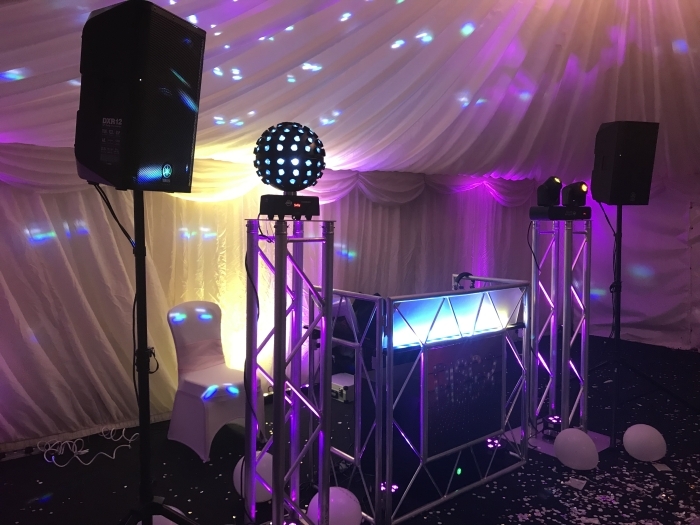 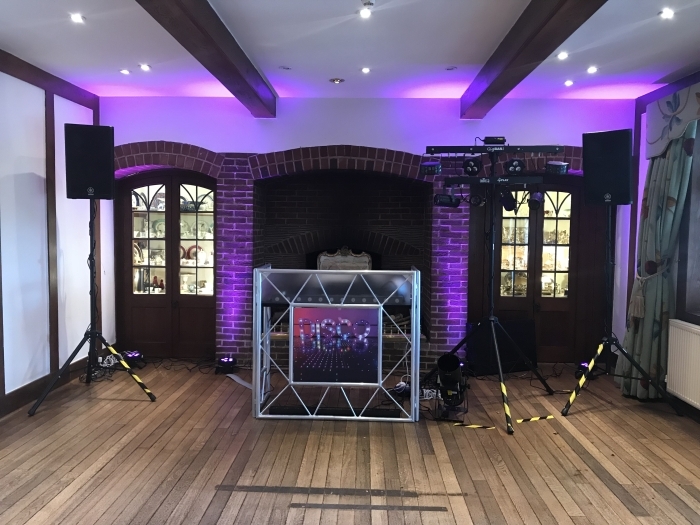 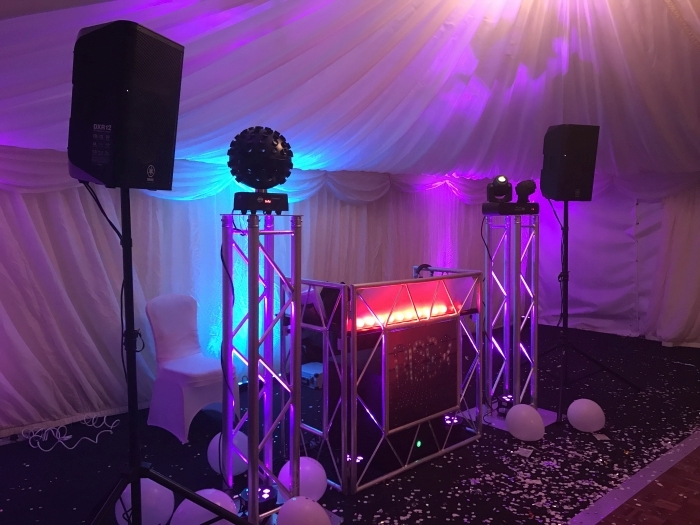 As you have seen in the overview video above, I have used a contemporary setup at this wedding with two truss plinths and the truss-based DJ booth. 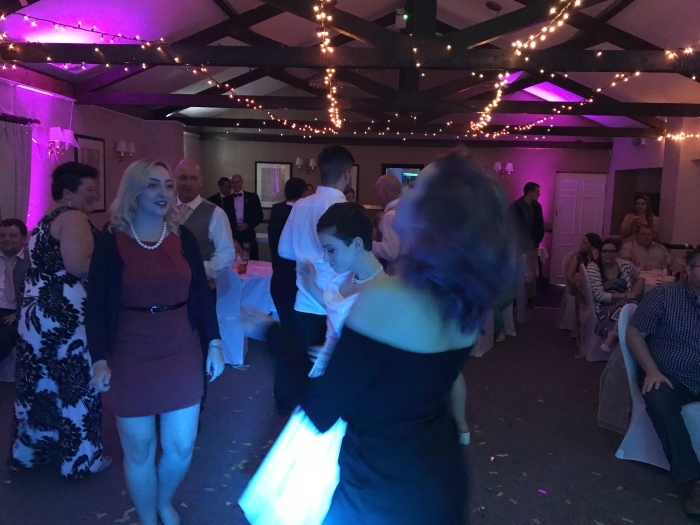 Which I feel gave a fab effect and look. 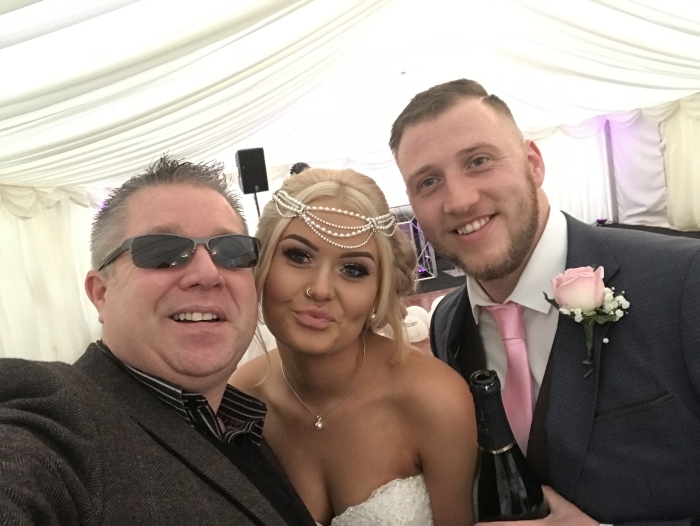 A quick selfie with the bride & groom! 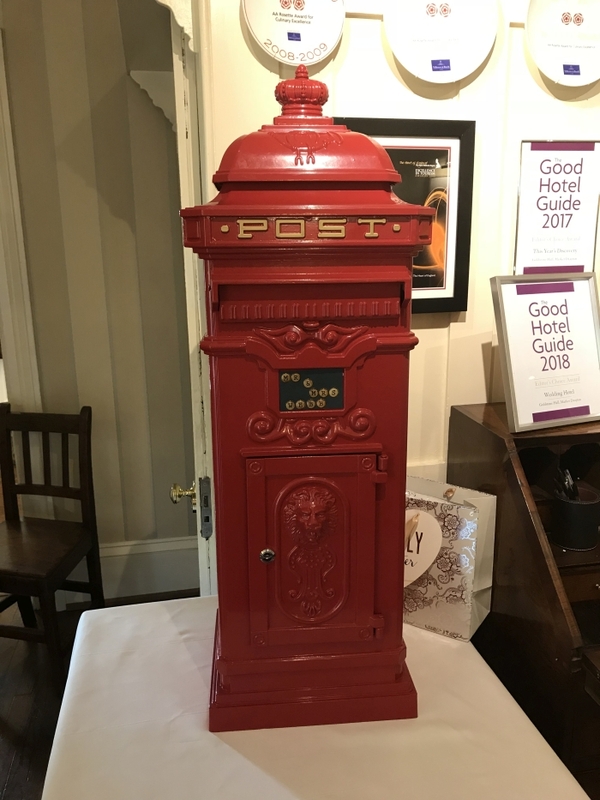 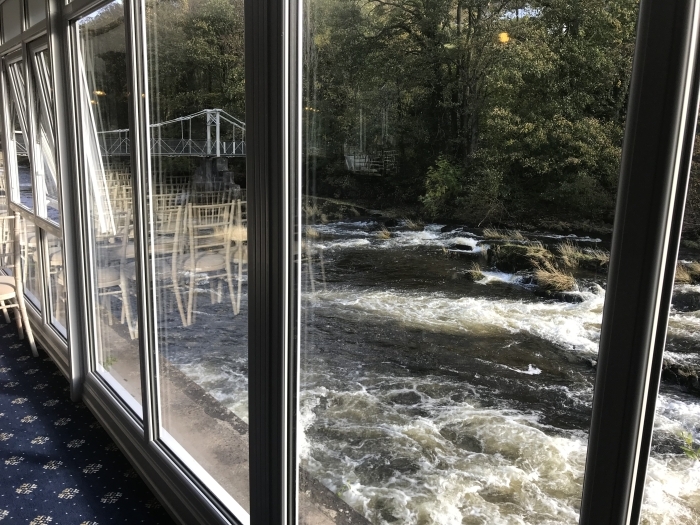 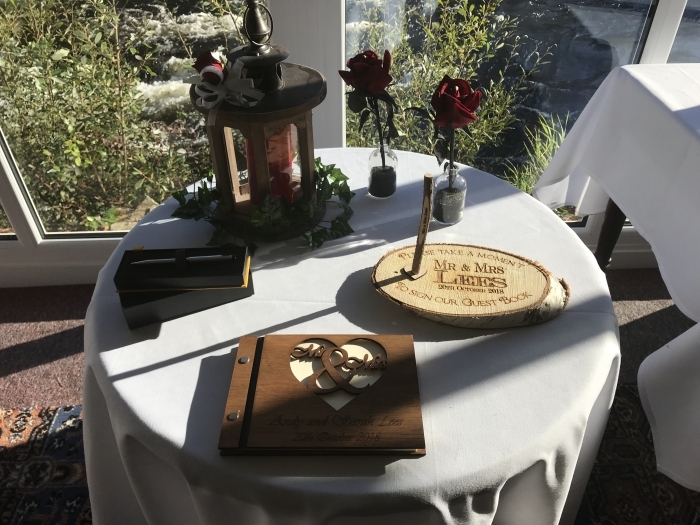 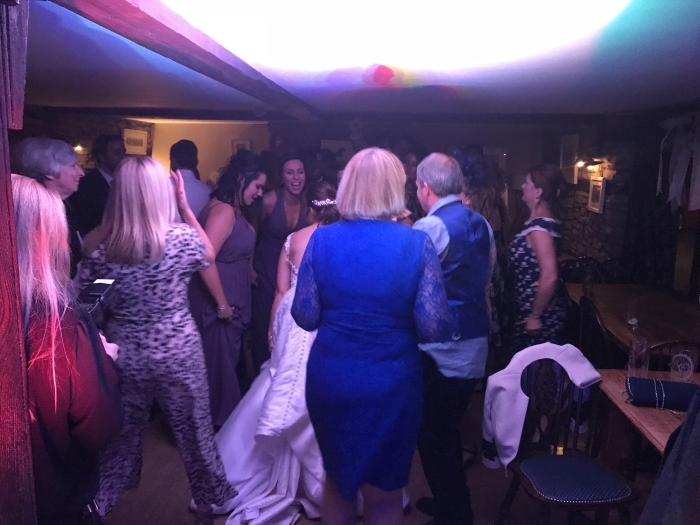 Saturday 20th October 2018 was the Wedding of Andy and Sarah Lees at the wonderful Chainbridge Hotel Nr Llangollen Wales. 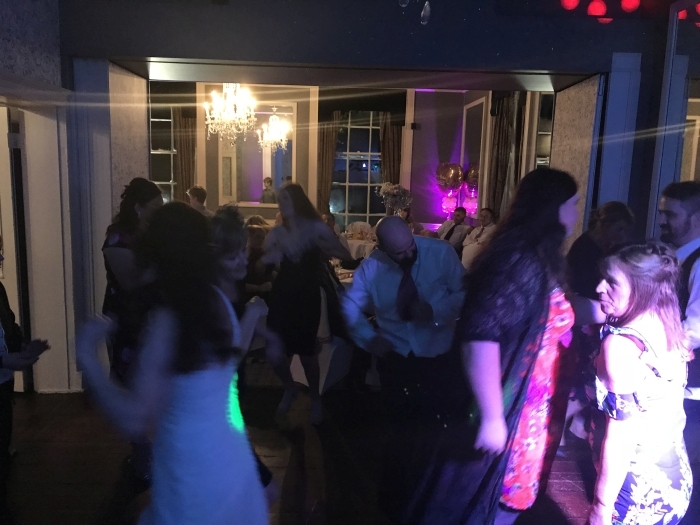 I was booked to provide my Day and Night package that included wedding ceremony music, Introduction of bride and groom to room, background music for Wedding Breakfast and then of course the main disco in the evening. 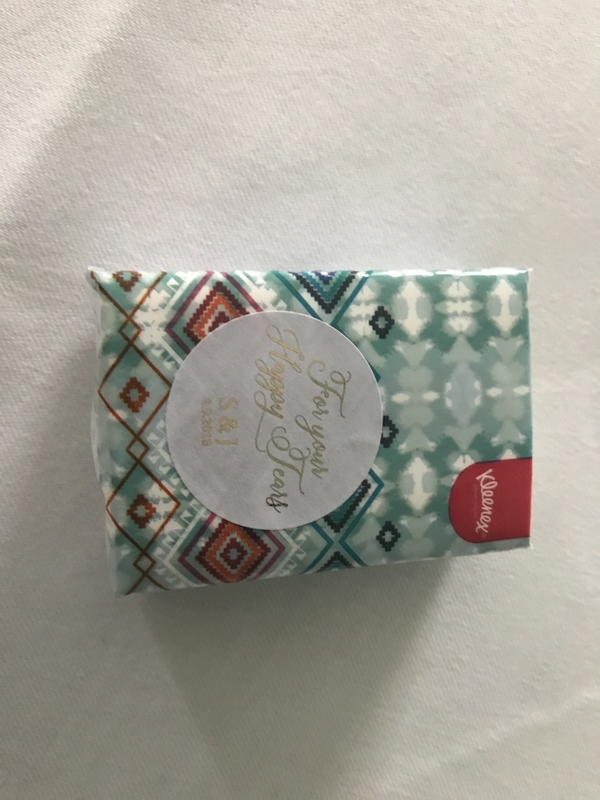 A quick vide running through the day. 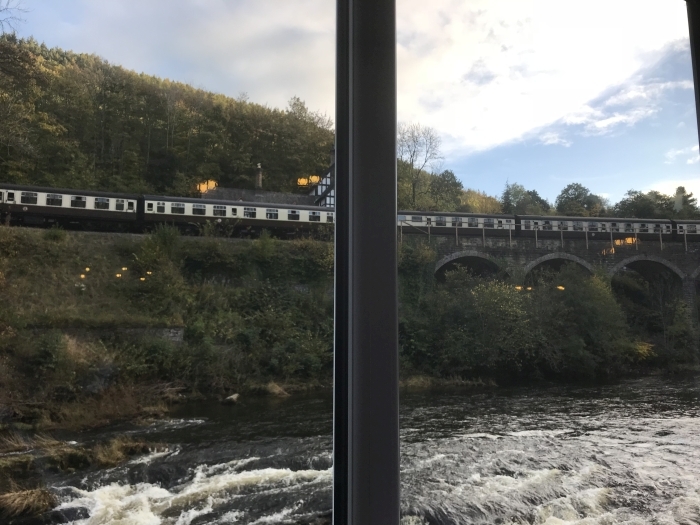 A selection of pictures I took when I arrived. 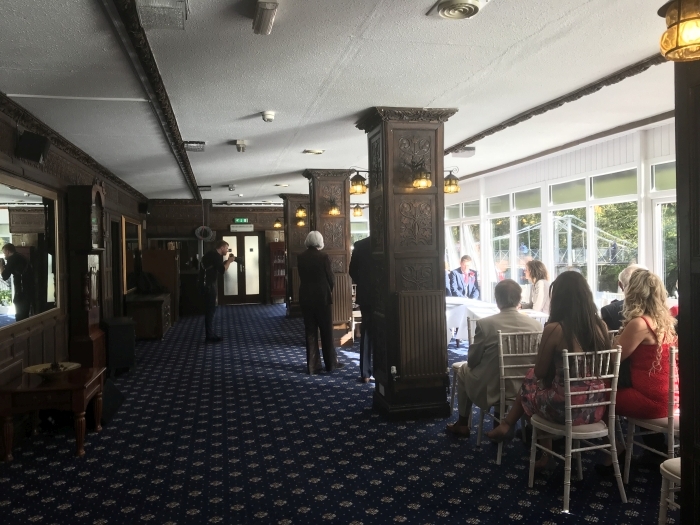 These photos are of the Ceremony room. 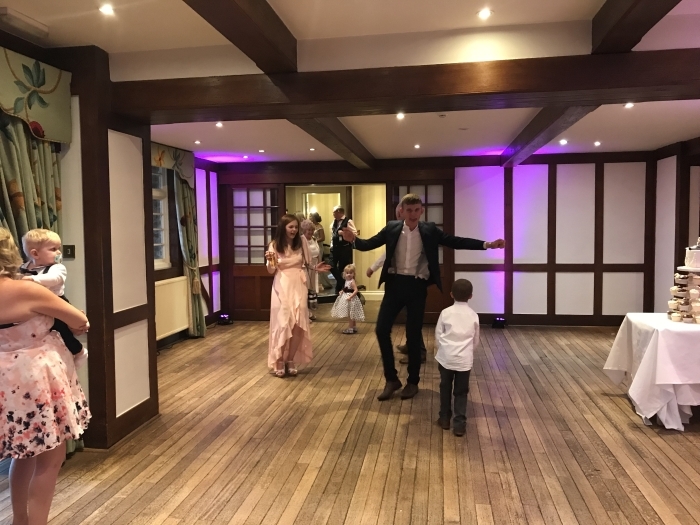 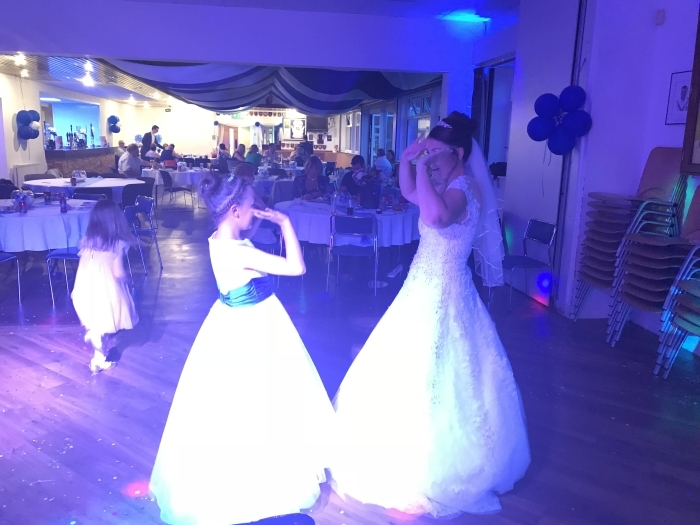 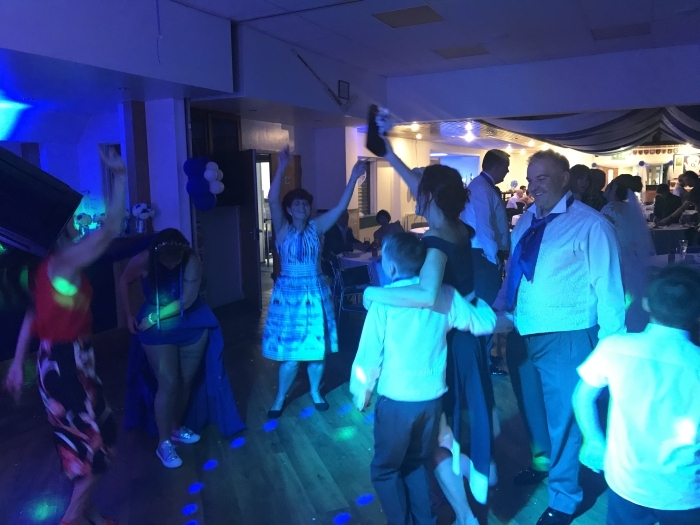 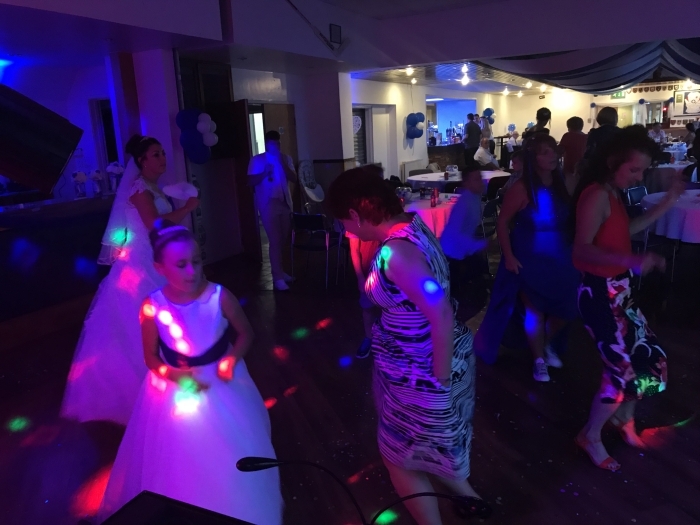 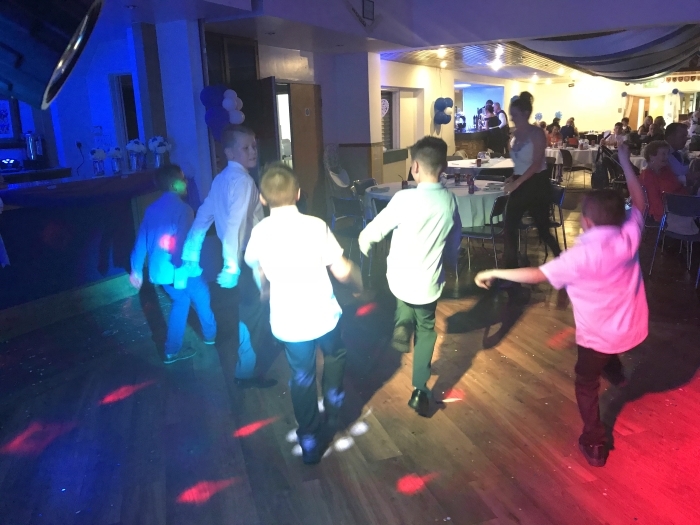 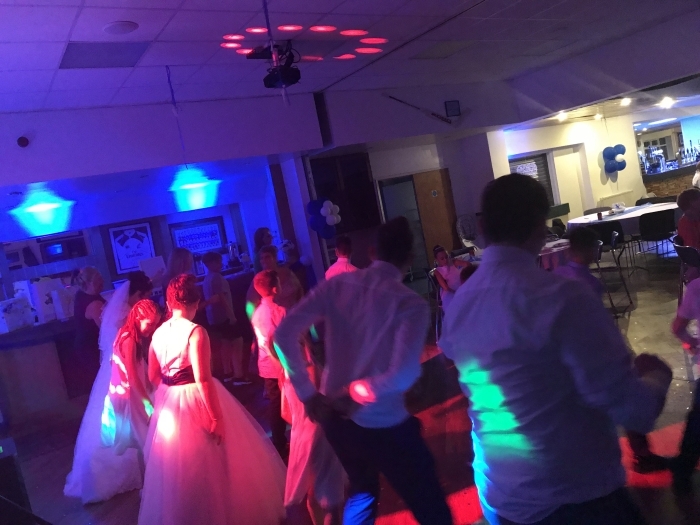 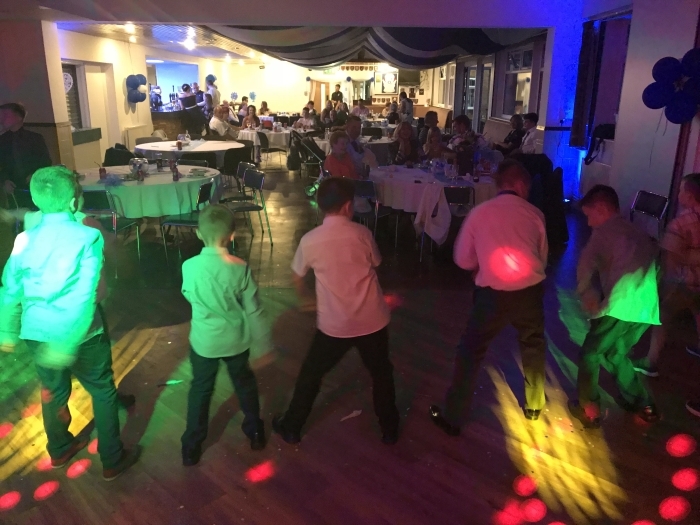 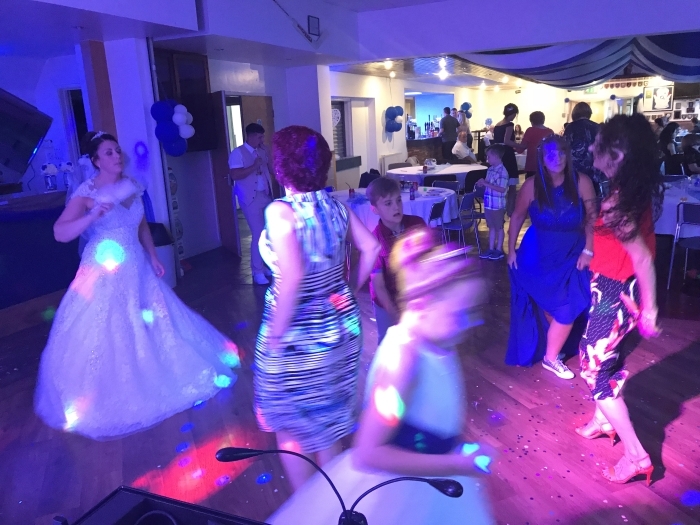 The evenings entertainment started with the First Dance at around 8pm, followed by a Children’s Disco to start with and then on to the main evening disco. 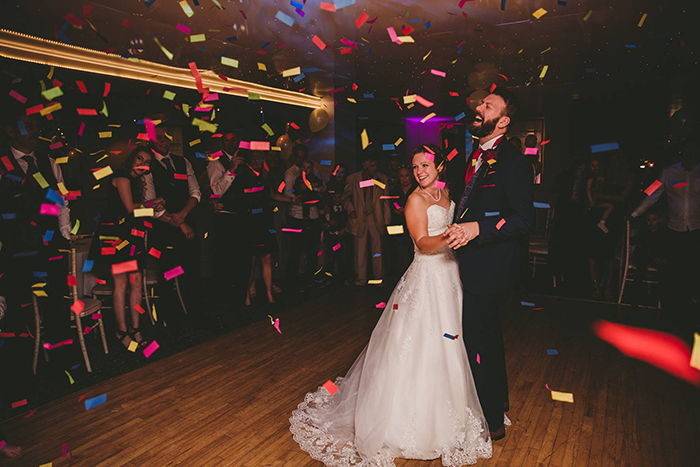 The First Dance incorporated my confetti cannon these Photos were taken by Phil Harris Wedding Photography captured the First dance and the confetti cannon perfectly. 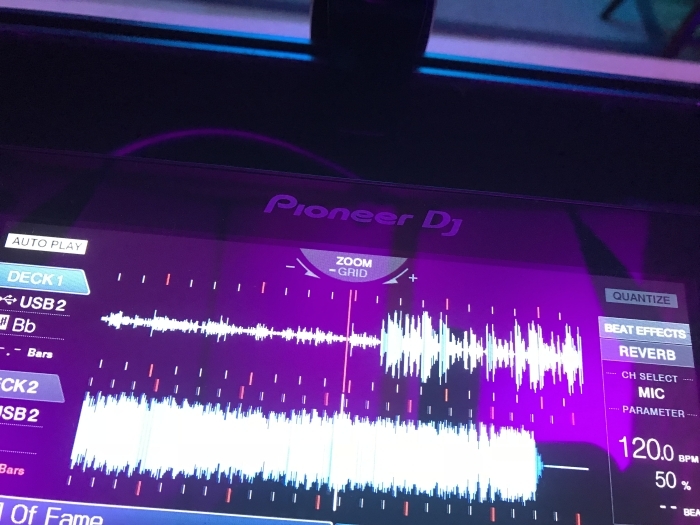 I also took a couple of videos from the DJ Booth whilst I was DJing! 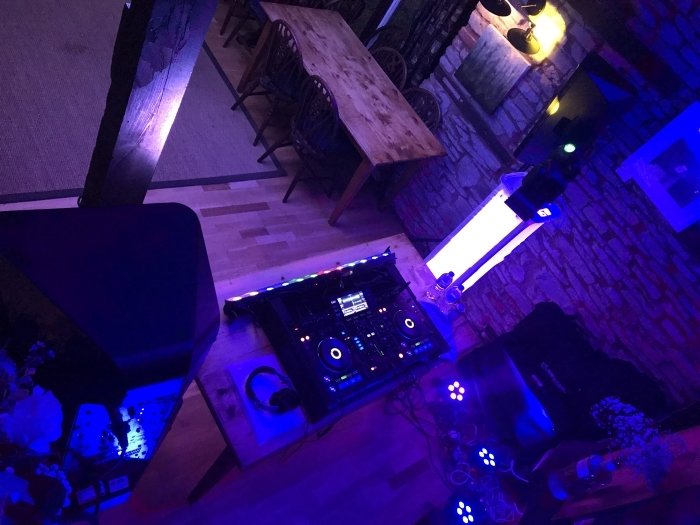 Photographs below were taken by myself of the dancefloor during the evening from the DJ Booth. 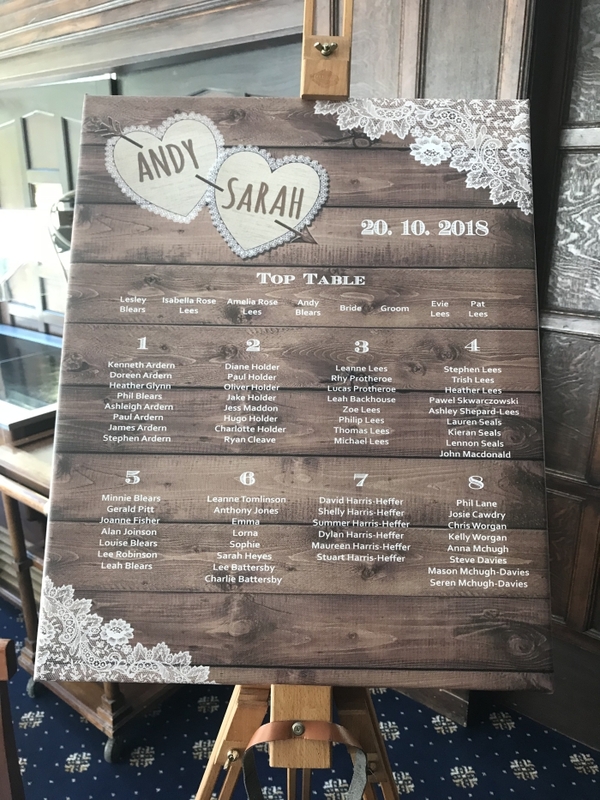 Sarah & Andy choose my full wedding setup to maximise visually the look. 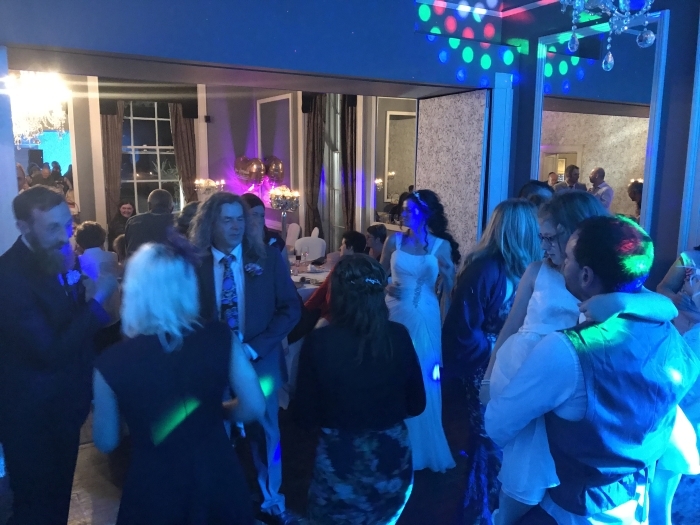 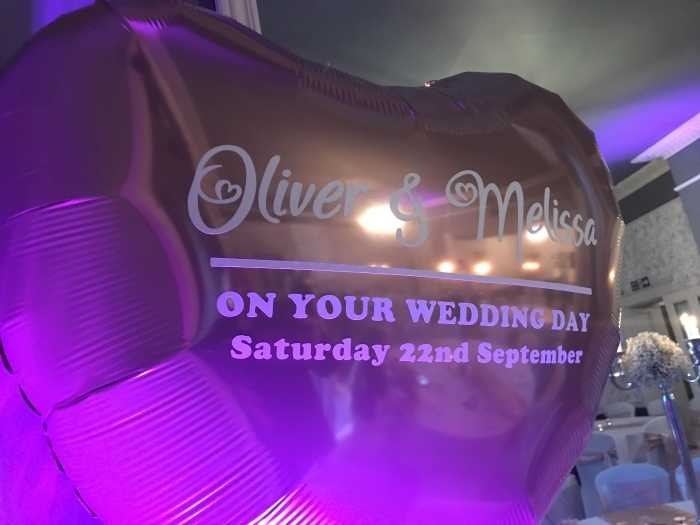 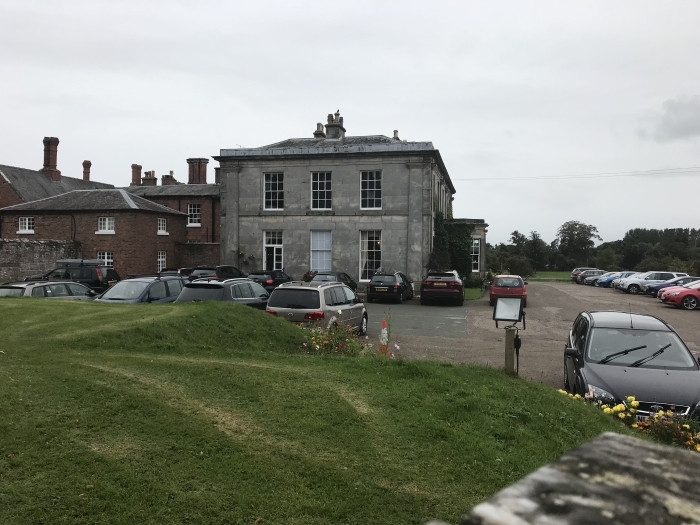 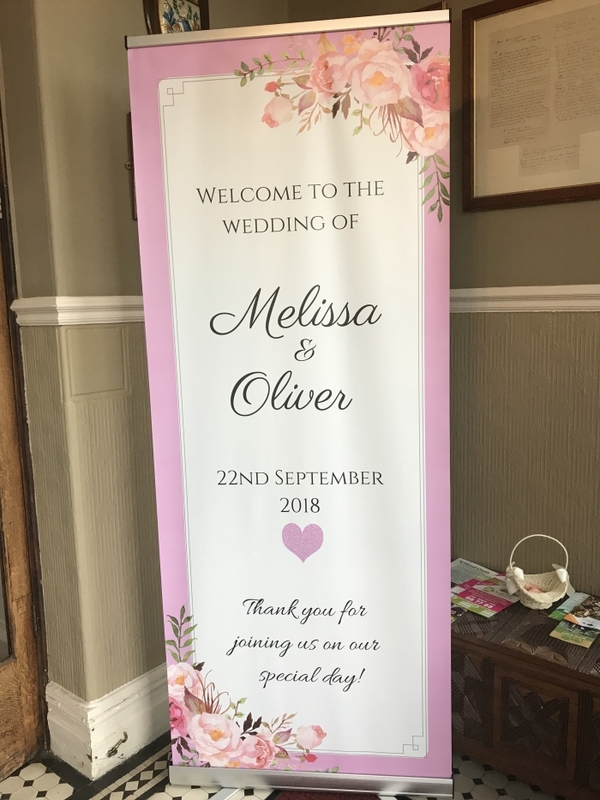 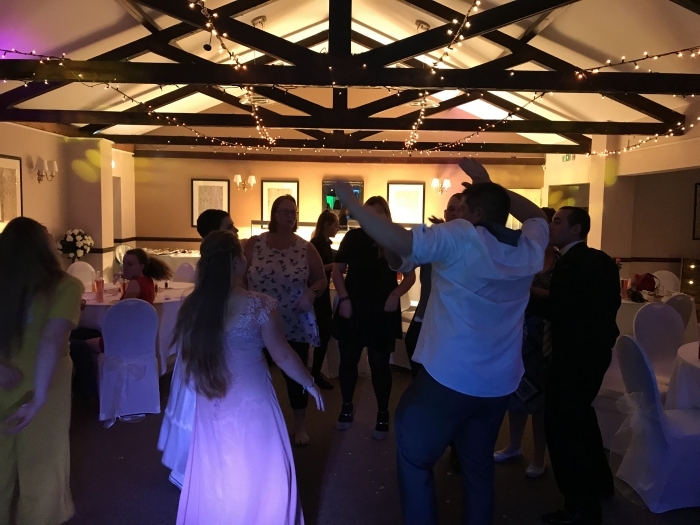 Saturday 22nd September 2018 was the Wedding of Oliver and Mellissa at the lovely Sweeney Hall Hotel Morda Nr Oswestry Shropshire and I was asked to provide my Wedding DJ services for the evening. 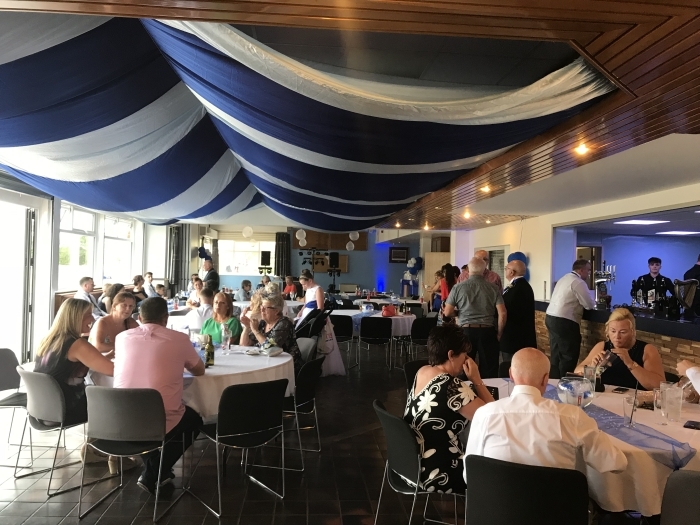 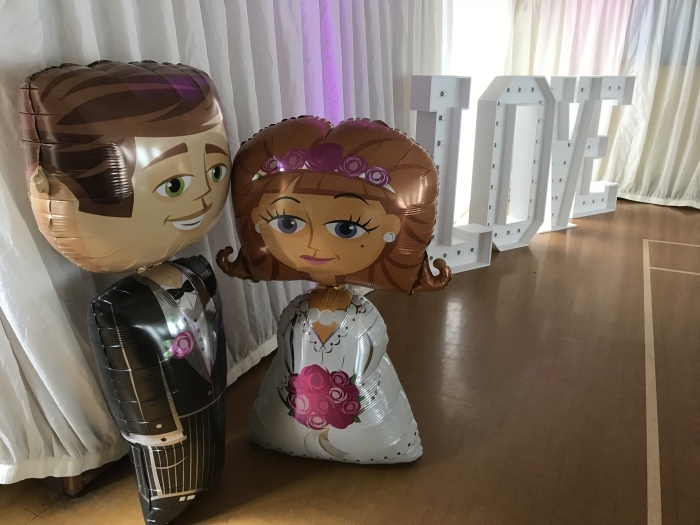 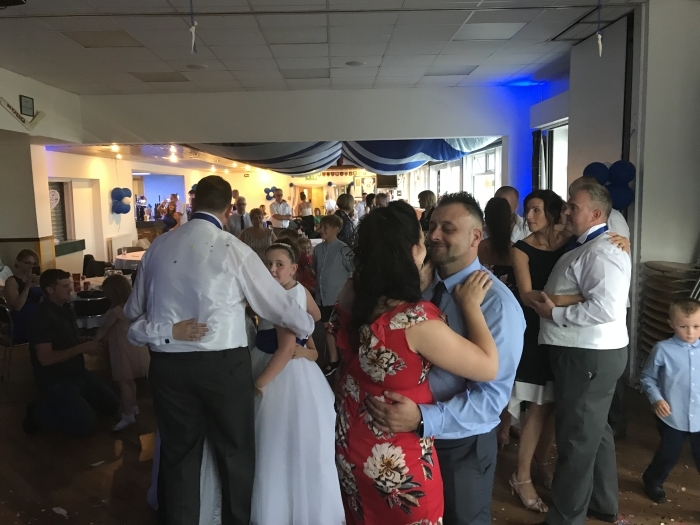 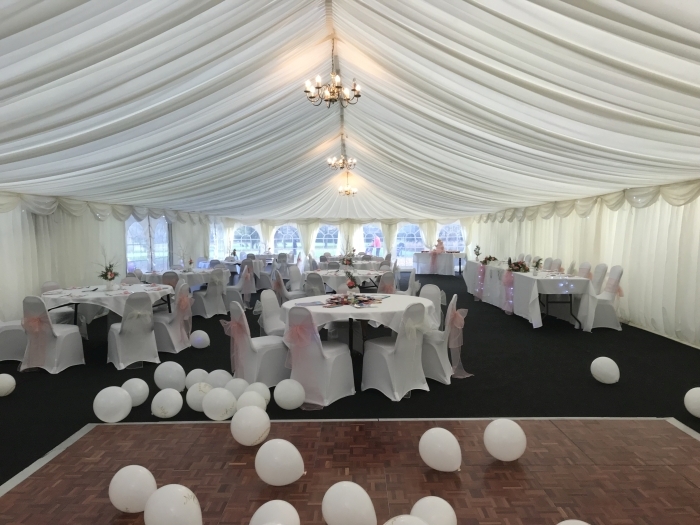 Arriving at 5pm for a scheduled start time of 7pm for upbeat background music leading to the first dance at 8:30pm followed by the main disco through to midnight. 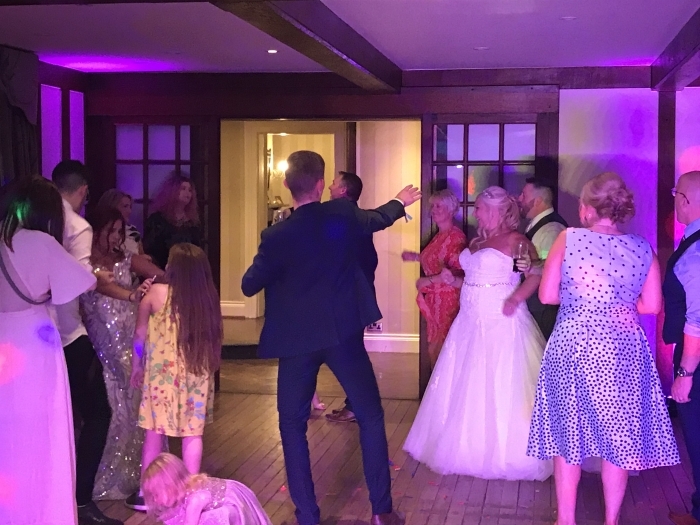 Straight from the off the dance floor was full and the atmosphere was electric with only a small break in the dancing for the buffet at just past 9pm. 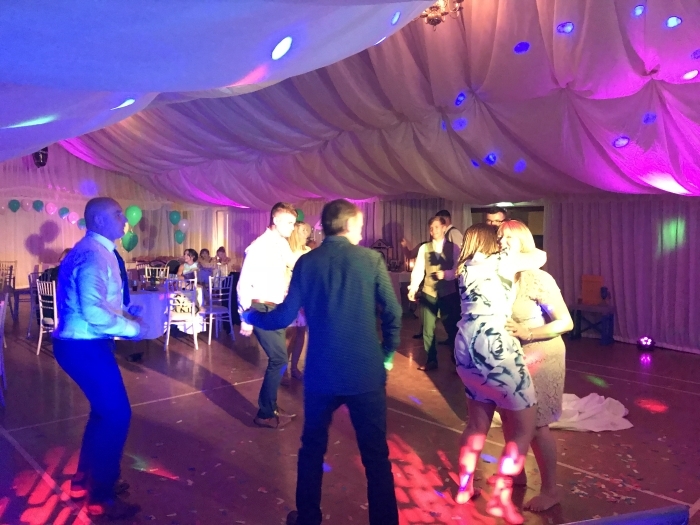 But as you can see from the pictures and videos once the food was finished it was straight back on the dancefloor. 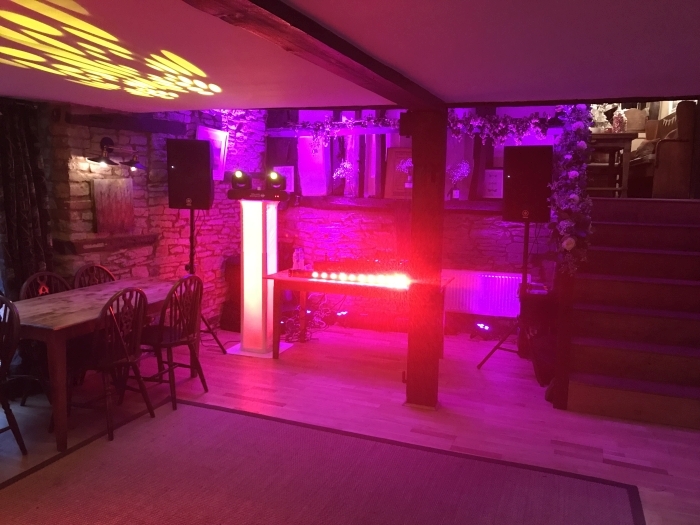 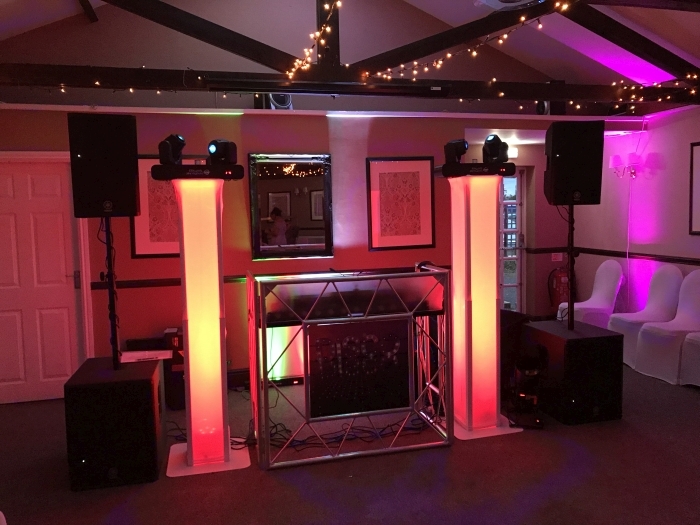 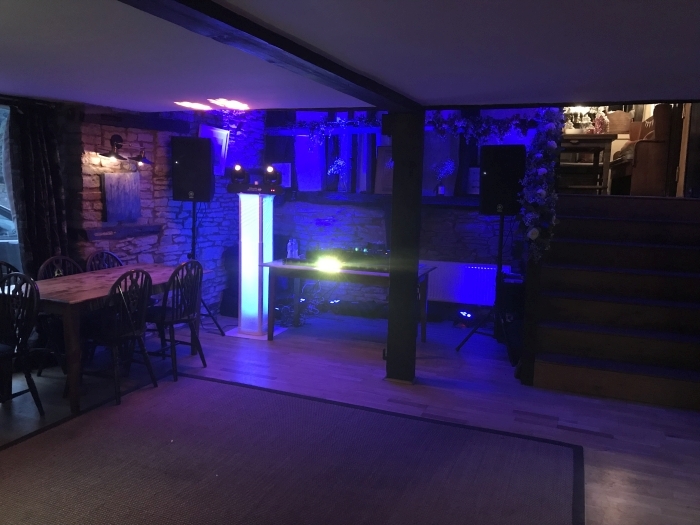 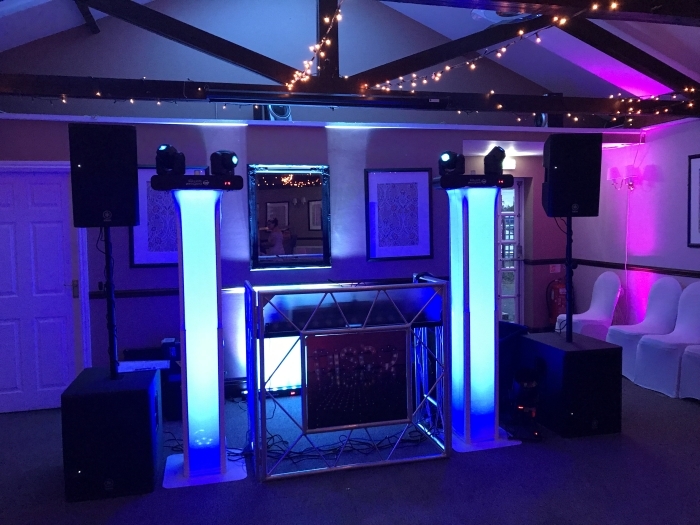 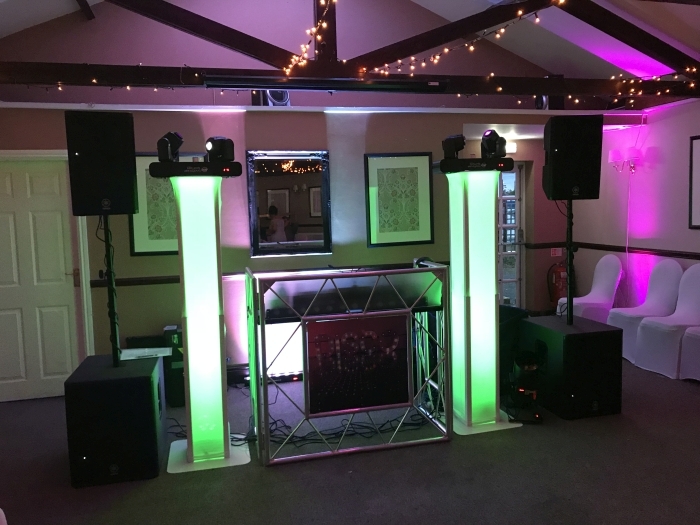 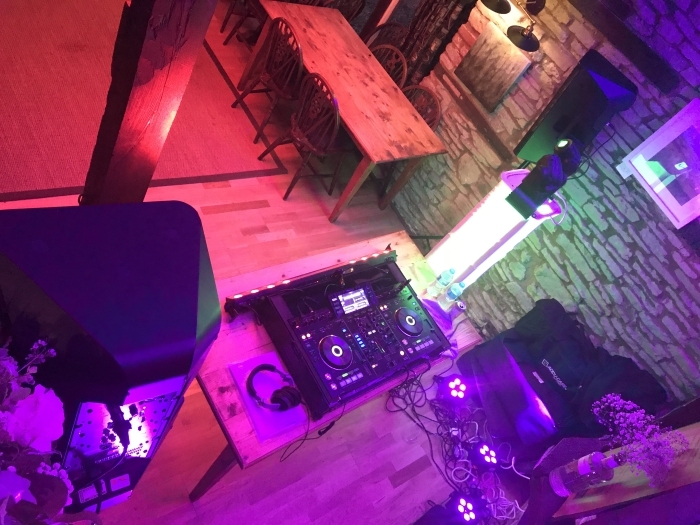 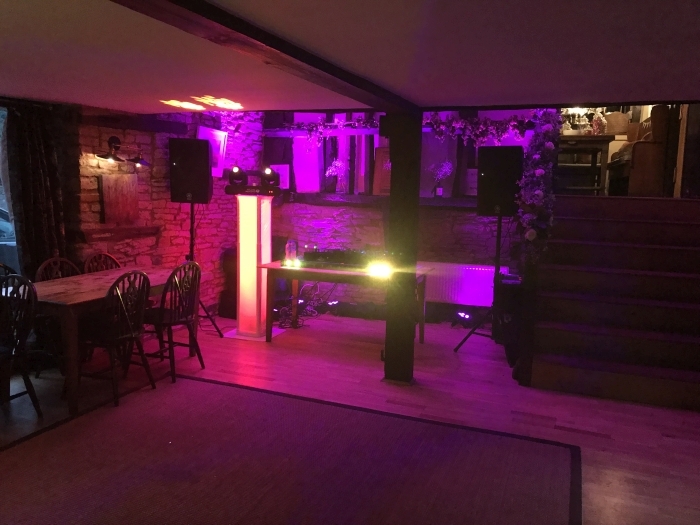 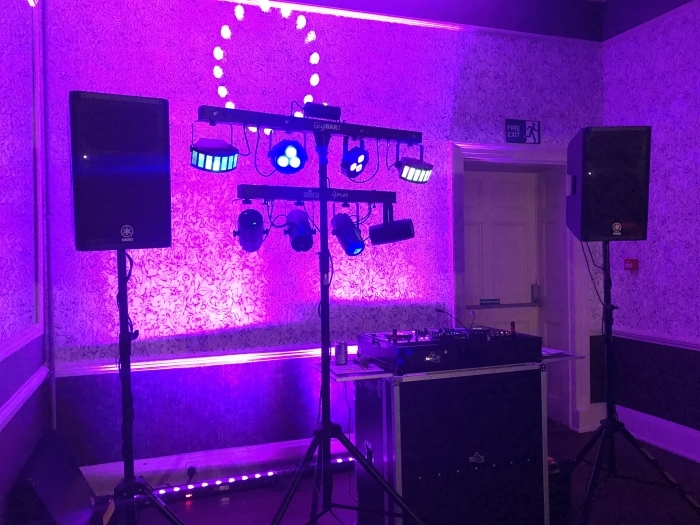 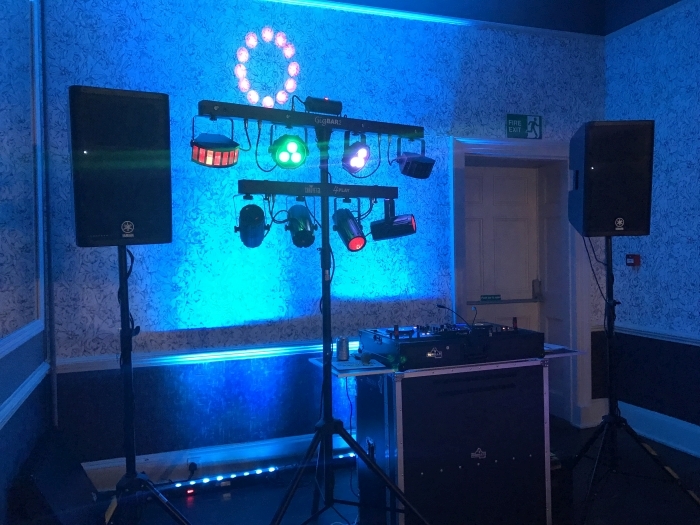 Due to the size of the space available for my setup it was decided that I would use my compact setup, this however did not distract from anything as I installed plenty of lights to fill the dancefloor area perfectly. 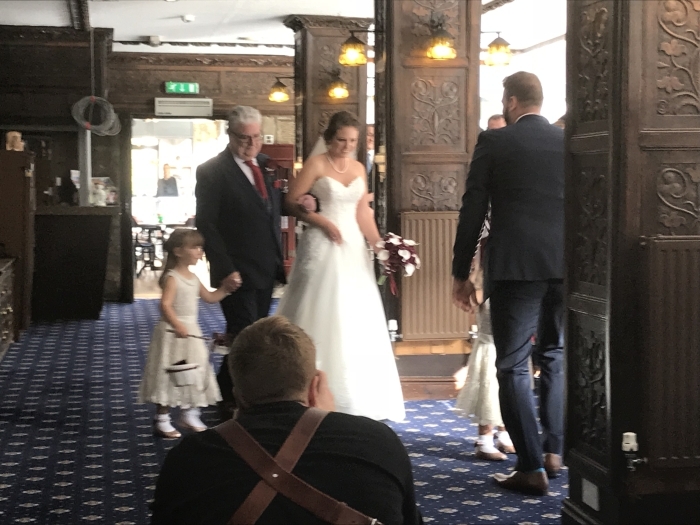 Due to time restrictions I was unable to produce a full walk through video for this wedding, I did however manage to film a quick overview in advance. 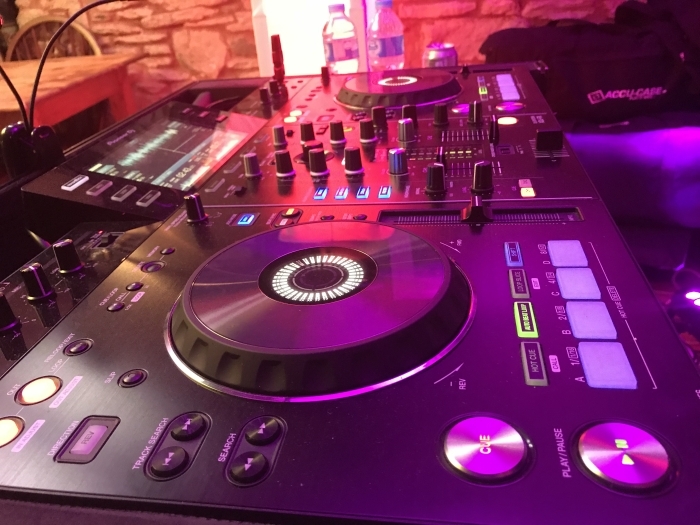 Here is a selection of videos I took from the DJ Booth, enjoy. 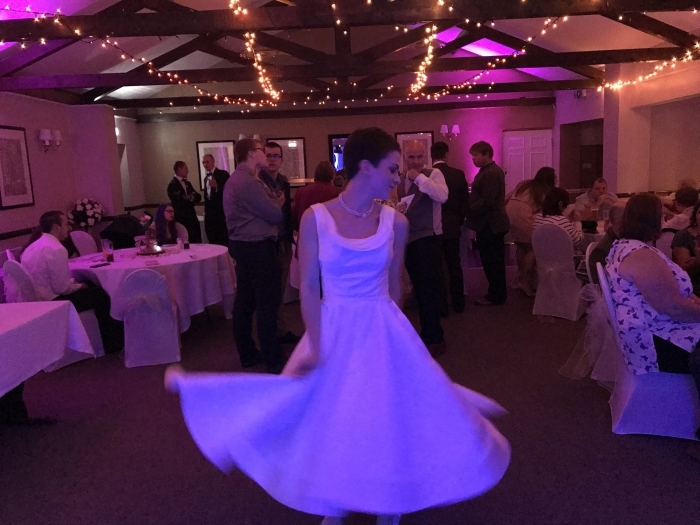 During our consultation meeting I mentioned how nice it is to have a finishing last dance to end the night off. 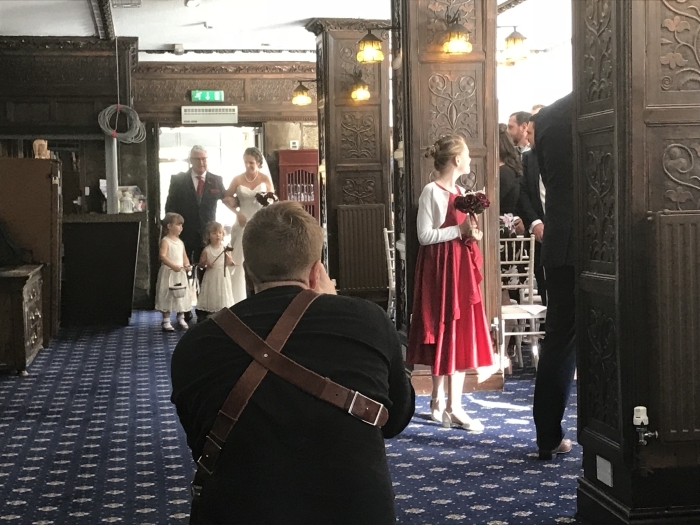 These are a selection of pictures I took at this wedding prior to starting. 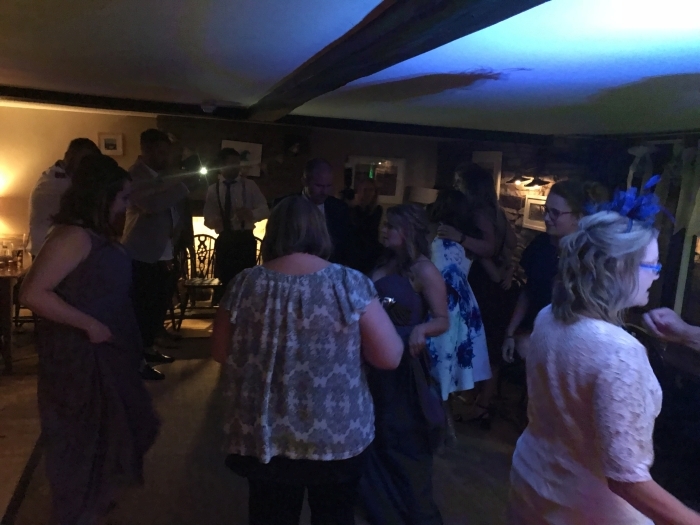 A great wedding to DJ at where the Bride and Groom were on the dance floor throughout the night! 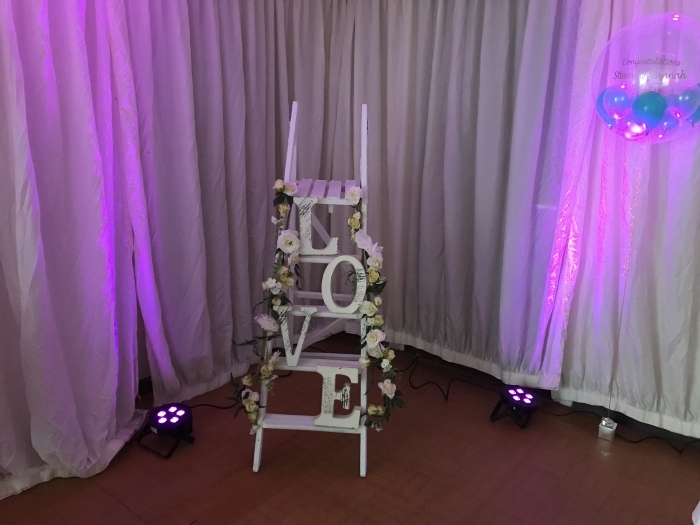 The above items are classed as my compact setup, I use this configuration when space is limited, or the function is not on the ground floor and no lift is available. 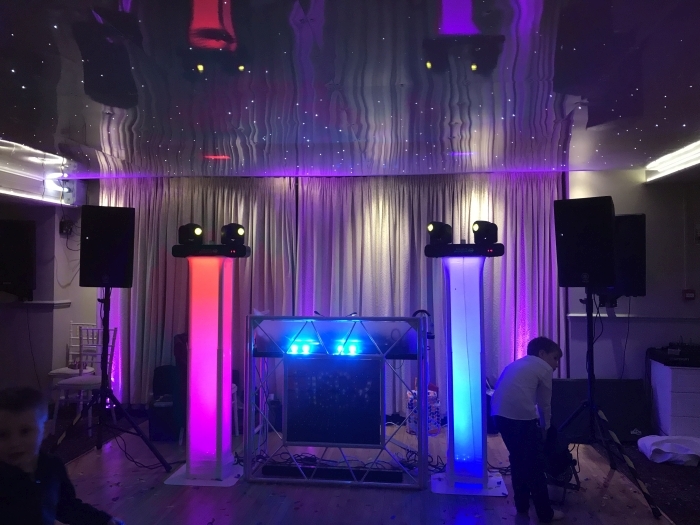 Below are some pictures of this week’s Wedding DJ setup. 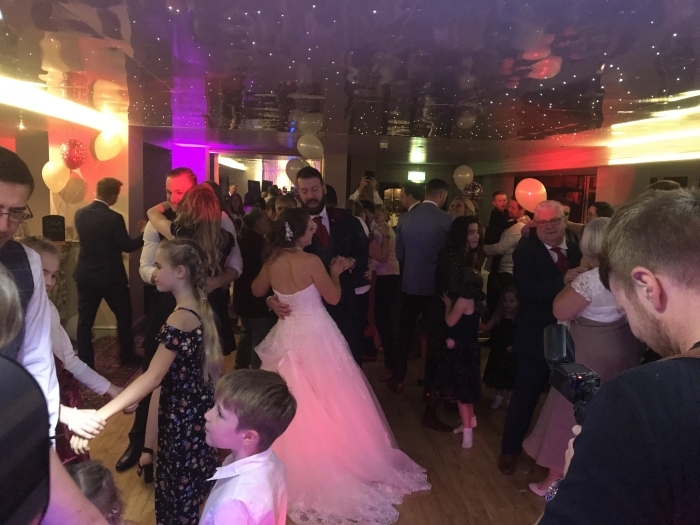 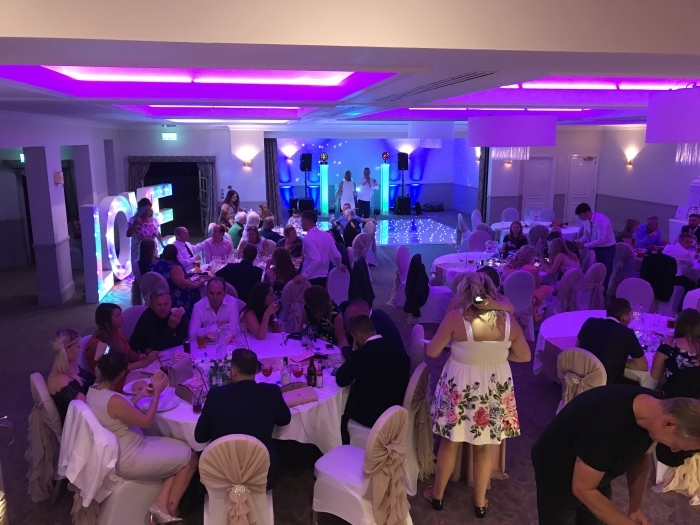 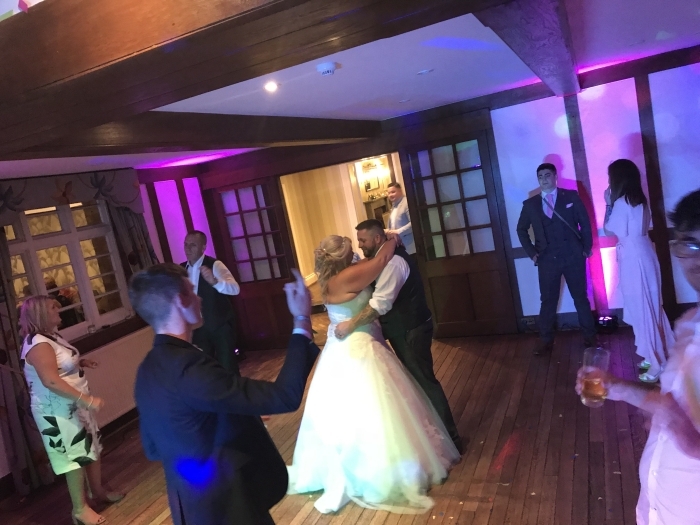 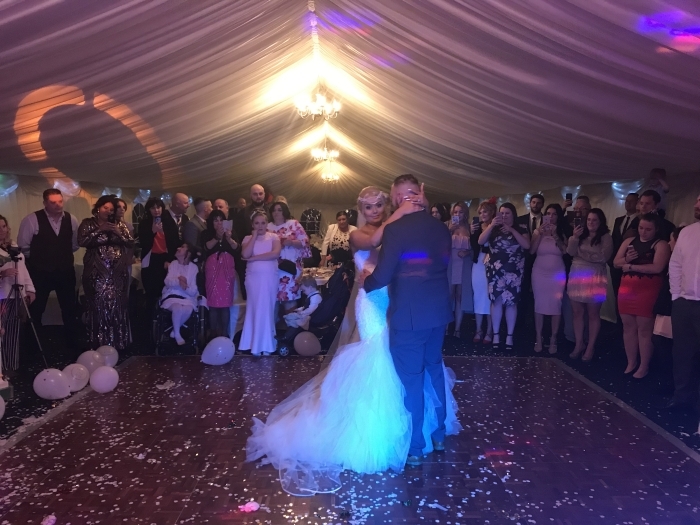 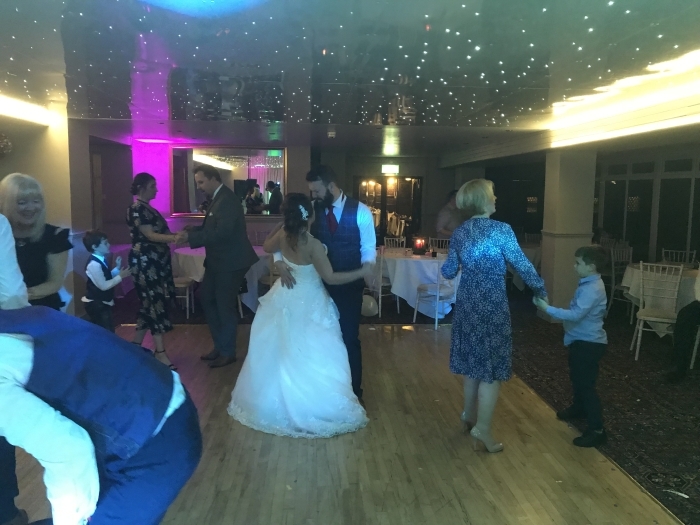 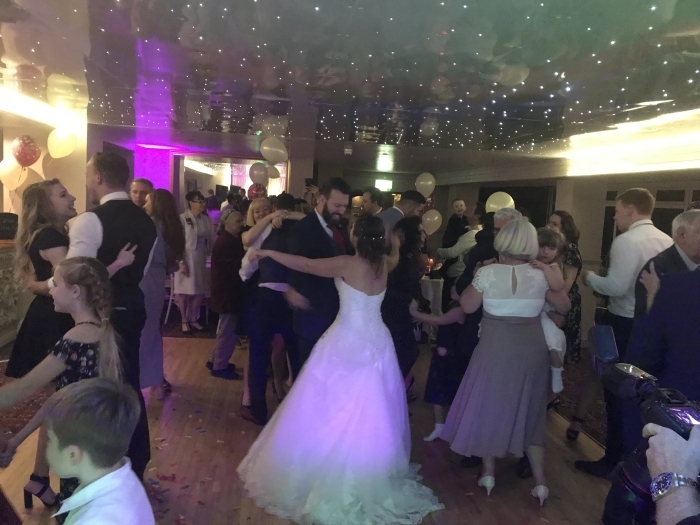 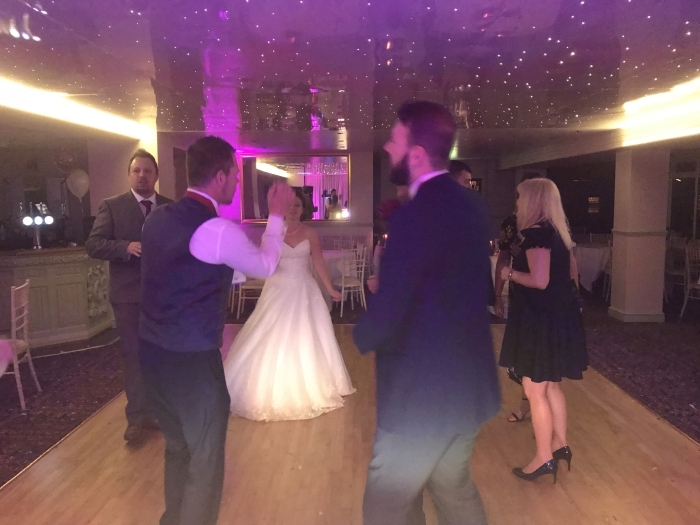 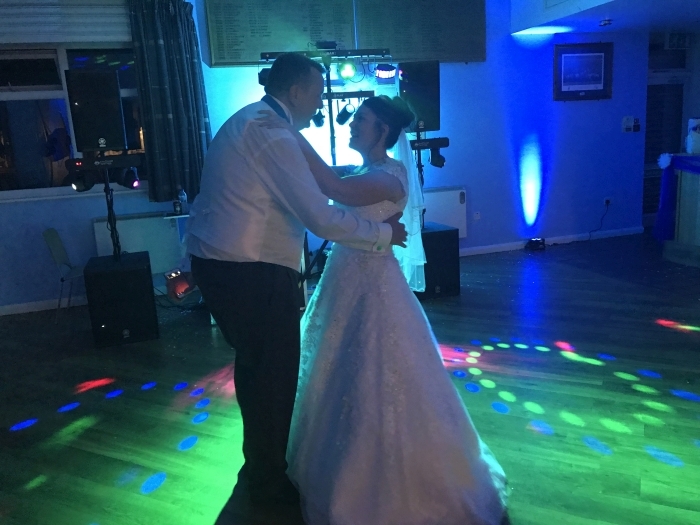 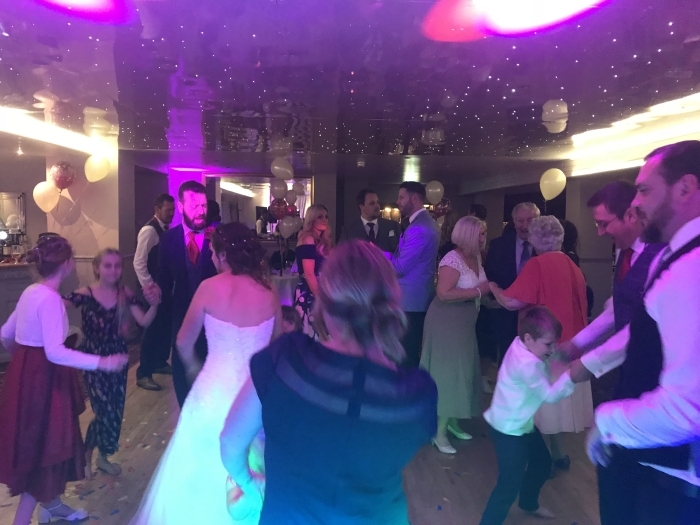 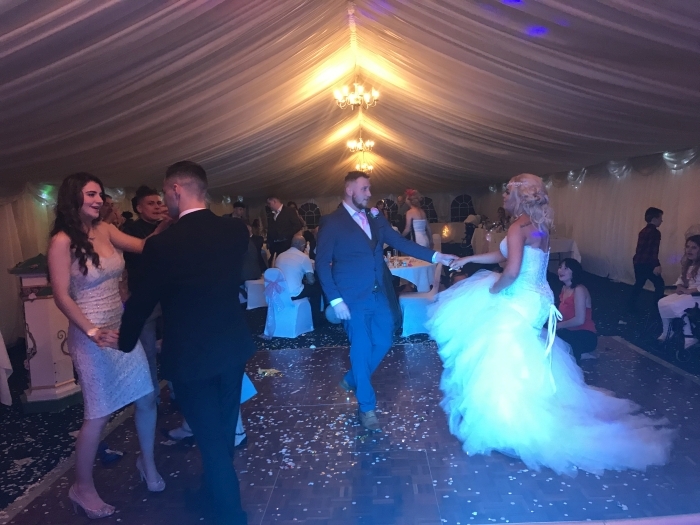 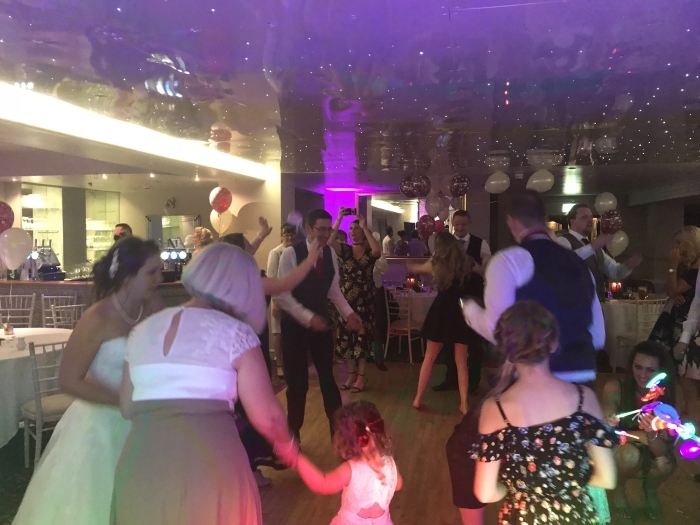 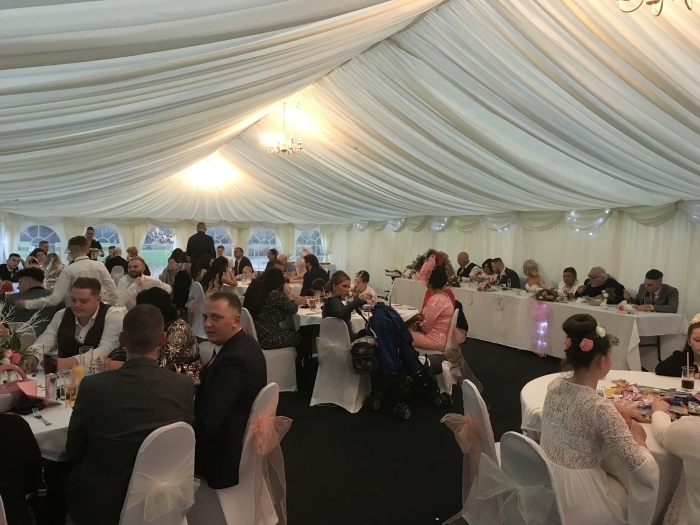 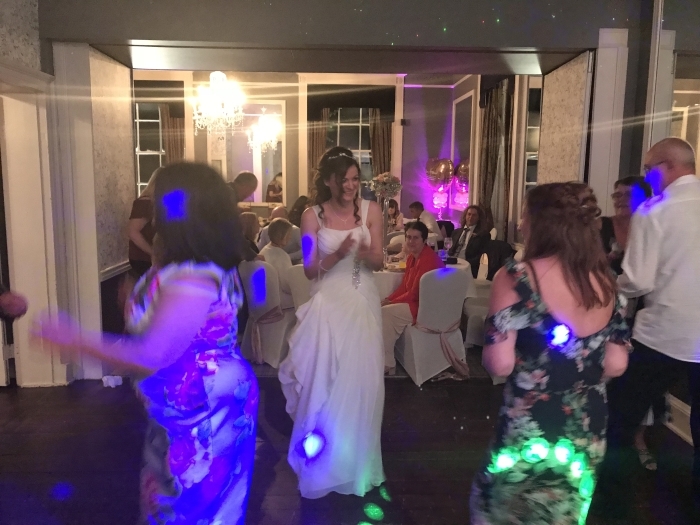 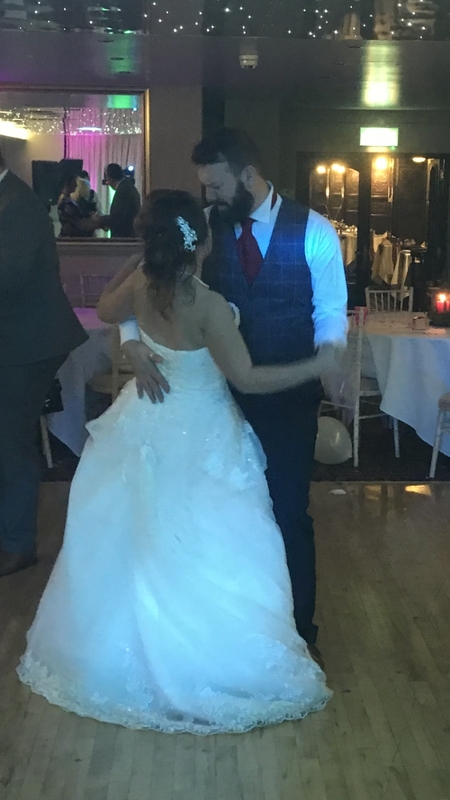 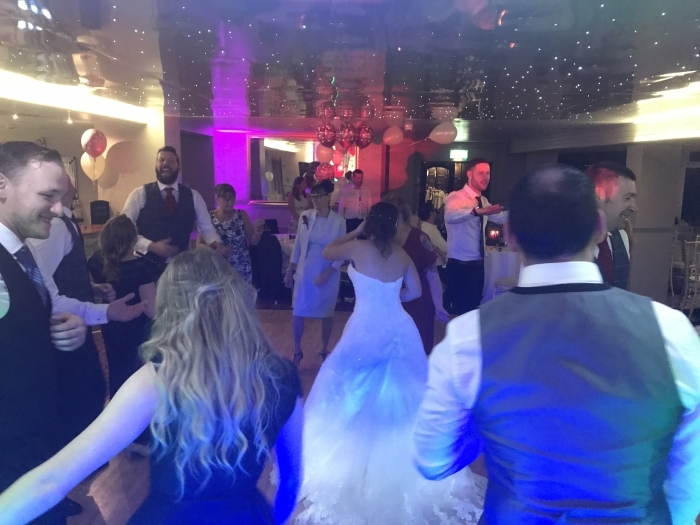 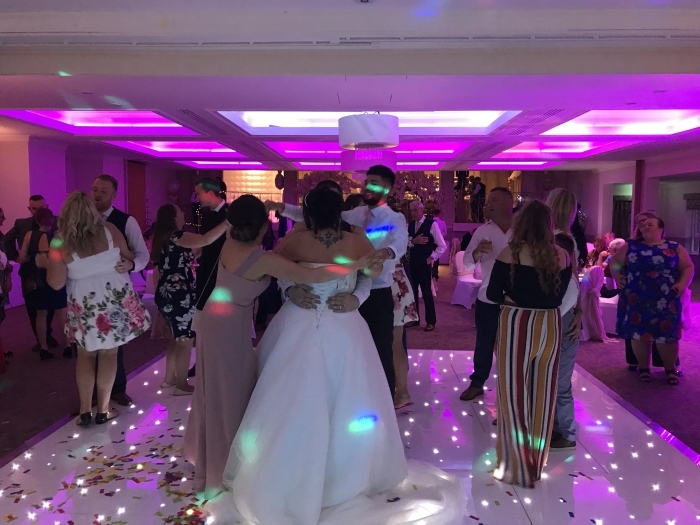 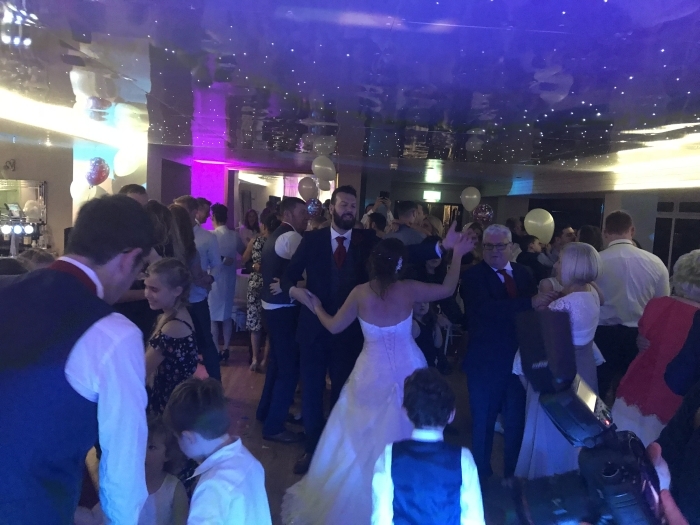 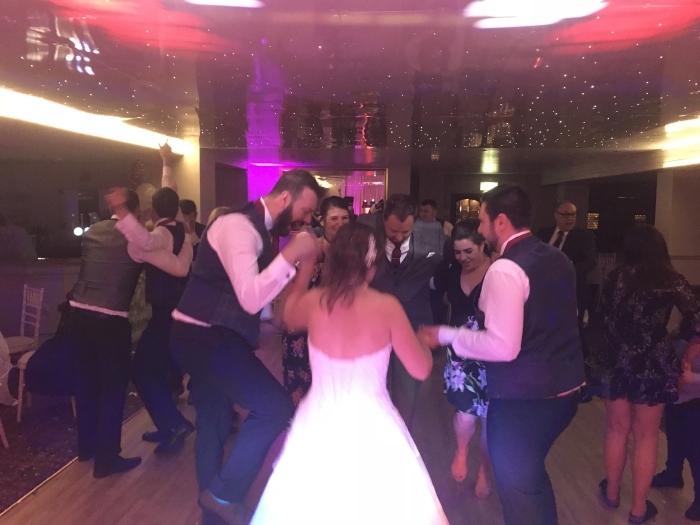 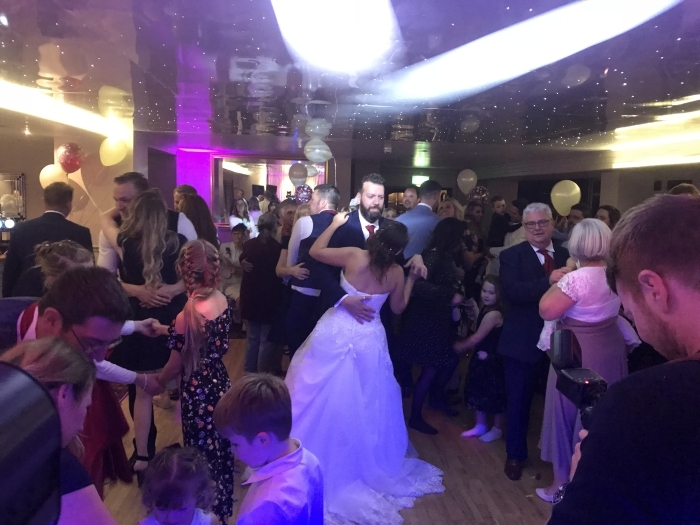 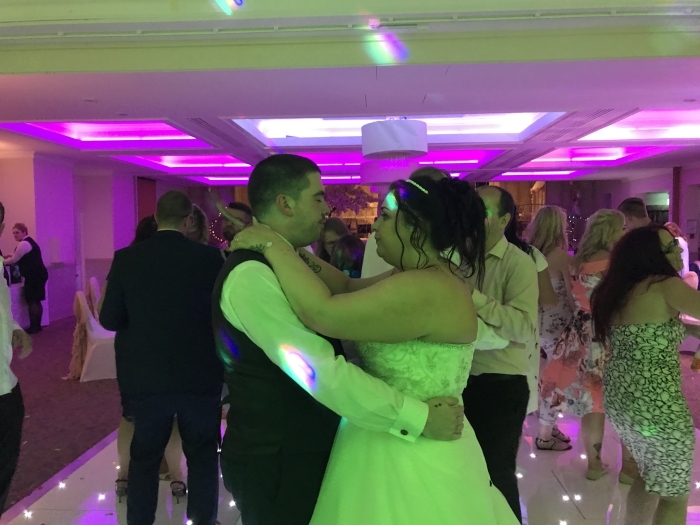 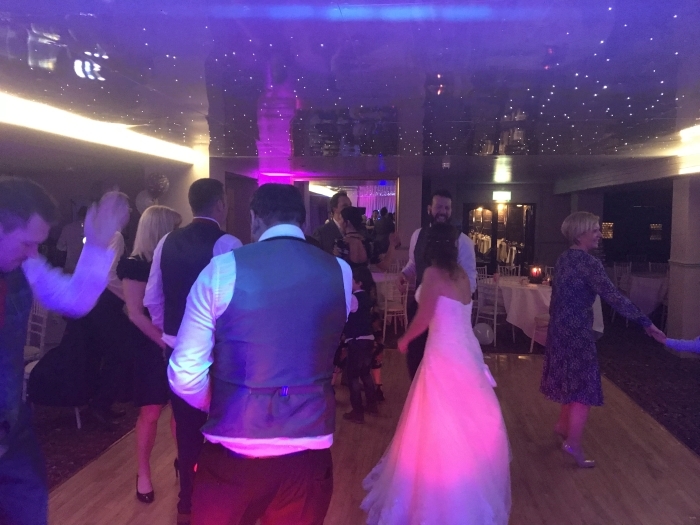 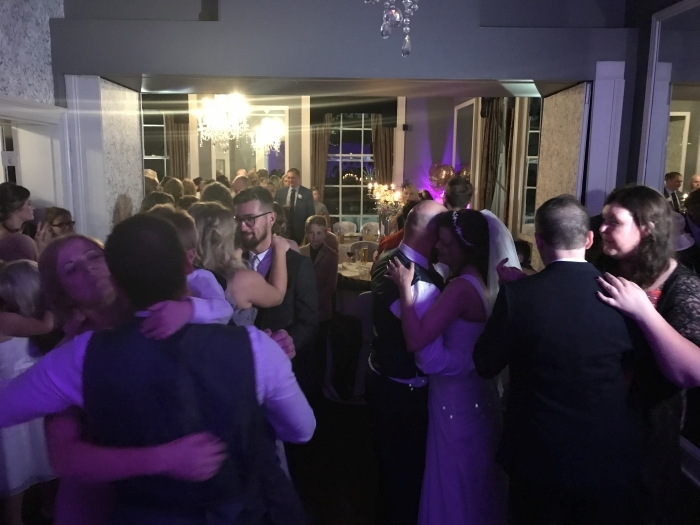 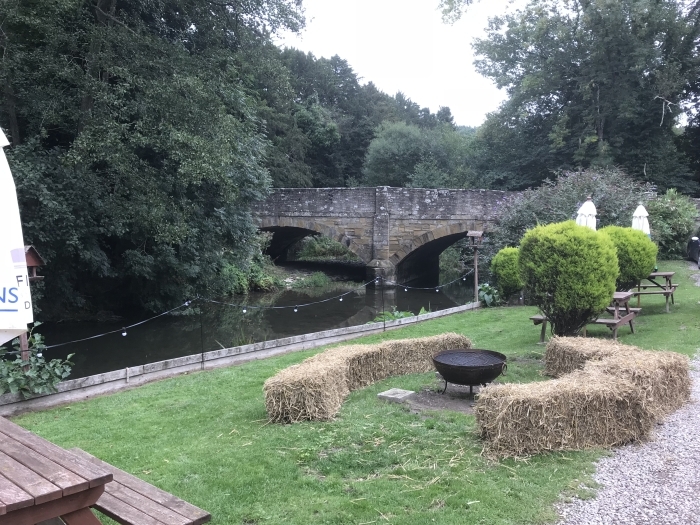 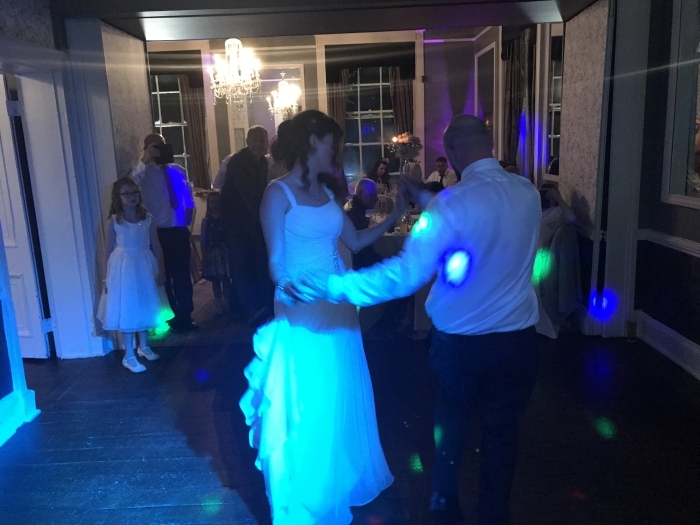 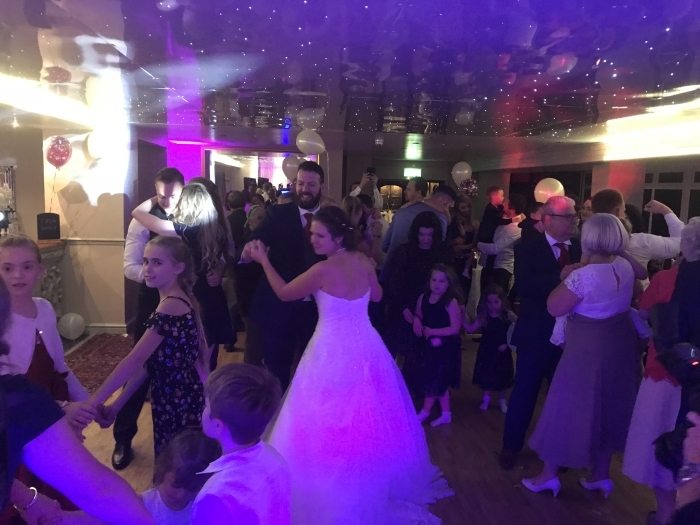 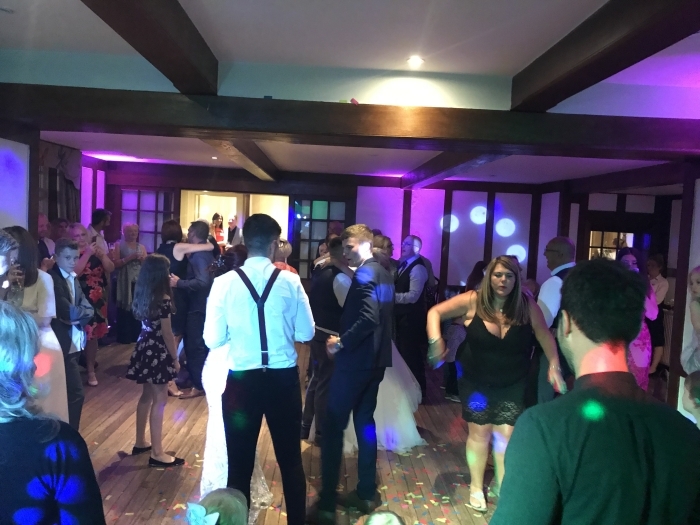 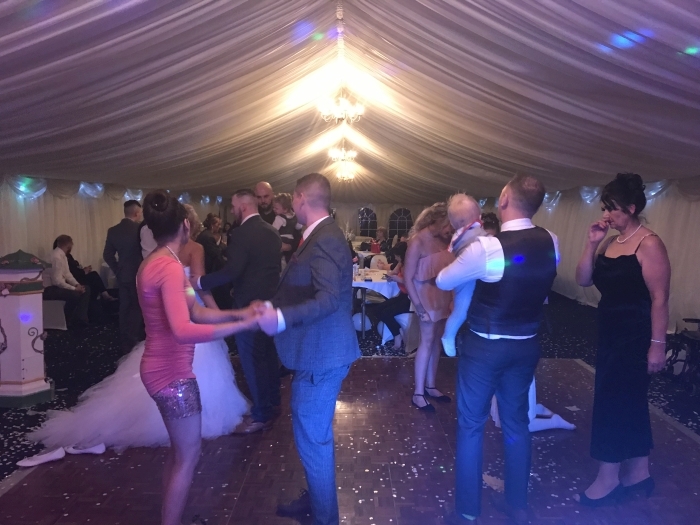 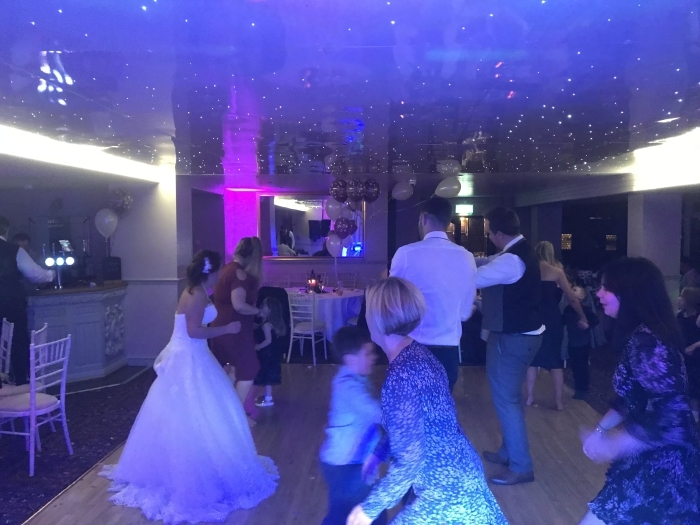 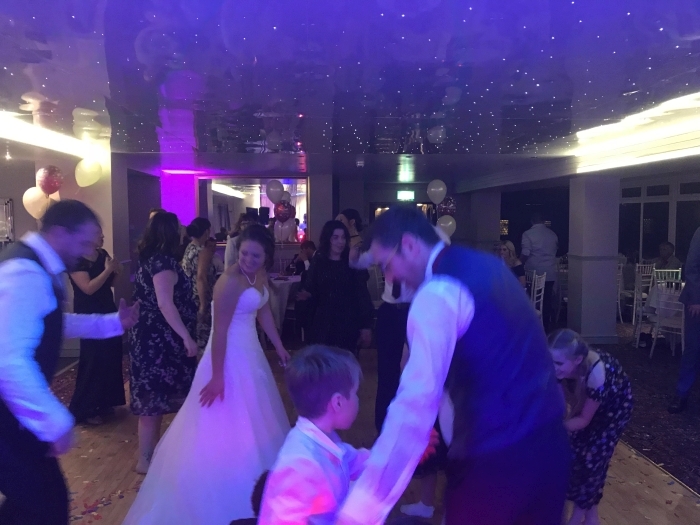 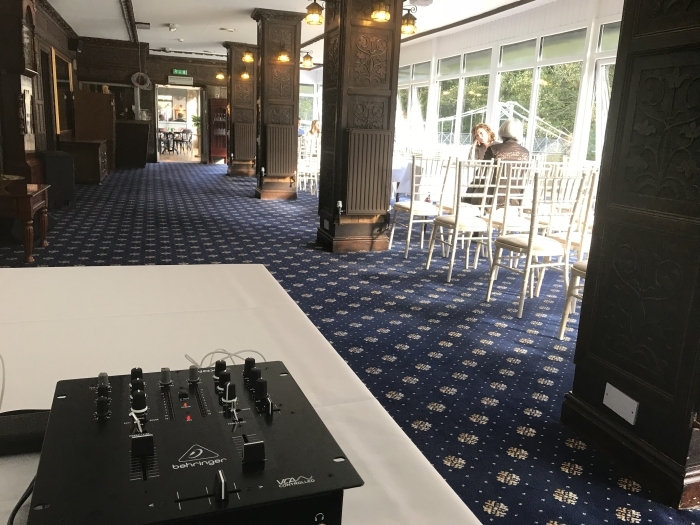 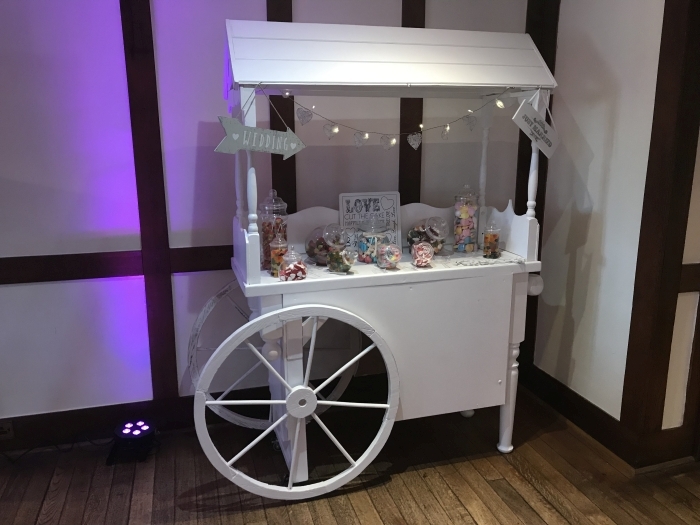 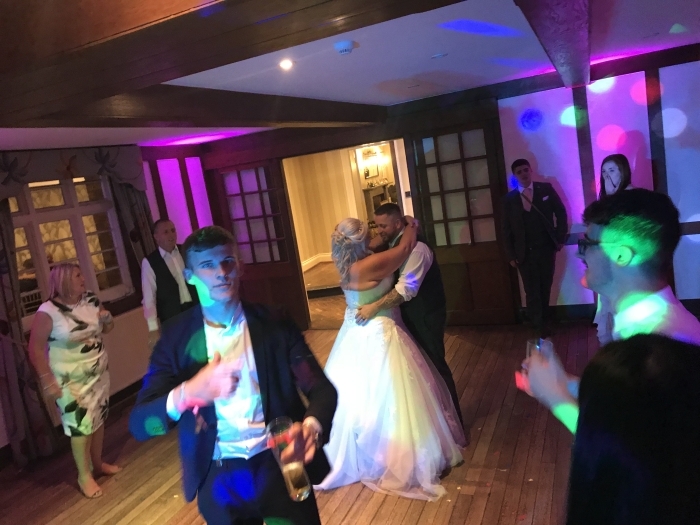 Saturday 8th September 2018 was the Wedding of Hollie and Chris Thorpe at the lovely Riverside at Aymestrey and I was asked to provide my Wedding DJ services for the evening. 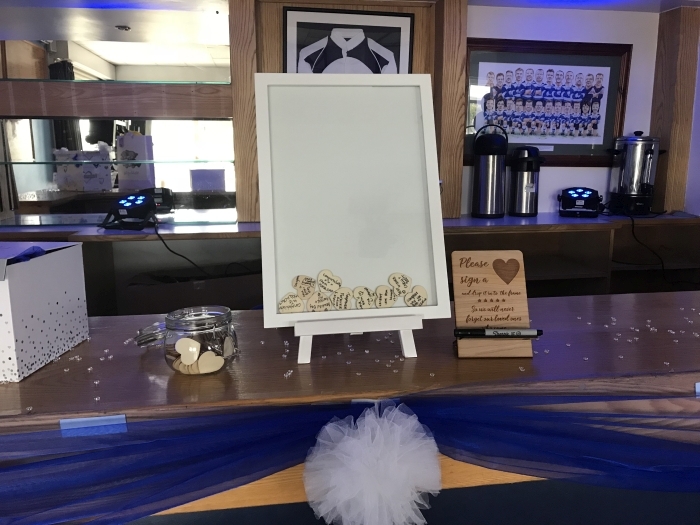 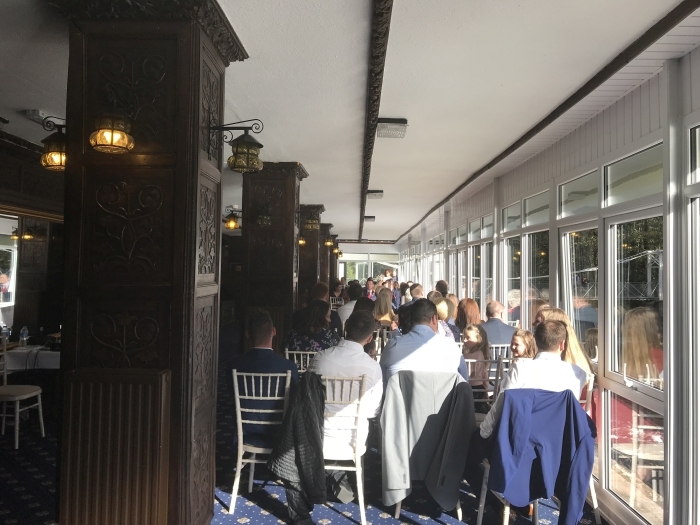 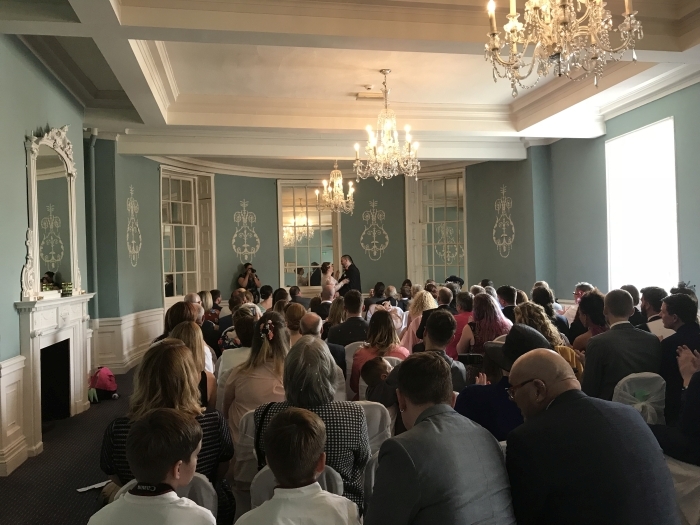 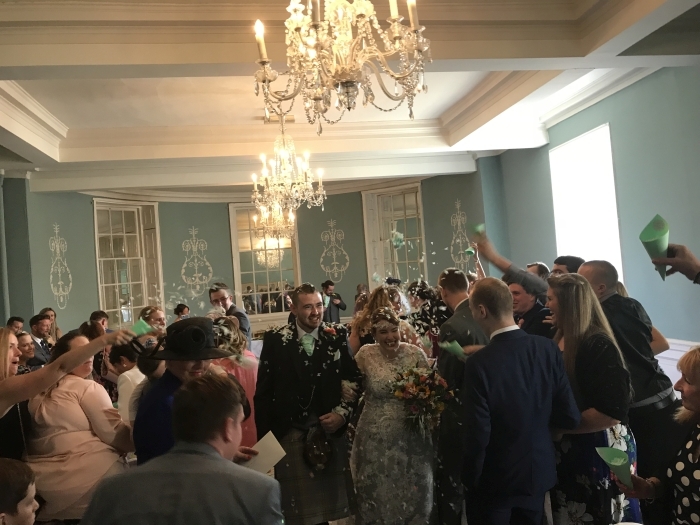 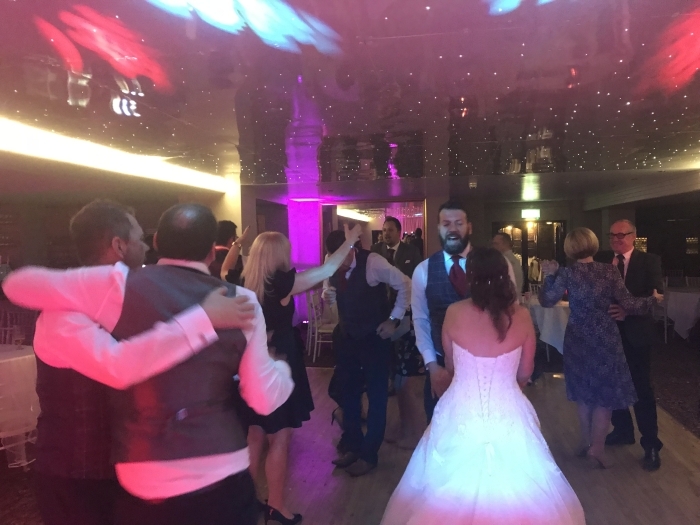 It was the first time I have been to The Riverside Aymestrey as a Wedding DJ and I’m really surprised by that fact as its such a fabulous venue in a great location and I get to go to the all best wedding venues! 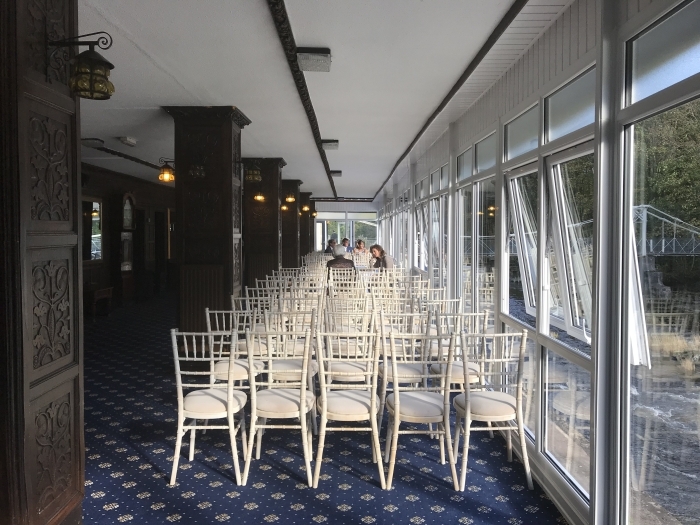 I arrived at The Riverside just after 5pm, as always with weddings the schedule had slipped slightly so it was around 6:30pm before I could setup fully. 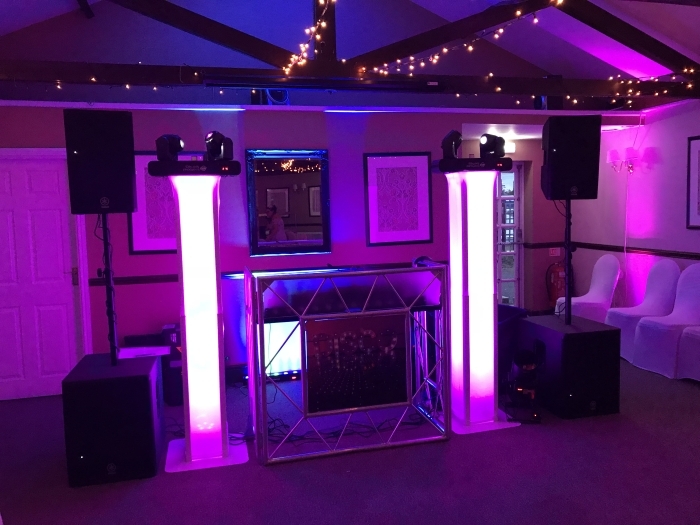 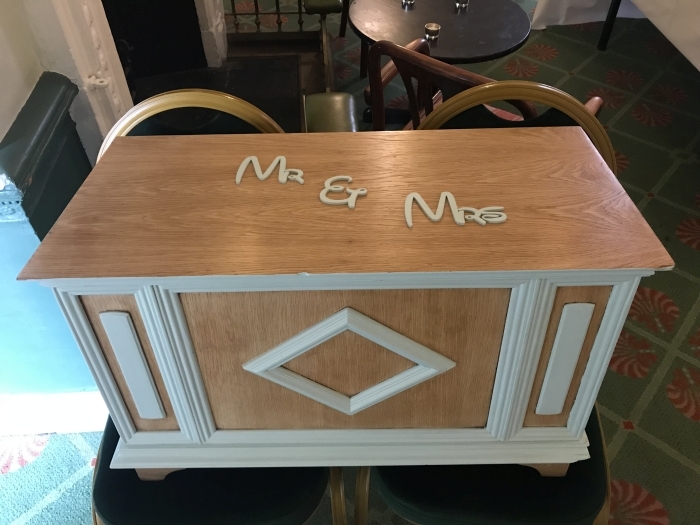 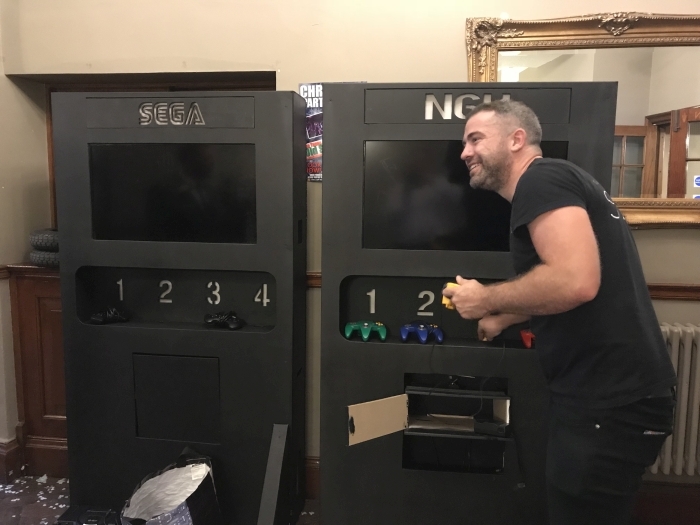 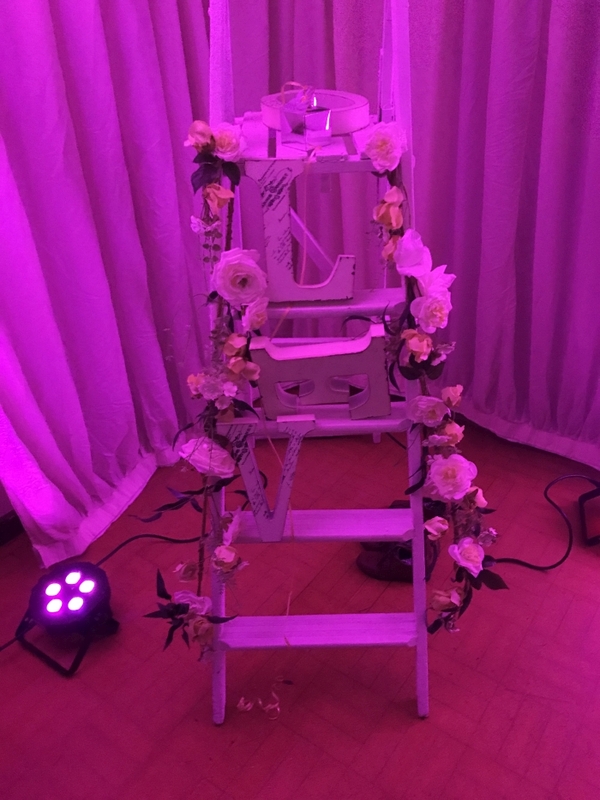 Due to the fabulously qwerky nature of the old building I was unable to use my Wedding DJ Booth and in fact I had to modify the setup slightly to ensure everything looked amazing by scrapping my original setup plans and tailoring them to the room. 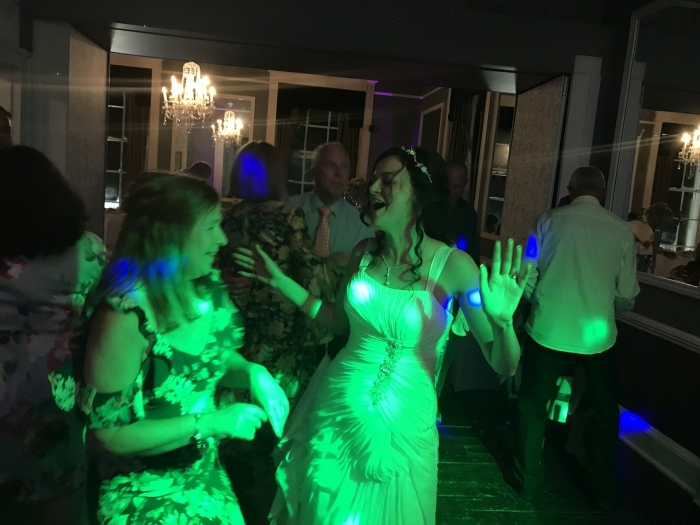 A week or so before I had been provided with a list of music that the bride and groom and some of their guests would like, this playlist formed the basis for the evenings music. 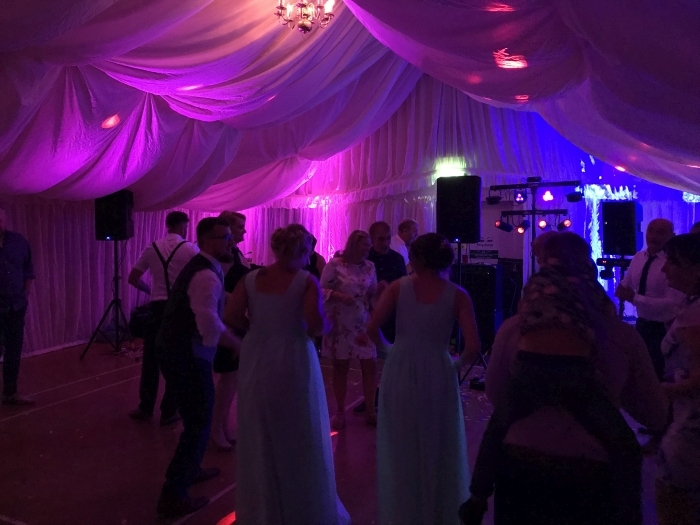 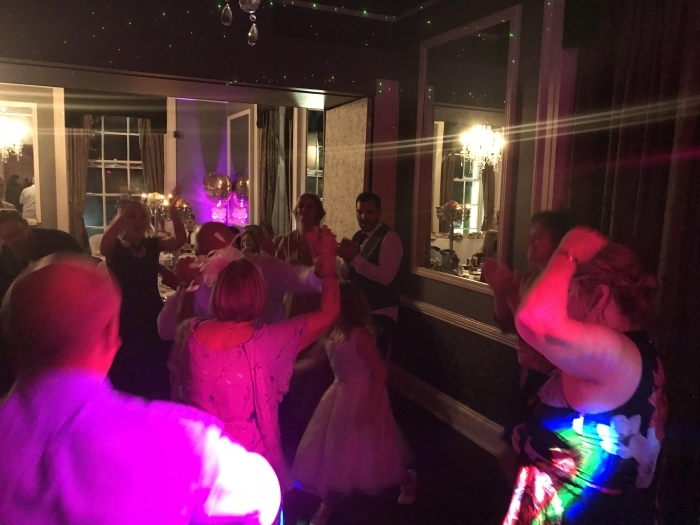 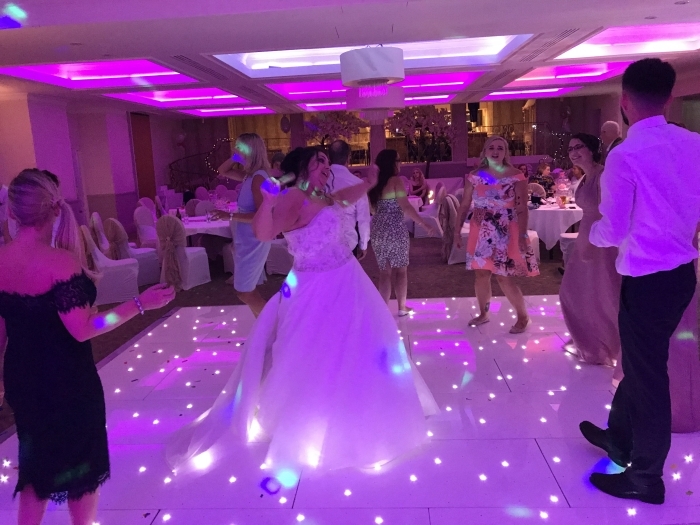 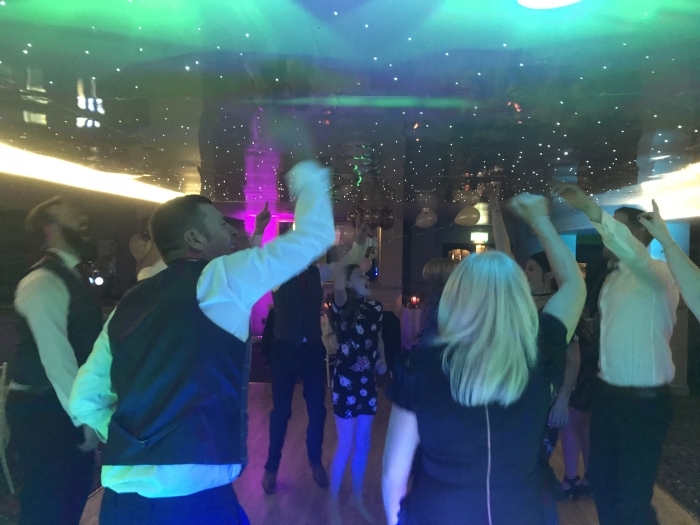 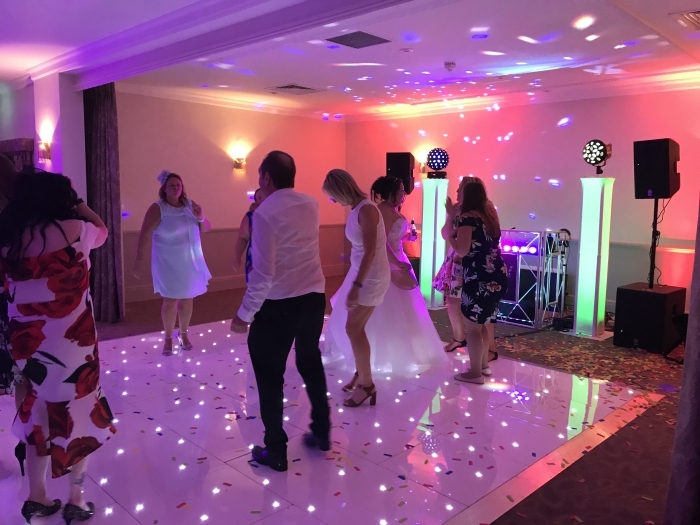 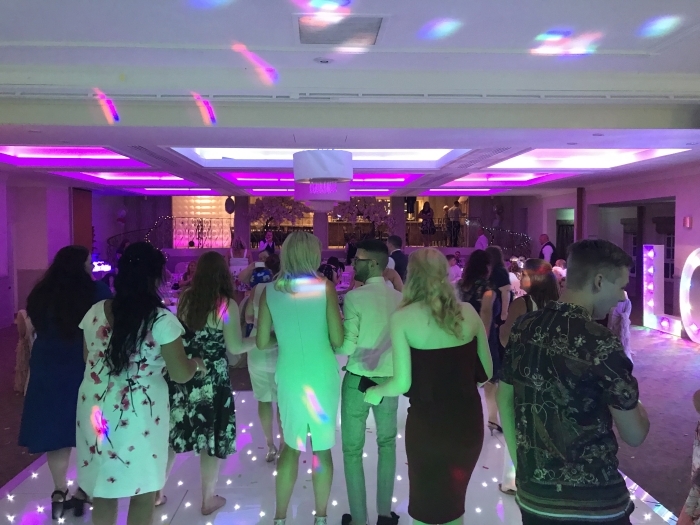 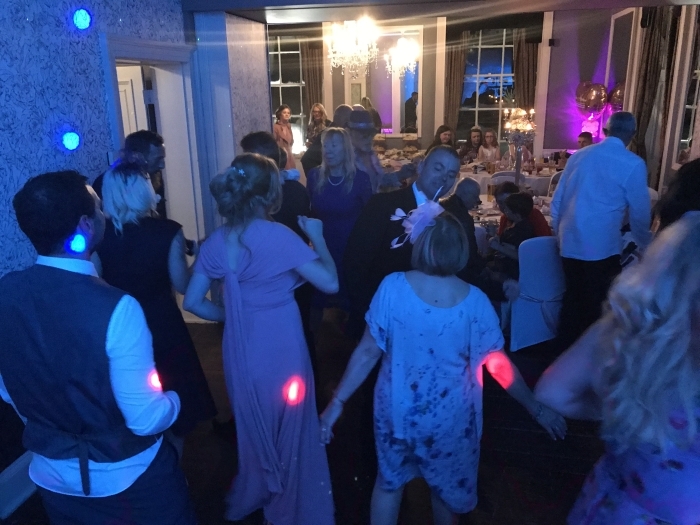 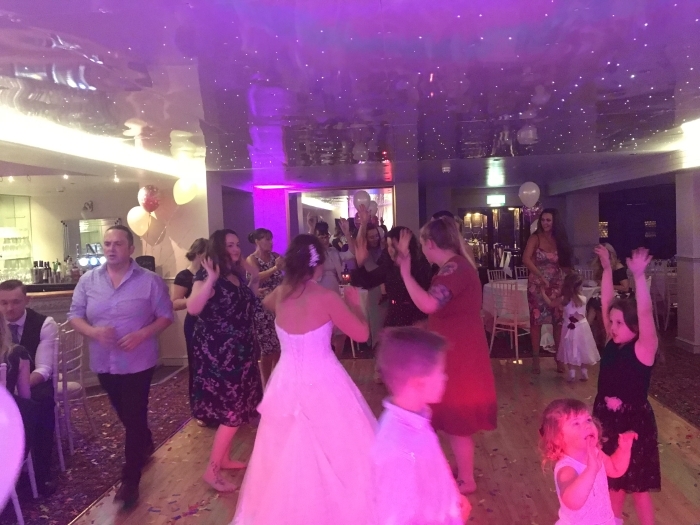 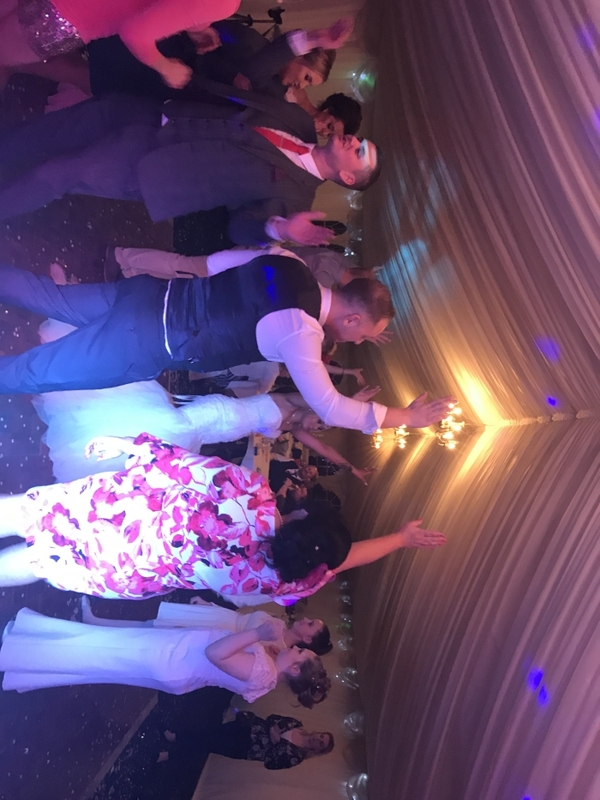 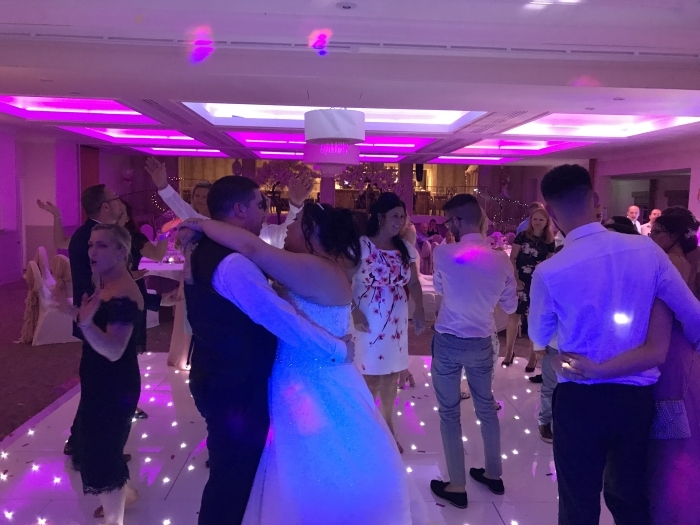 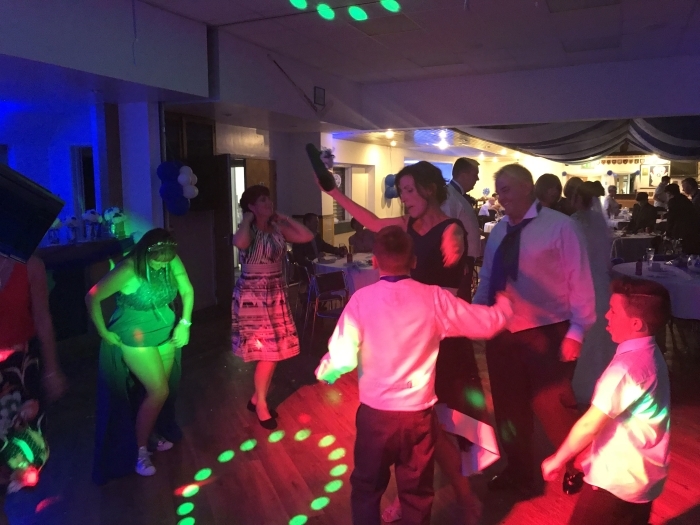 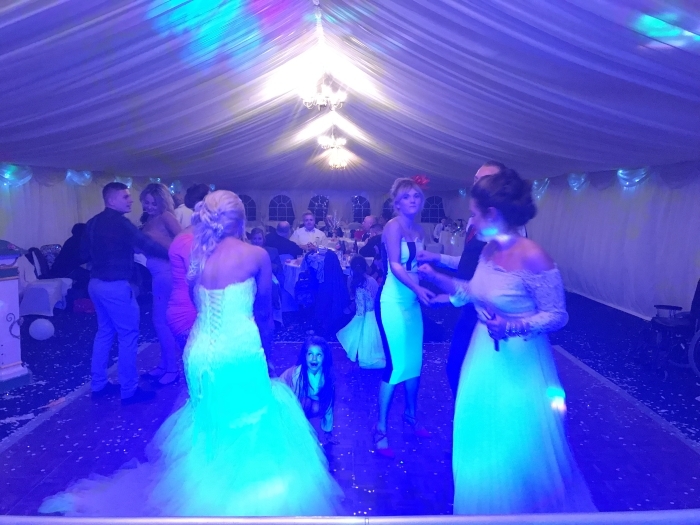 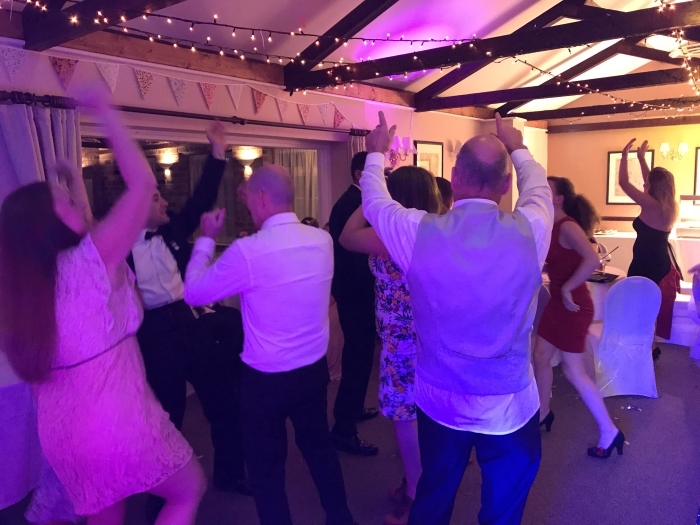 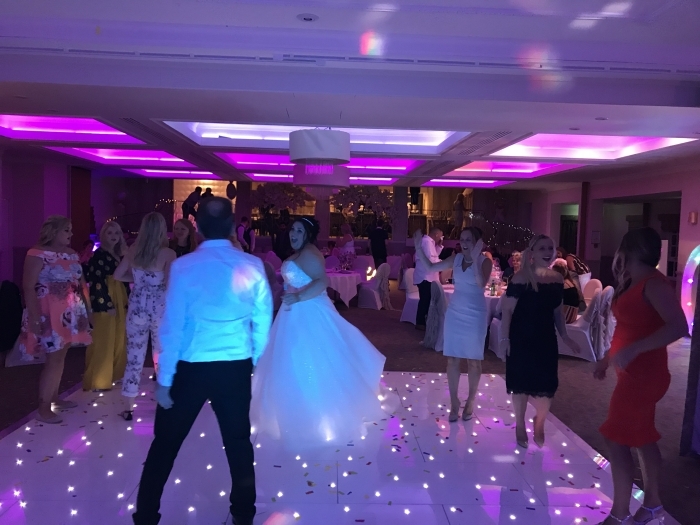 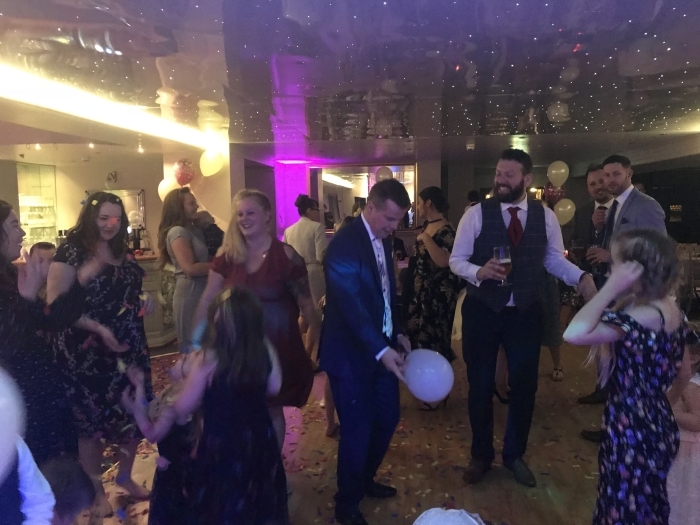 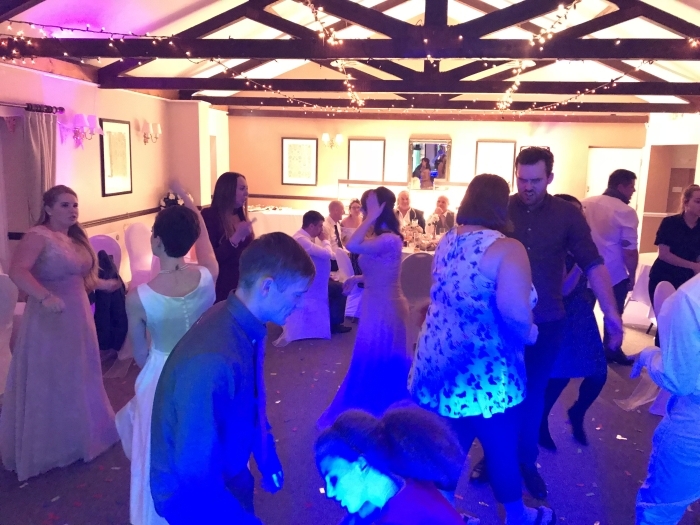 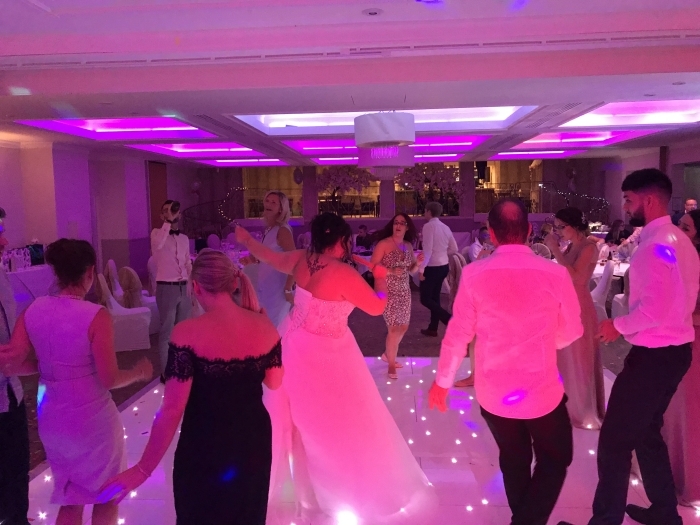 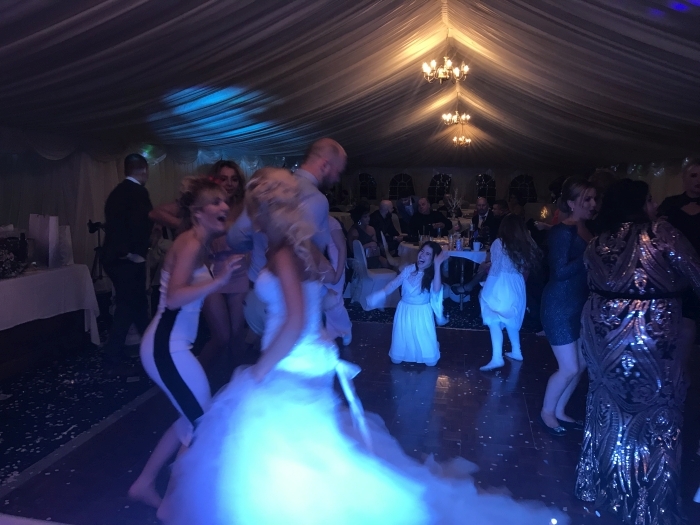 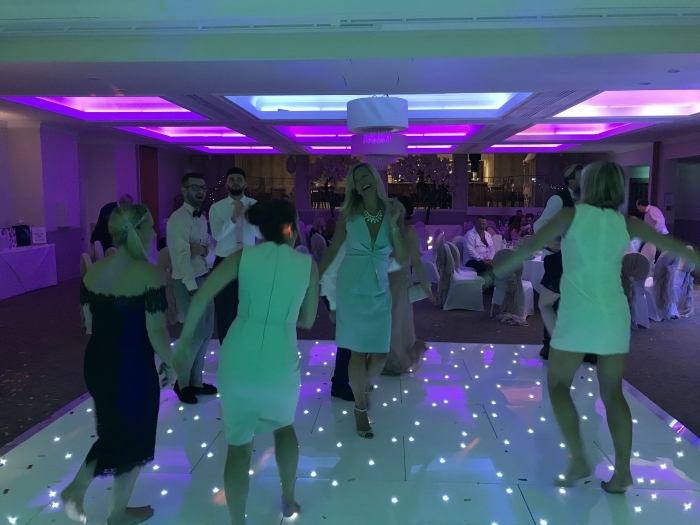 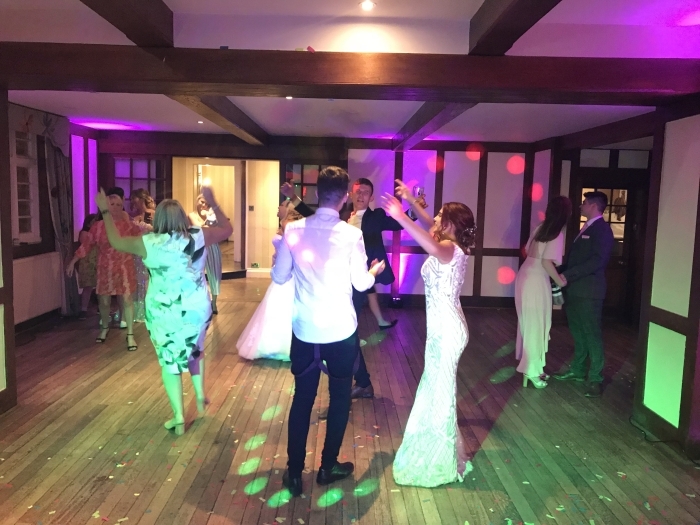 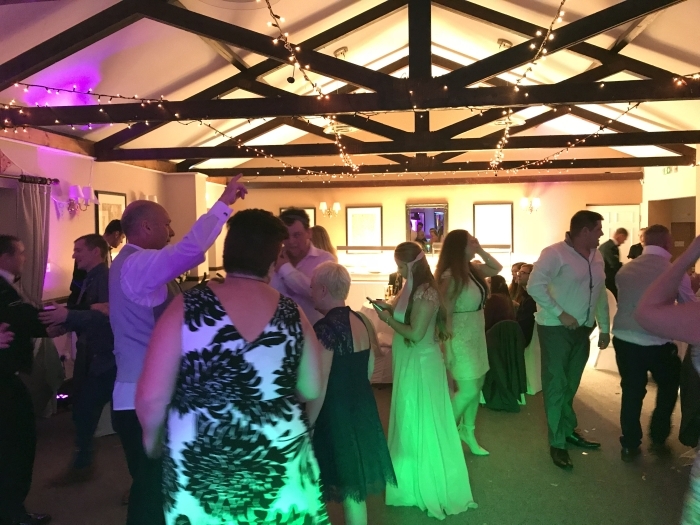 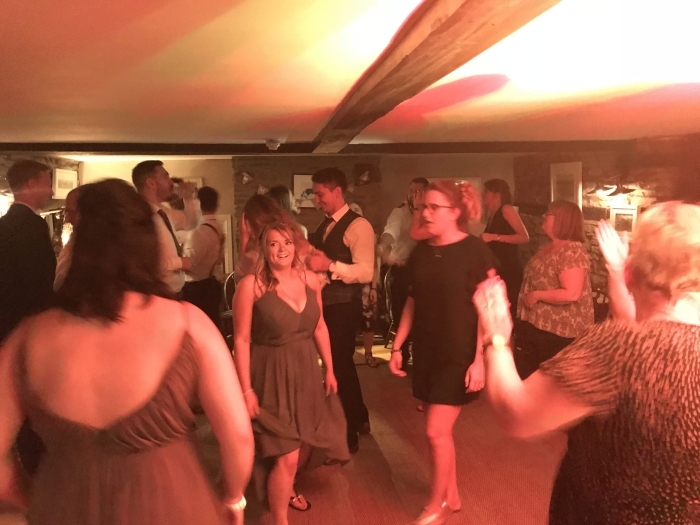 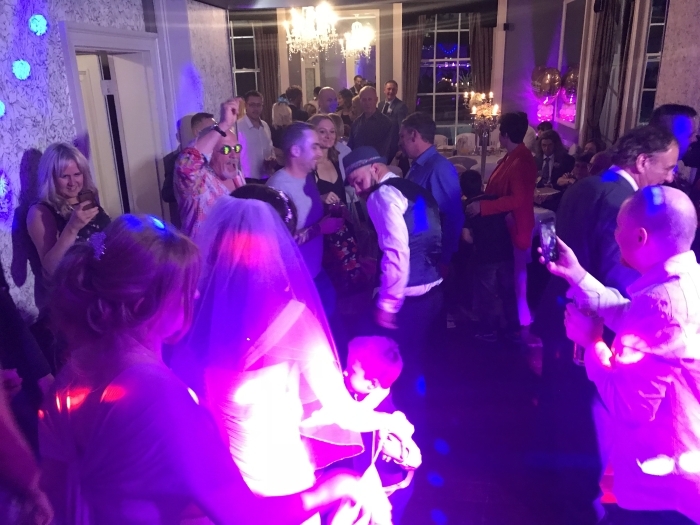 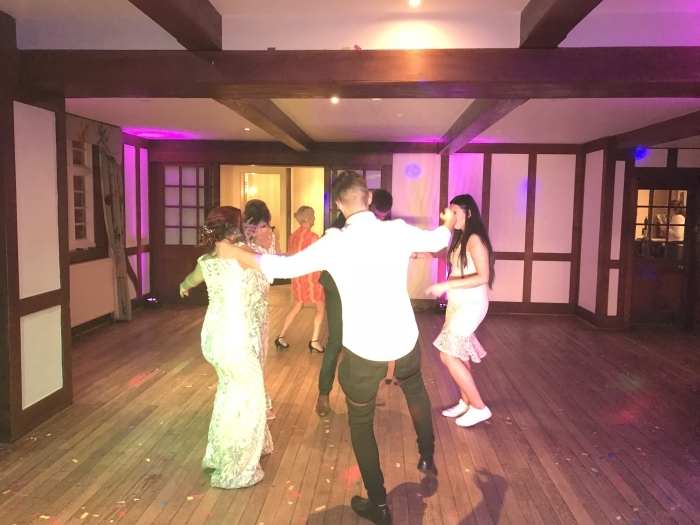 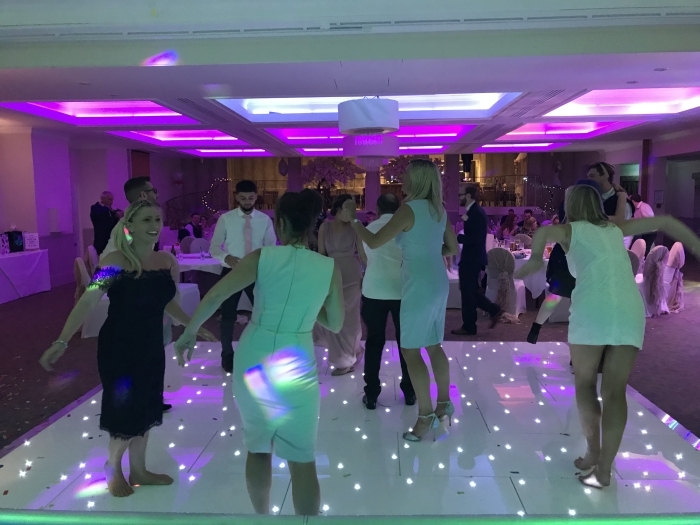 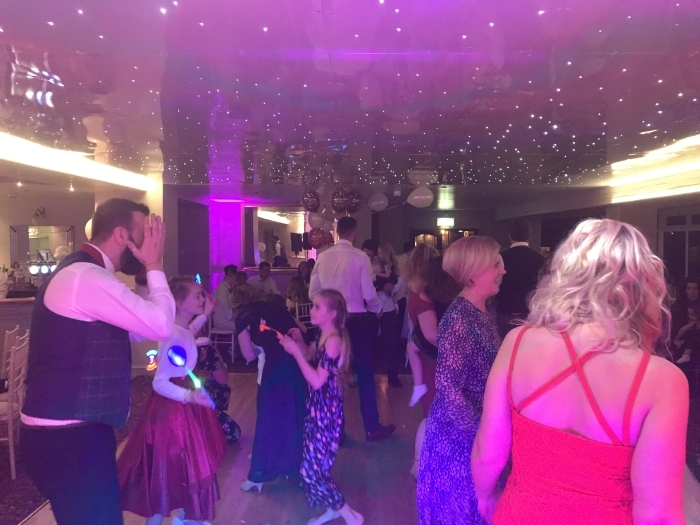 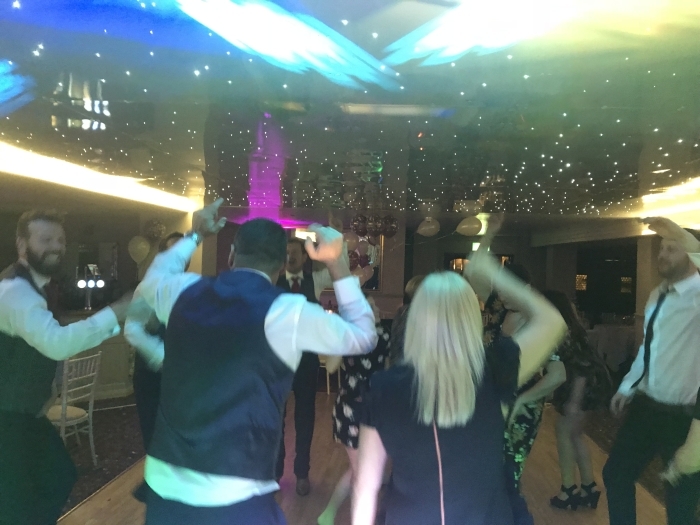 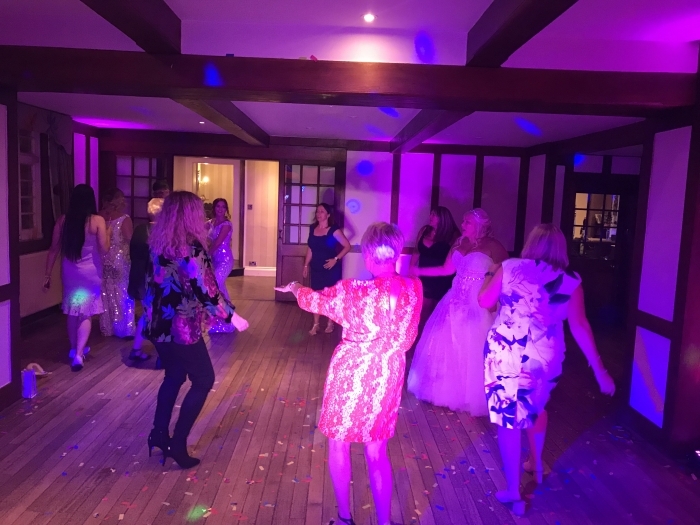 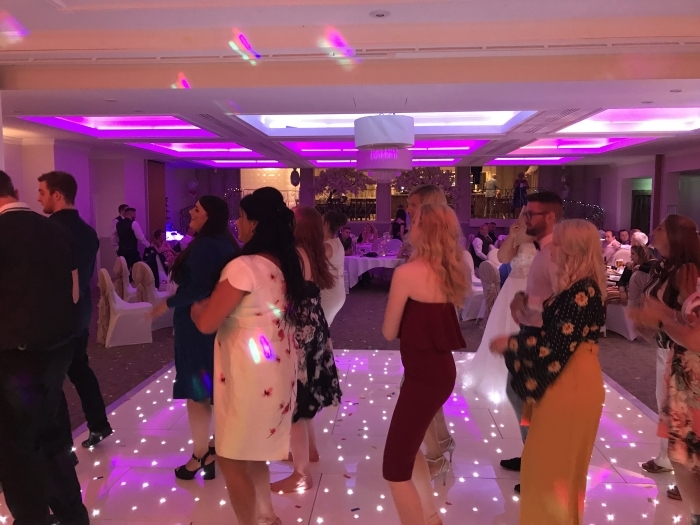 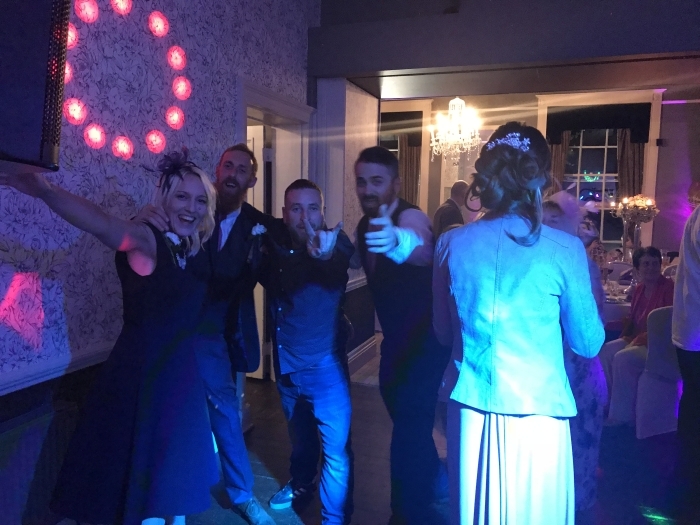 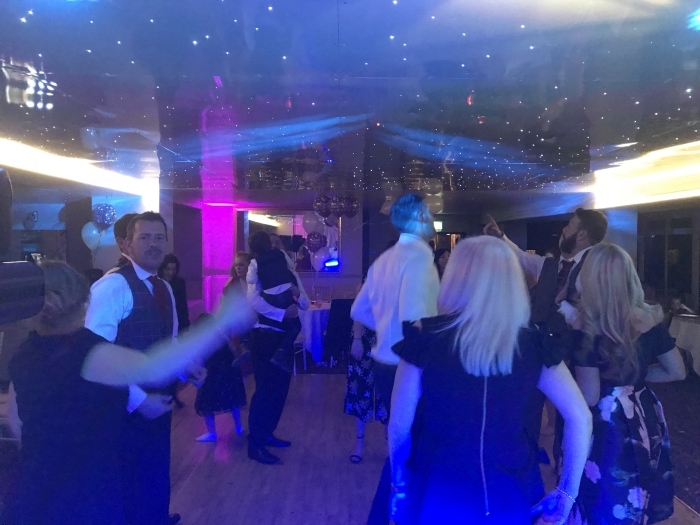 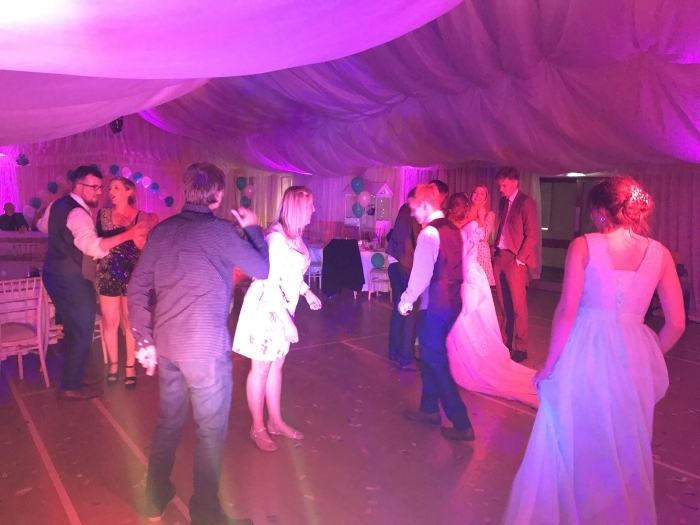 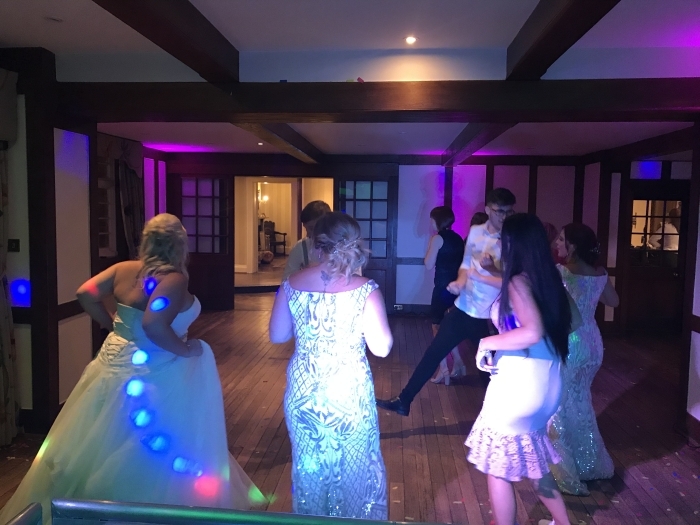 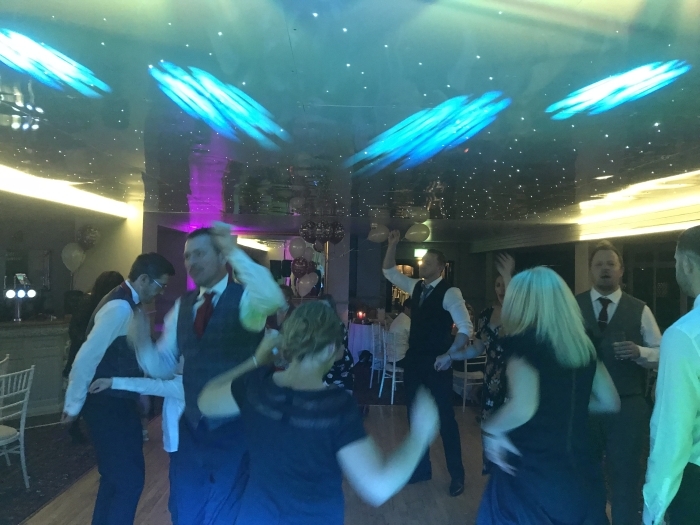 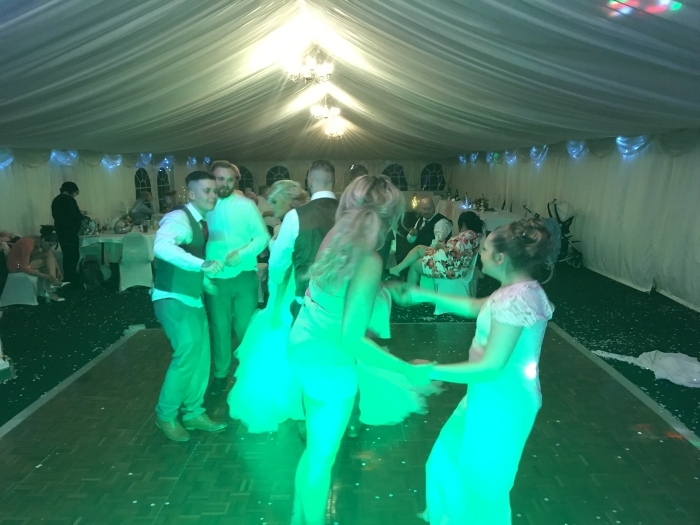 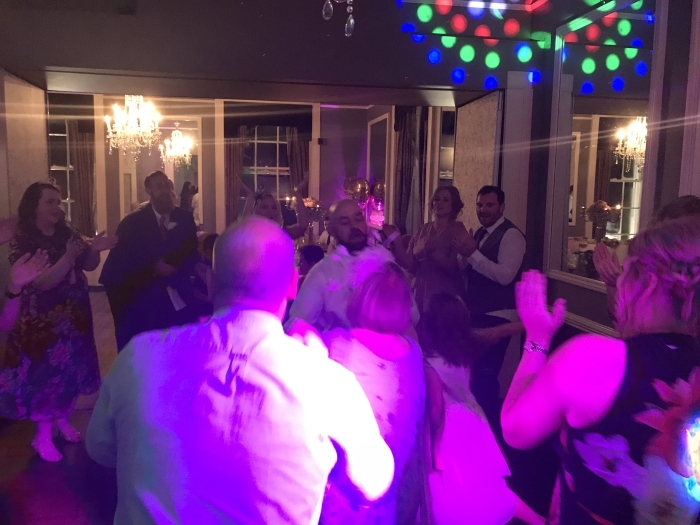 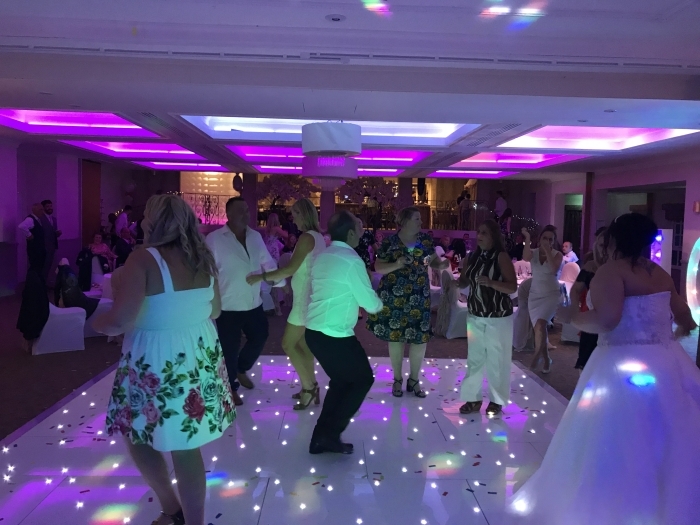 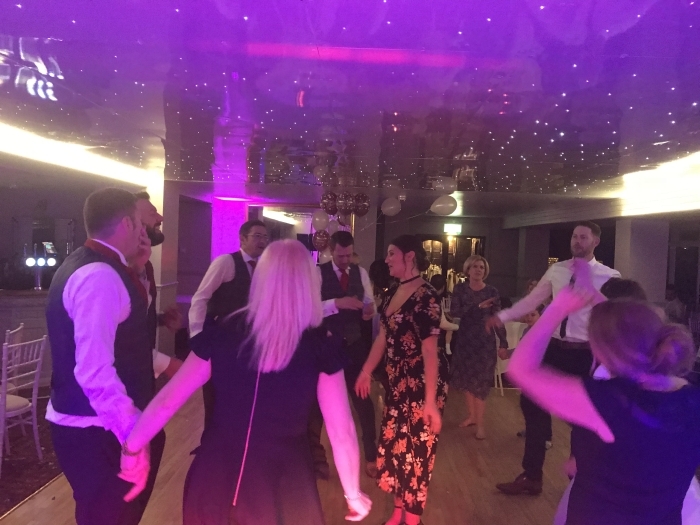 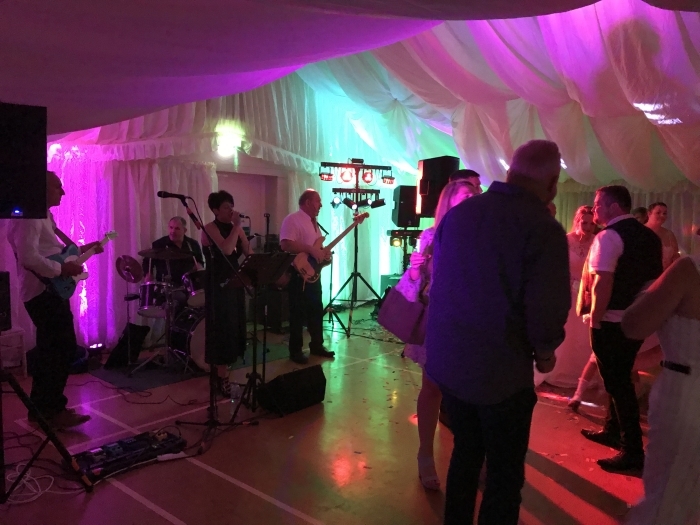 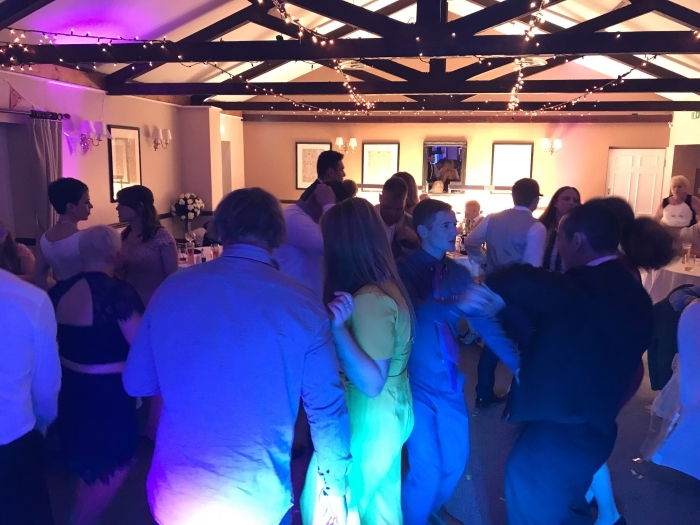 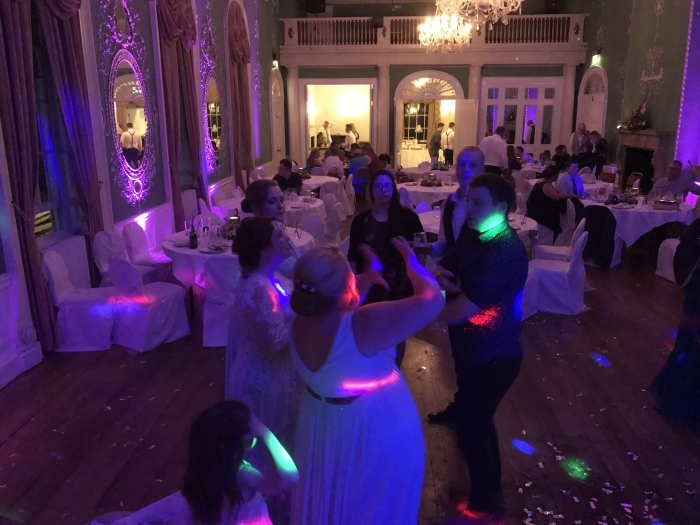 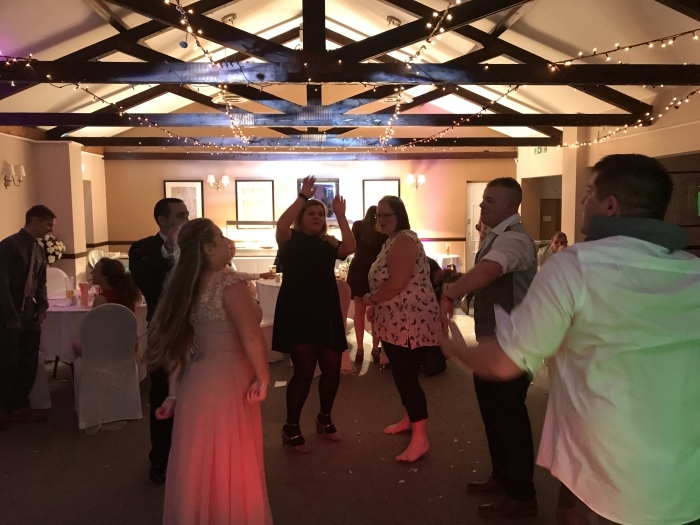 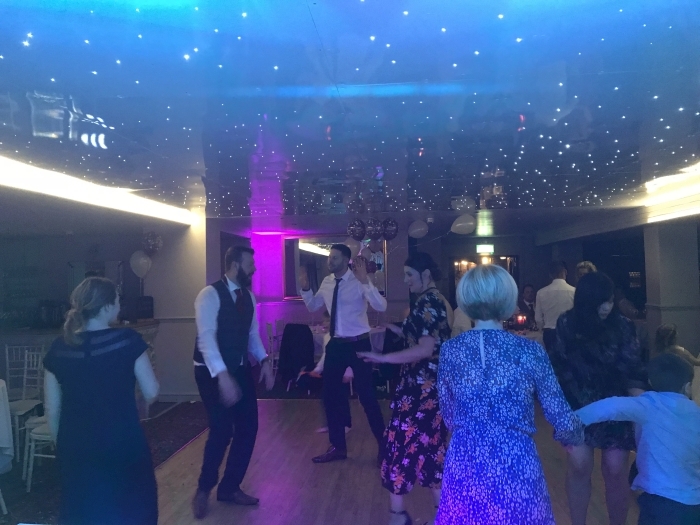 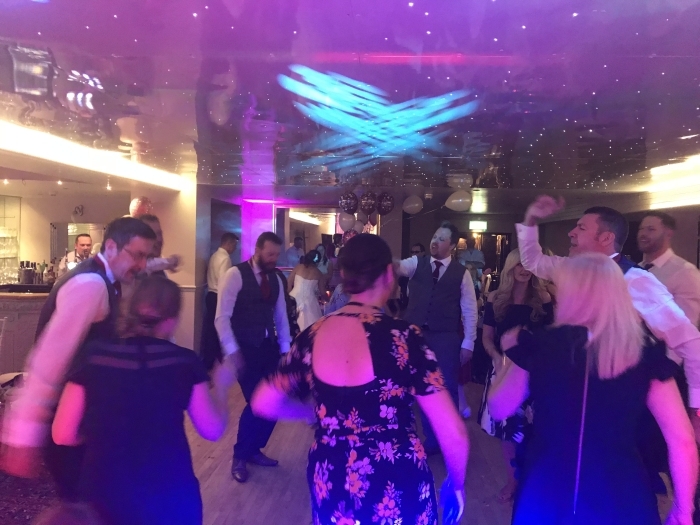 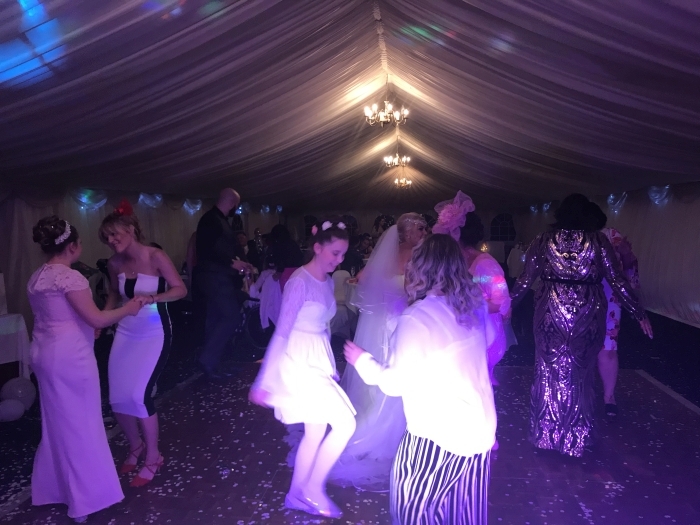 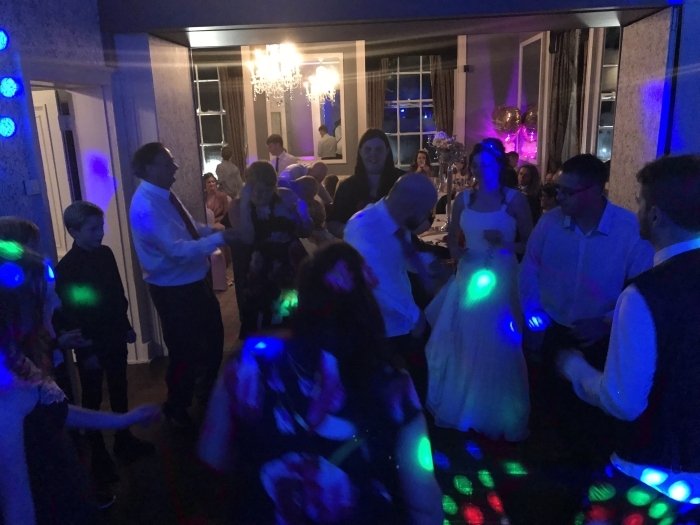 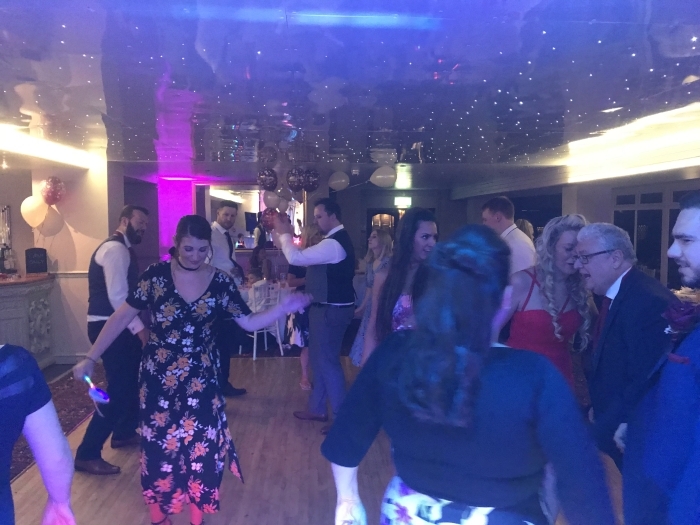 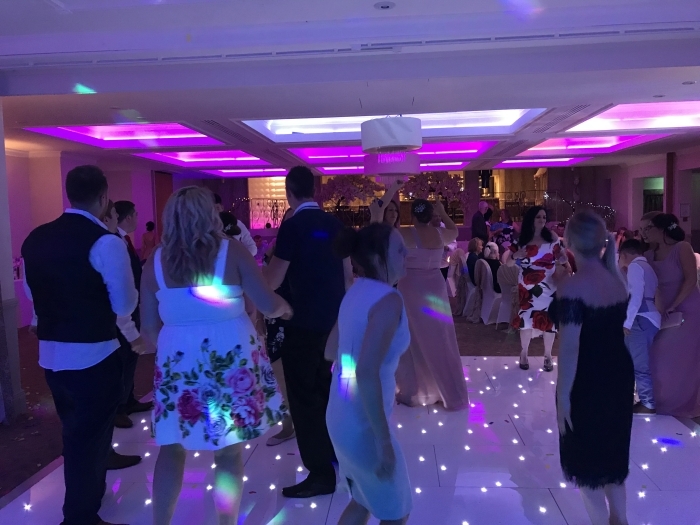 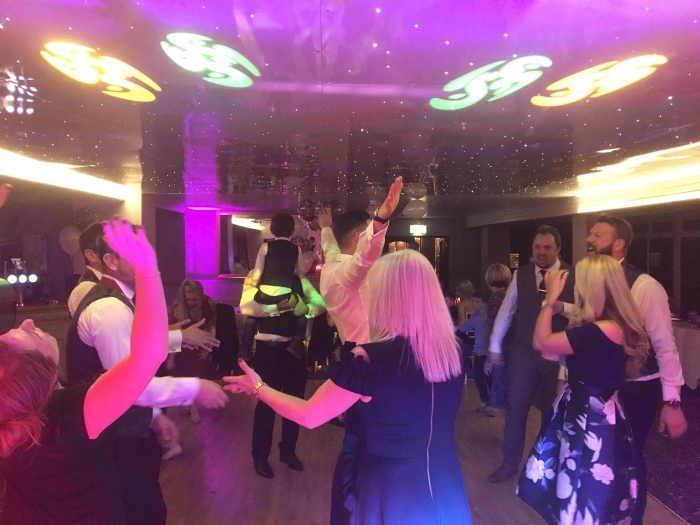 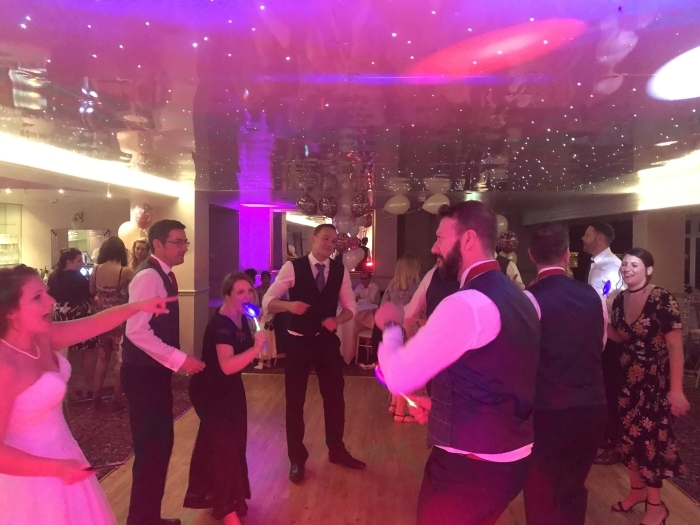 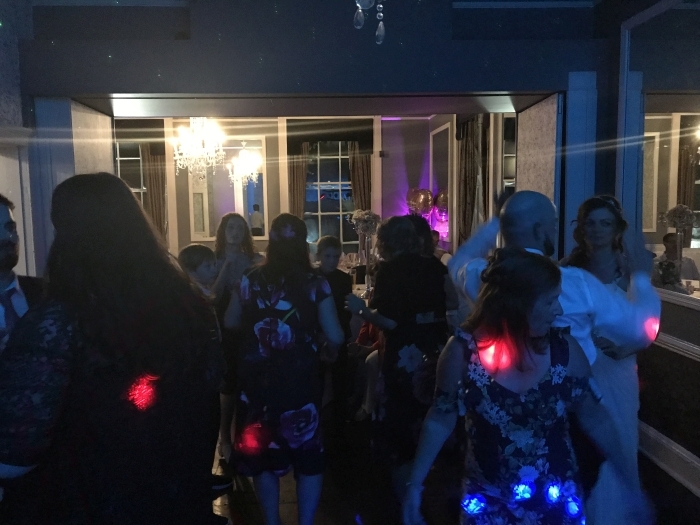 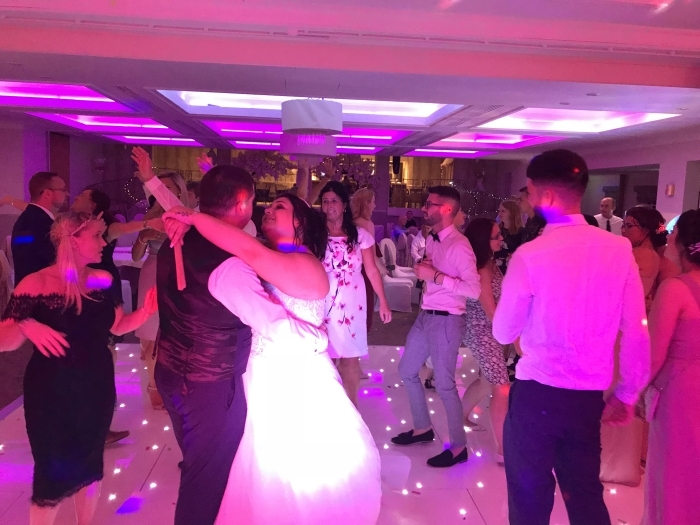 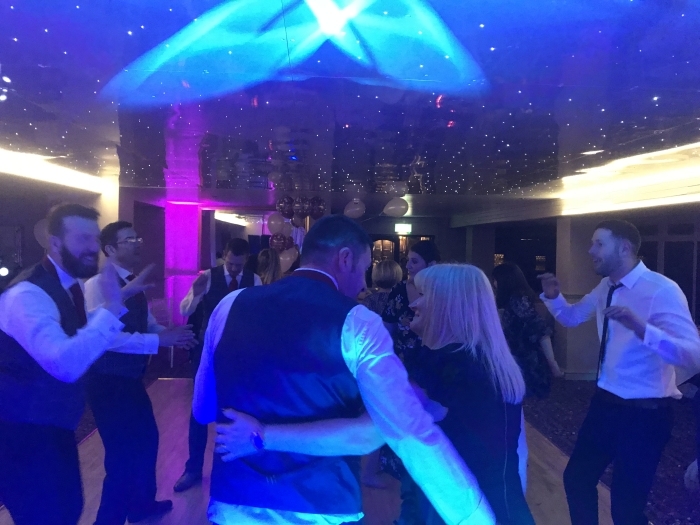 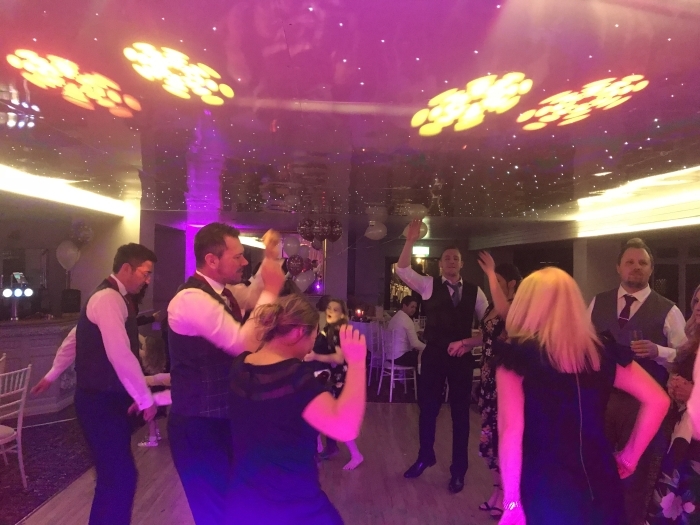 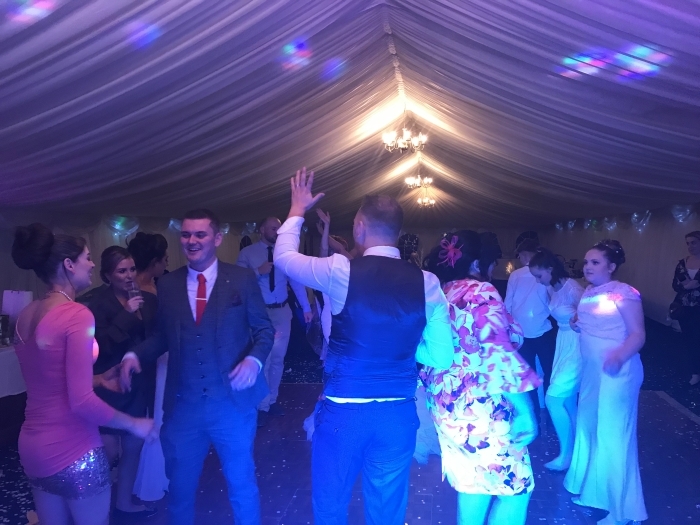 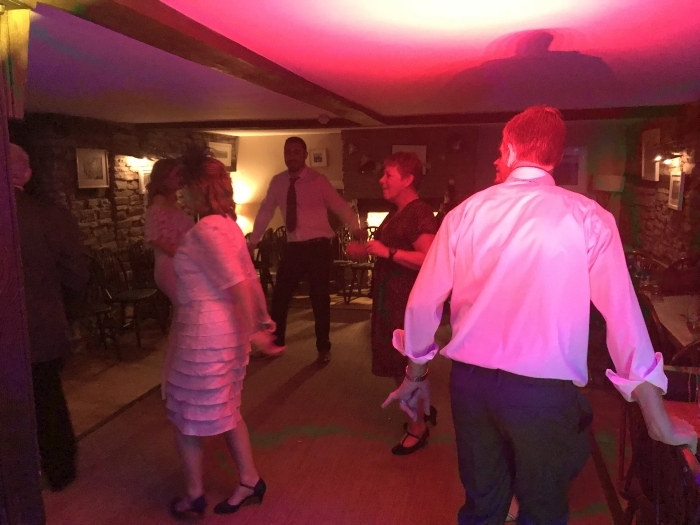 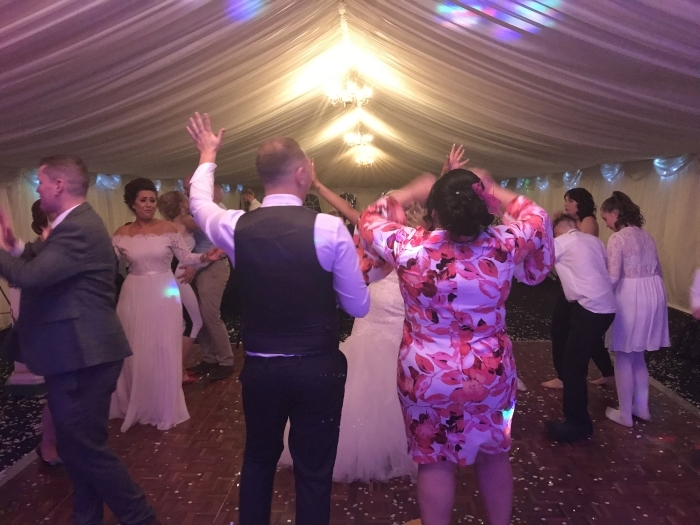 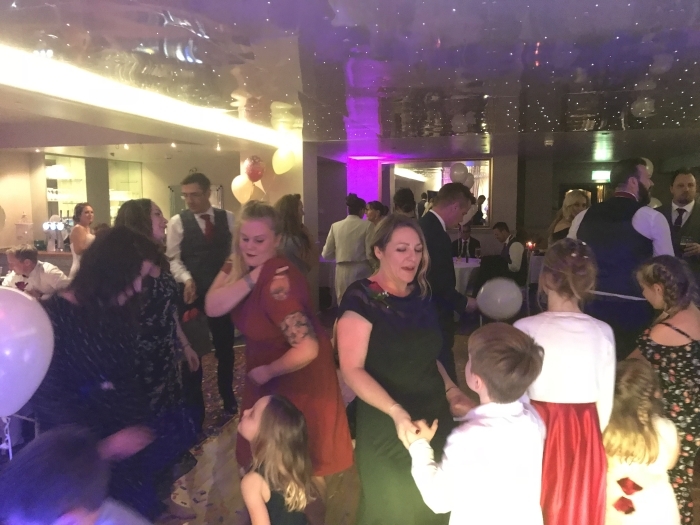 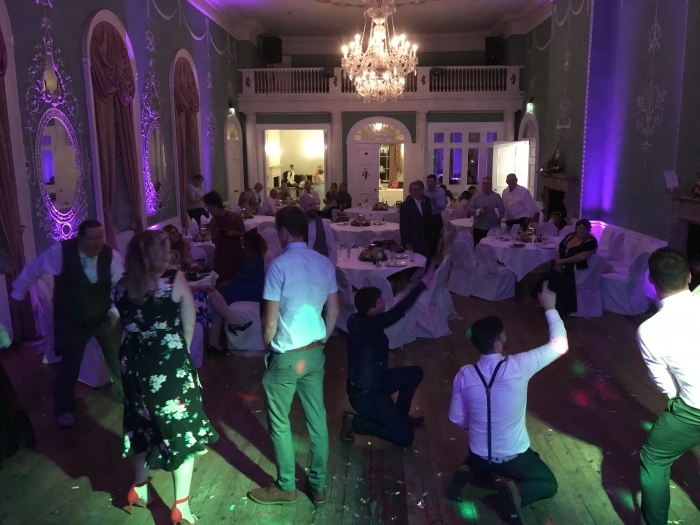 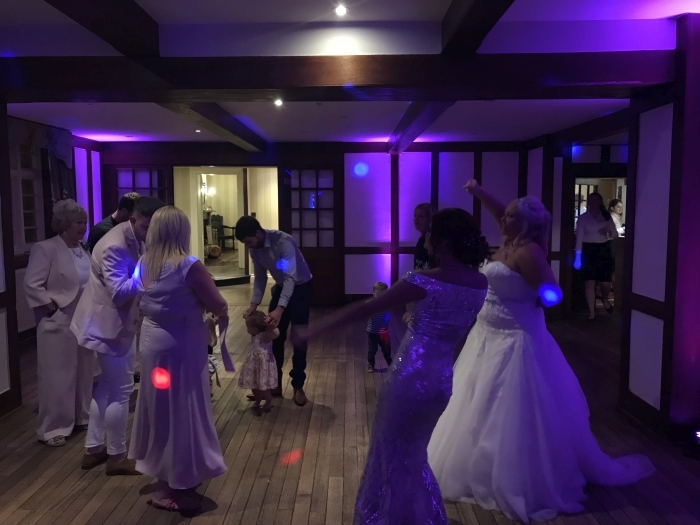 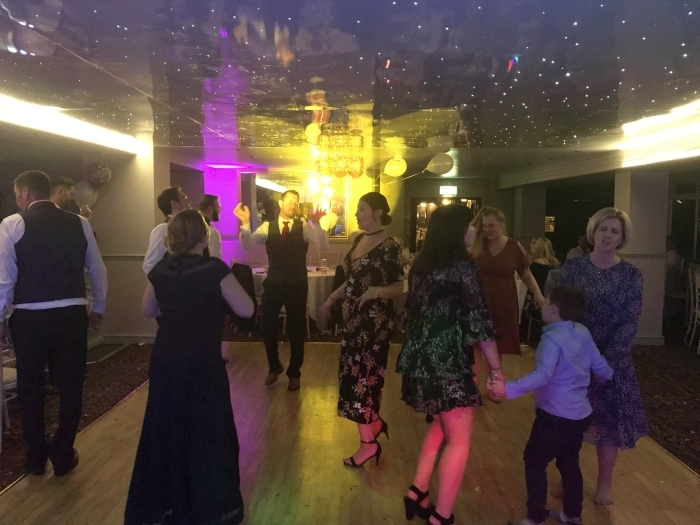 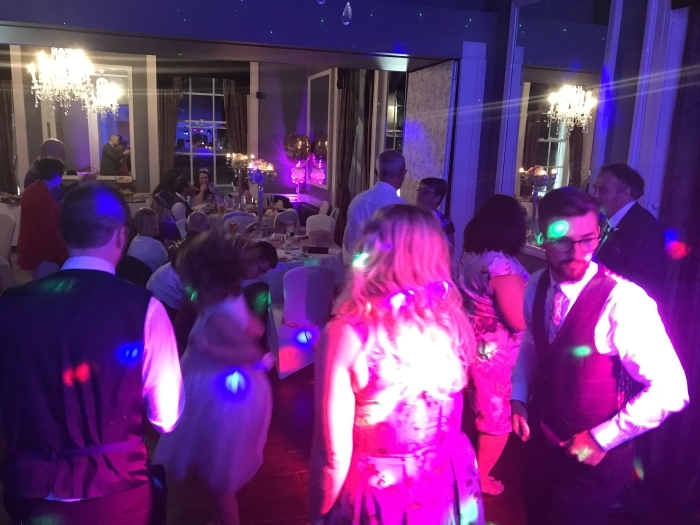 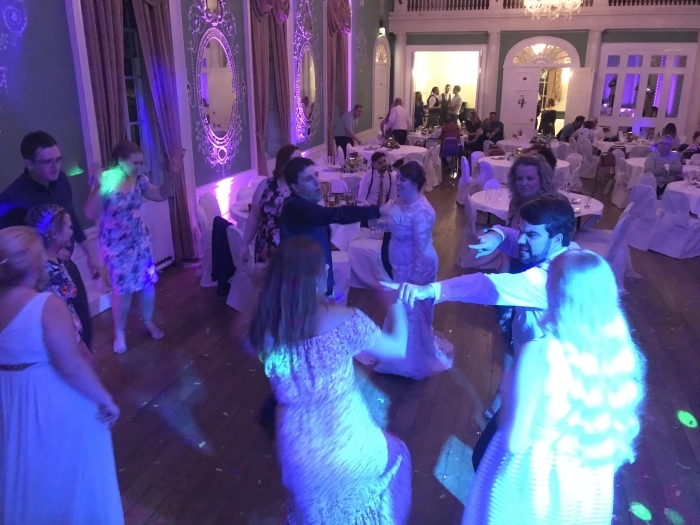 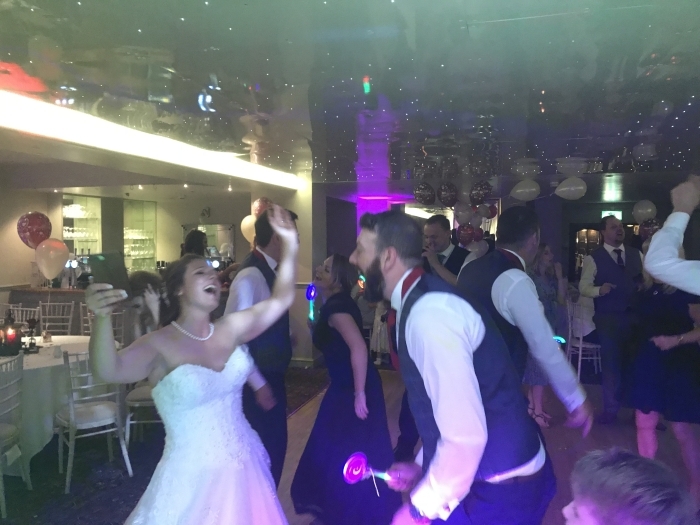 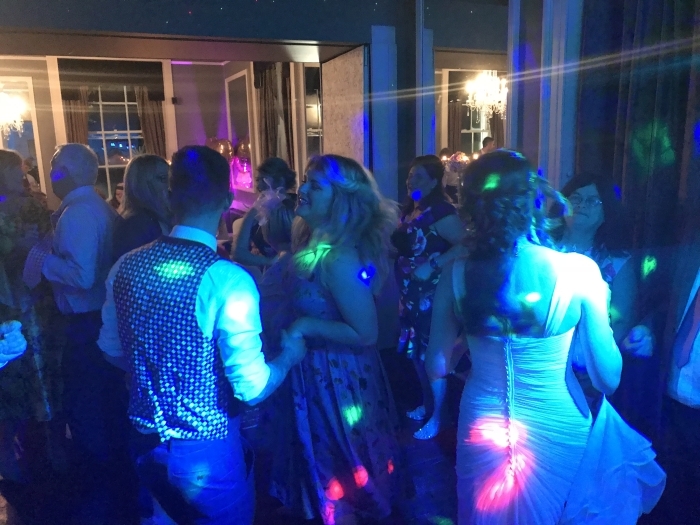 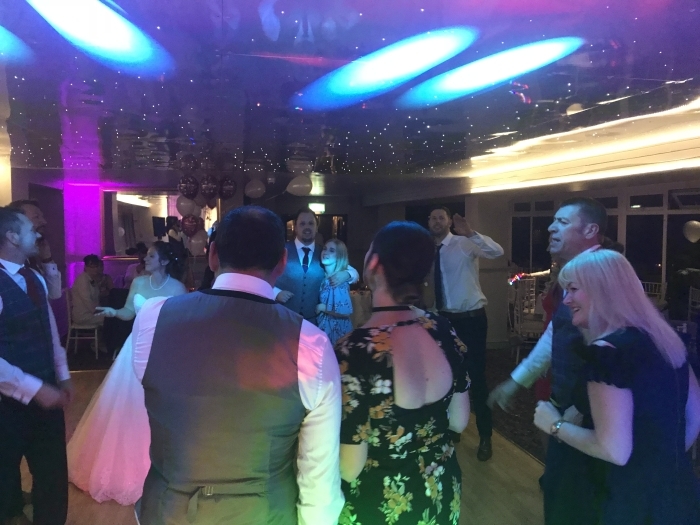 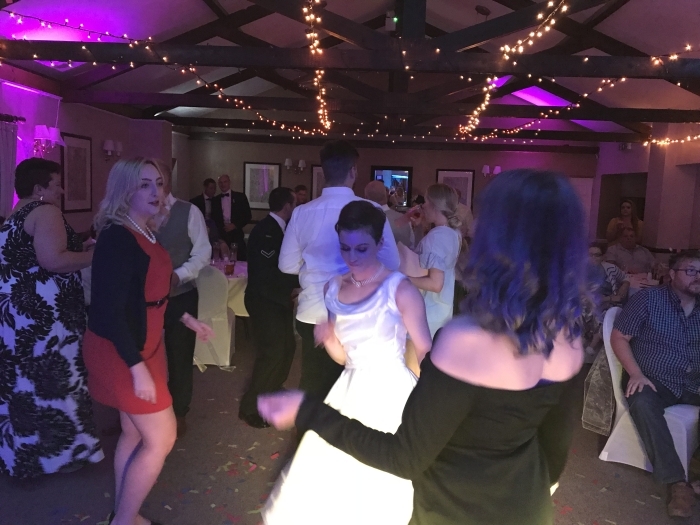 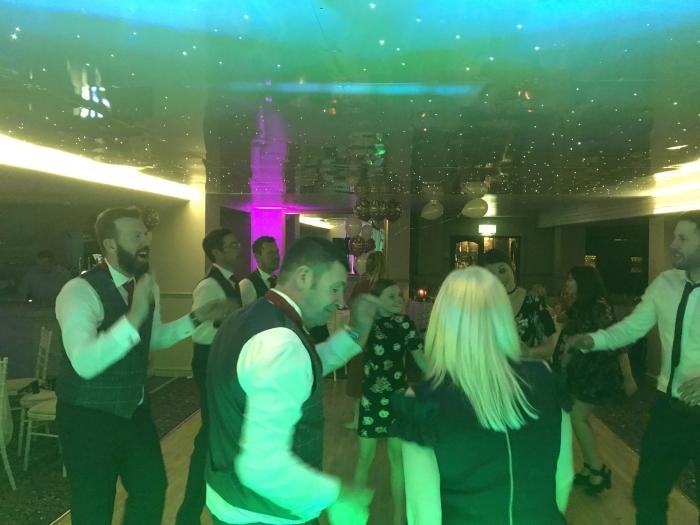 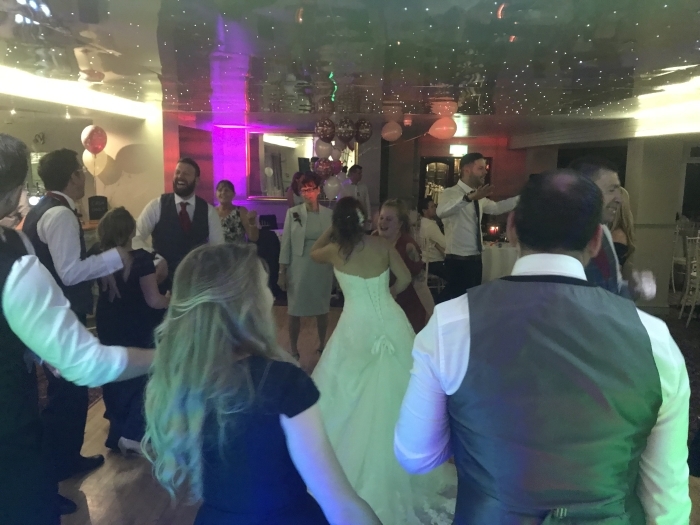 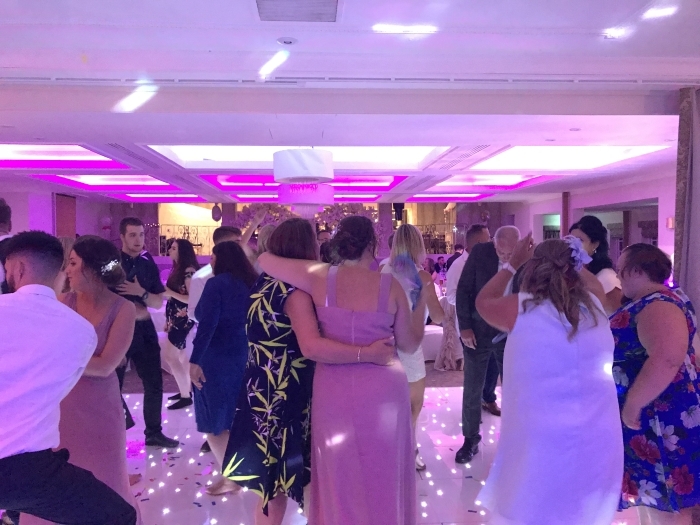 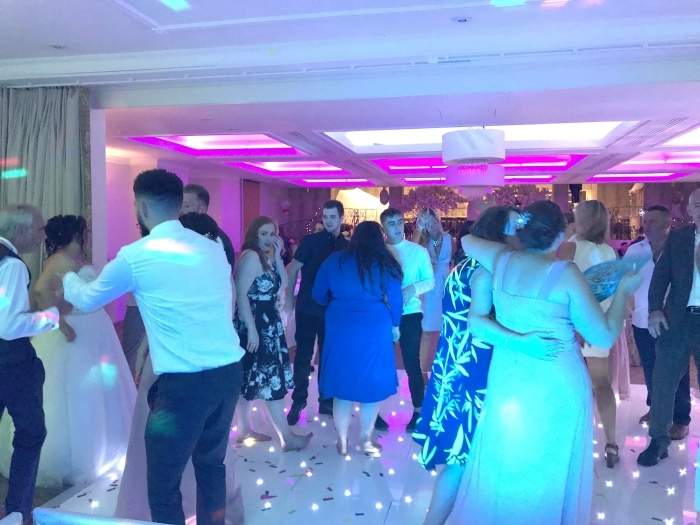 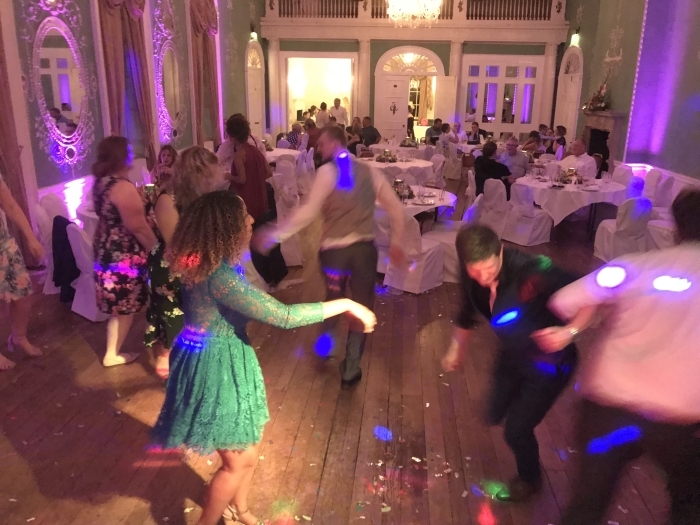 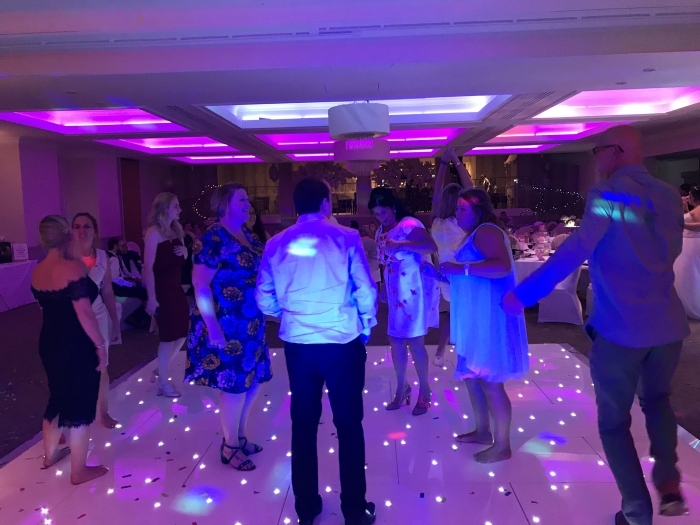 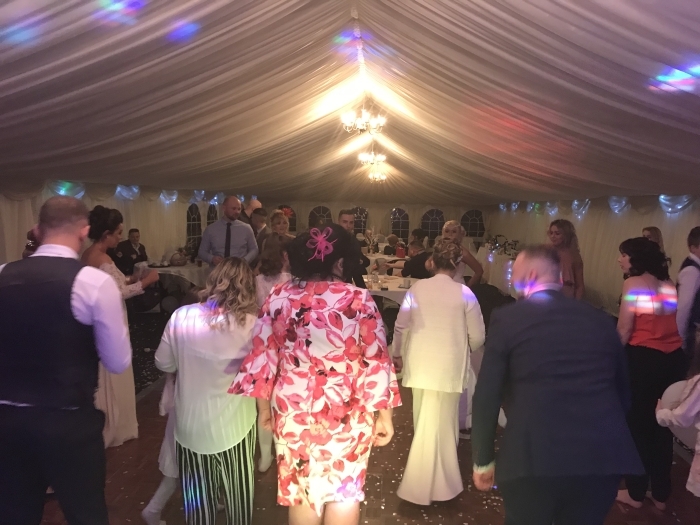 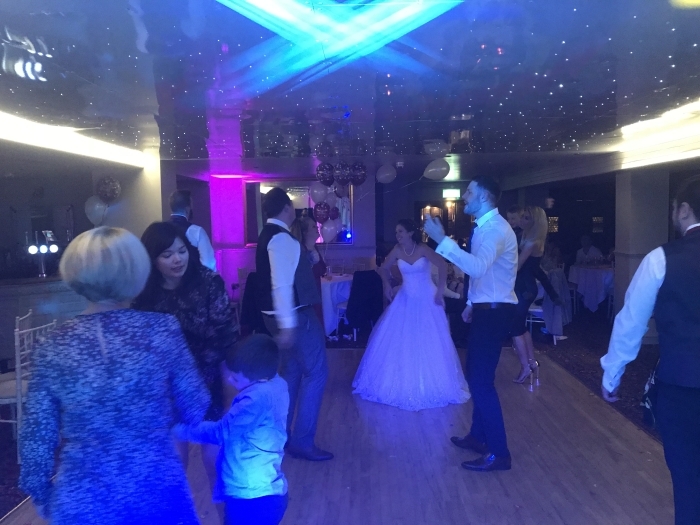 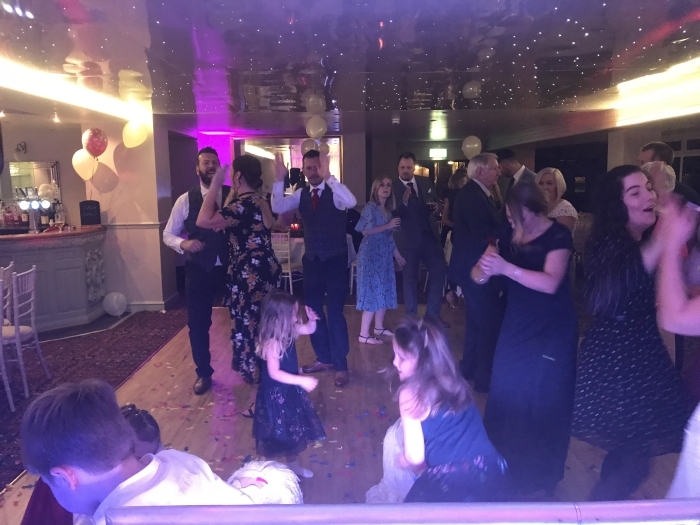 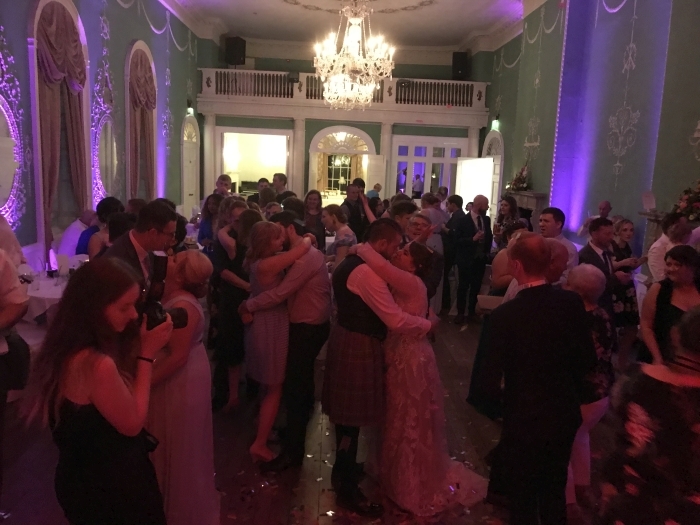 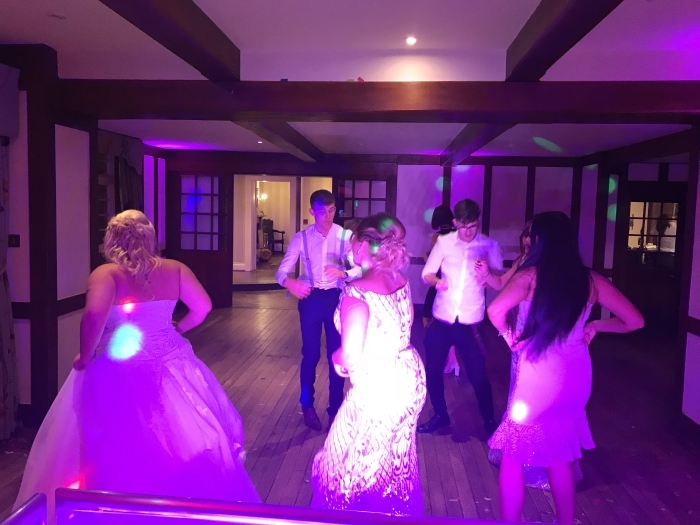 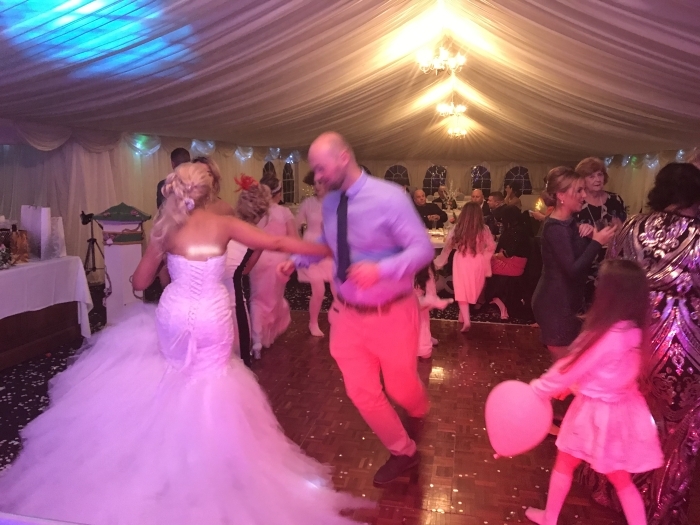 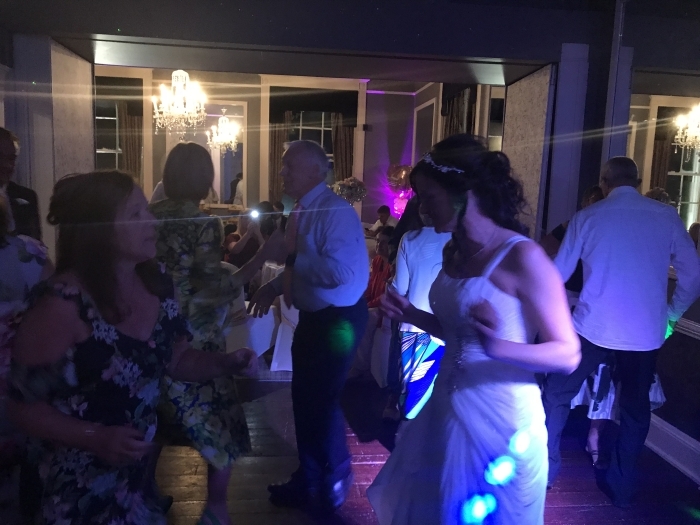 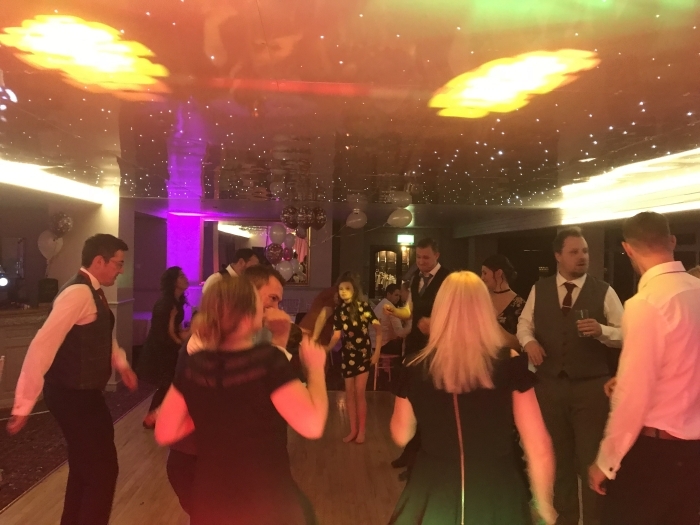 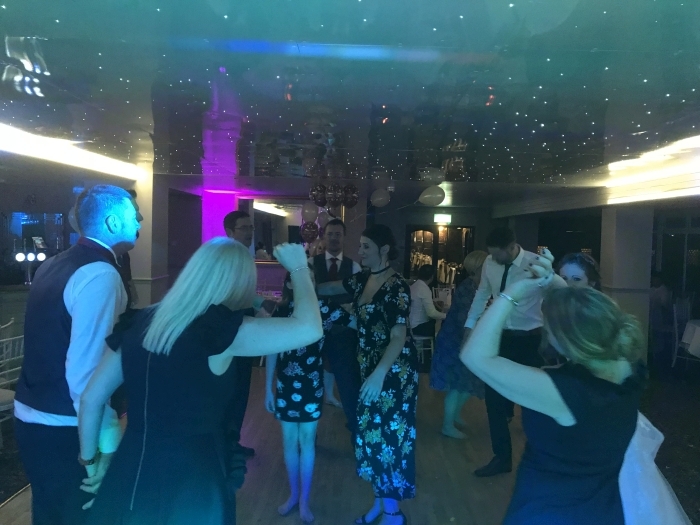 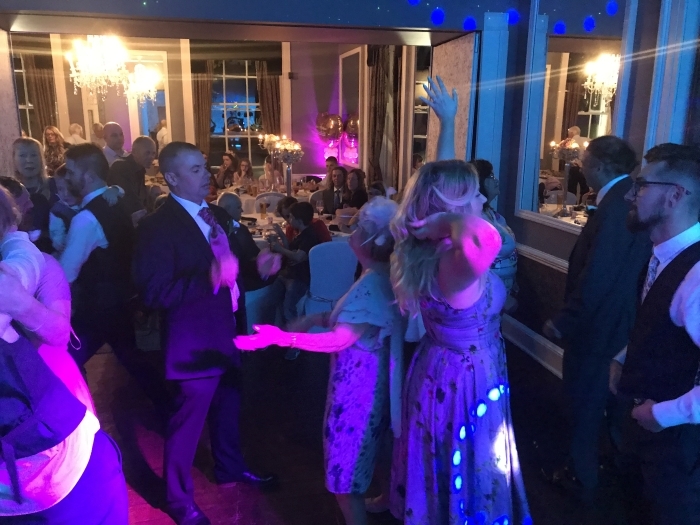 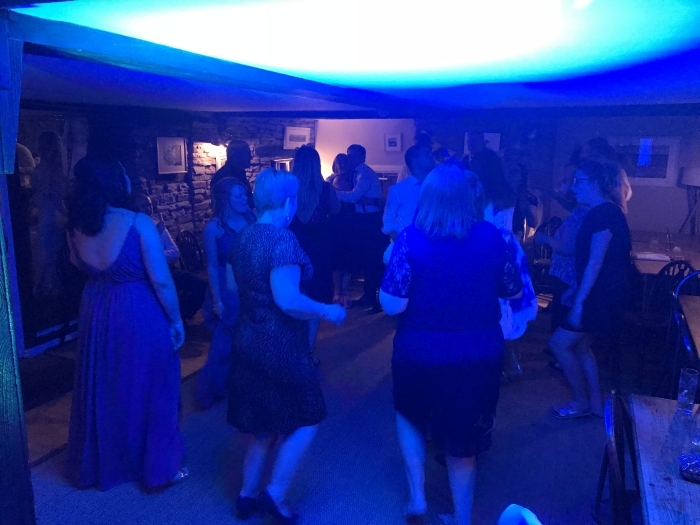 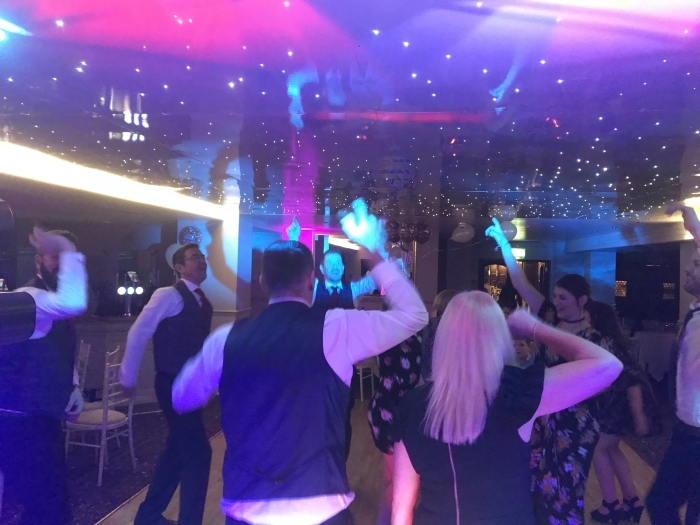 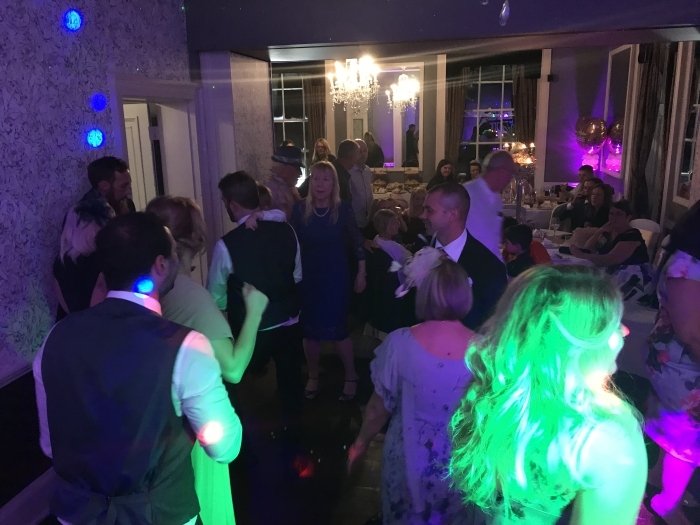 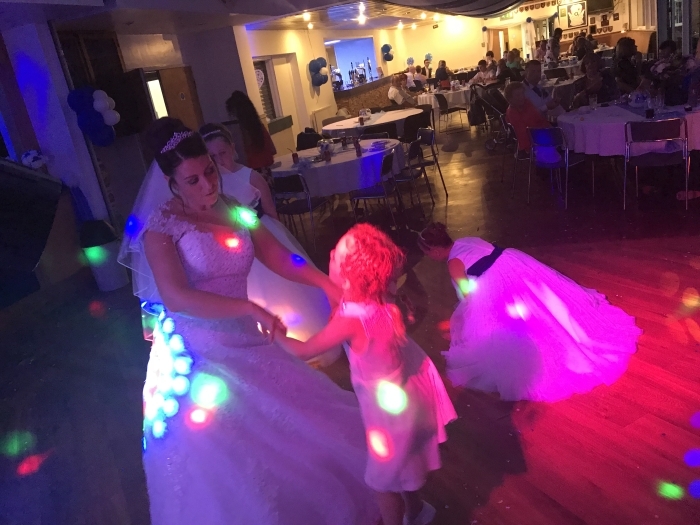 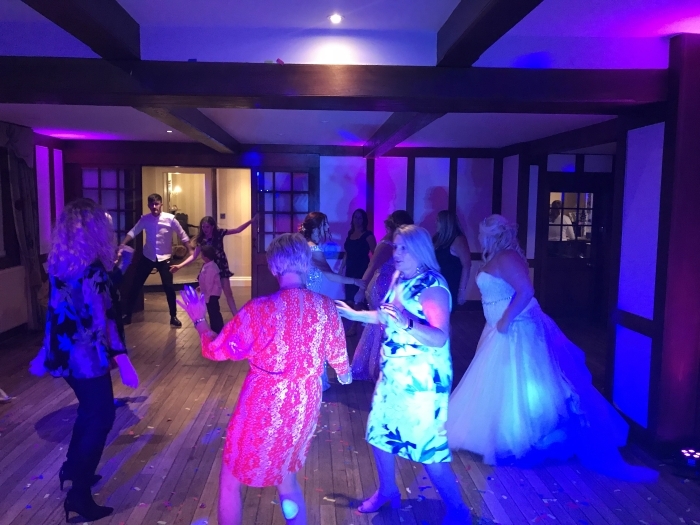 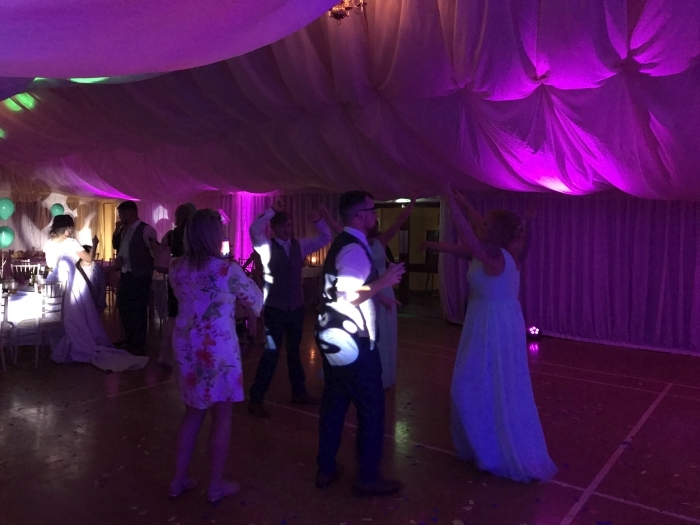 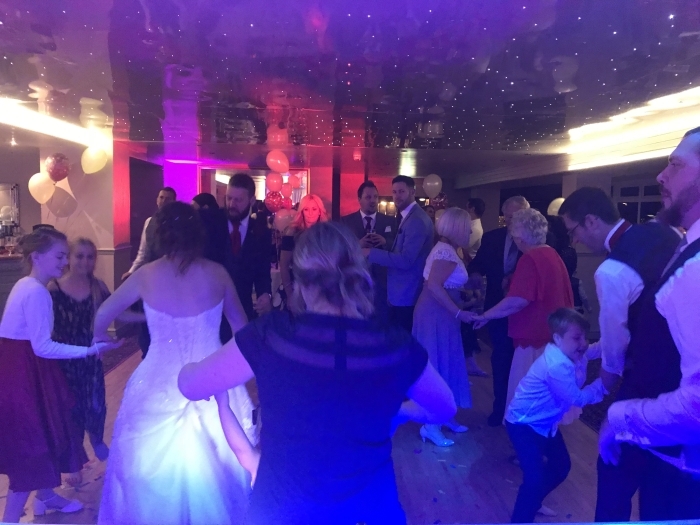 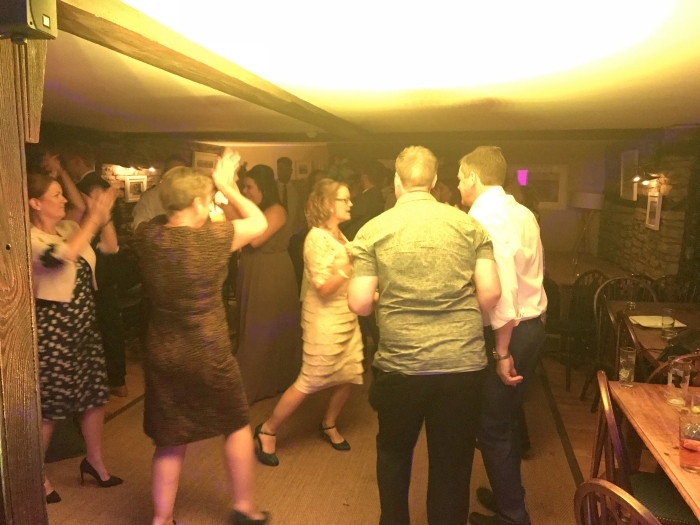 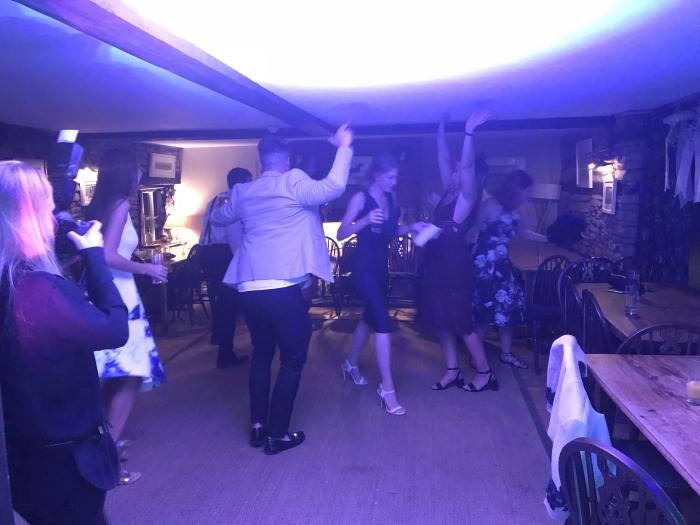 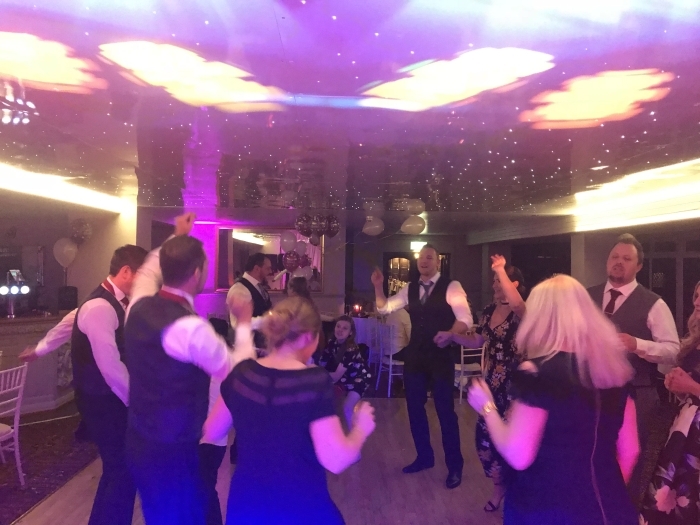 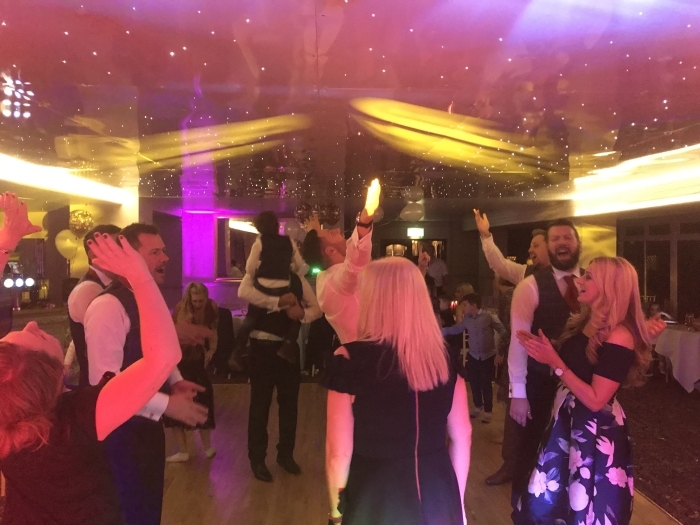 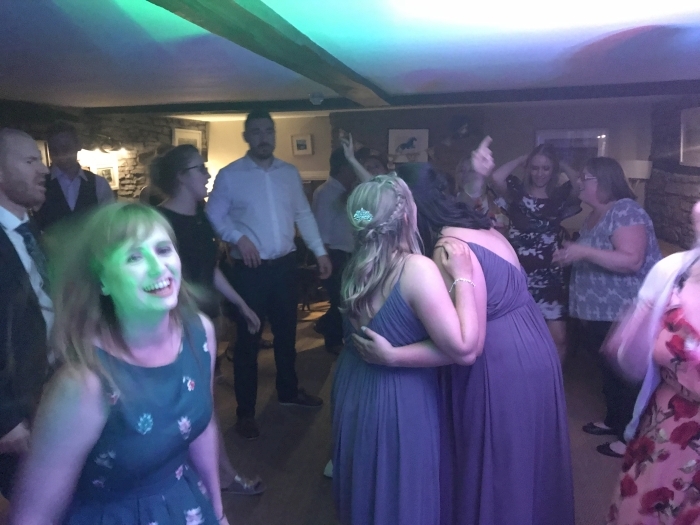 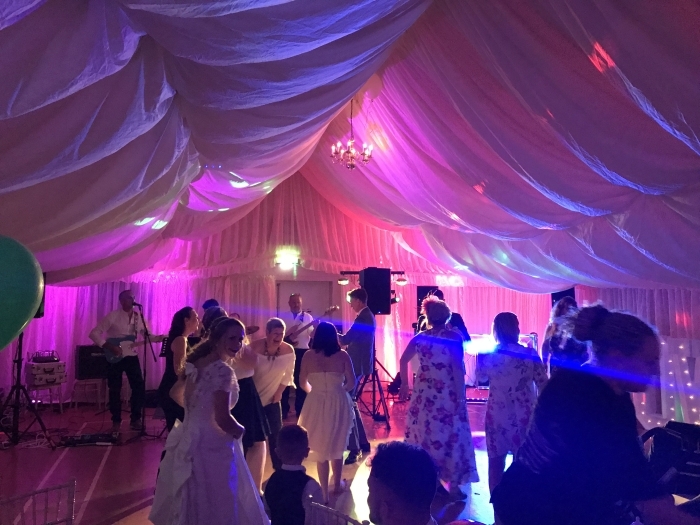 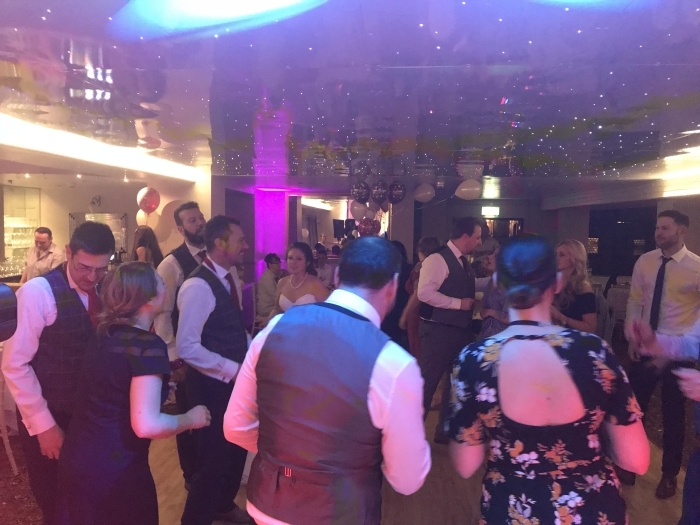 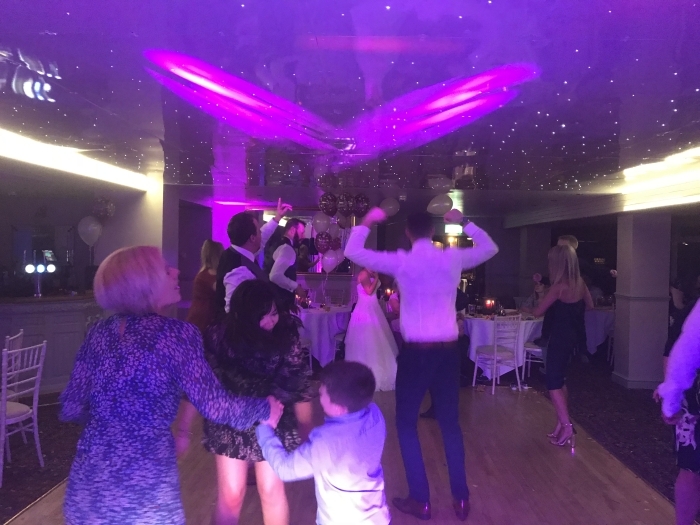 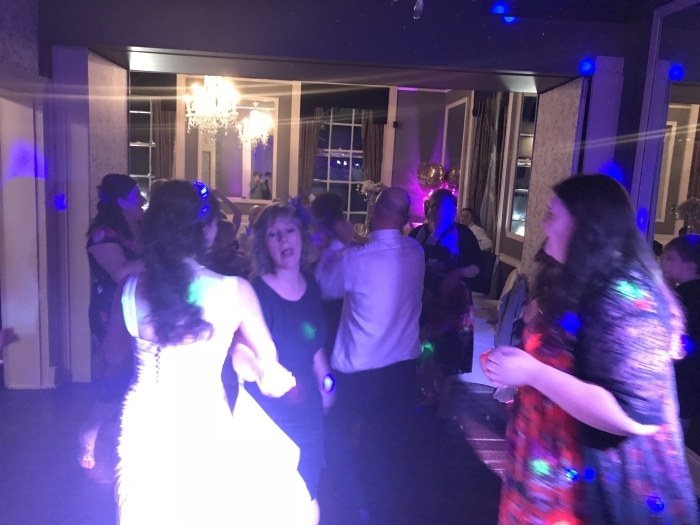 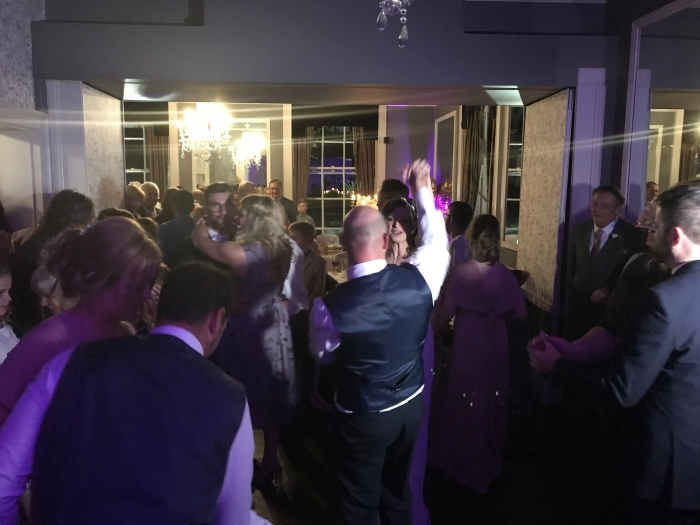 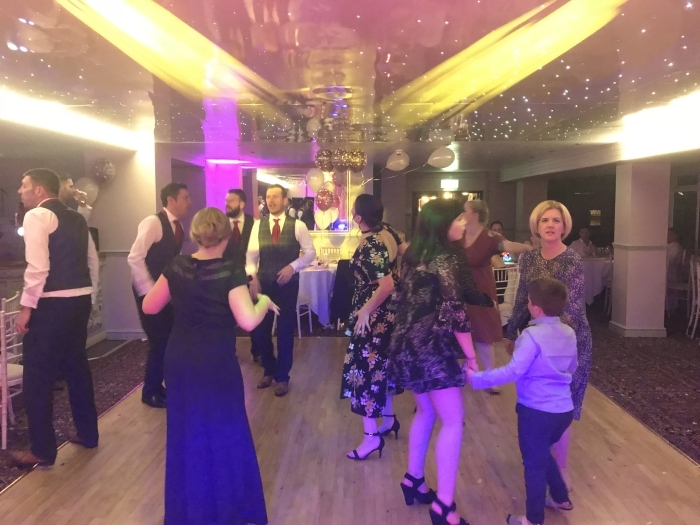 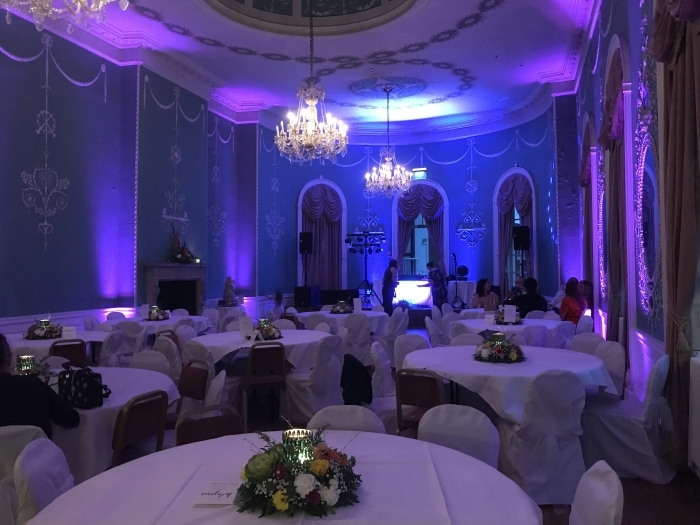 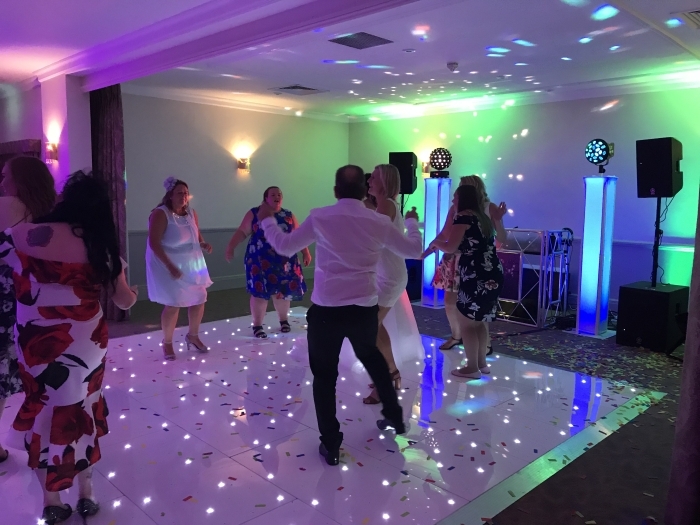 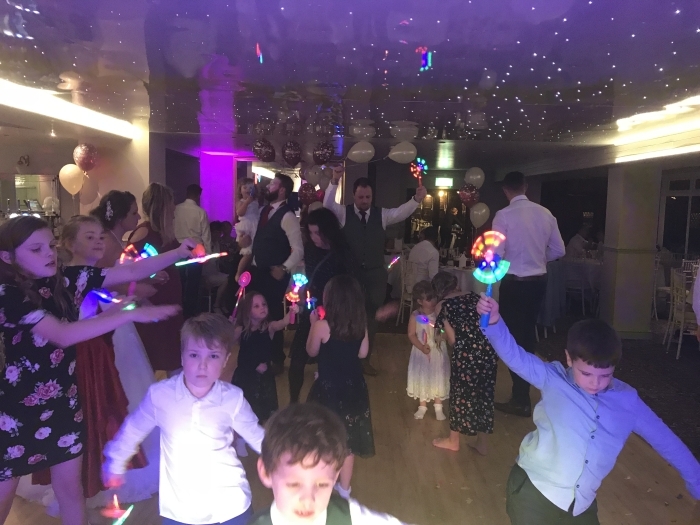 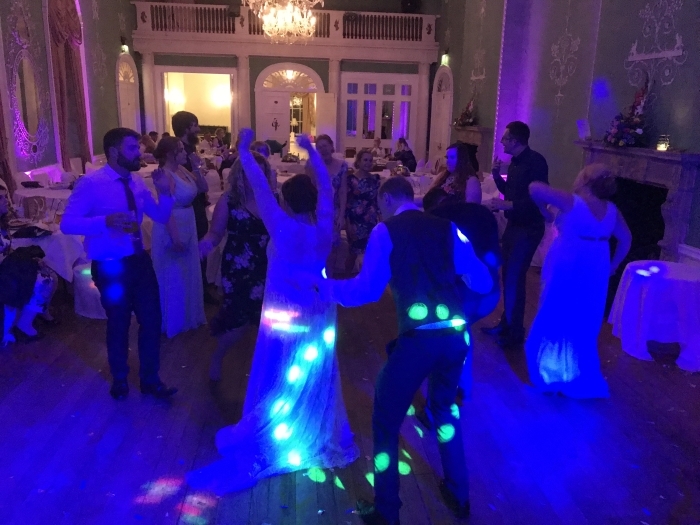 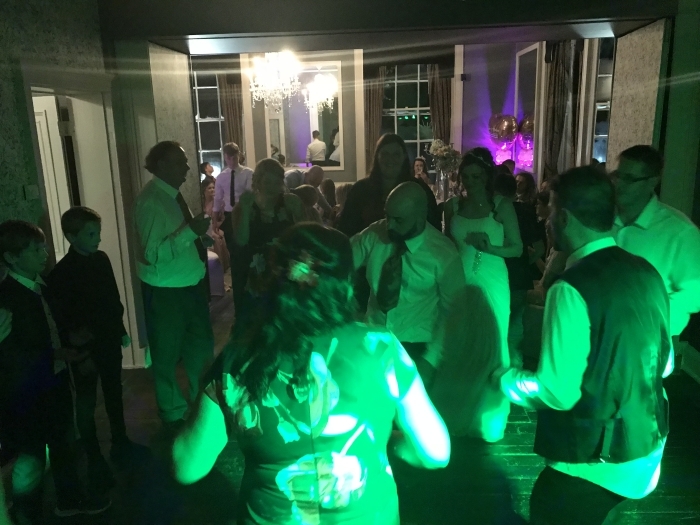 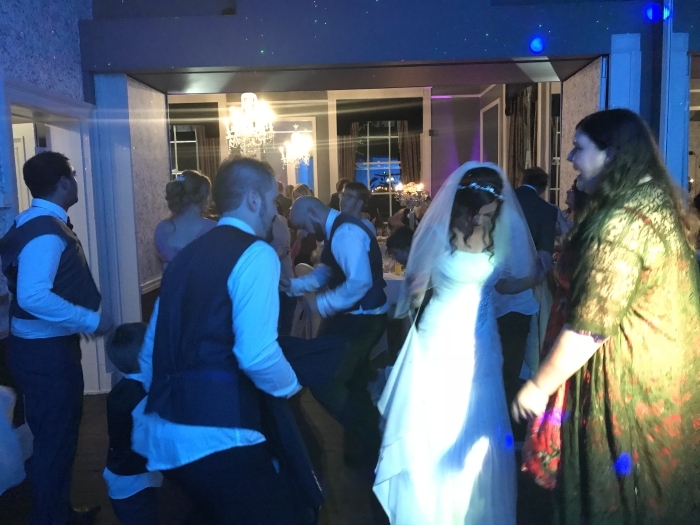 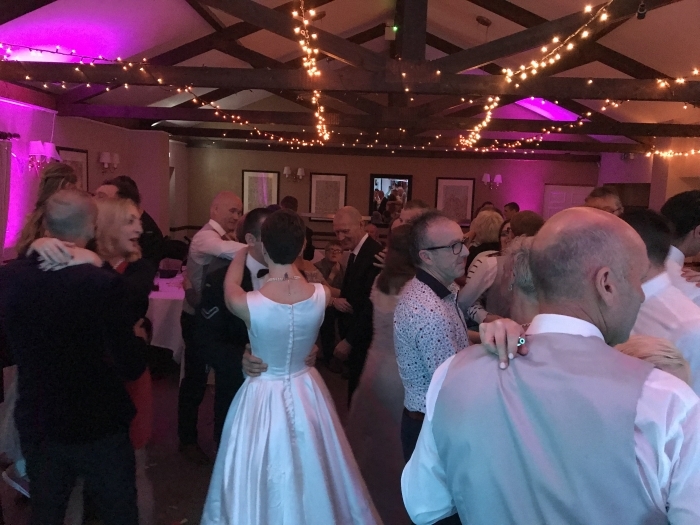 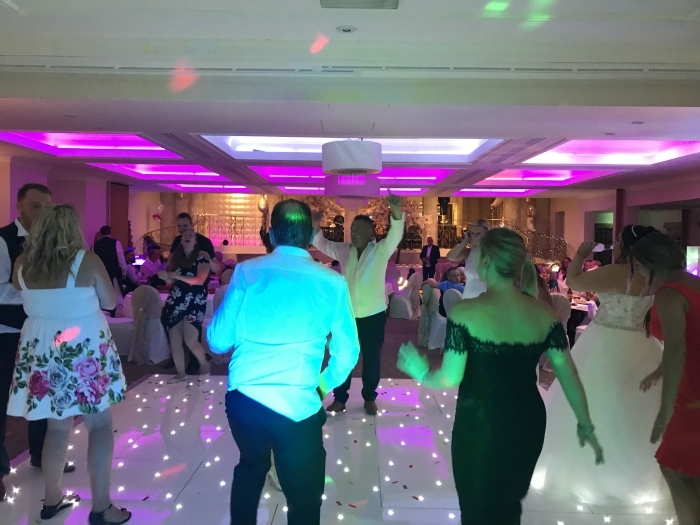 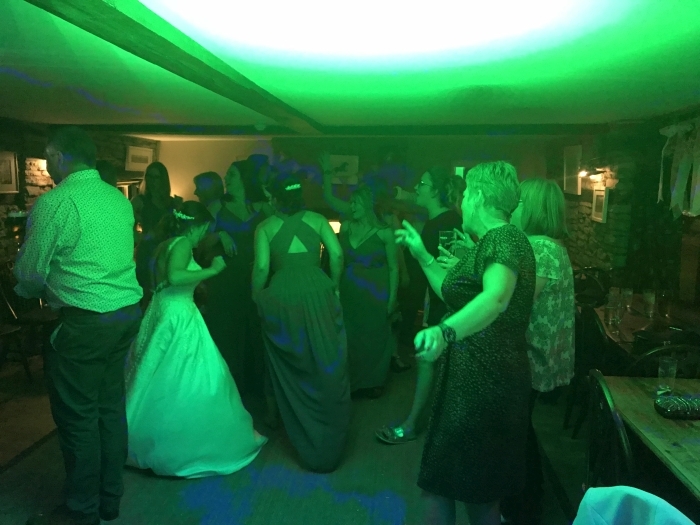 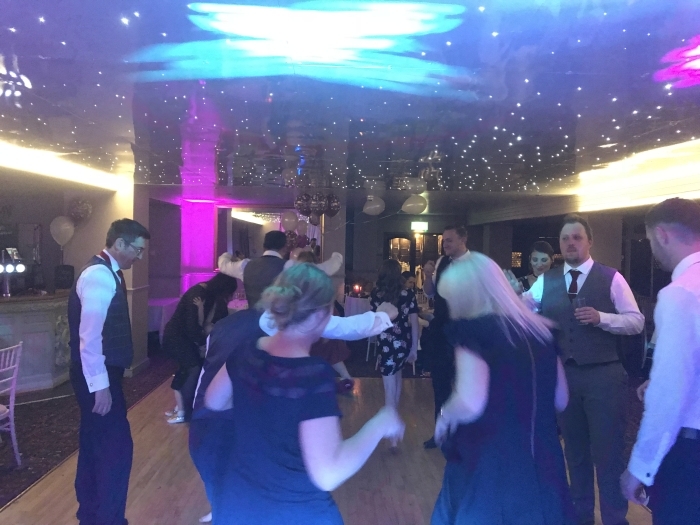 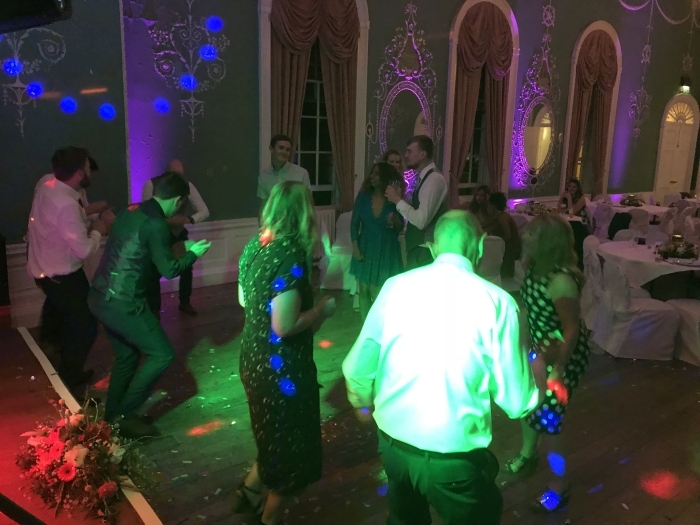 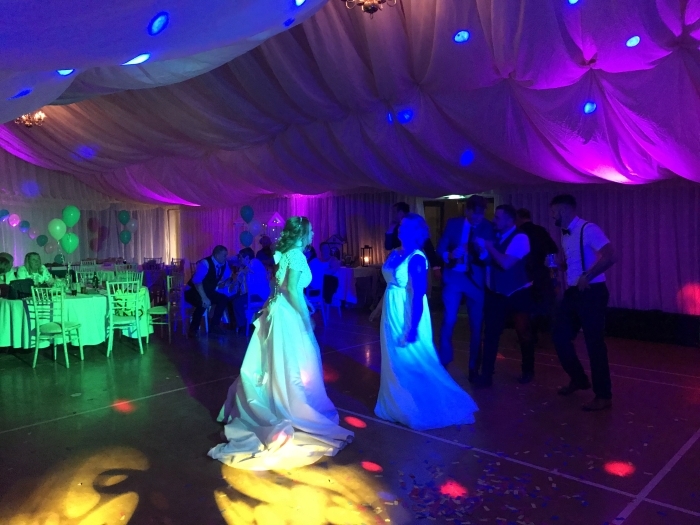 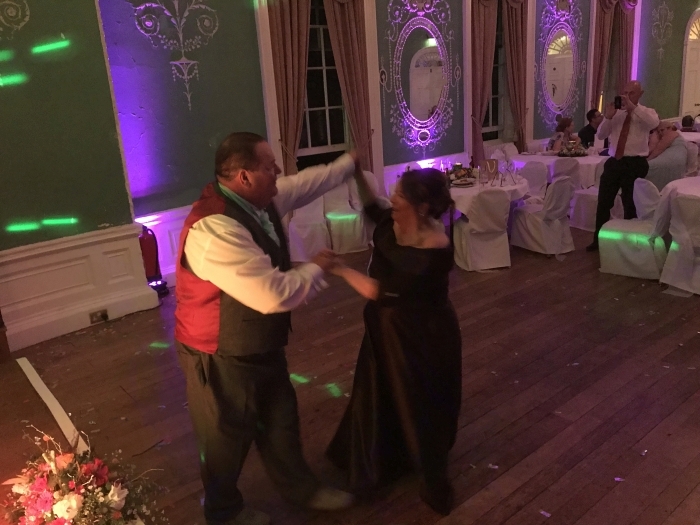 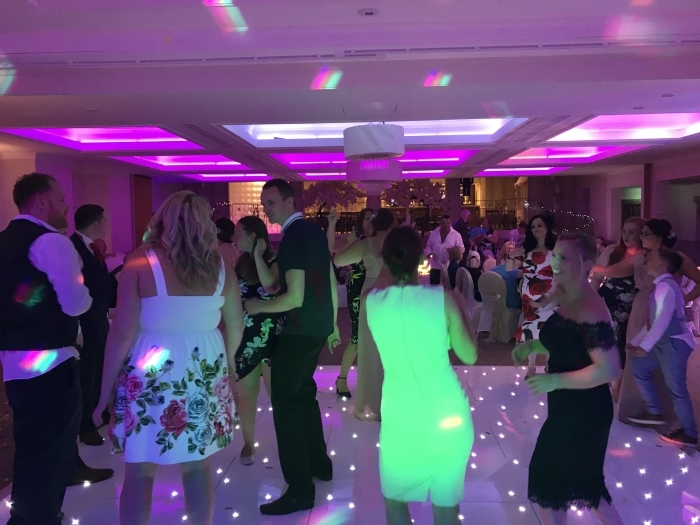 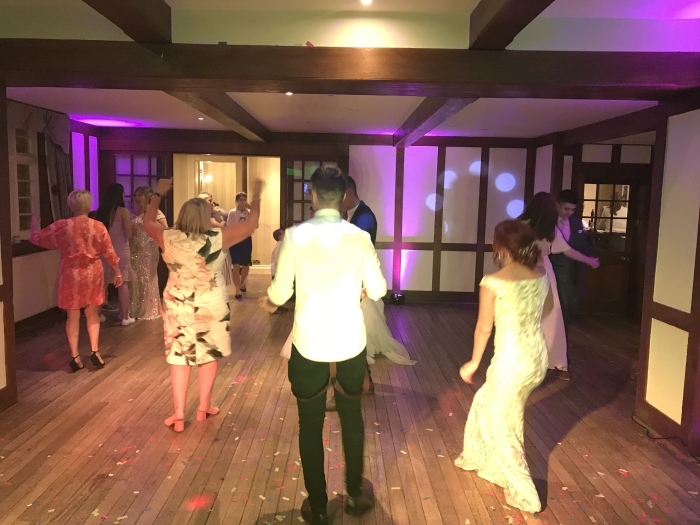 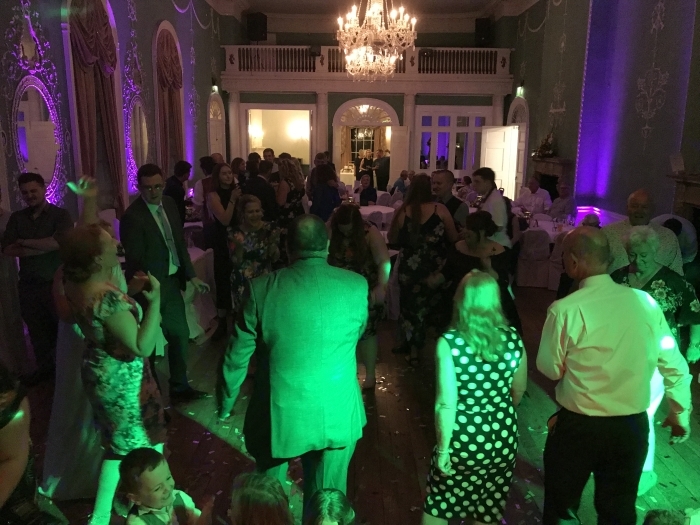 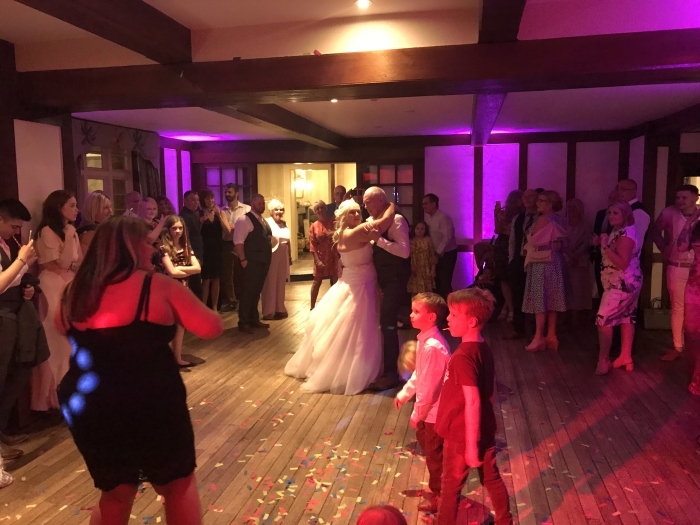 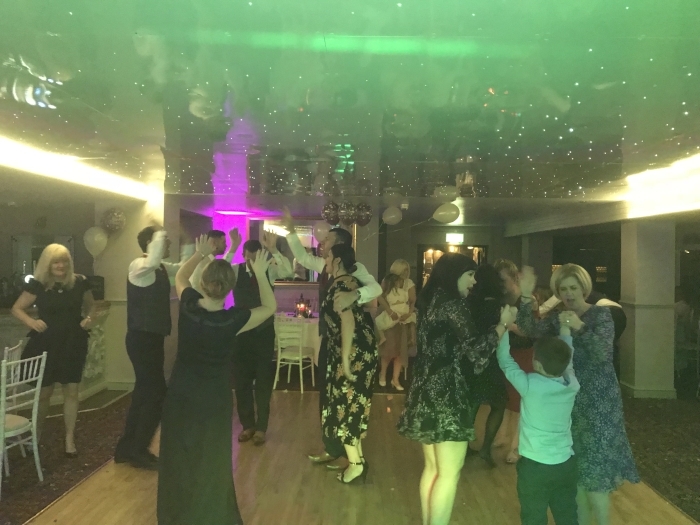 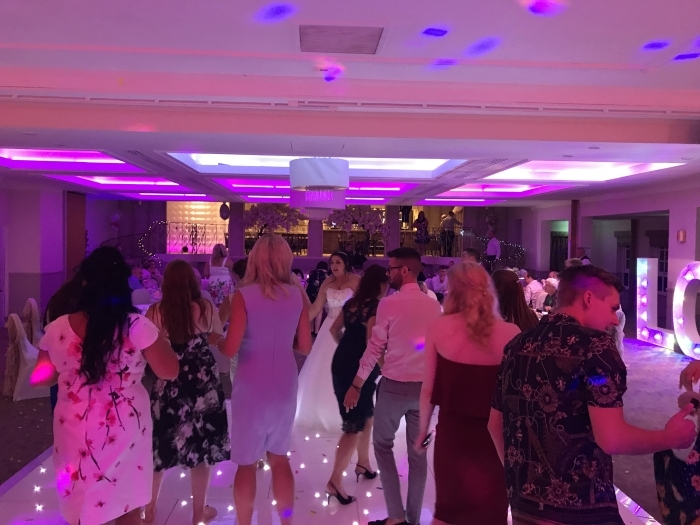 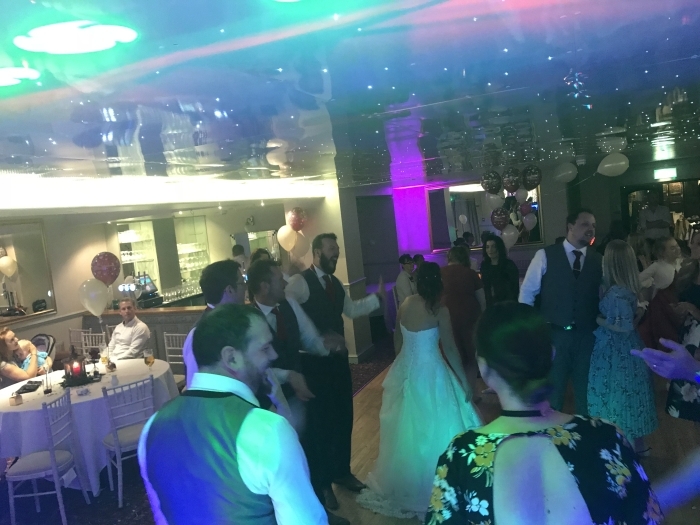 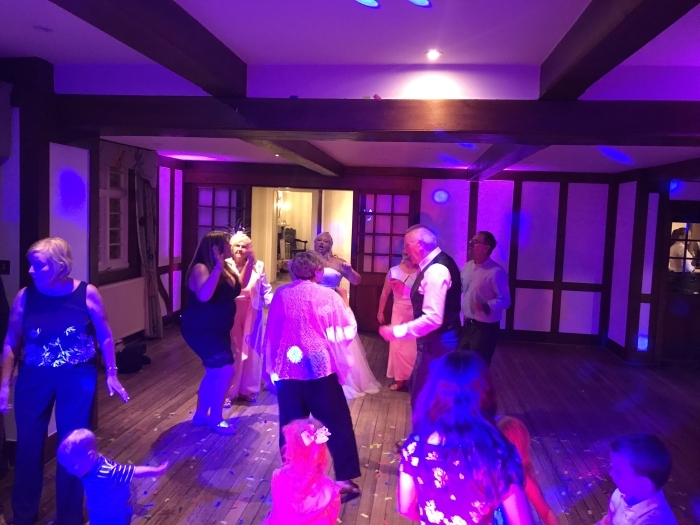 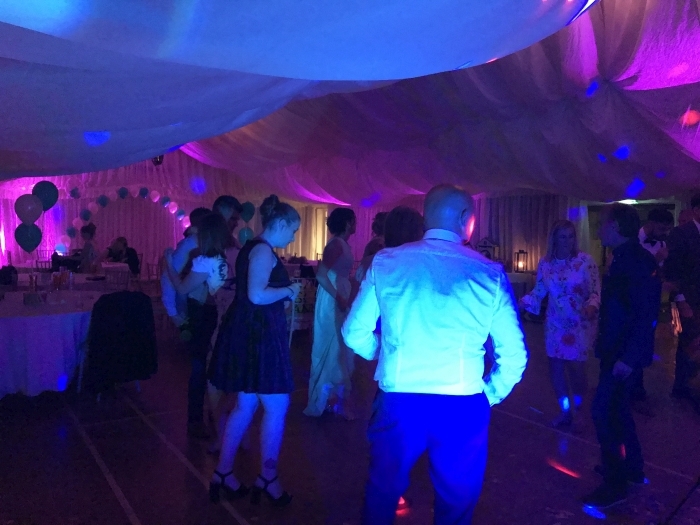 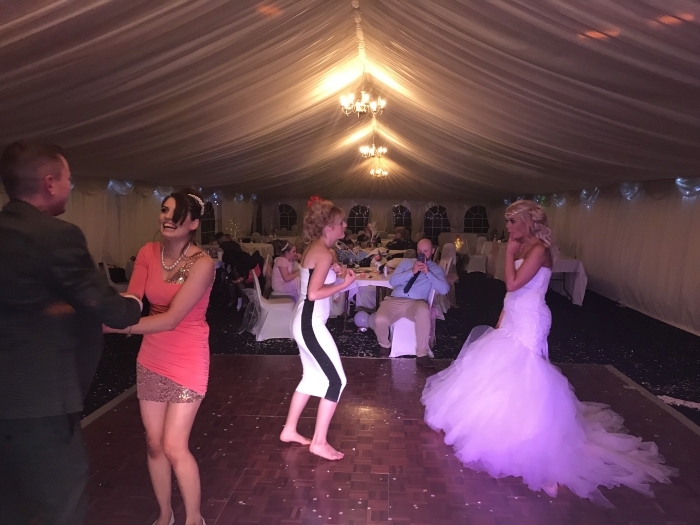 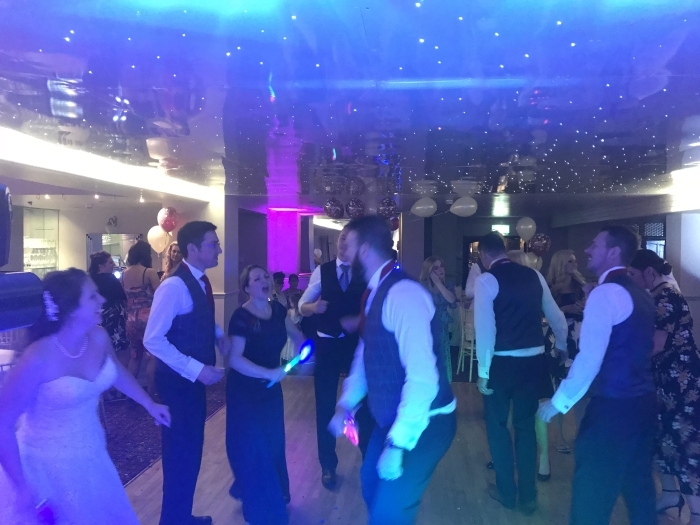 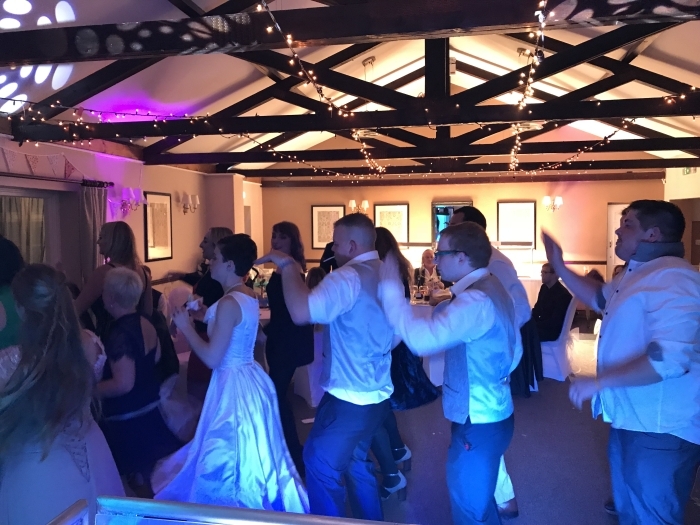 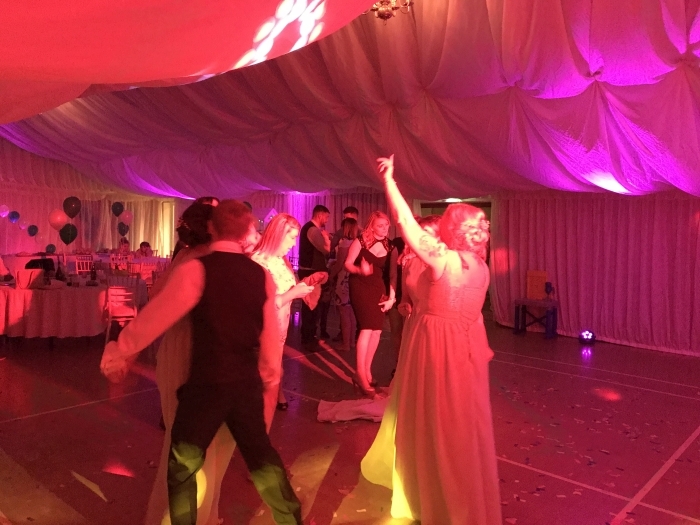 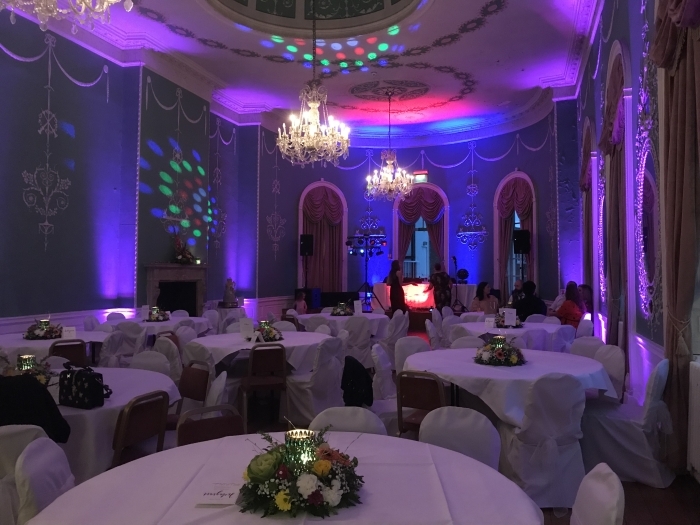 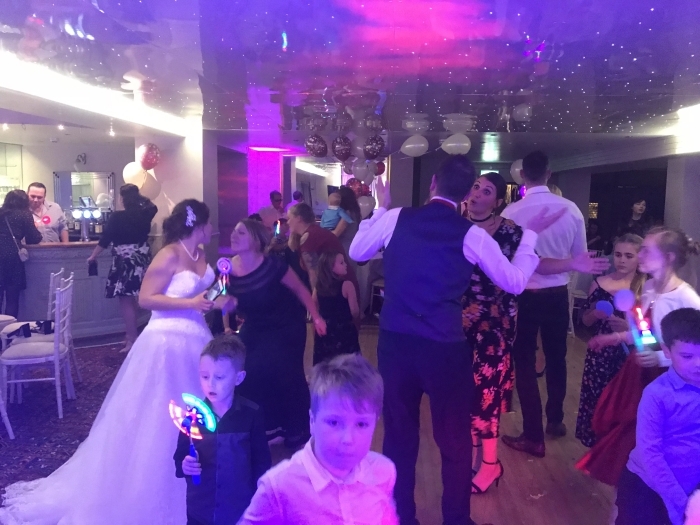 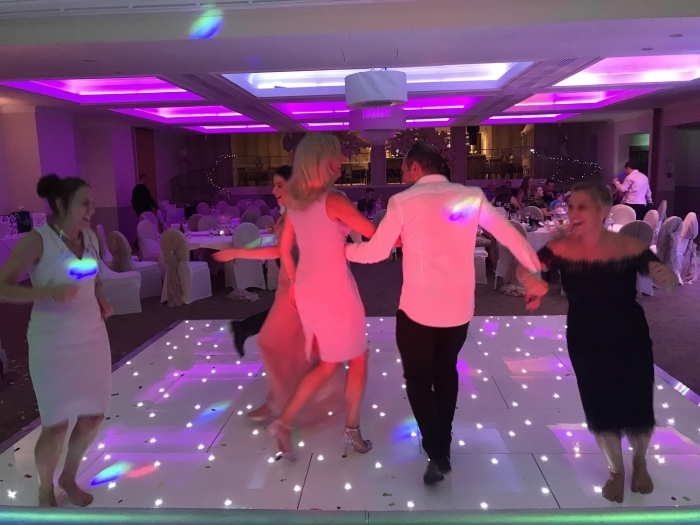 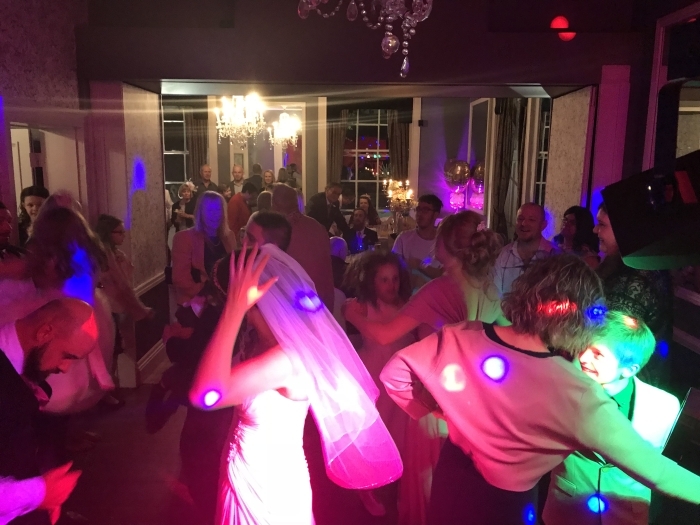 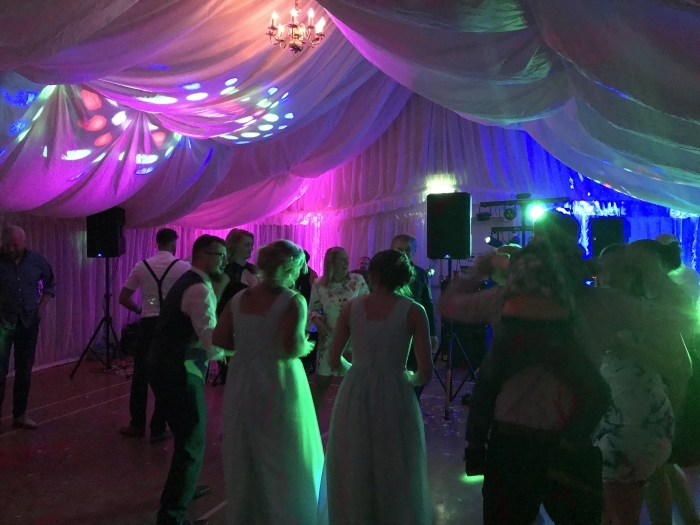 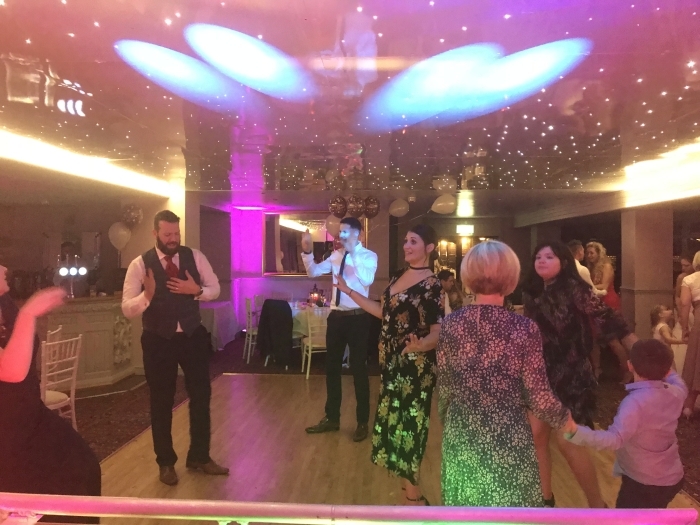 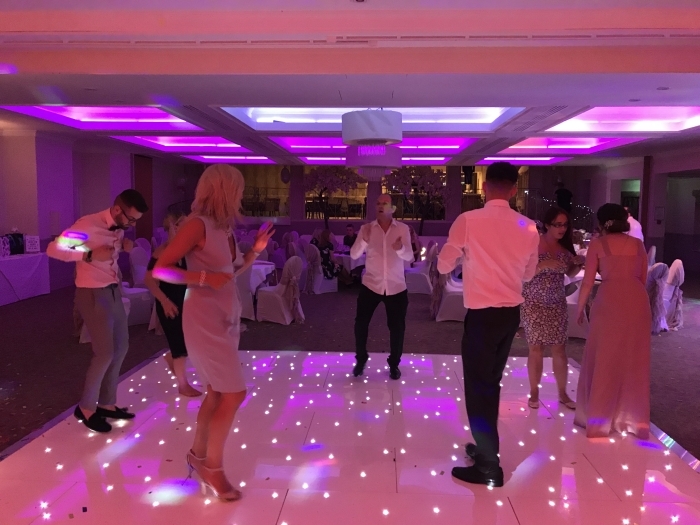 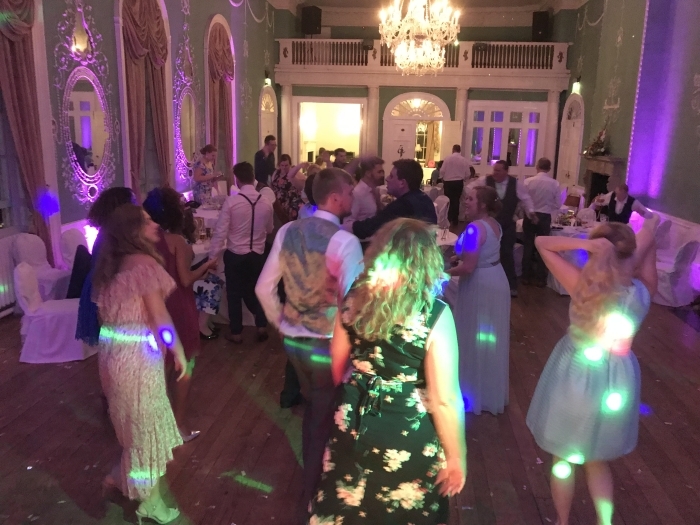 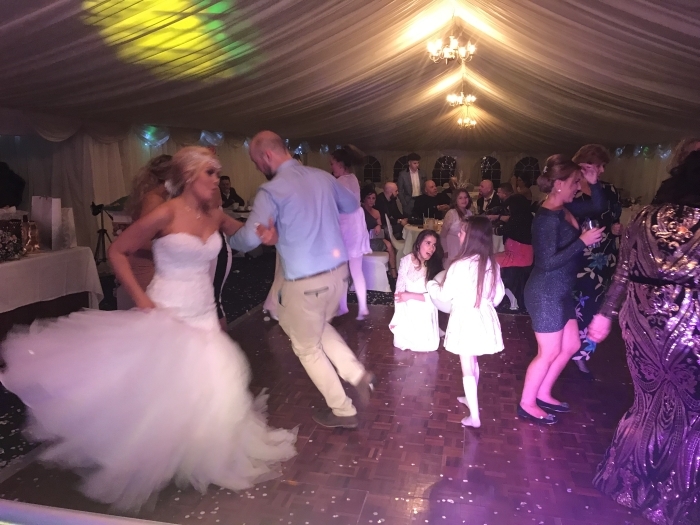 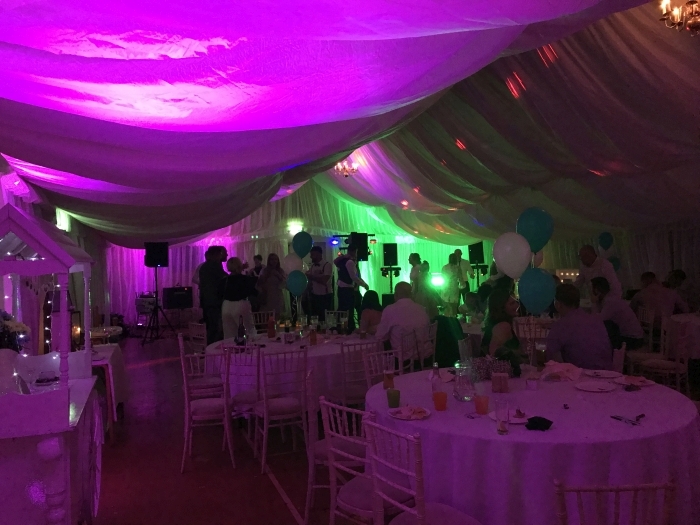 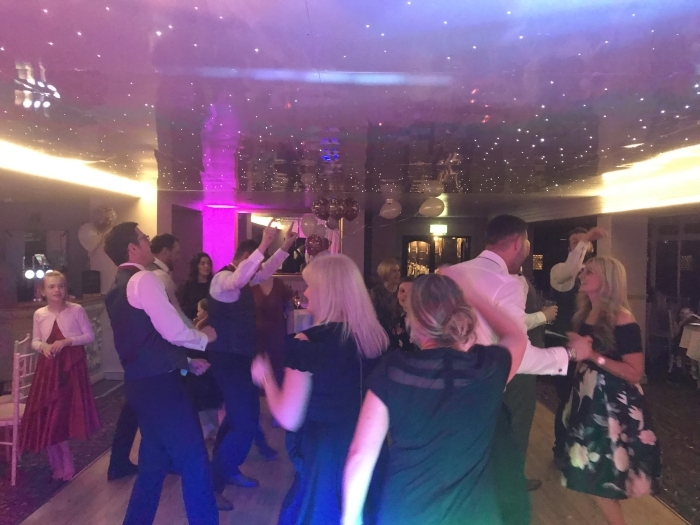 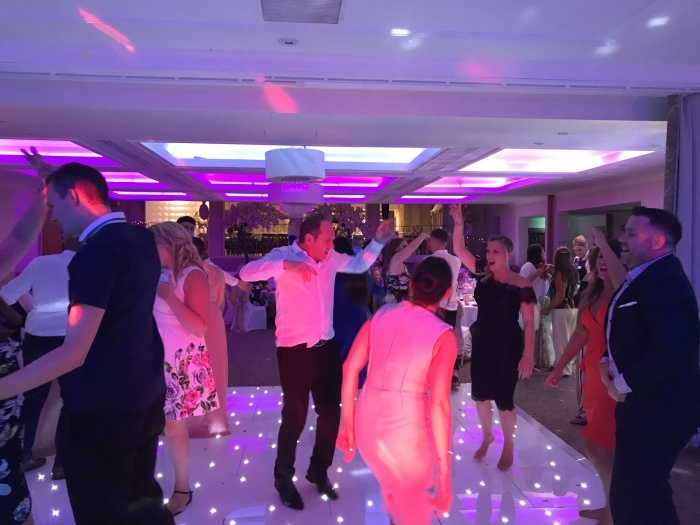 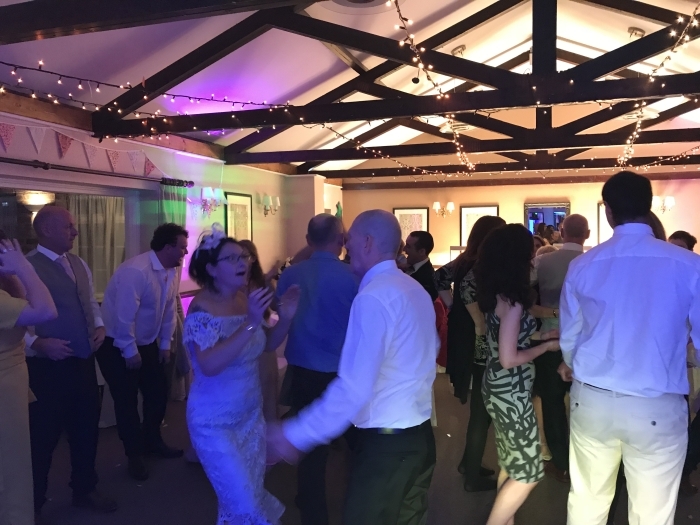 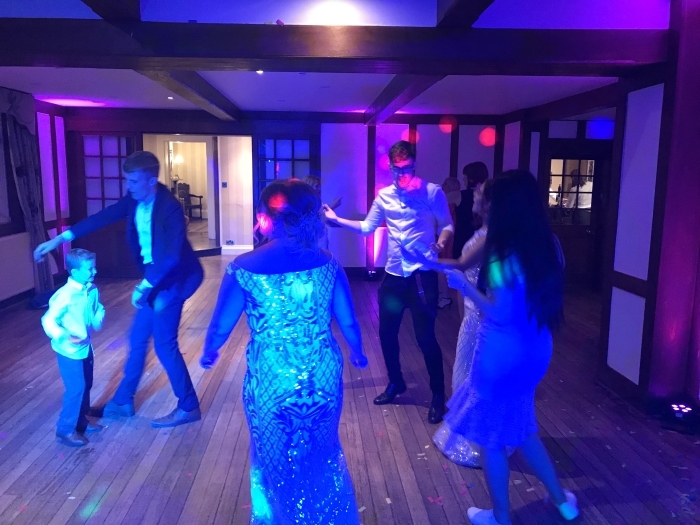 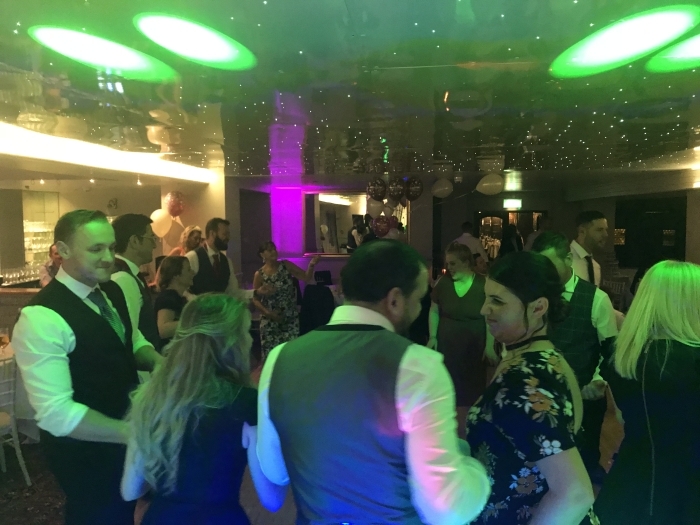 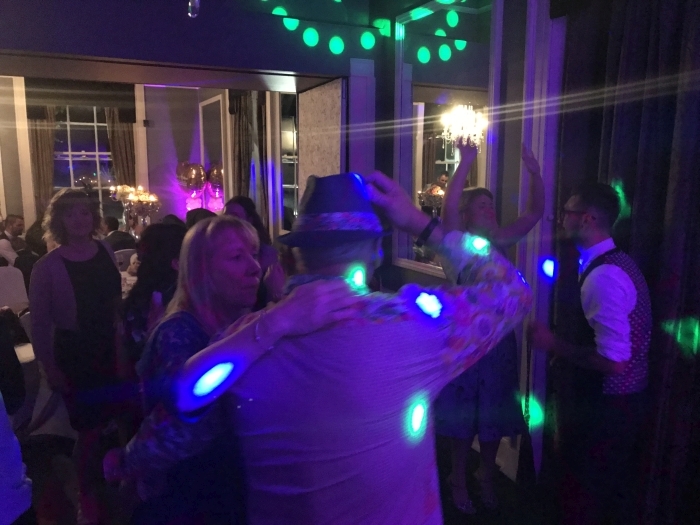 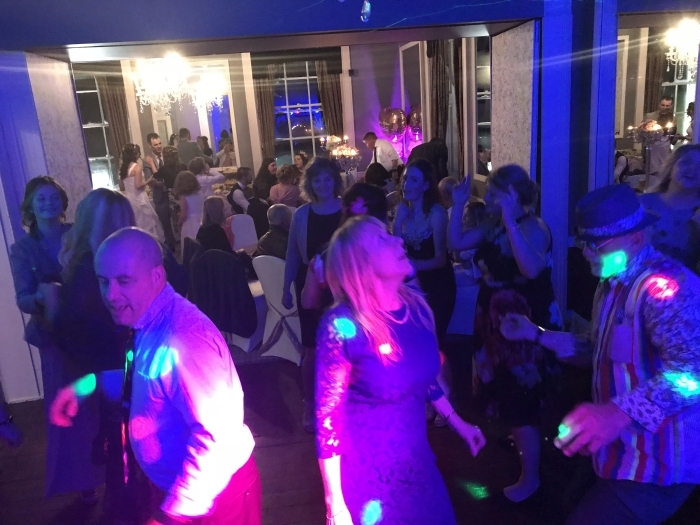 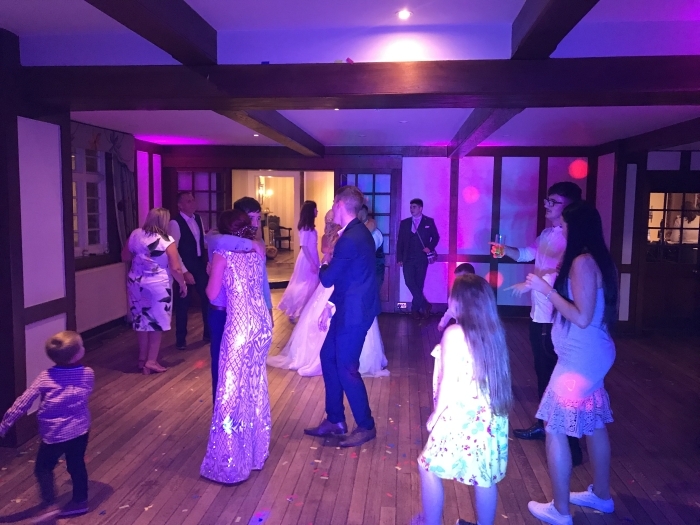 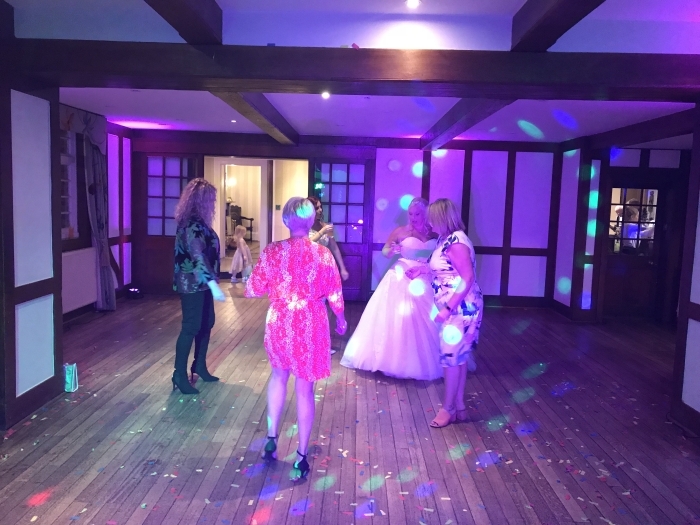 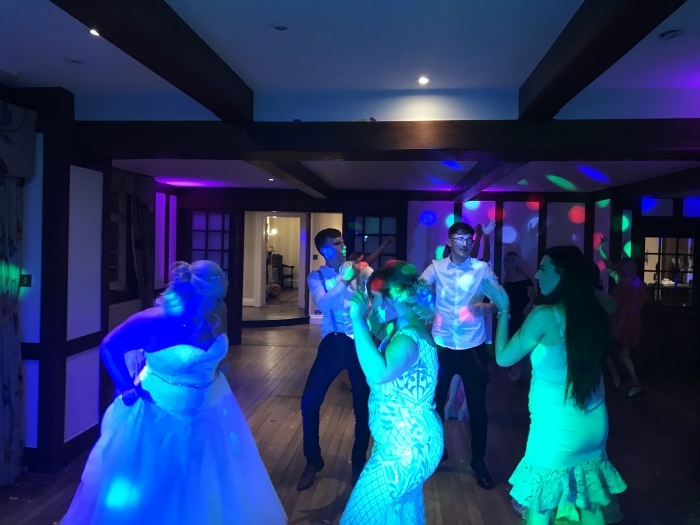 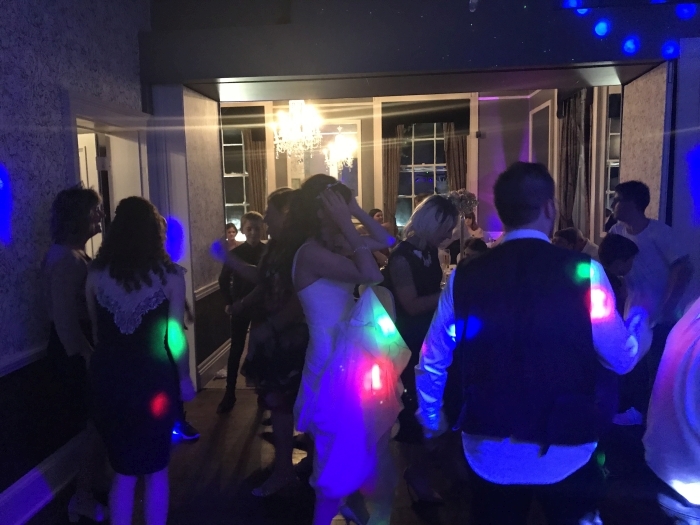 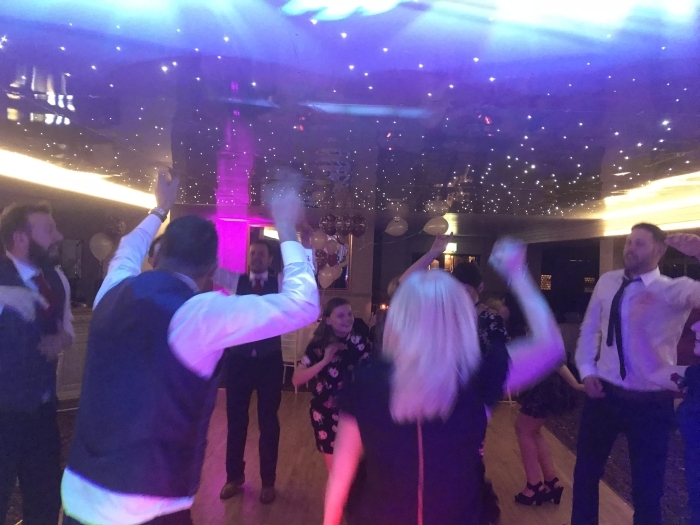 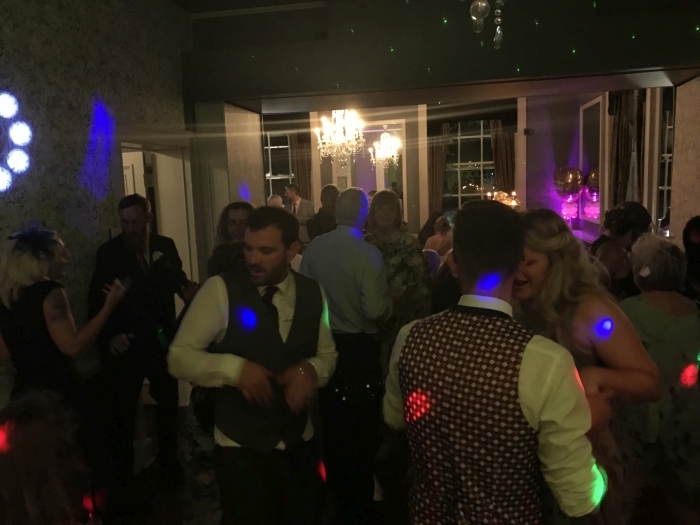 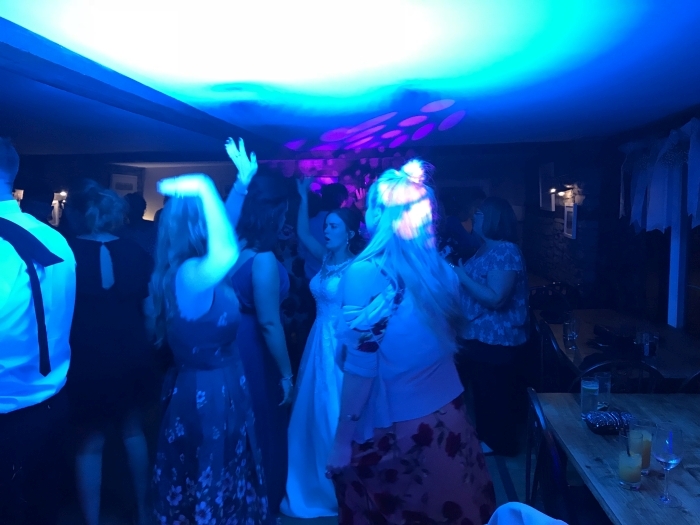 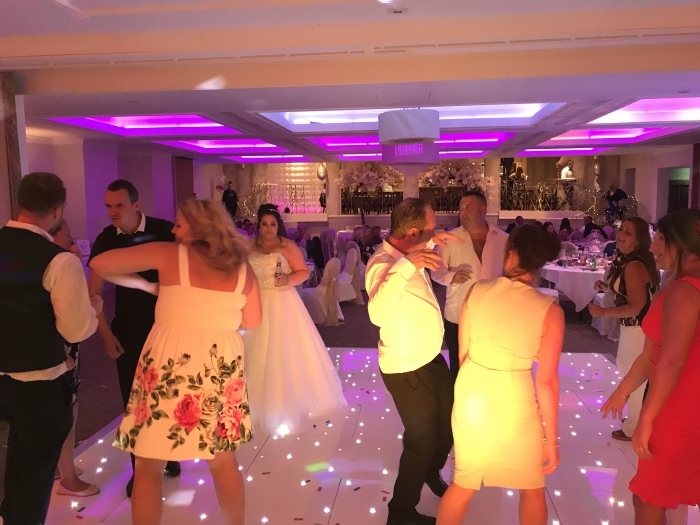 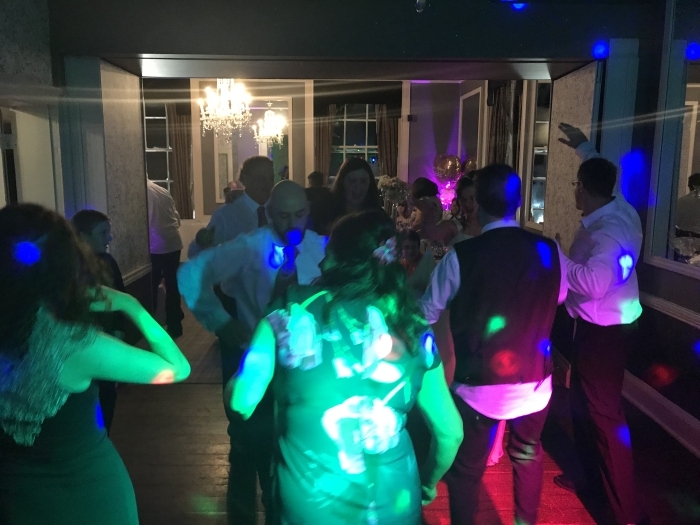 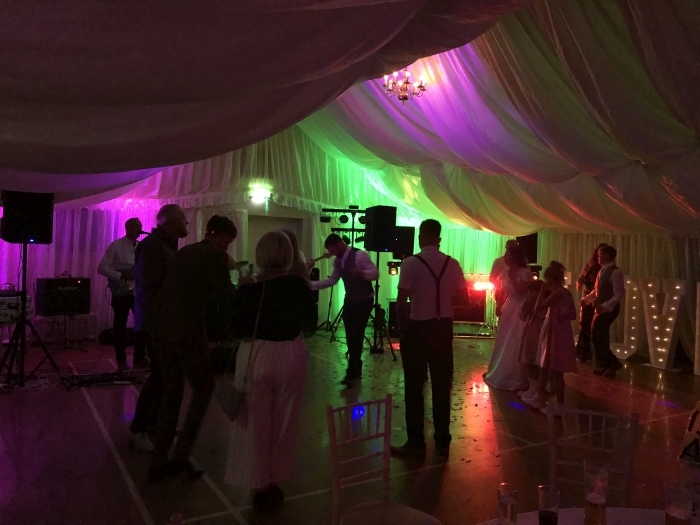 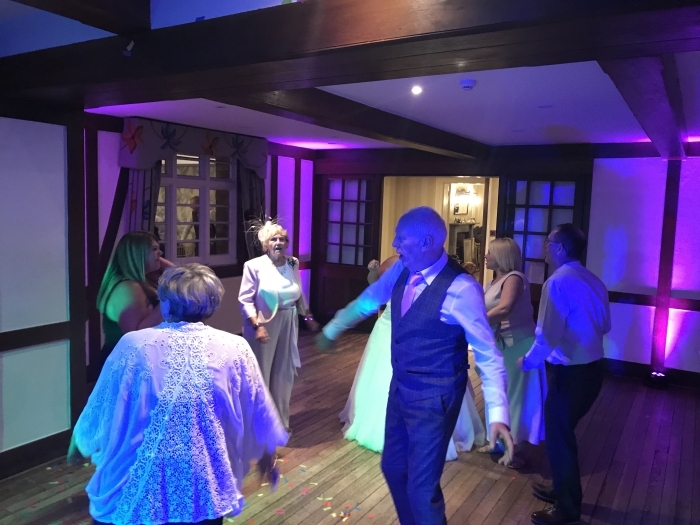 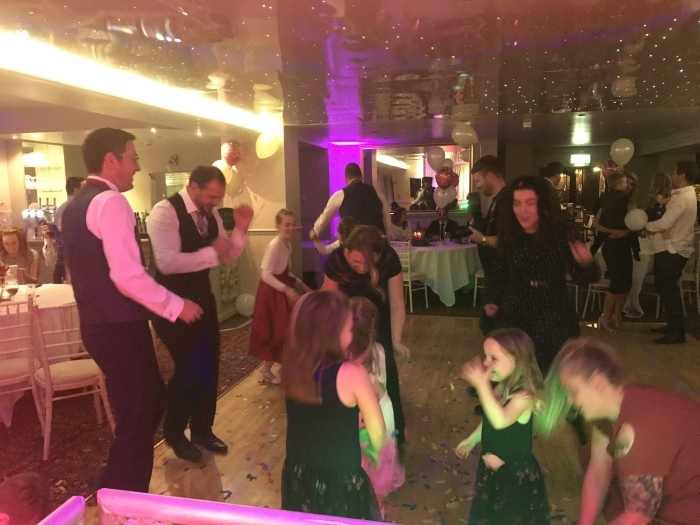 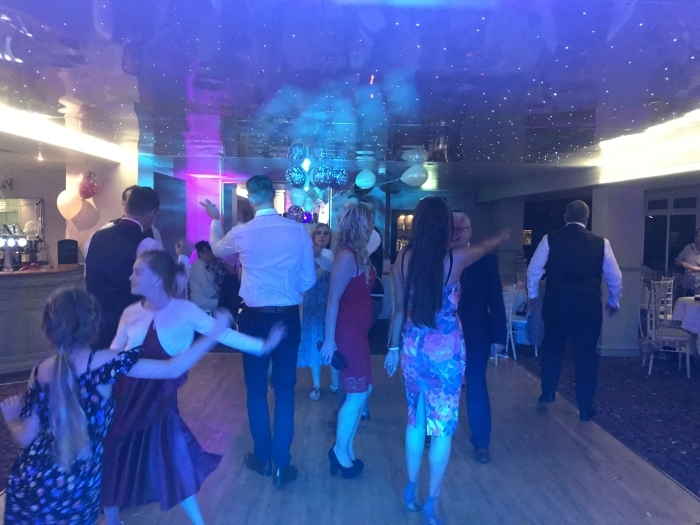 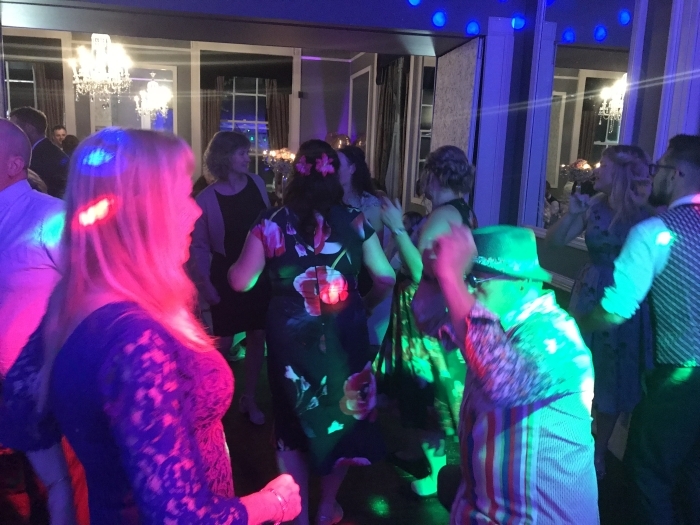 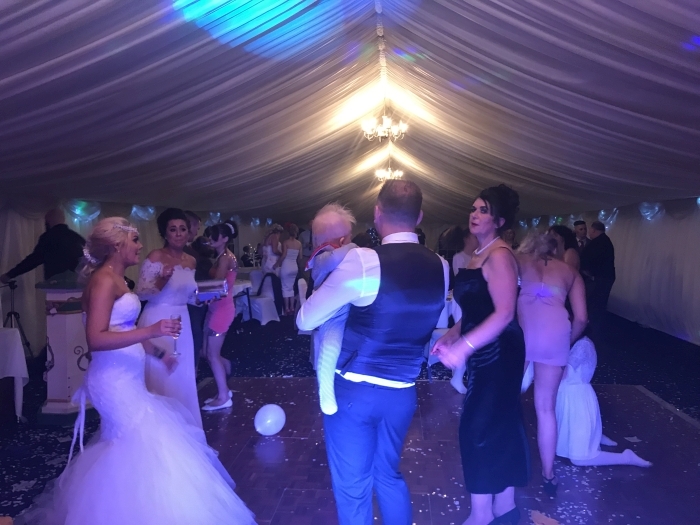 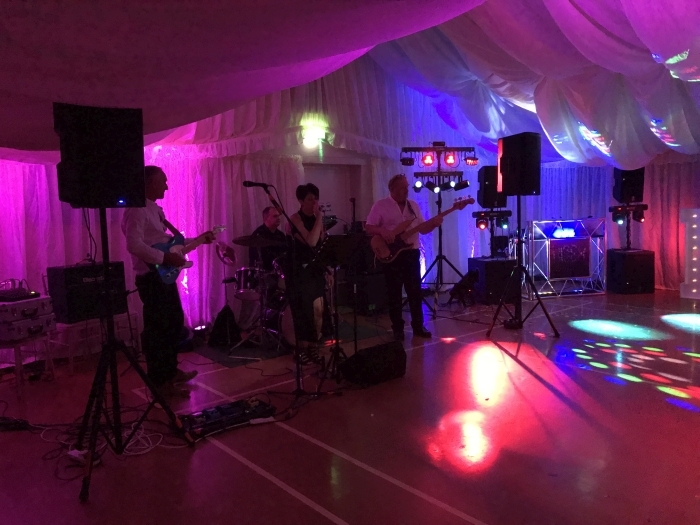 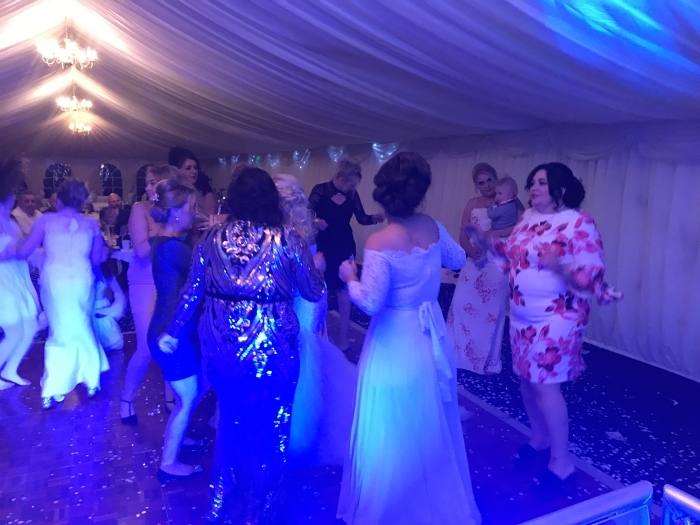 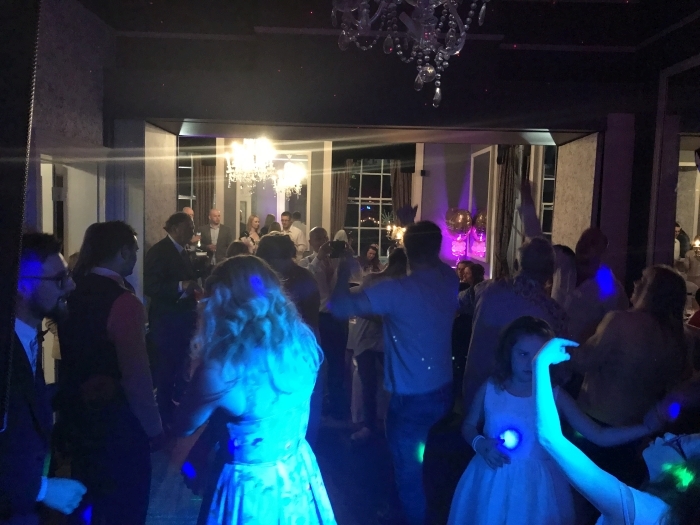 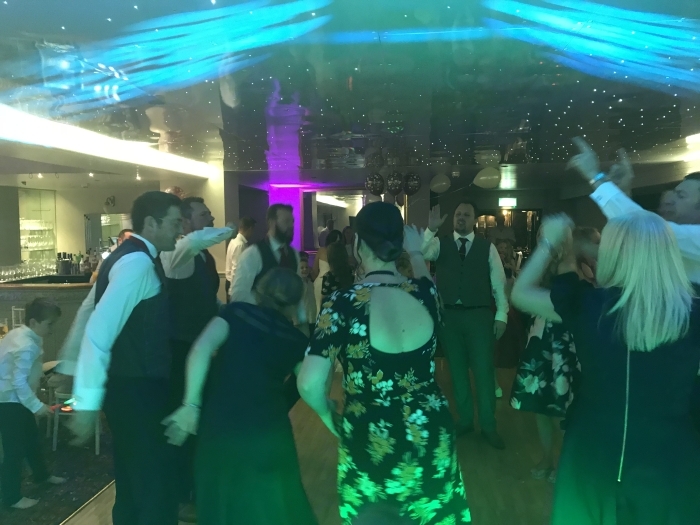 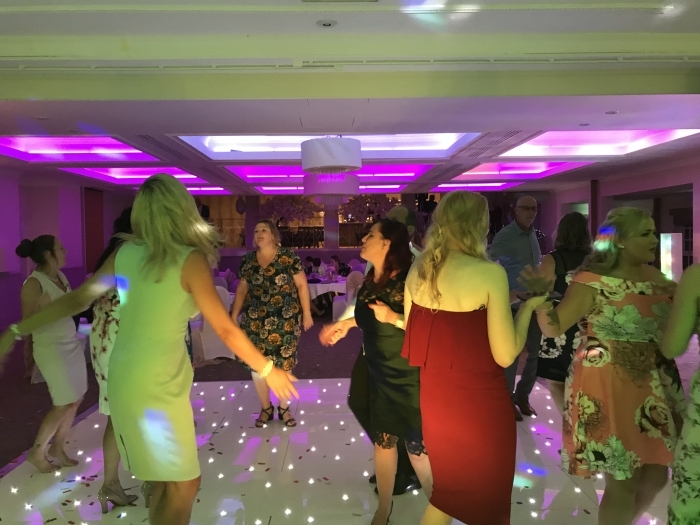 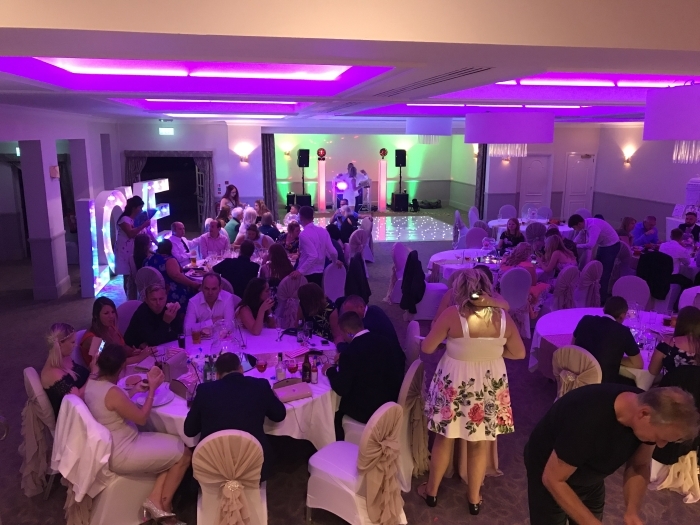 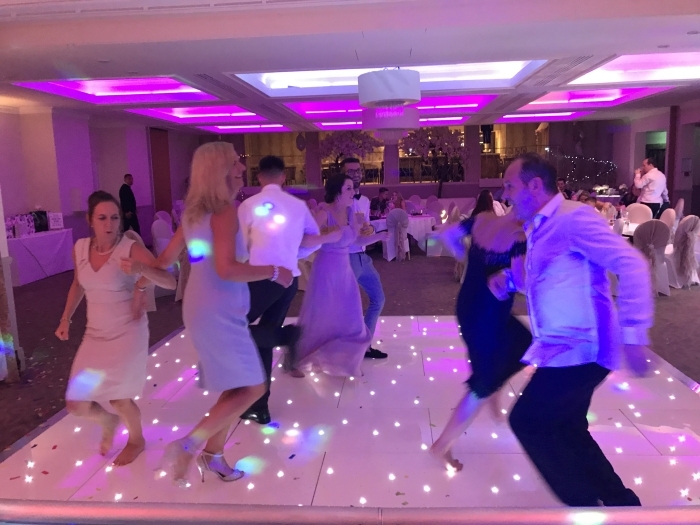 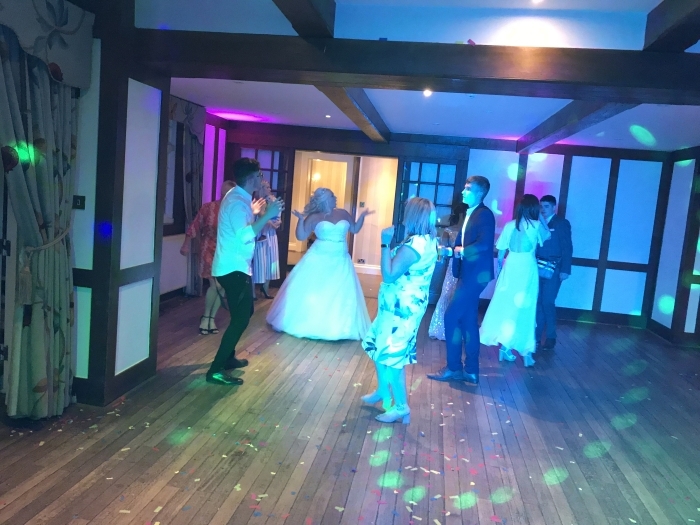 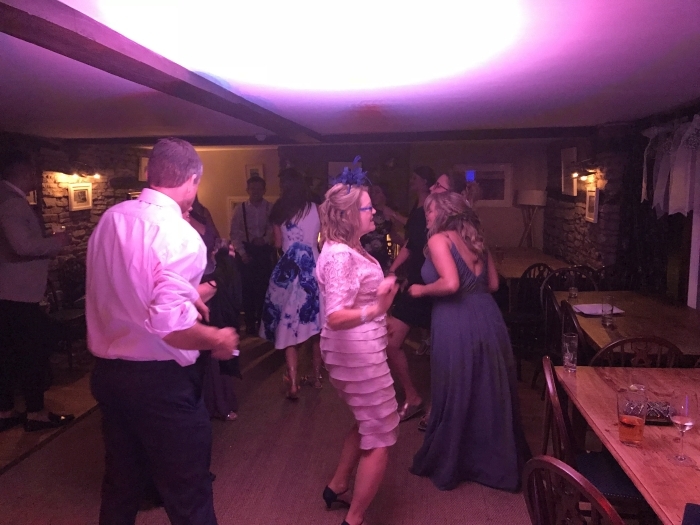 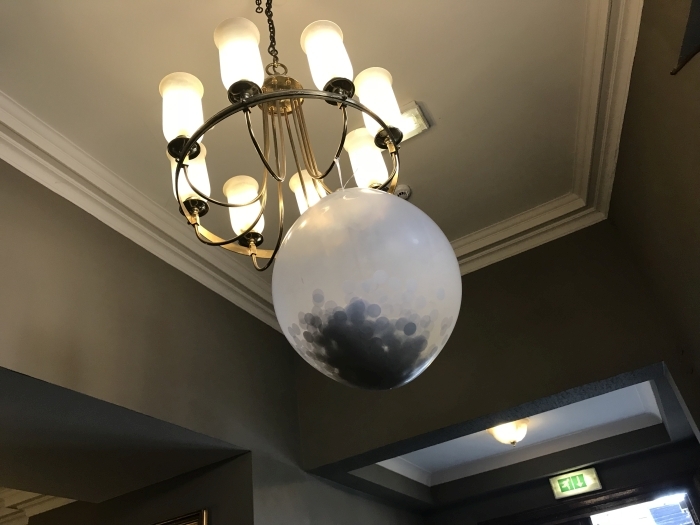 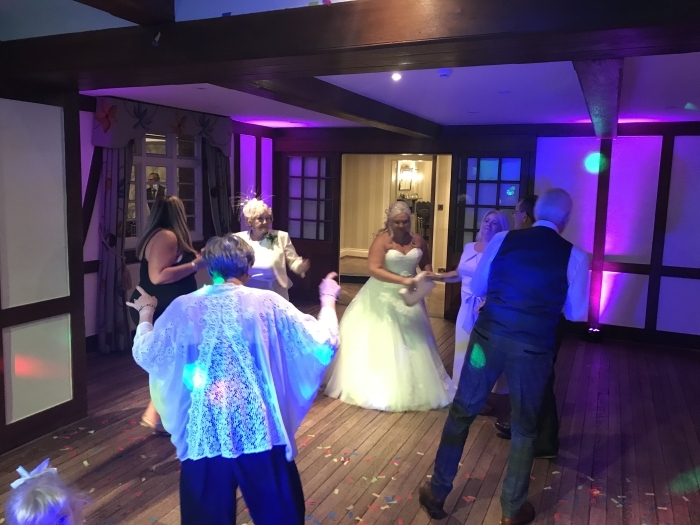 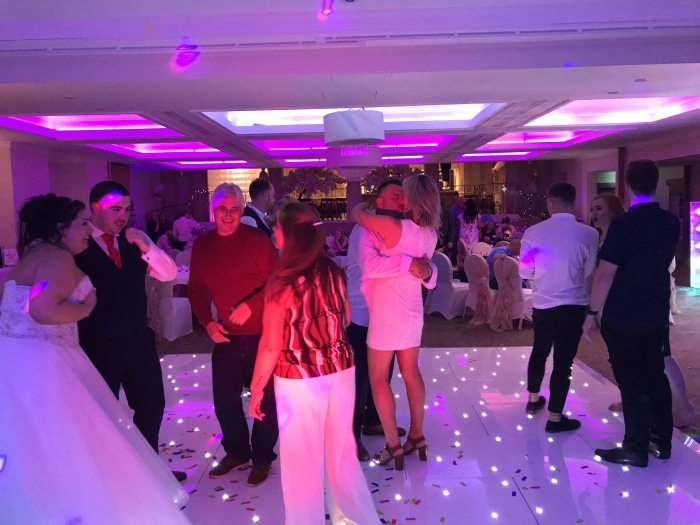 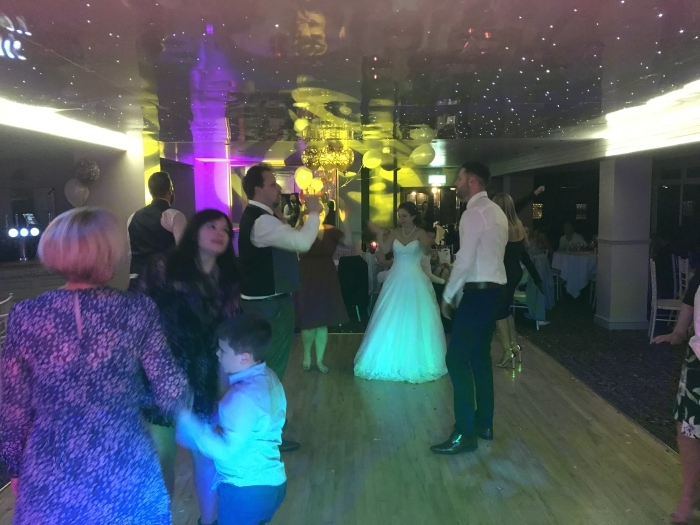 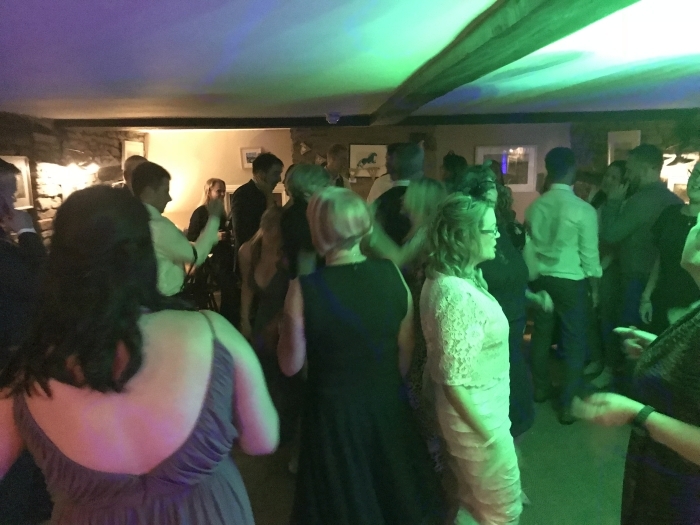 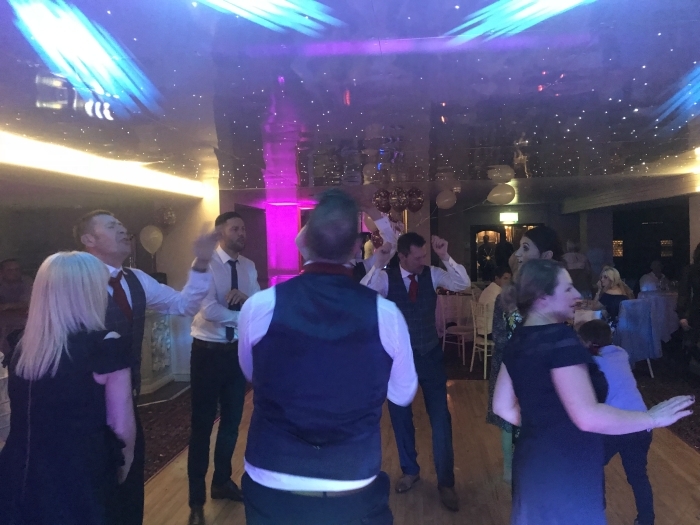 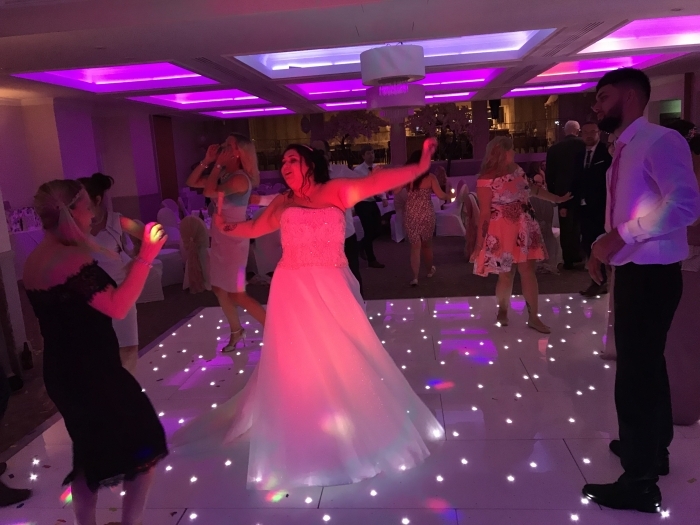 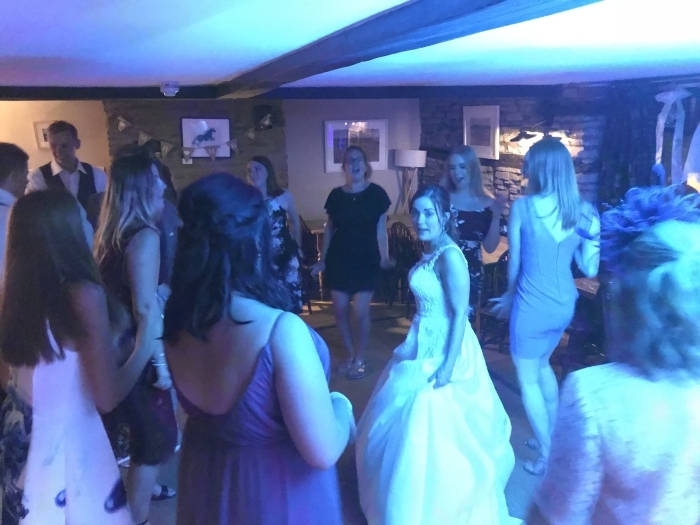 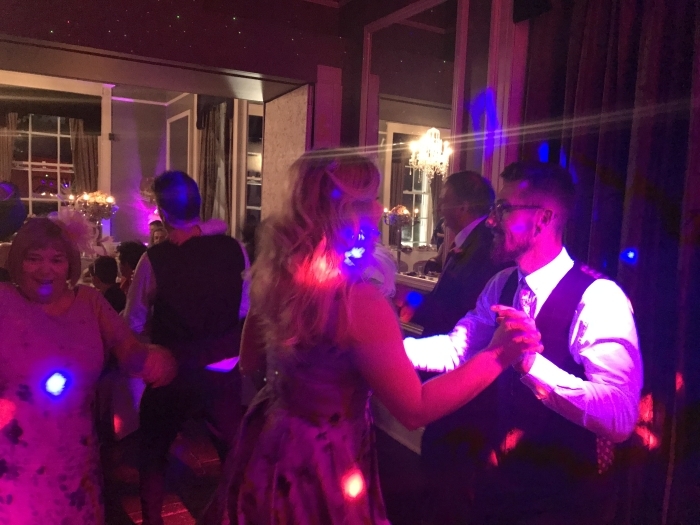 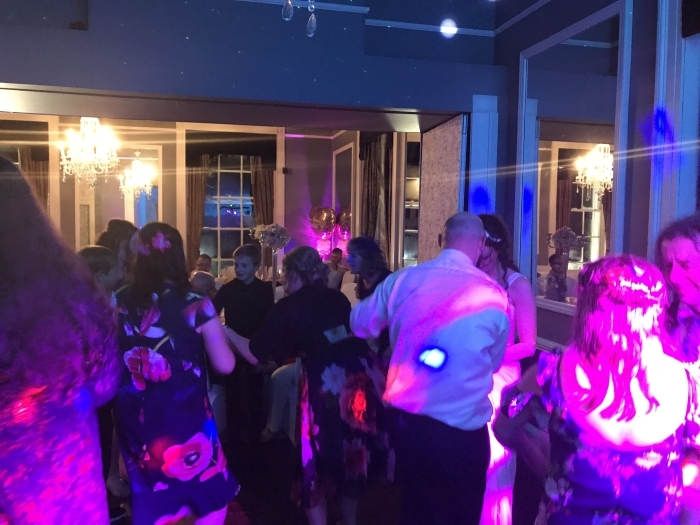 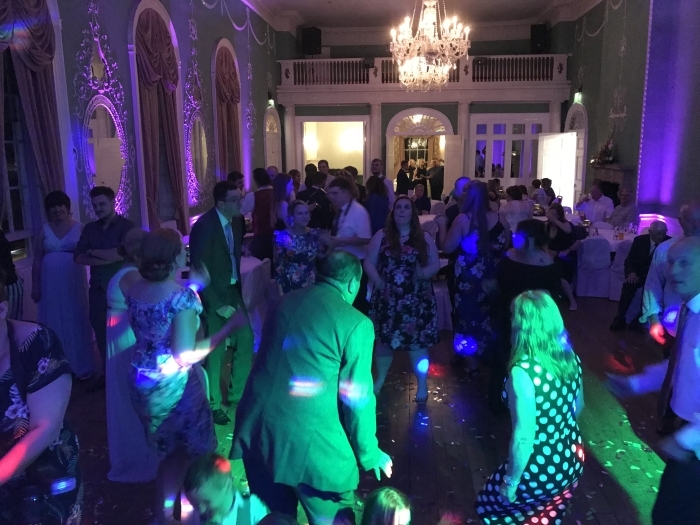 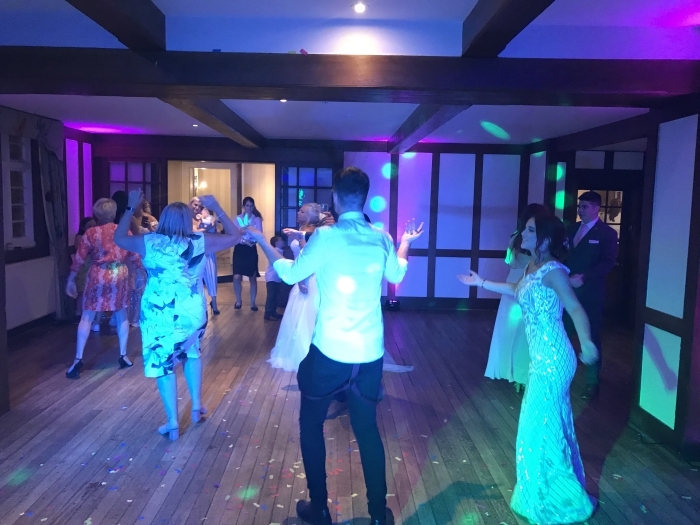 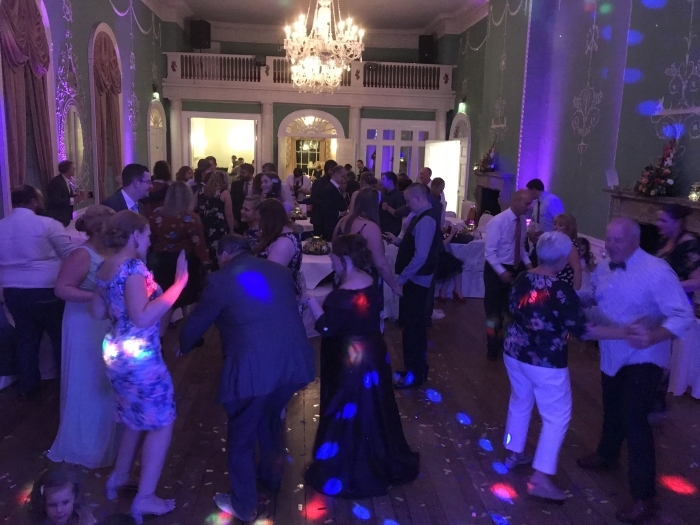 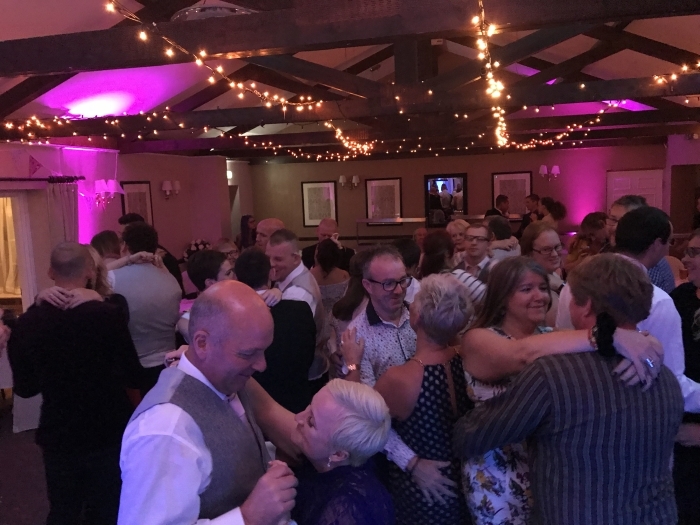 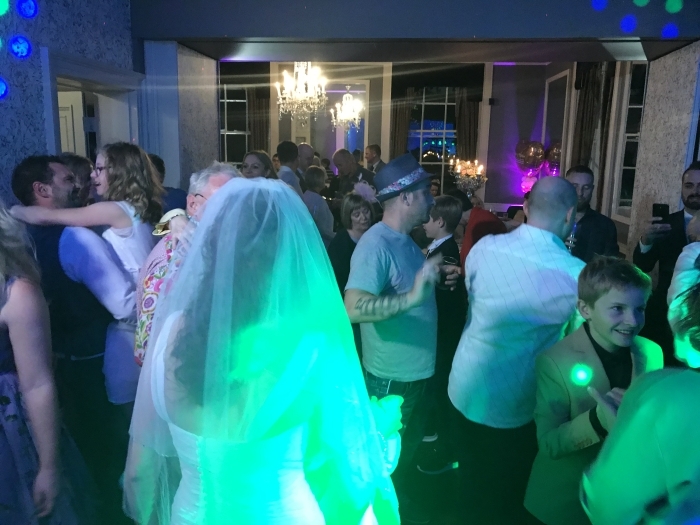 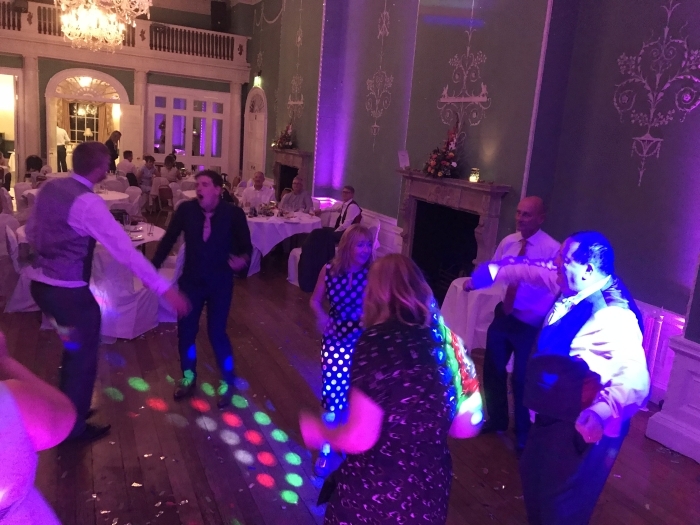 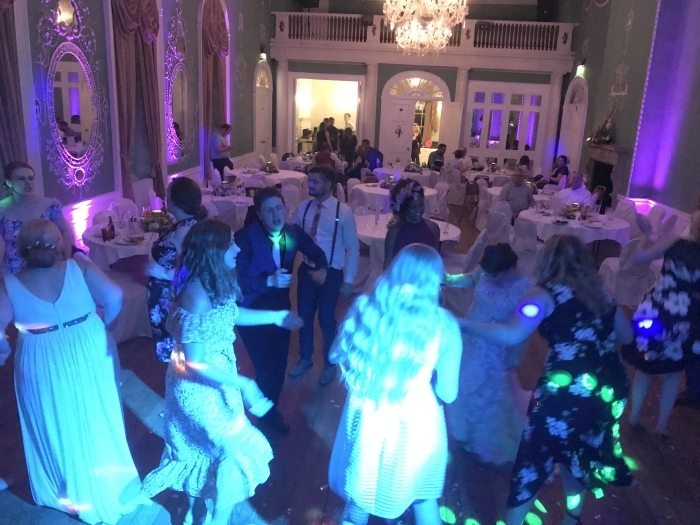 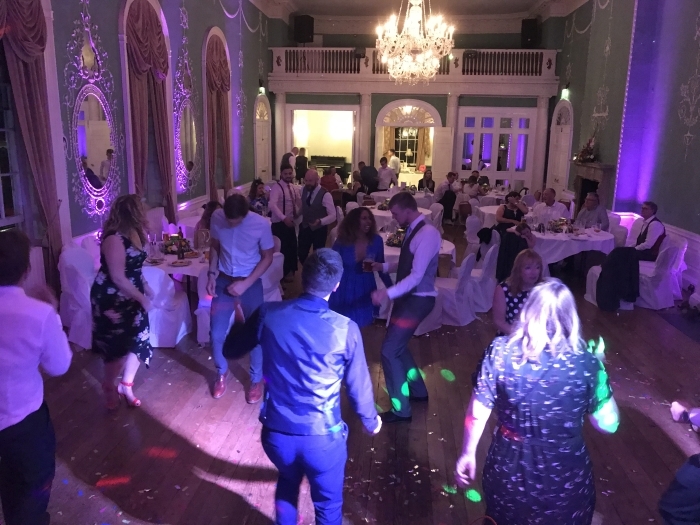 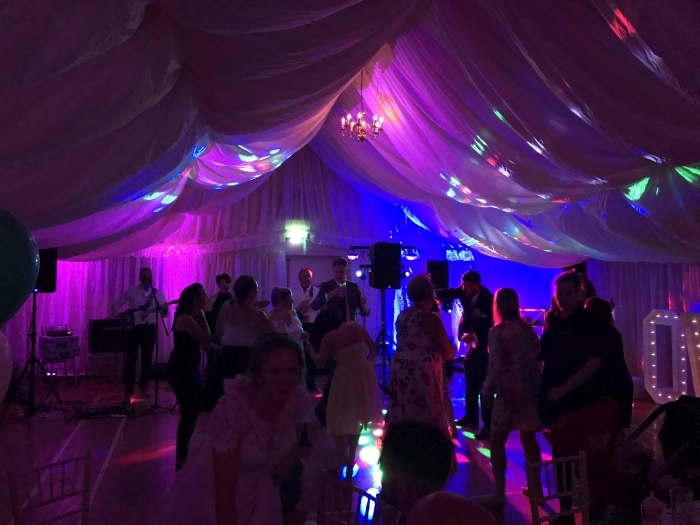 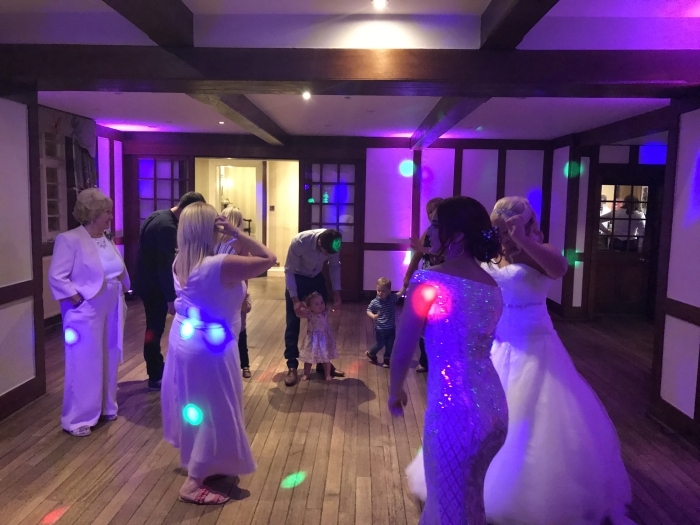 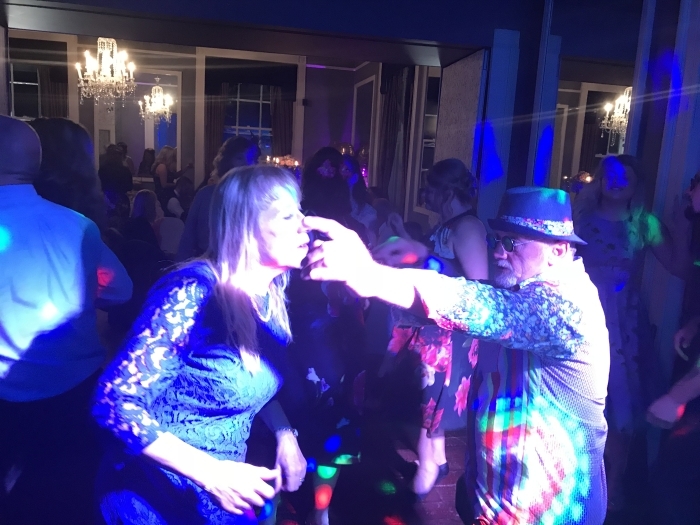 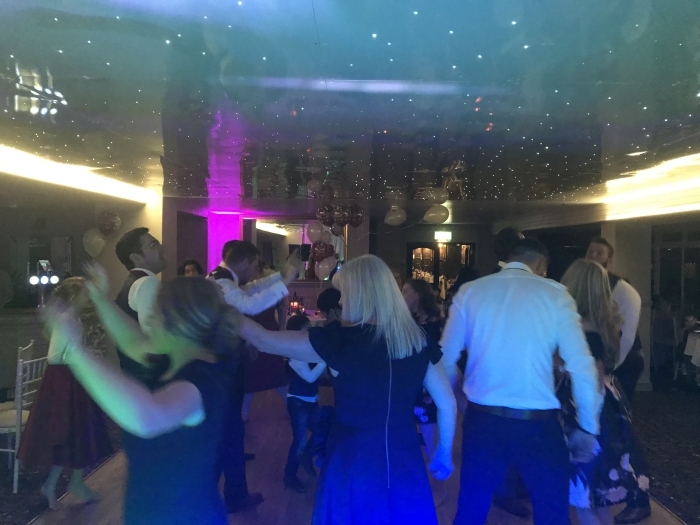 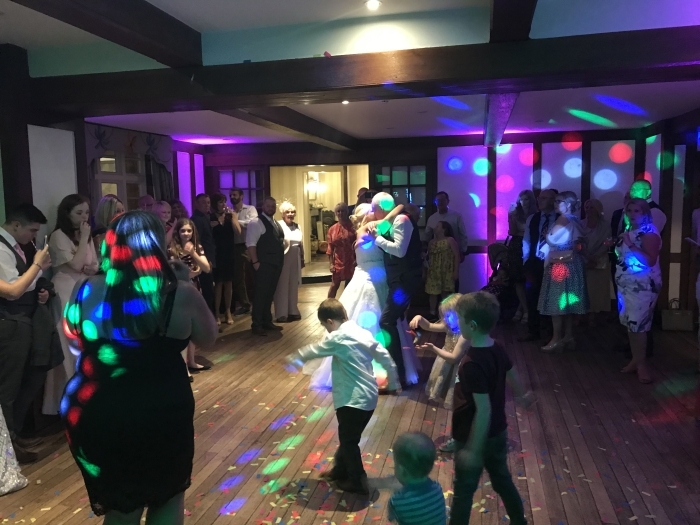 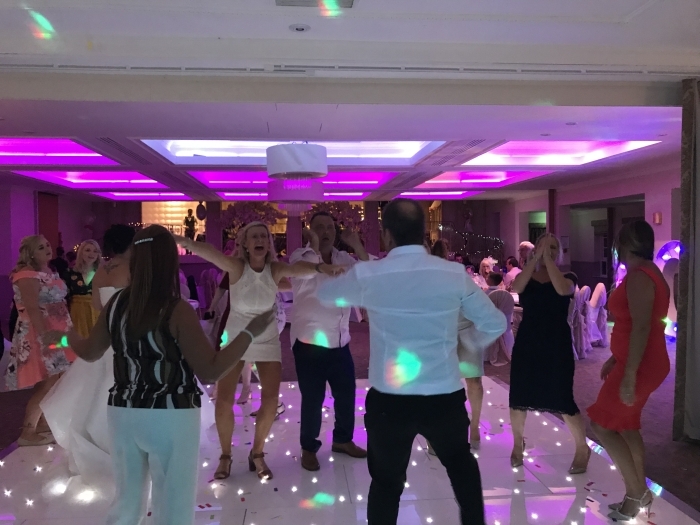 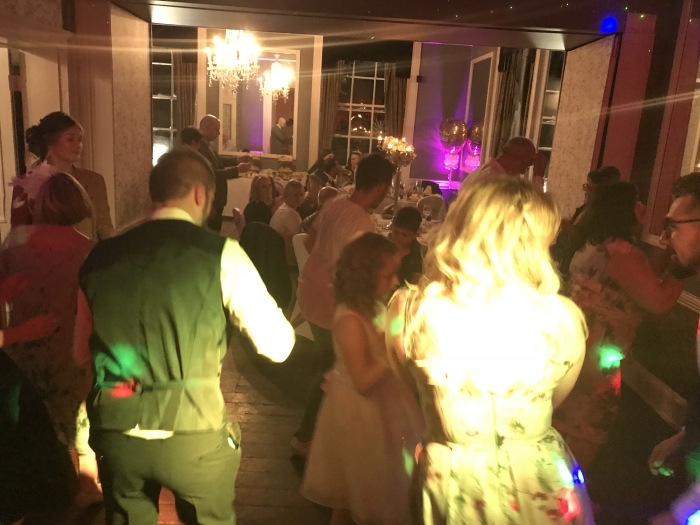 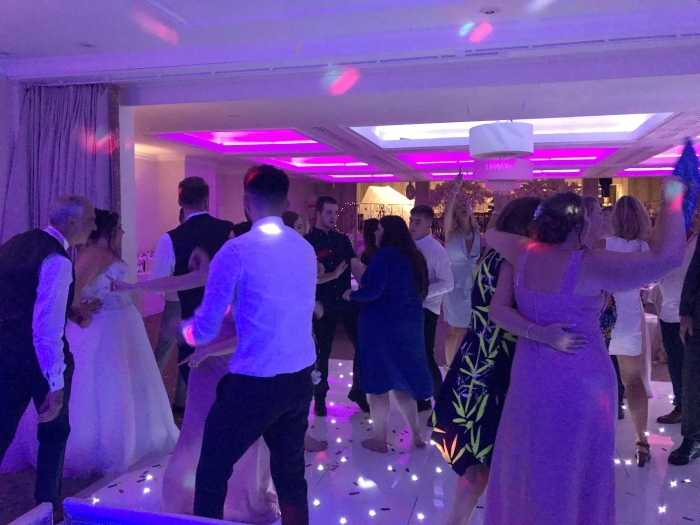 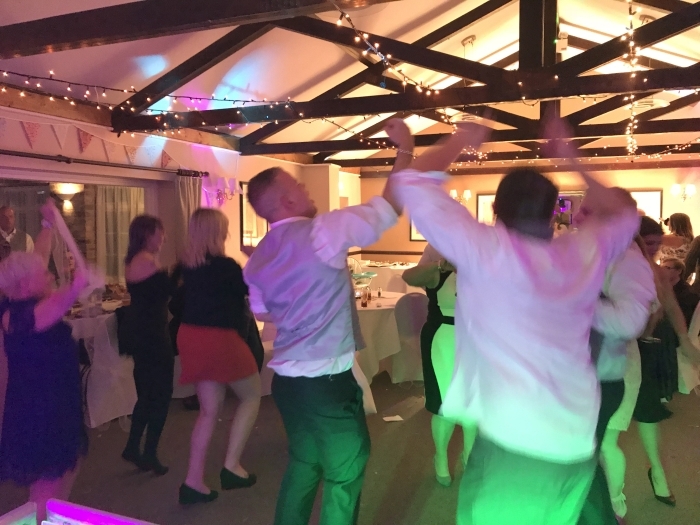 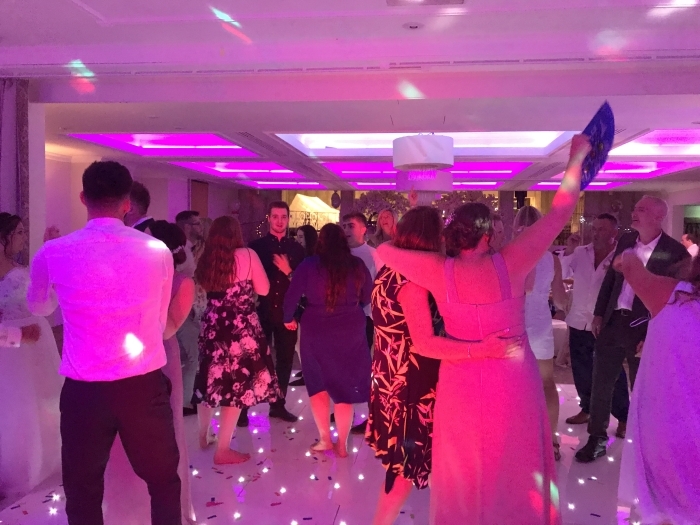 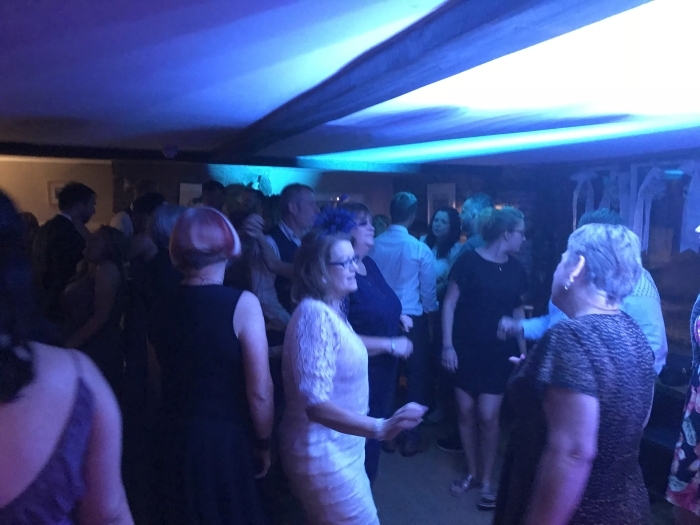 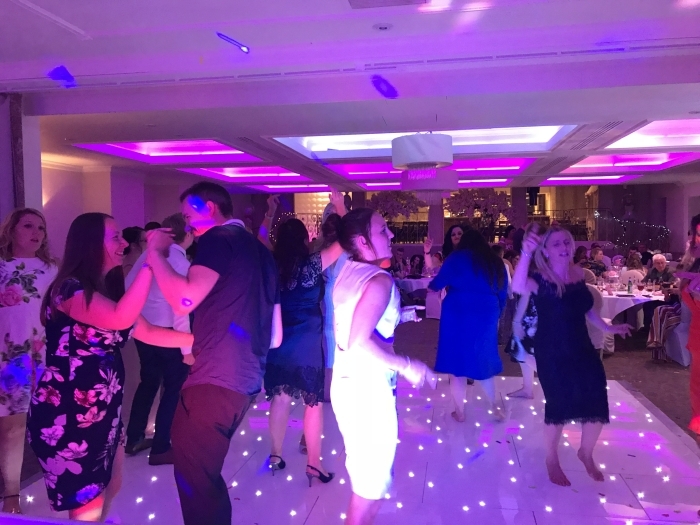 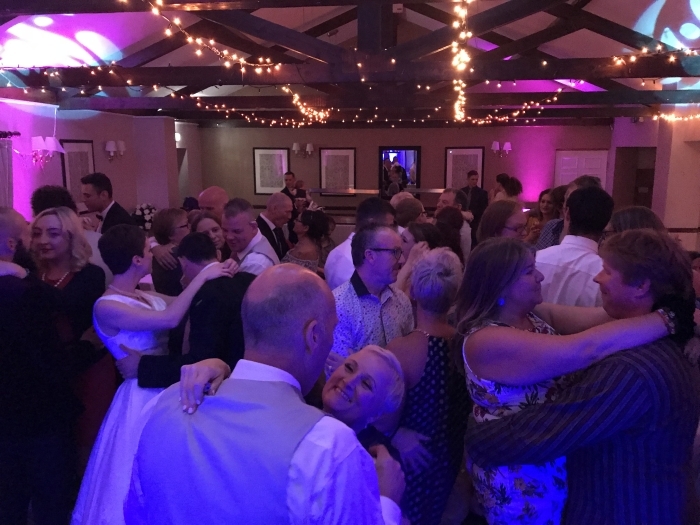 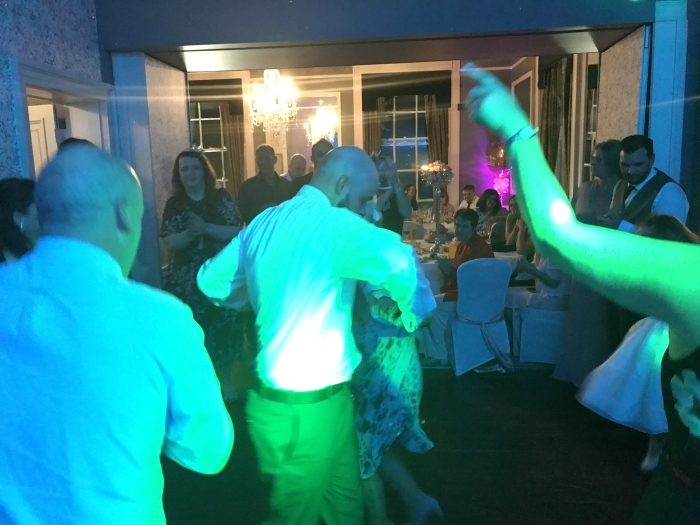 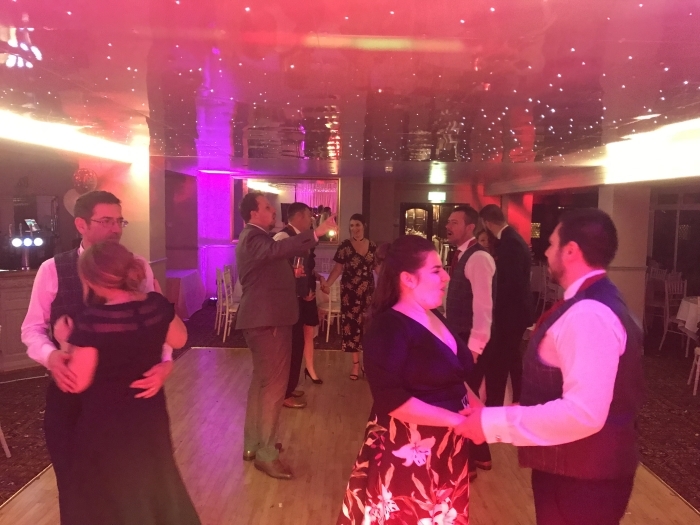 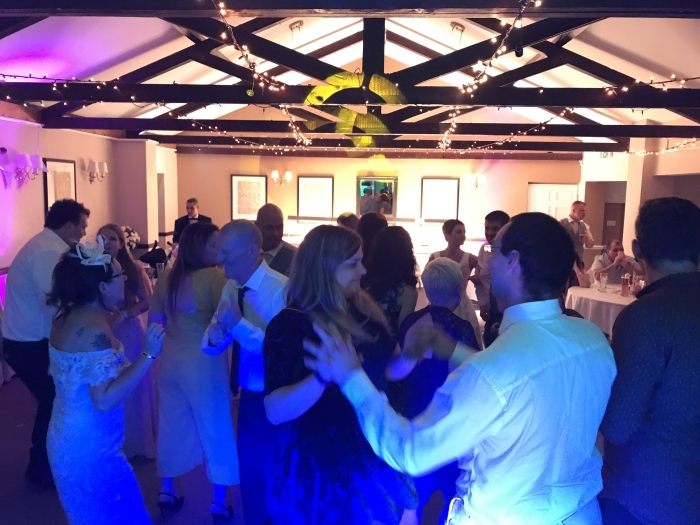 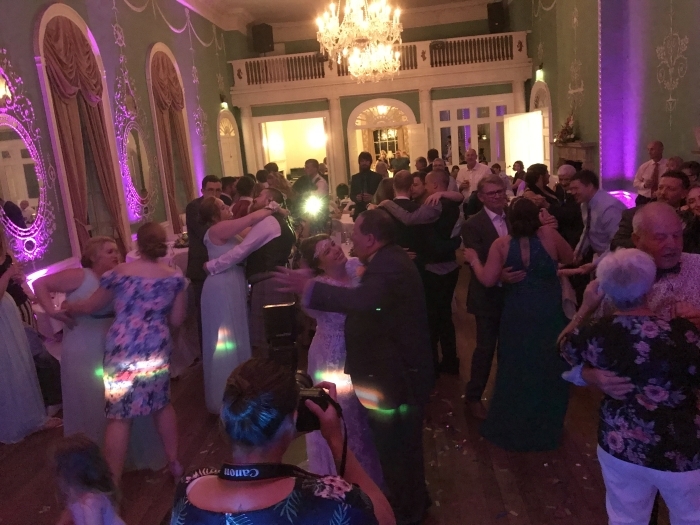 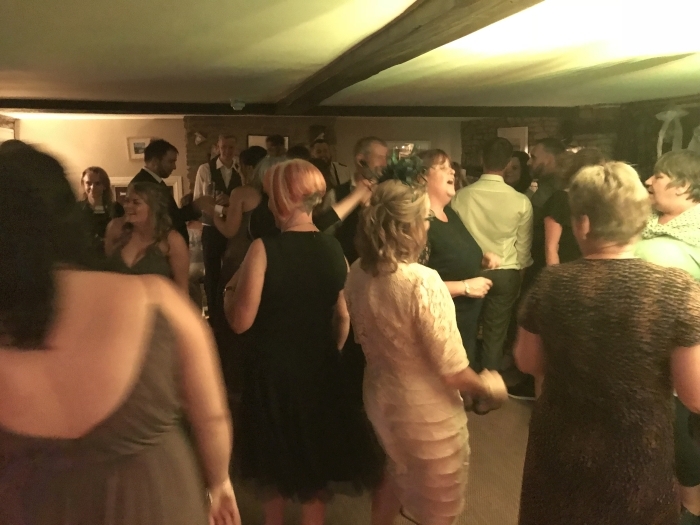 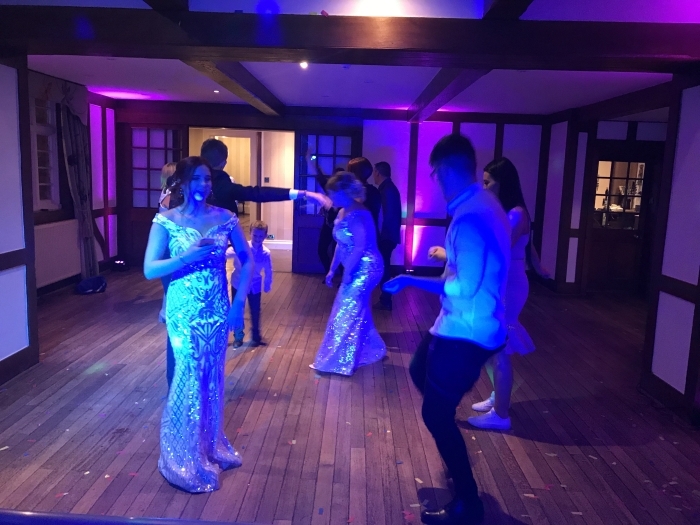 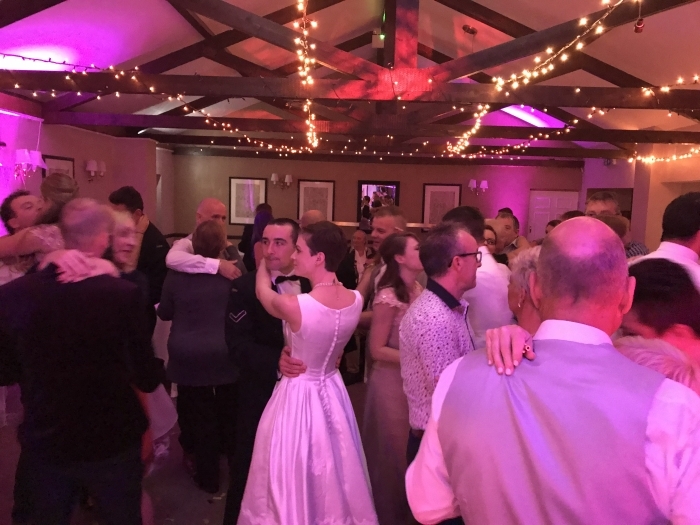 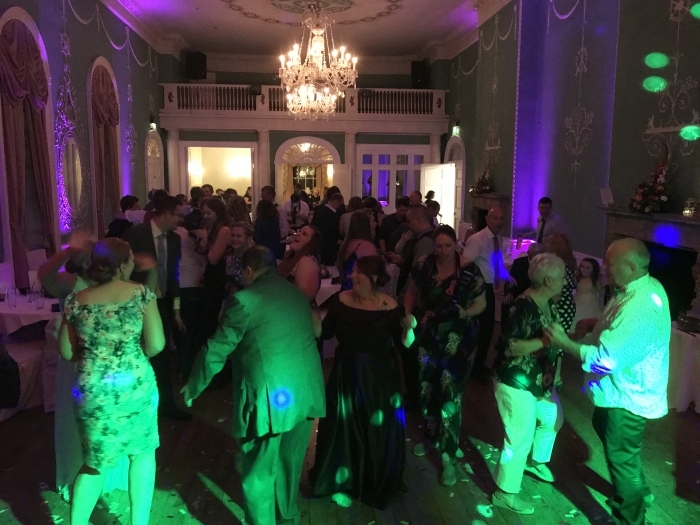 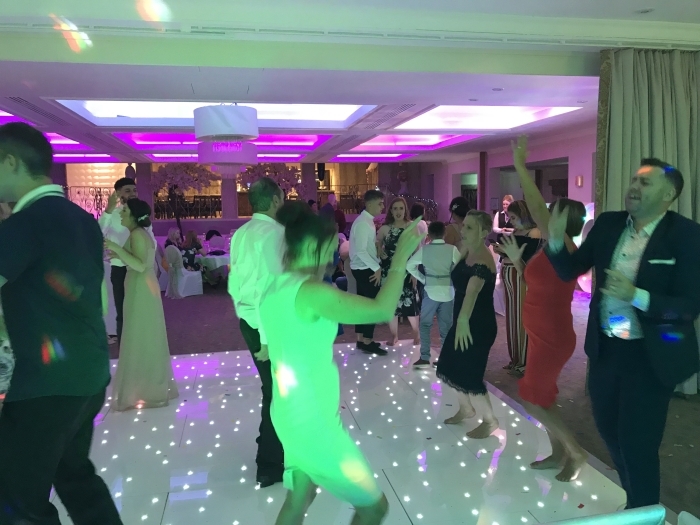 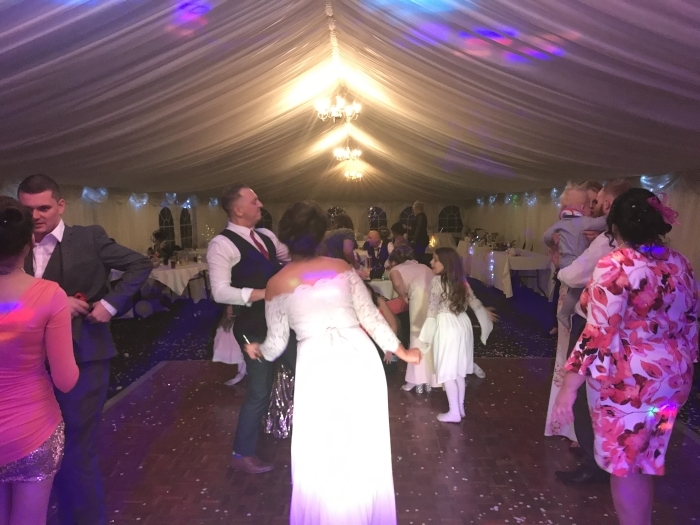 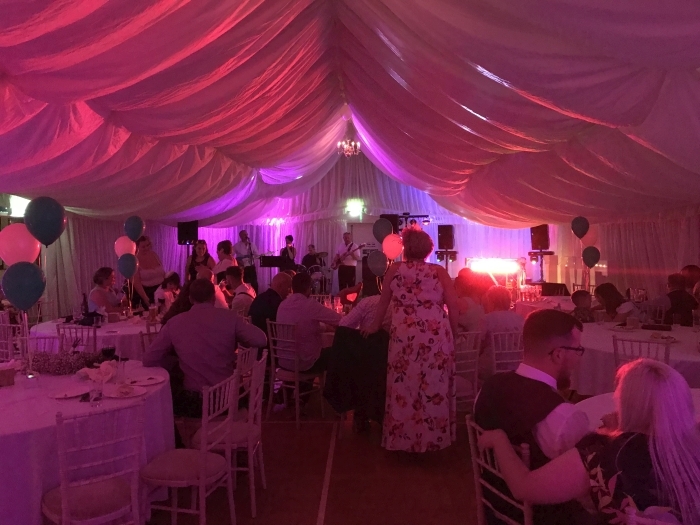 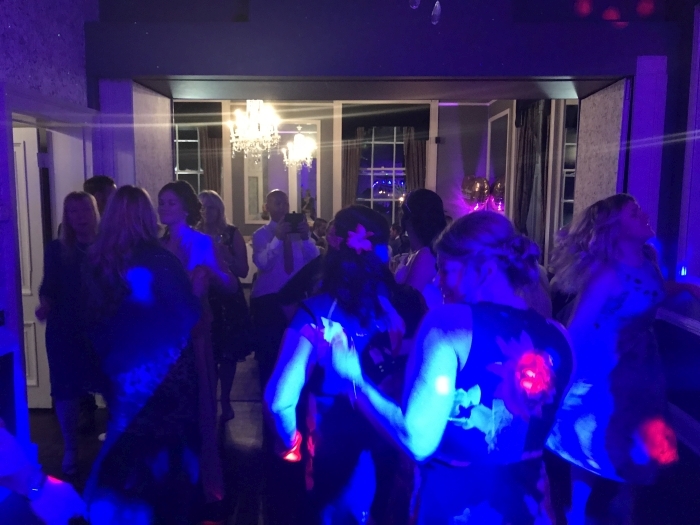 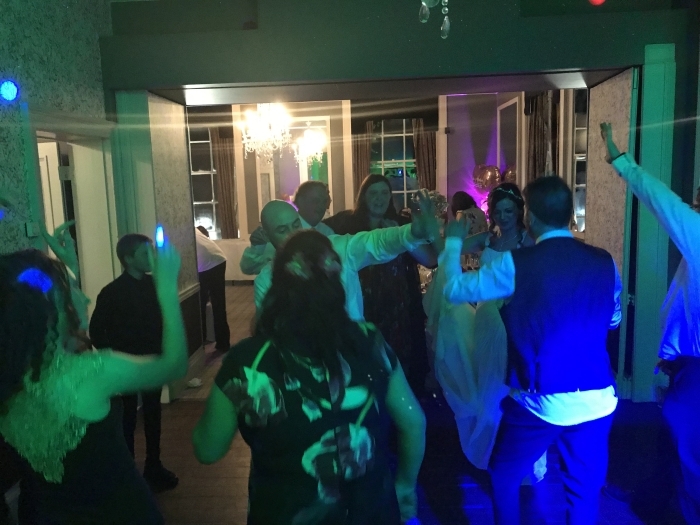 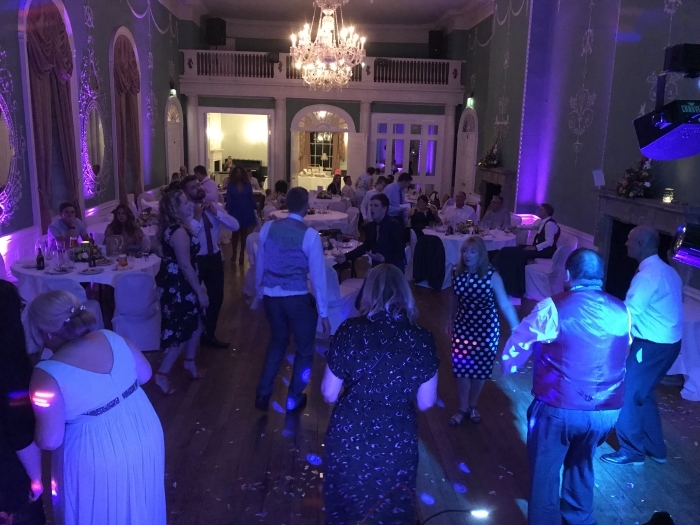 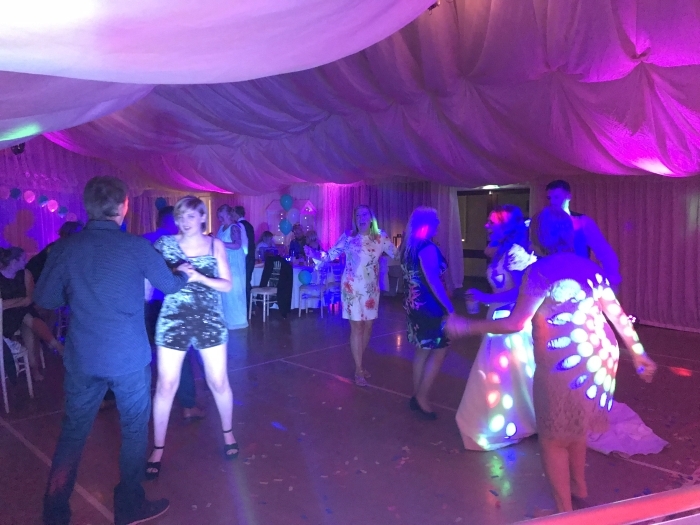 The evenings music was split in to two sections, the first was upbeat background music from 7:30 to 9pm for evening guest arrival and then following the first dance at 9pm it was straight on to full on disco party time through to midnight. 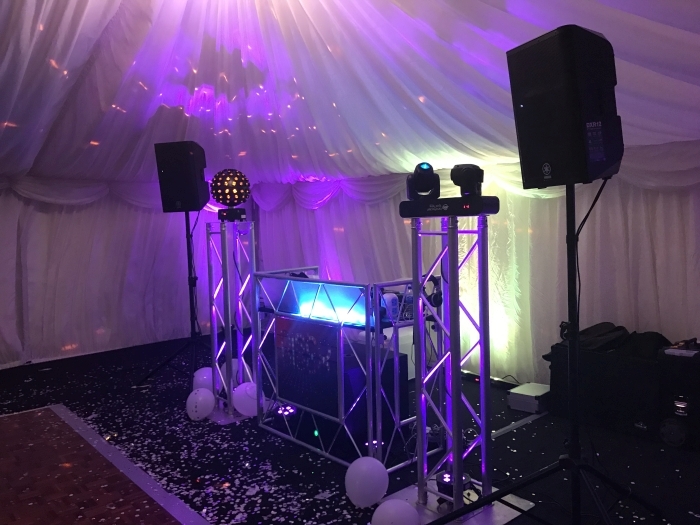 As time was tight after setup and the start of the evenings upbeat background music had to get started I was unable to produce the normal after DJ setup video tour I do so I produced a quick pre-setup video. 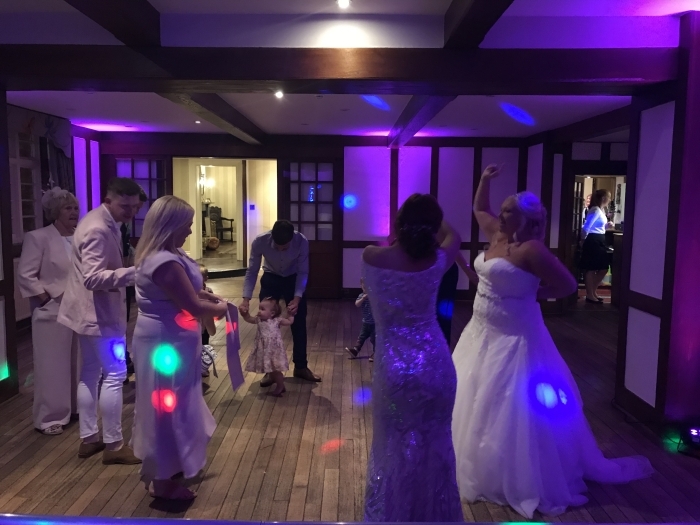 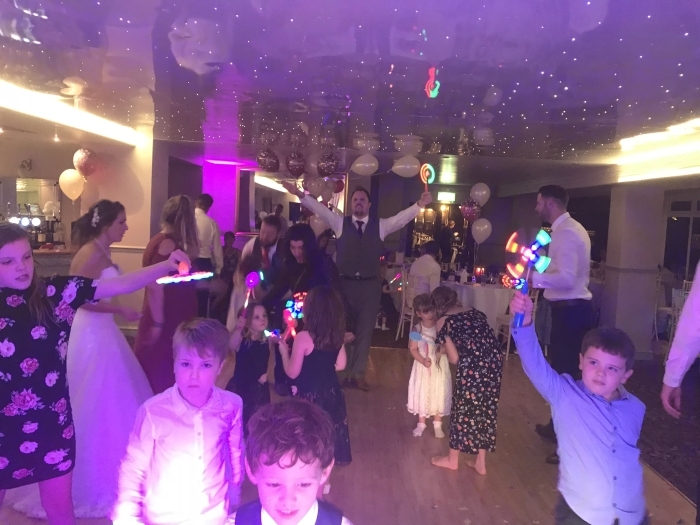 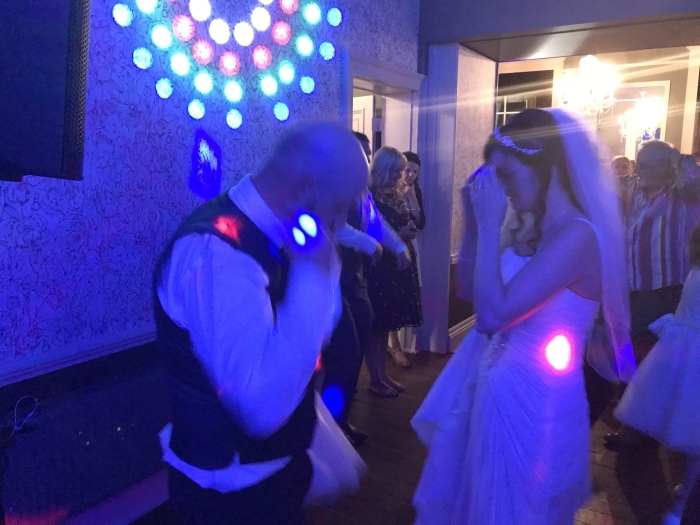 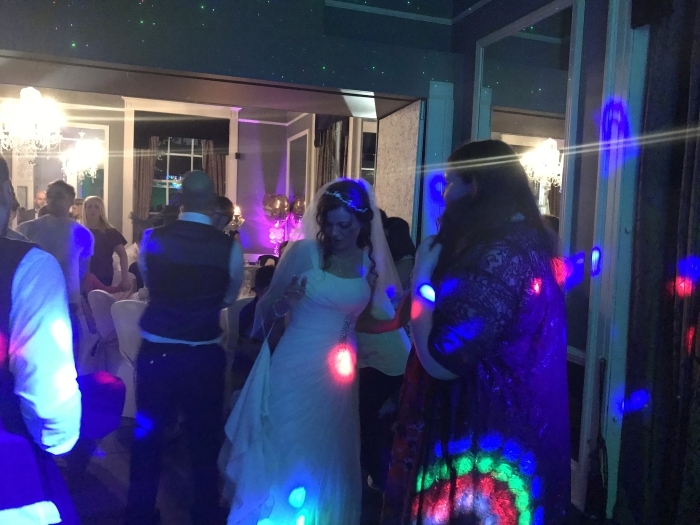 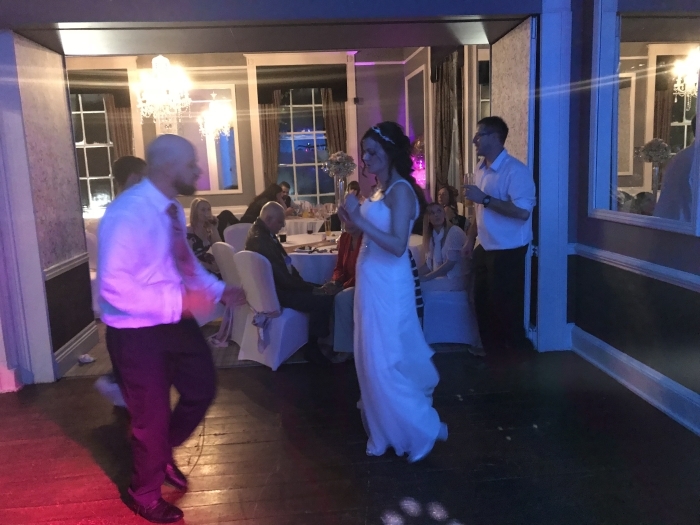 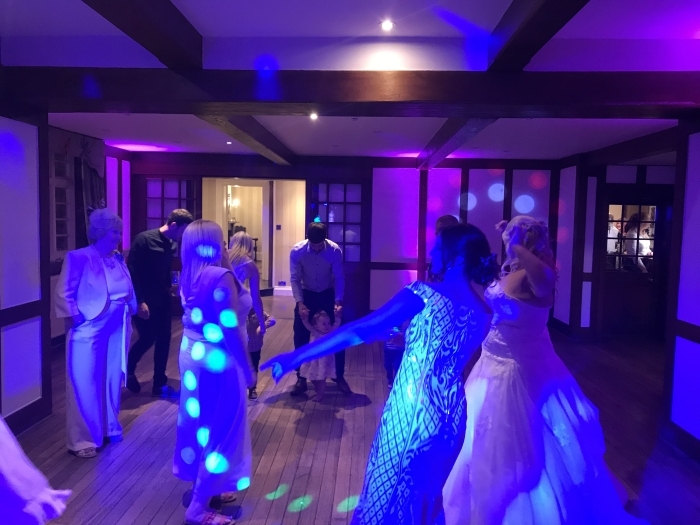 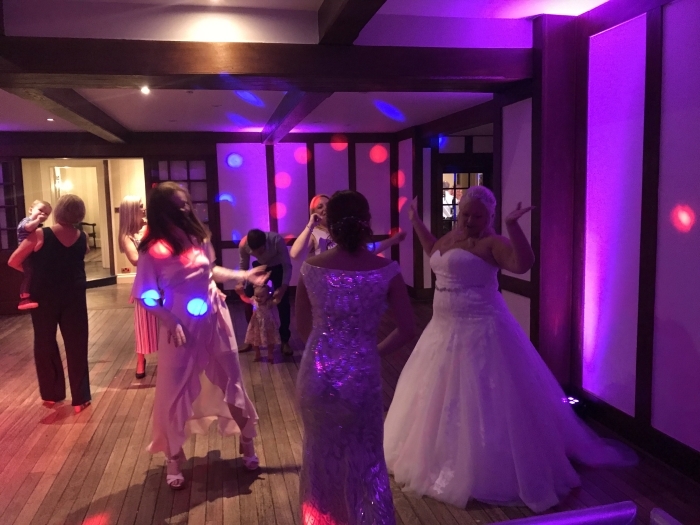 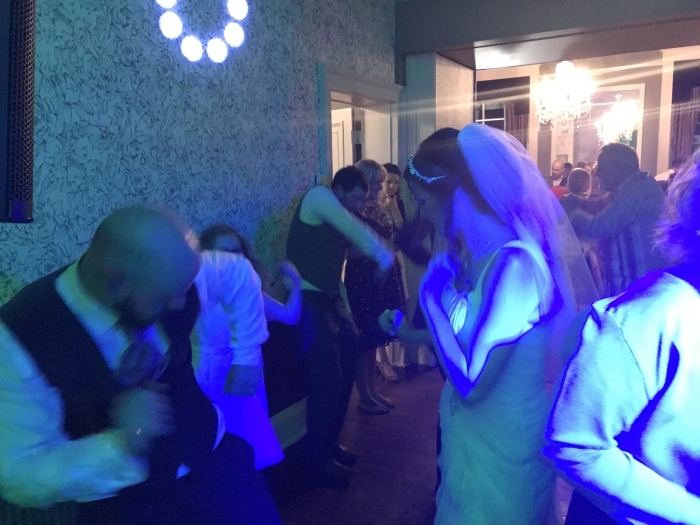 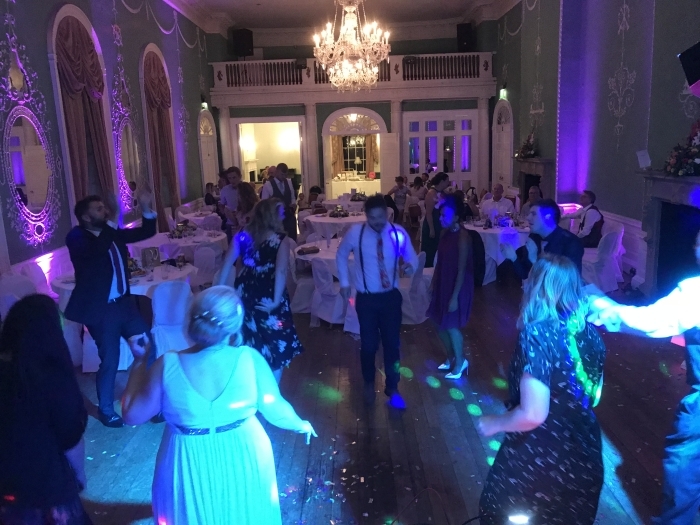 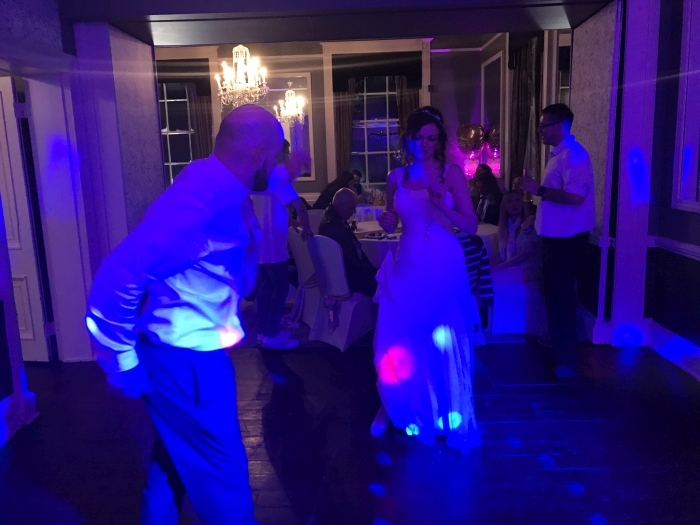 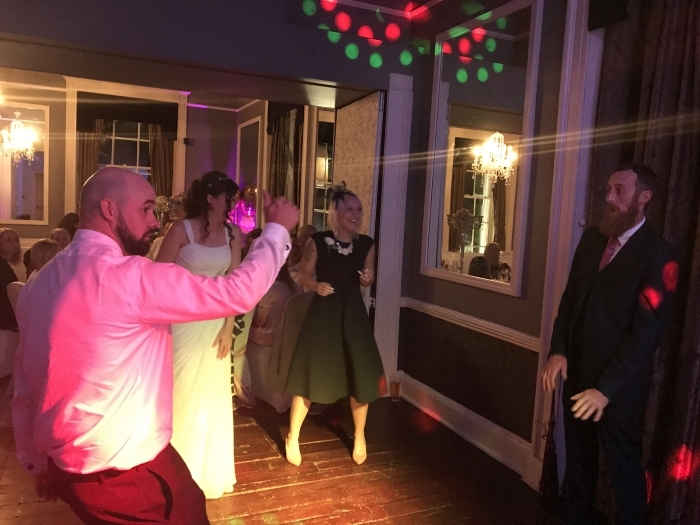 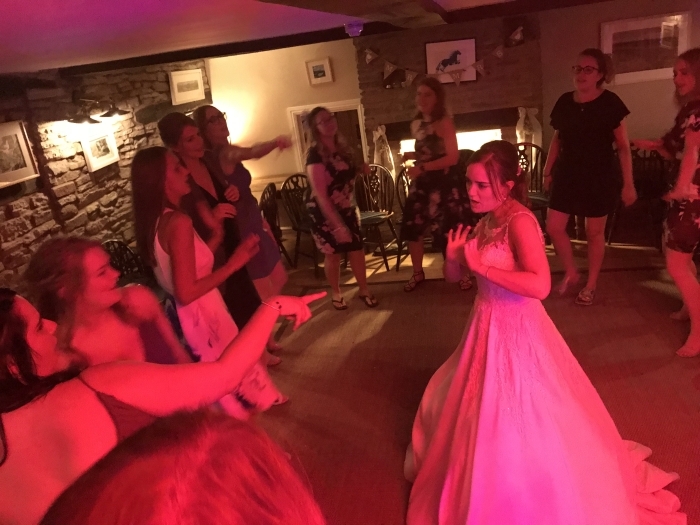 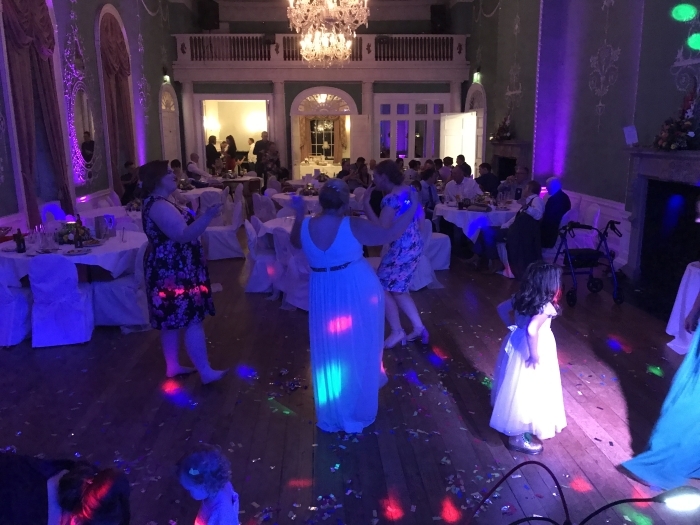 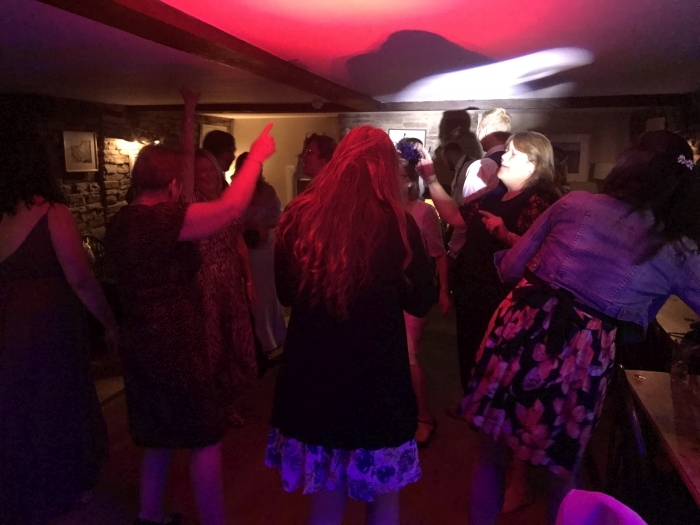 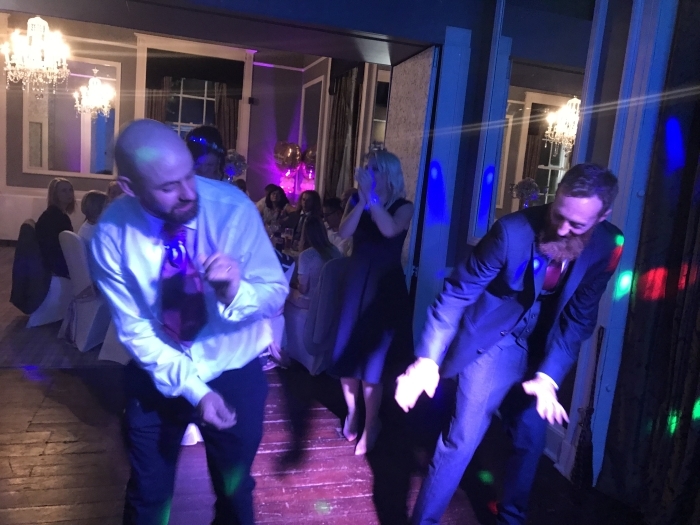 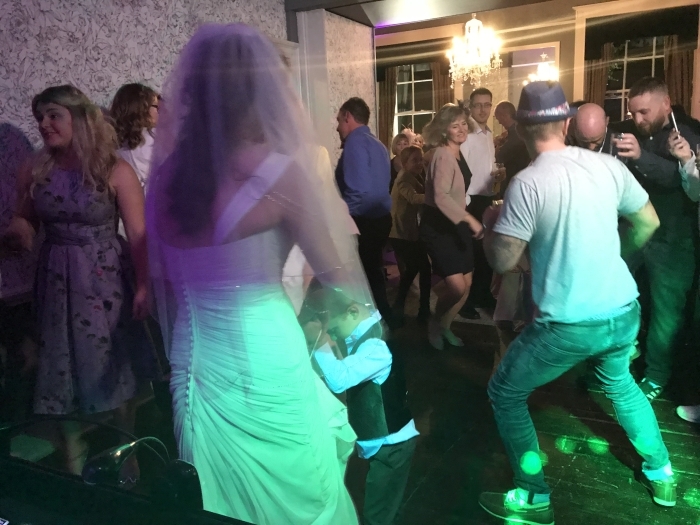 Prior to the first dance I DJed live an upbeat set during evening guest arrival and instantly had a couple of guests on the dancefloor and requesting a couple of sing-a-long tunes. 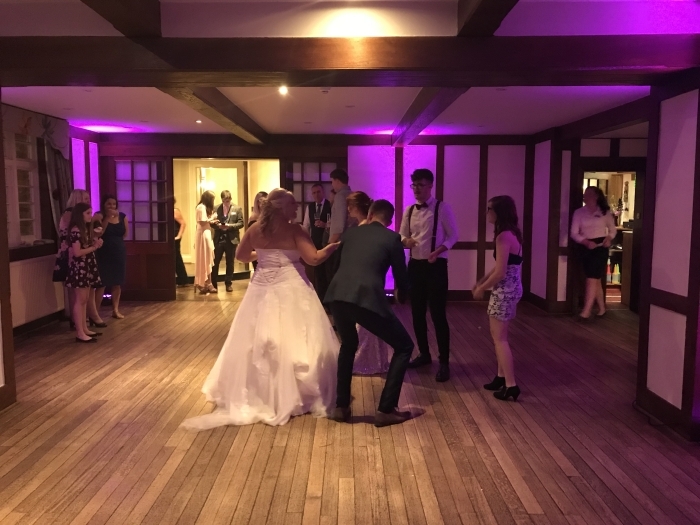 This video was taken around 8pm about an hour prior to the first dance. 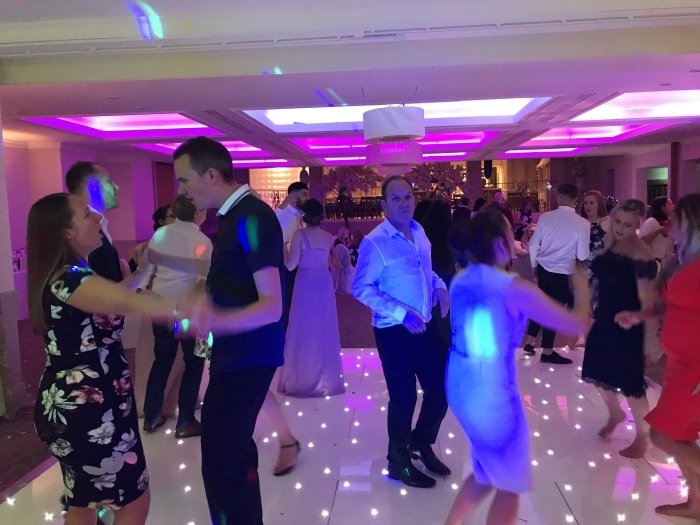 The dancefloor was banging all night long with guests making the most of the evening. 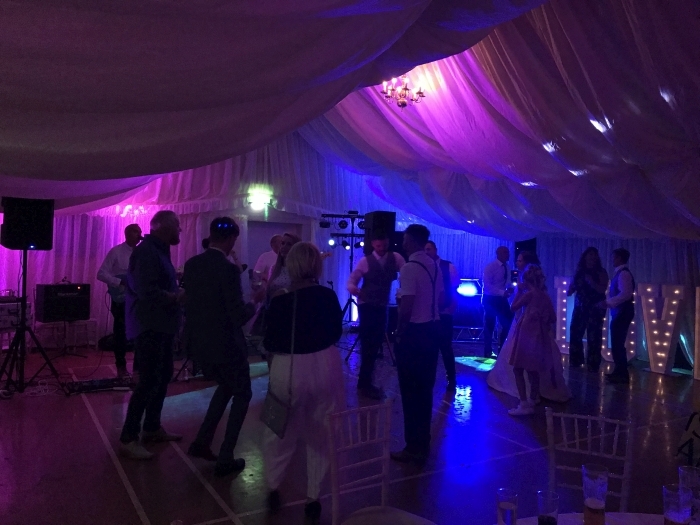 Around 8:30pm we had an 80s set which was popular with guests across the ages. 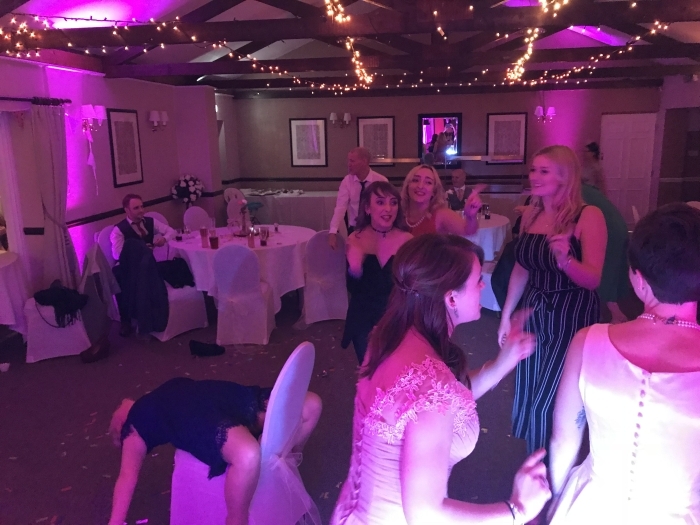 The bride and the bridesmaids made the most of the party tunes during the night! 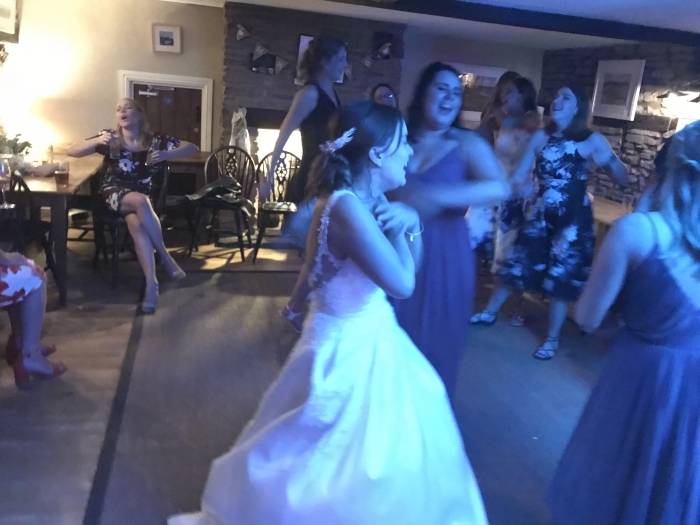 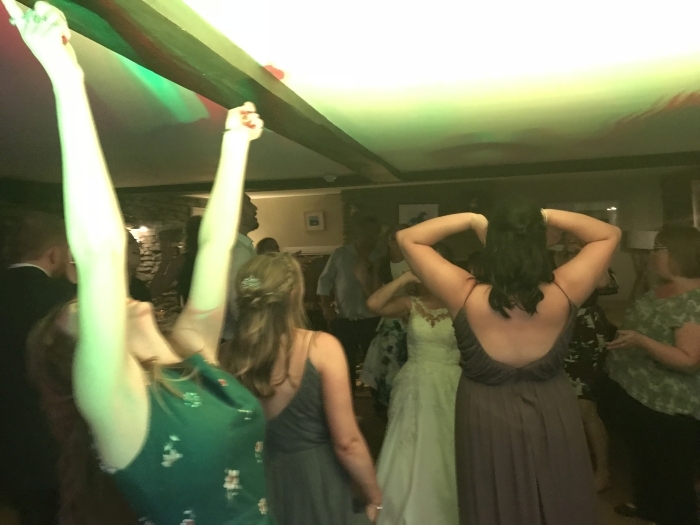 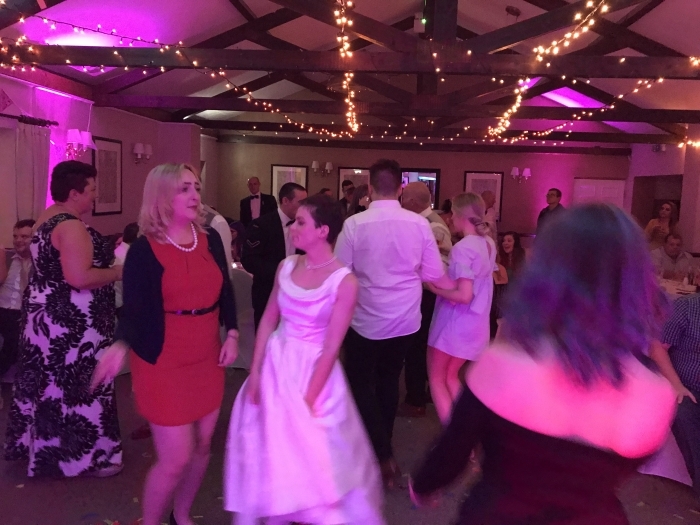 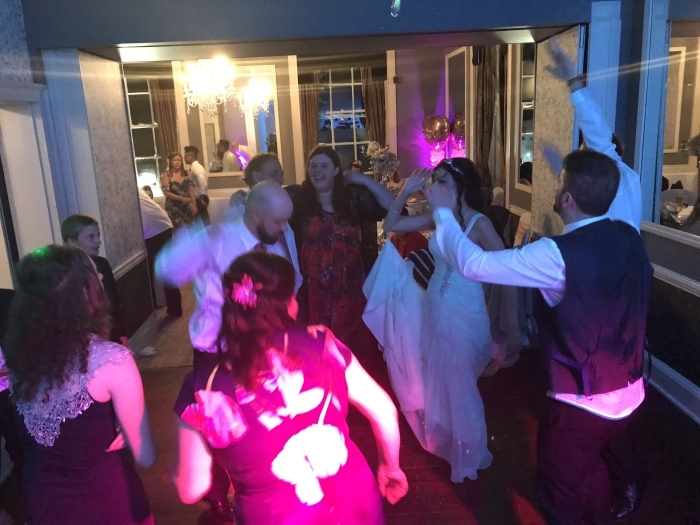 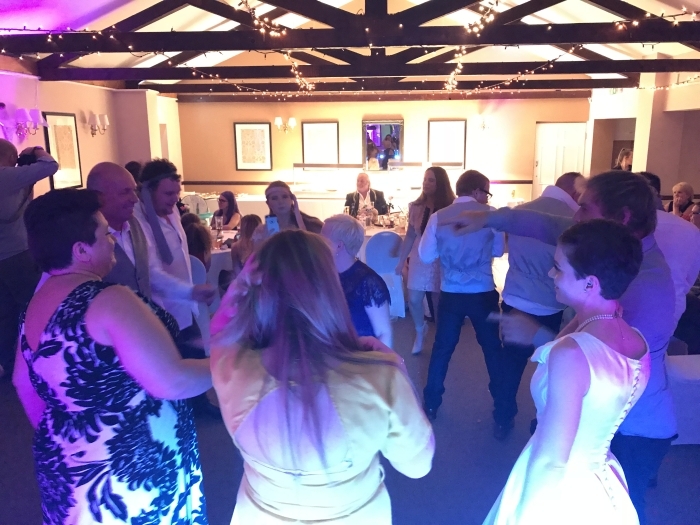 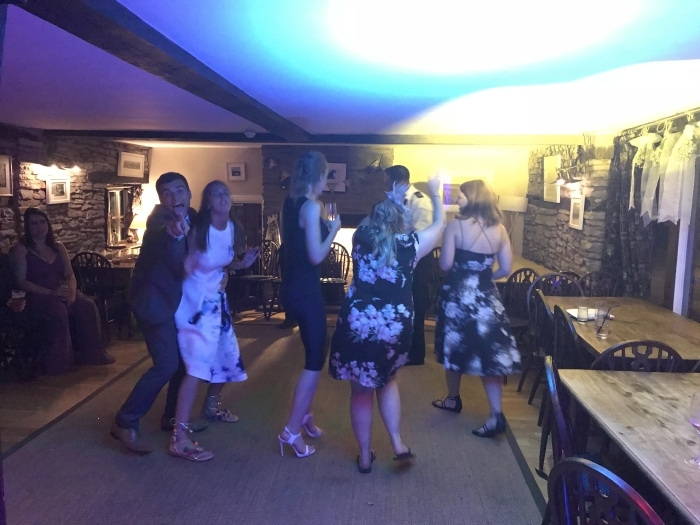 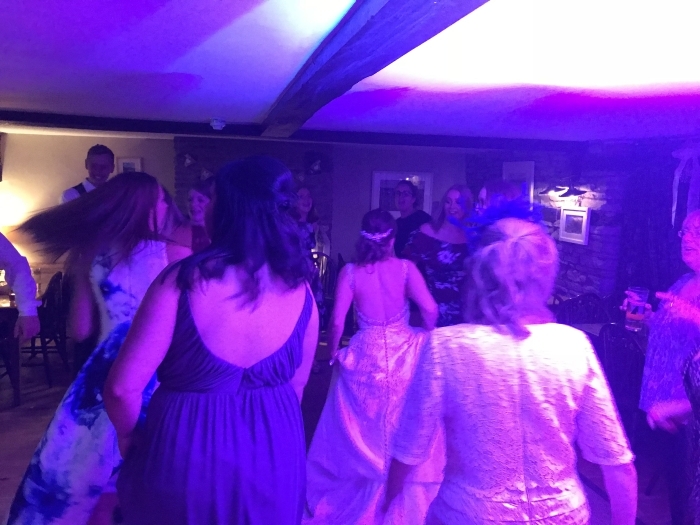 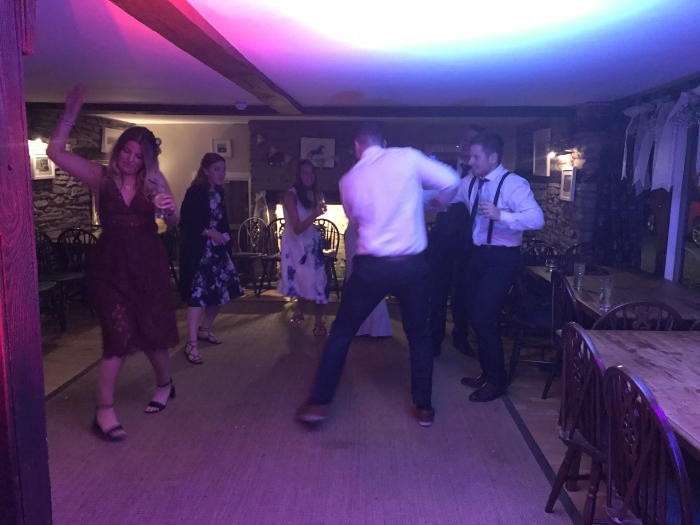 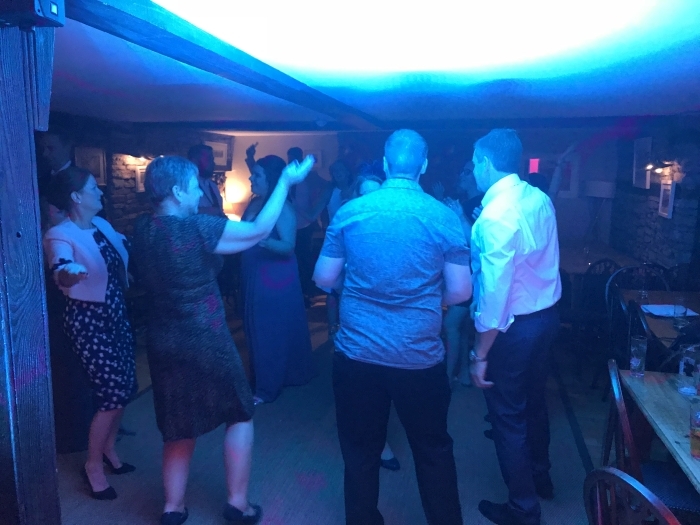 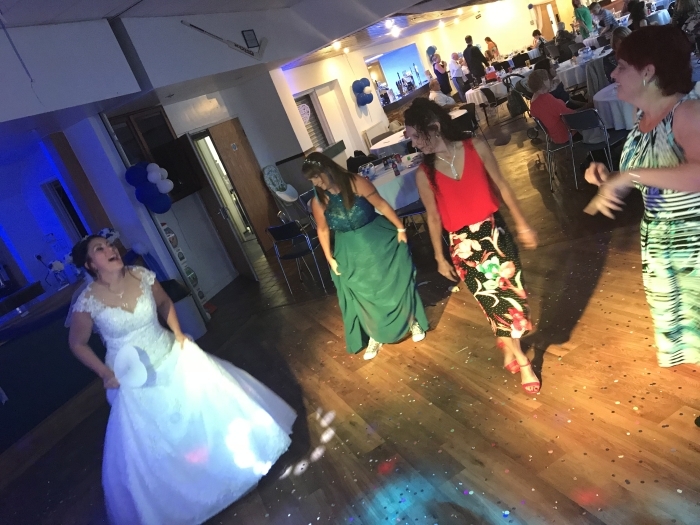 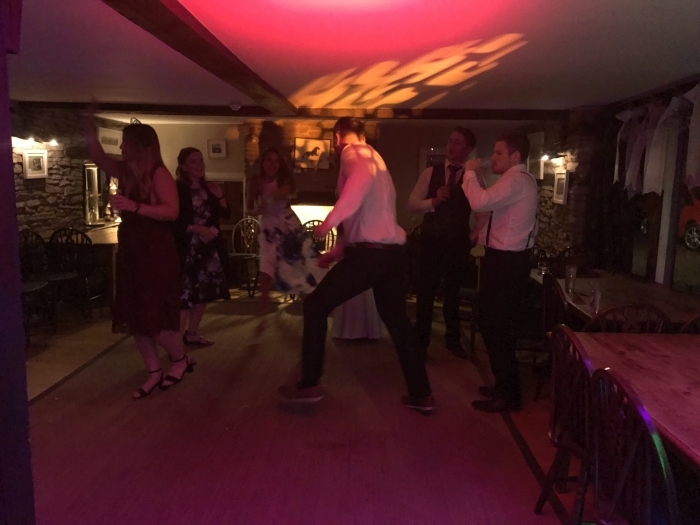 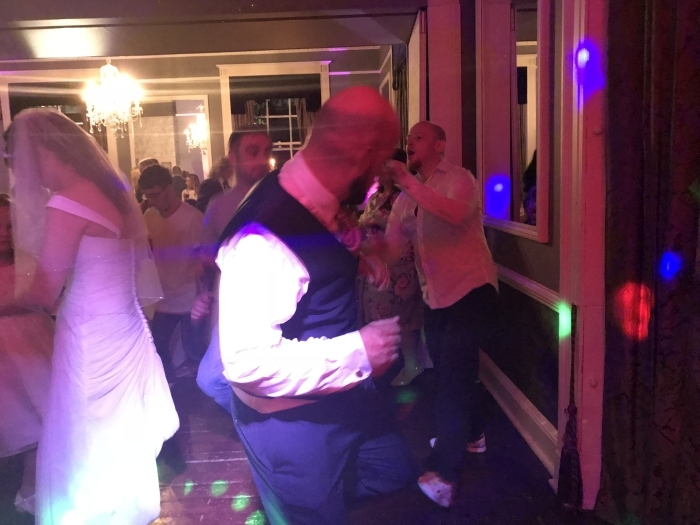 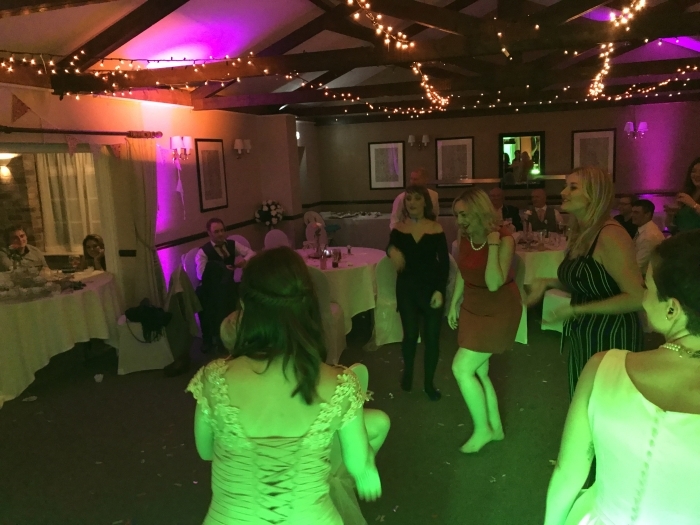 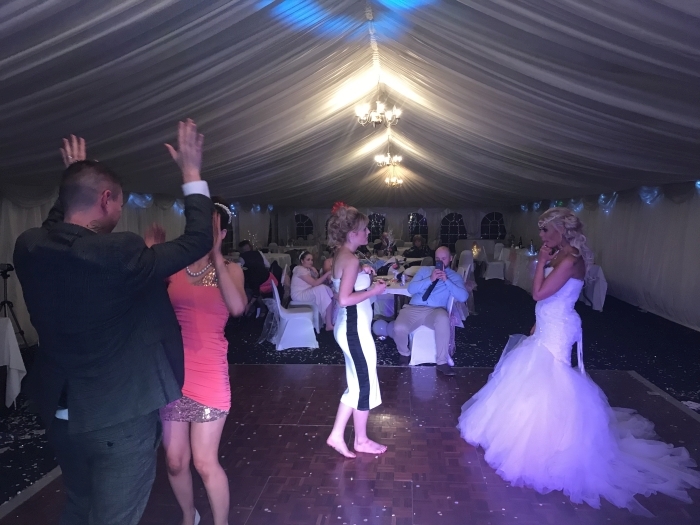 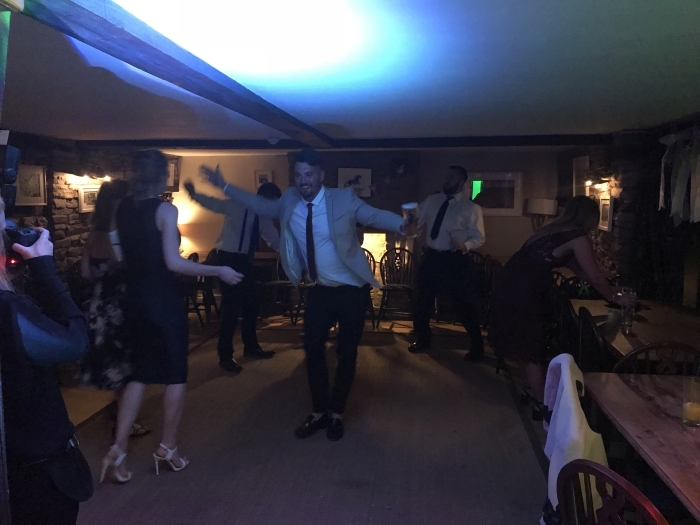 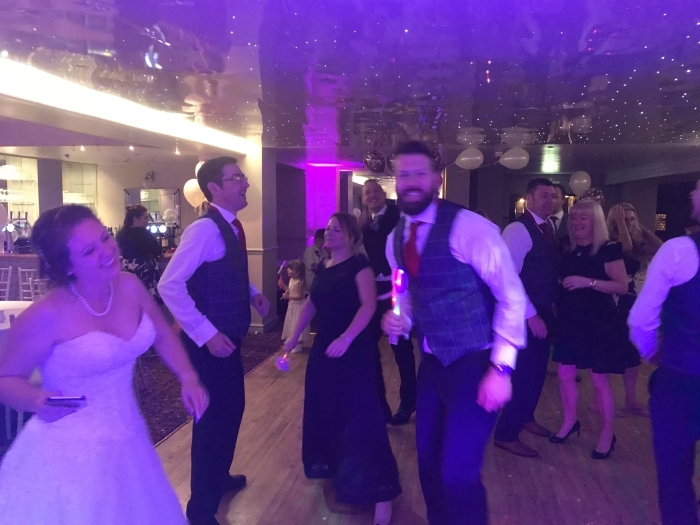 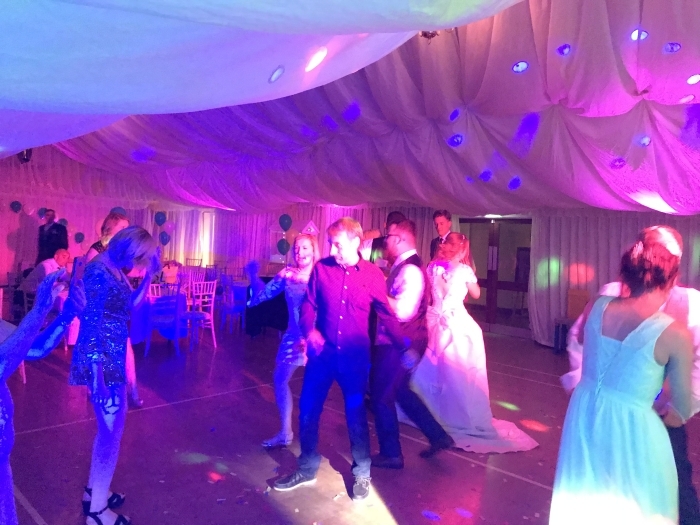 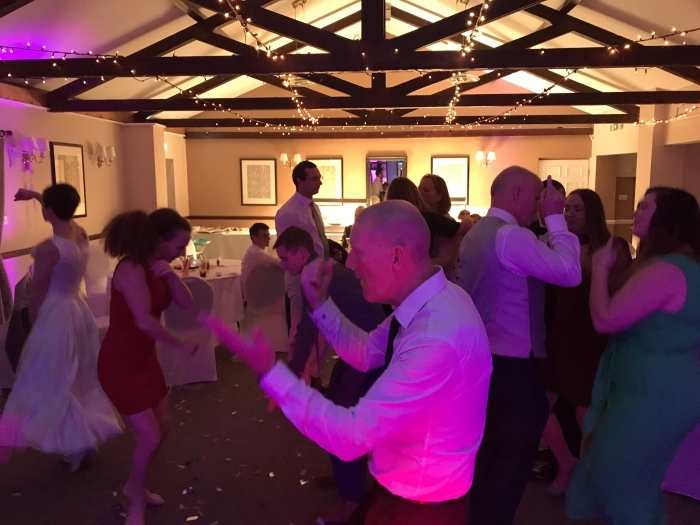 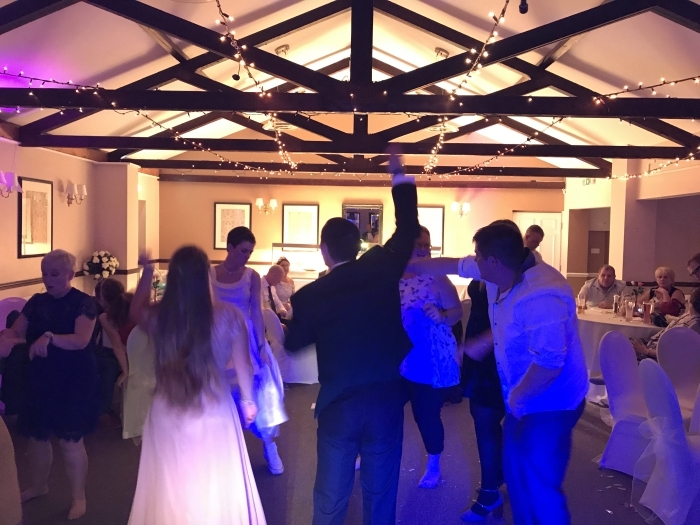 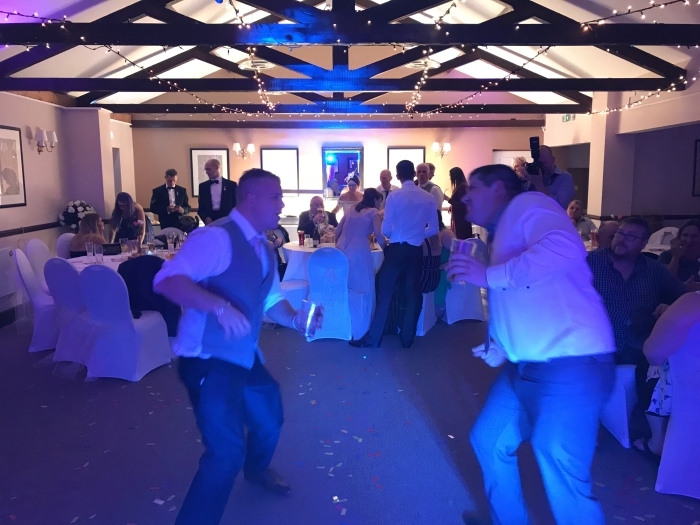 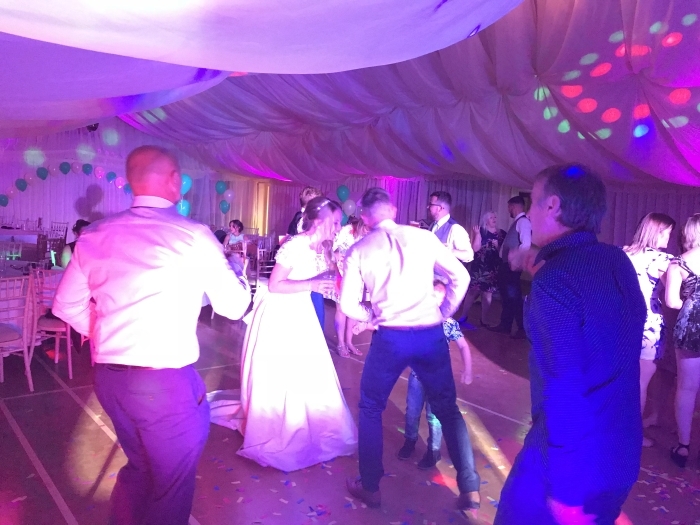 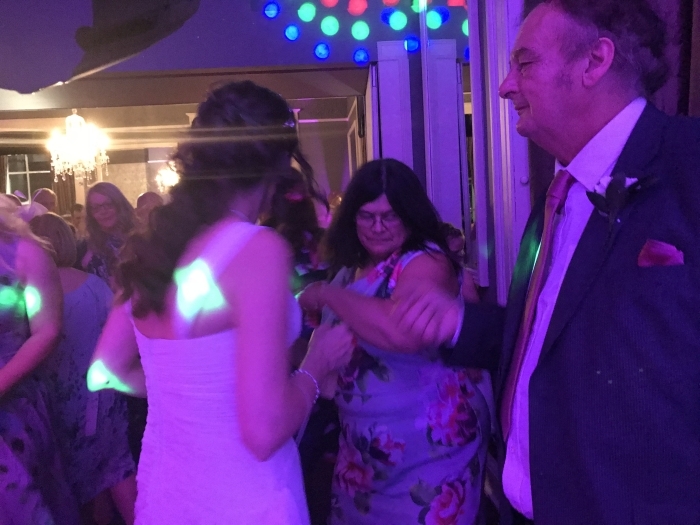 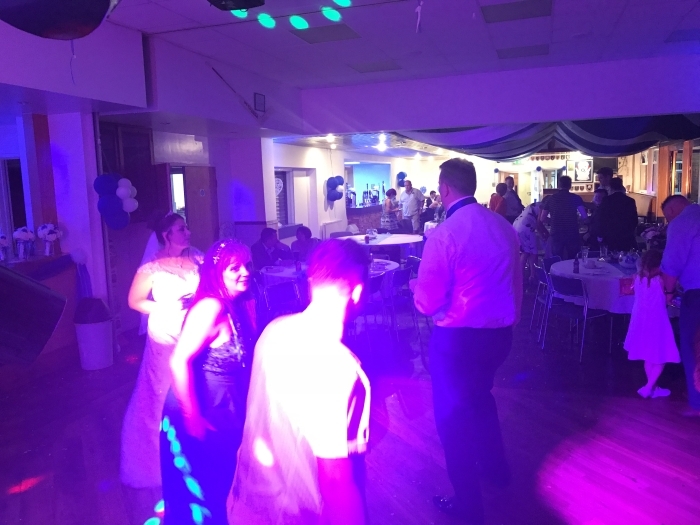 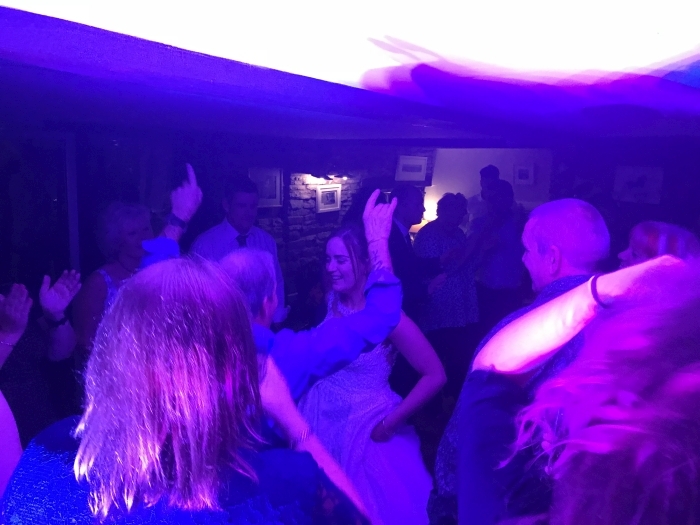 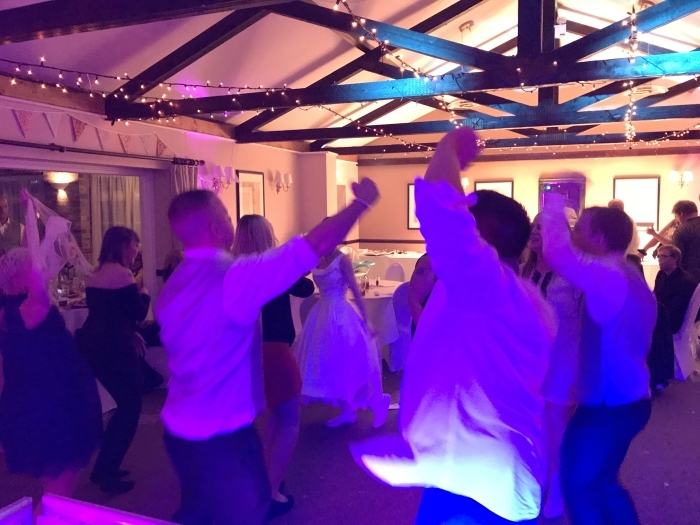 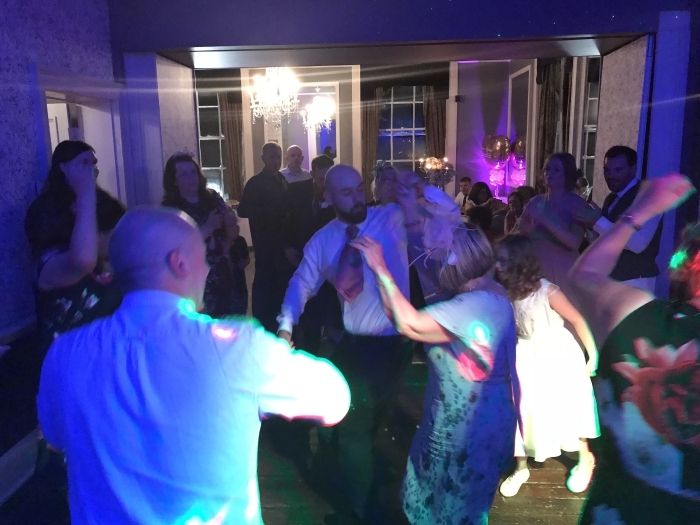 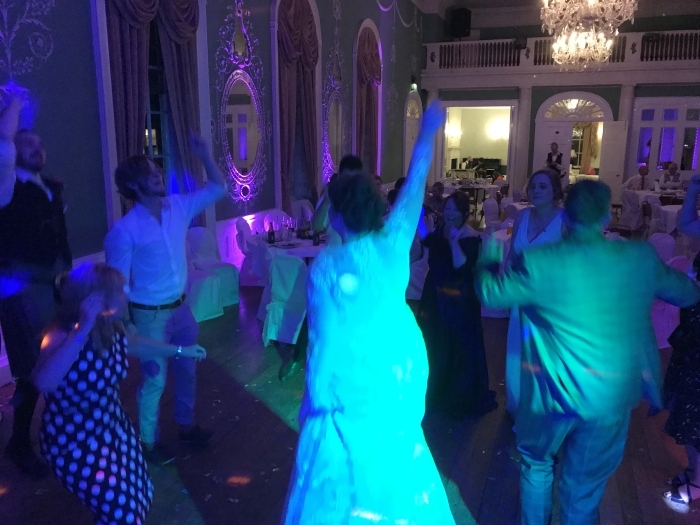 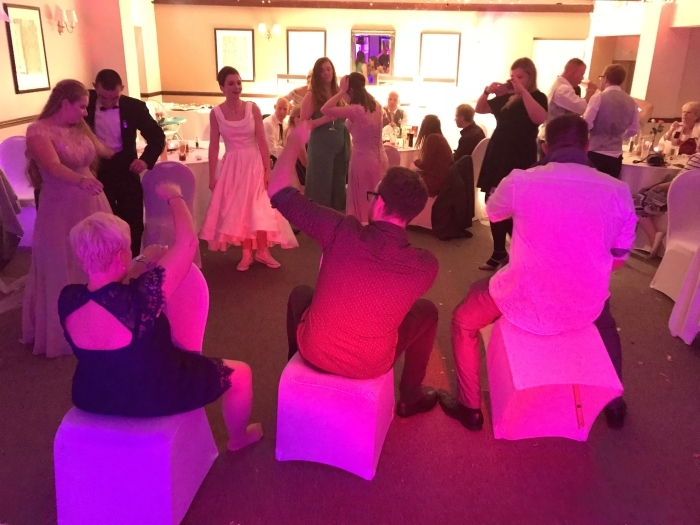 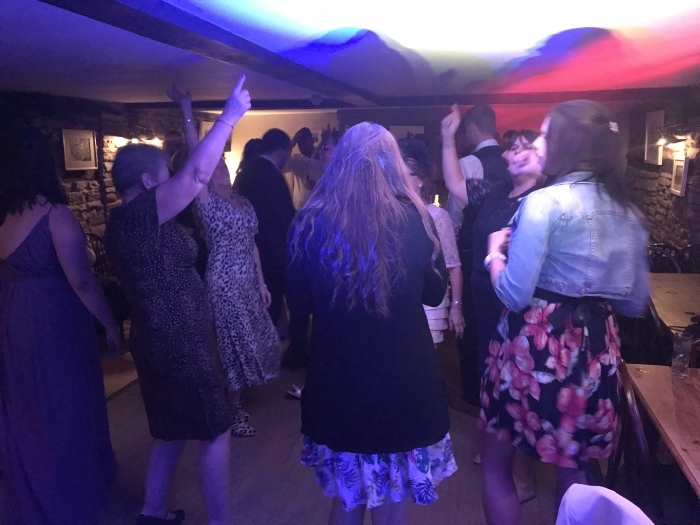 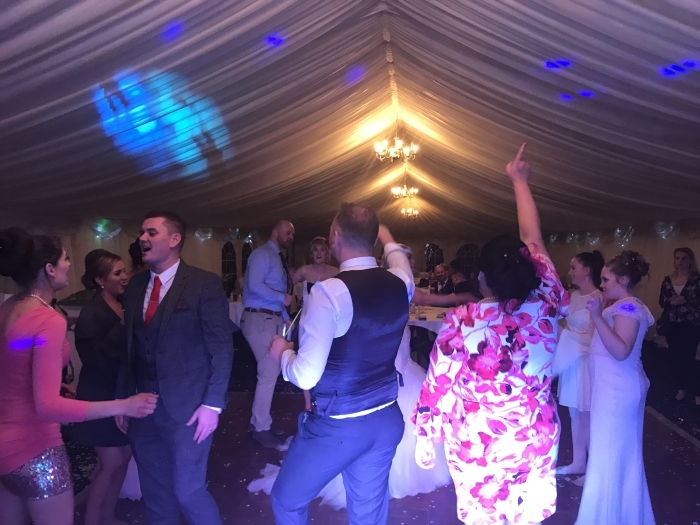 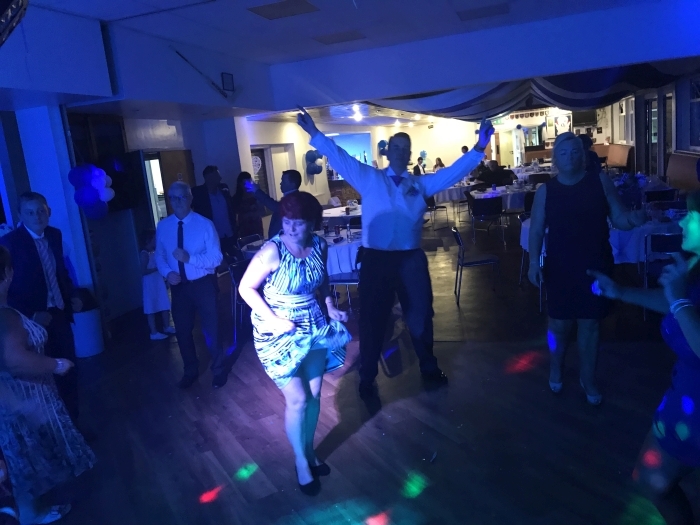 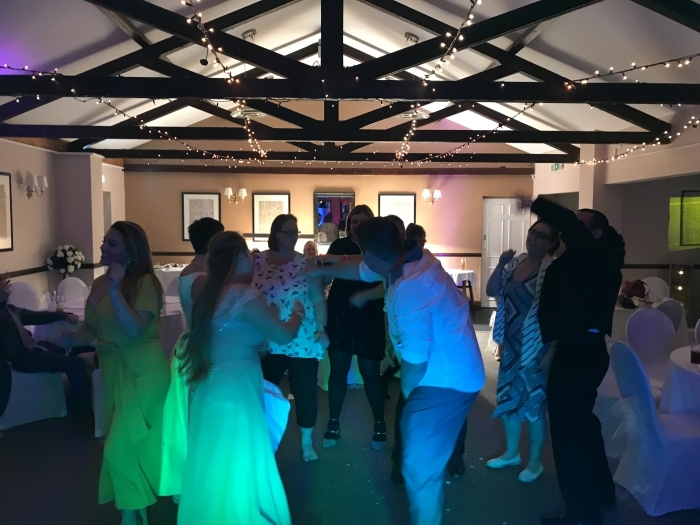 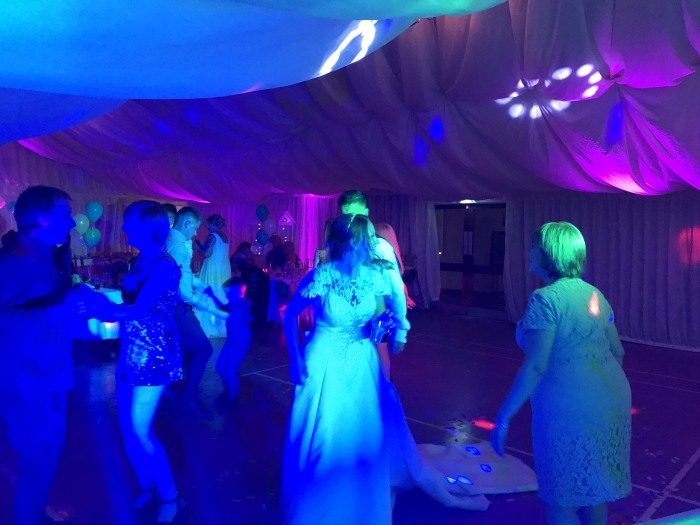 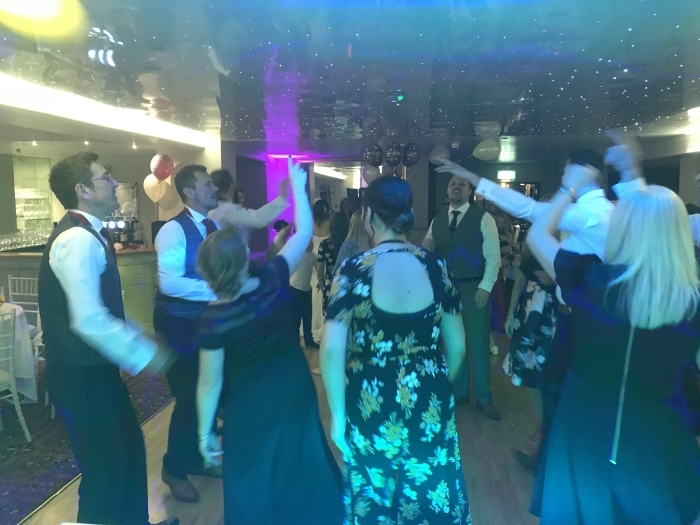 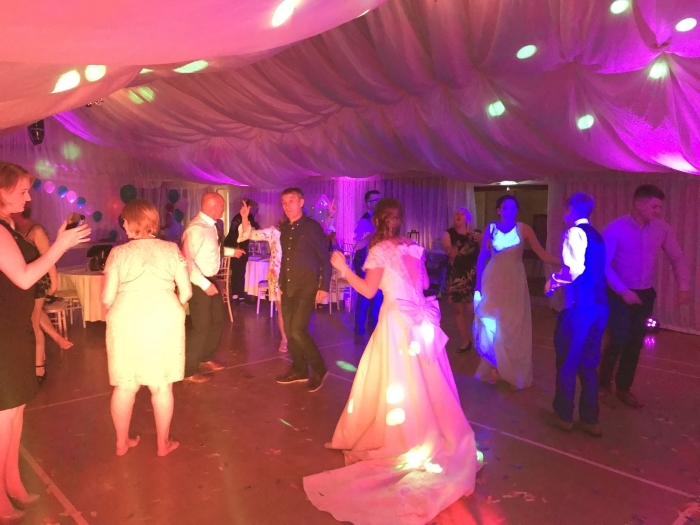 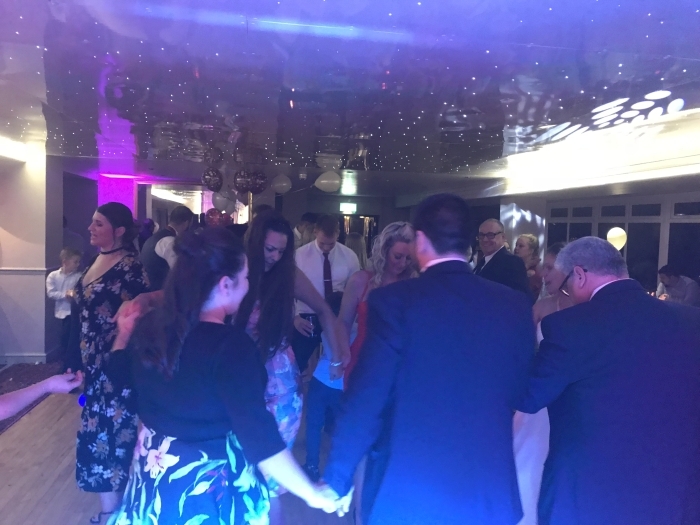 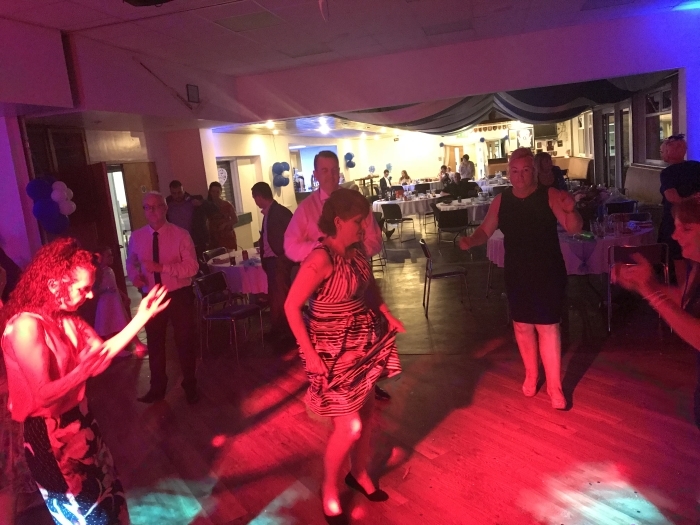 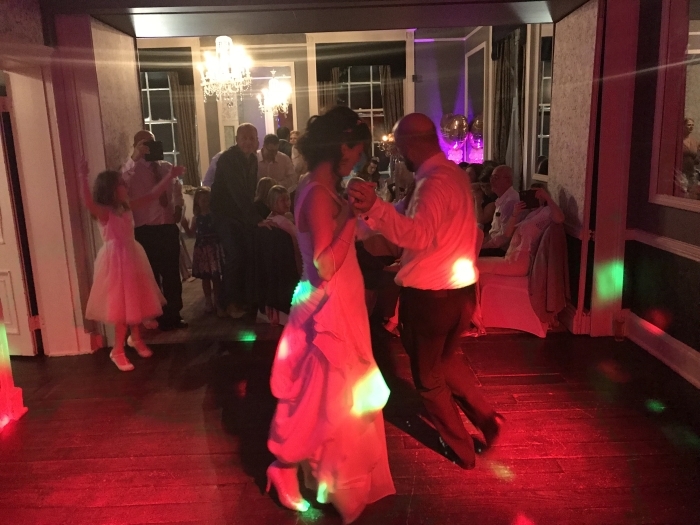 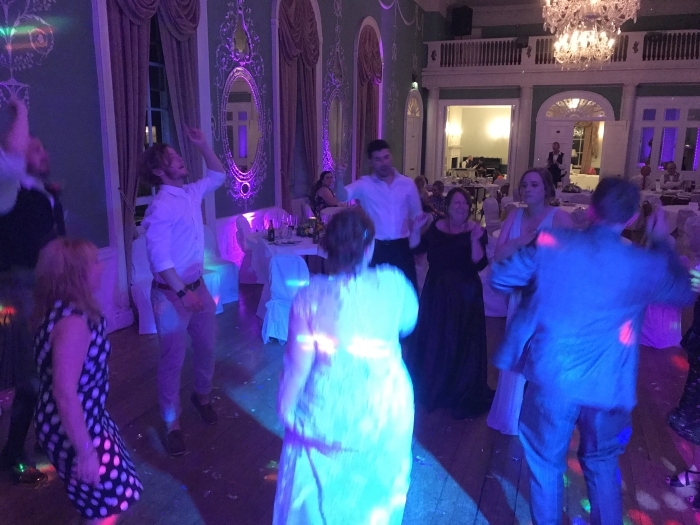 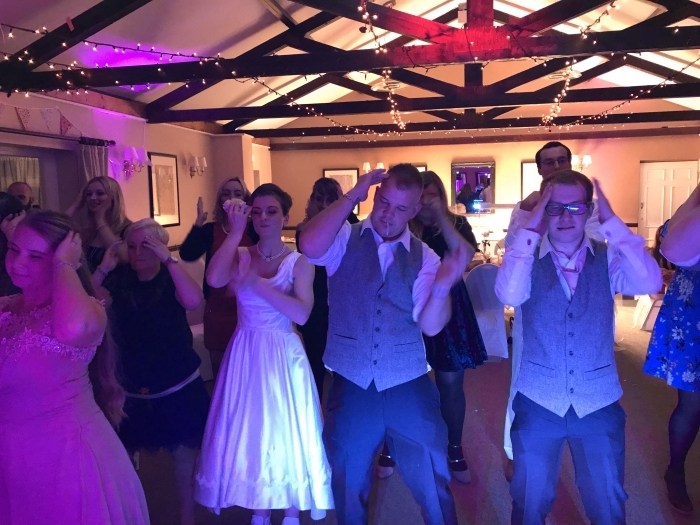 Its always really nice if you can finish the evening on a high and what I like to try and encourage is having a finishing tune with the bride and groom centre of attention and their friends and family around the dancefloor. 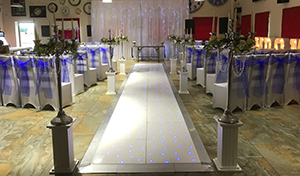 After setup was complete I took a couple of quick photos around the venue. 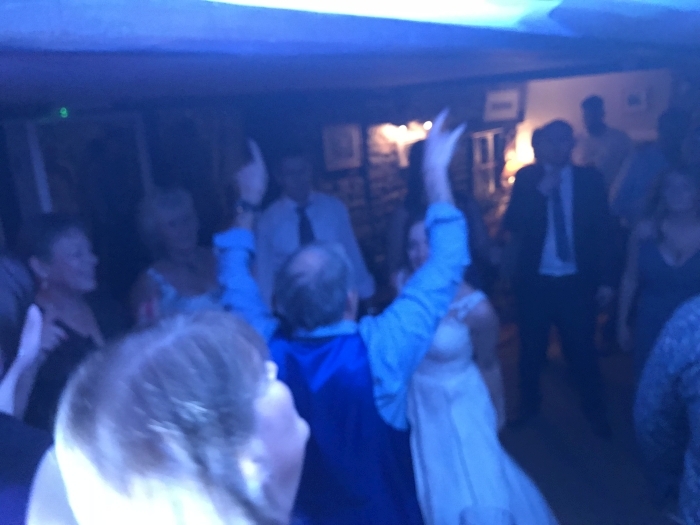 Here is a small selection of the photos I took during the evening from and around the Wedding DJ Booth area. 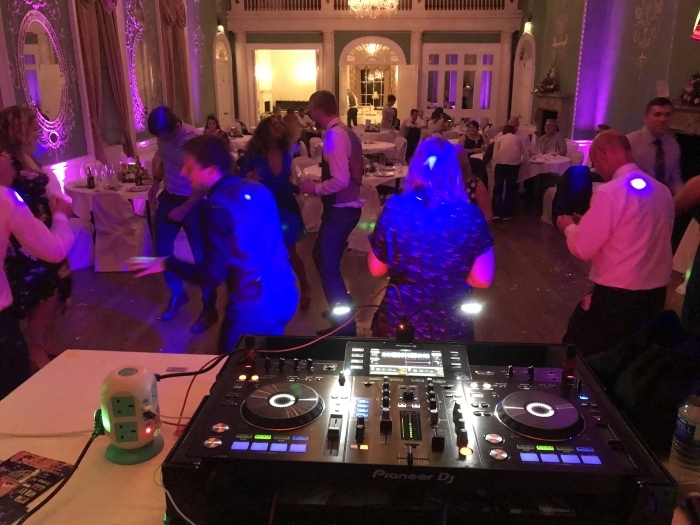 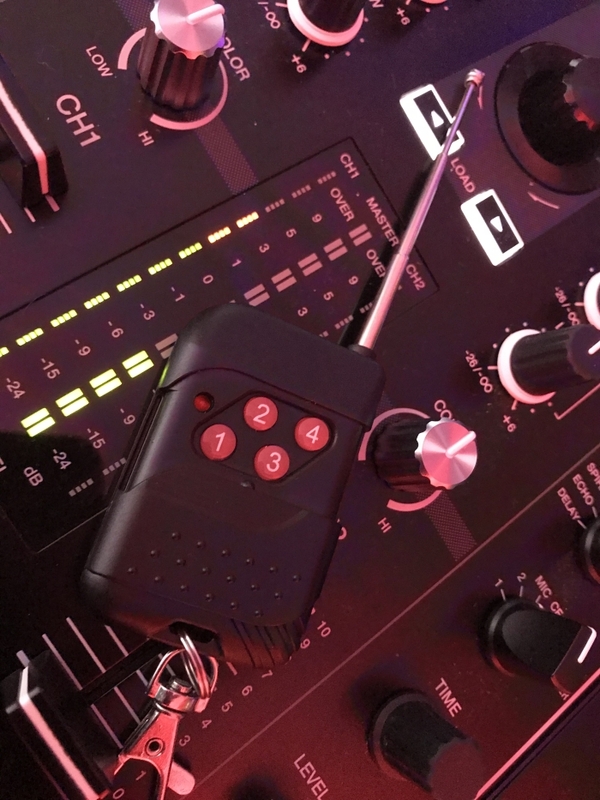 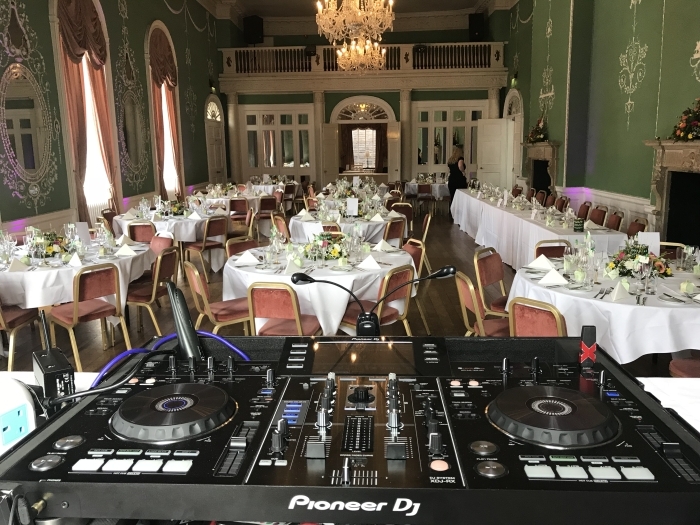 I’m passionate about my DJing and absolutely refuse to DJ using a keyboard and mouse, using state of the art Pioneer DJ decks allows me to be really in touch with my wedding dancefloor. 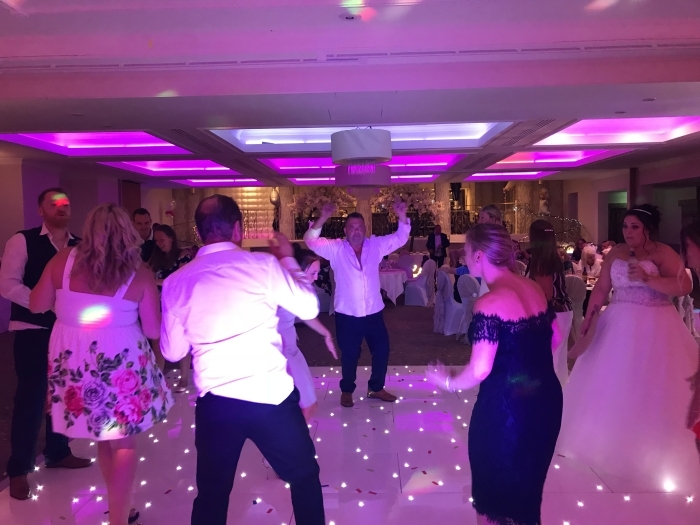 This was one of my favourite Wedding DJ pictures of the day. 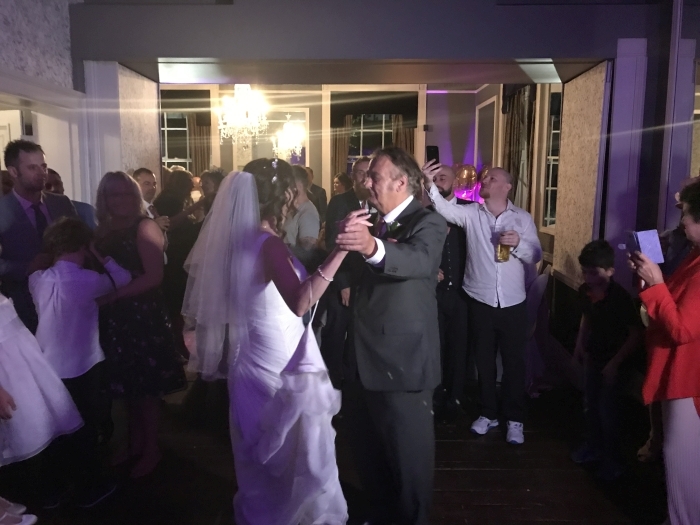 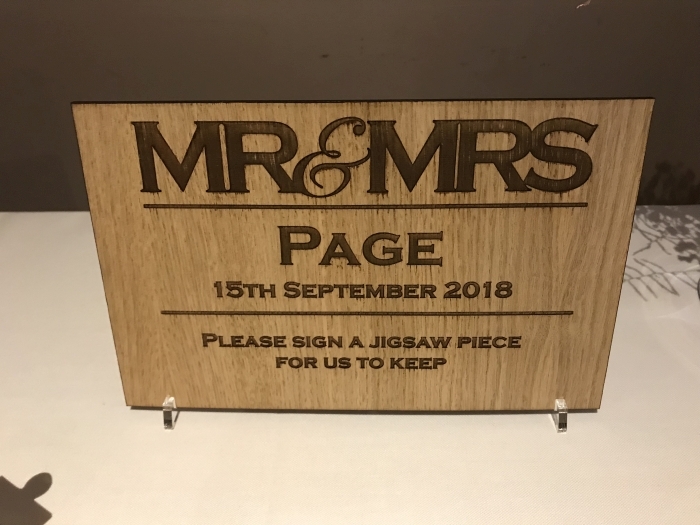 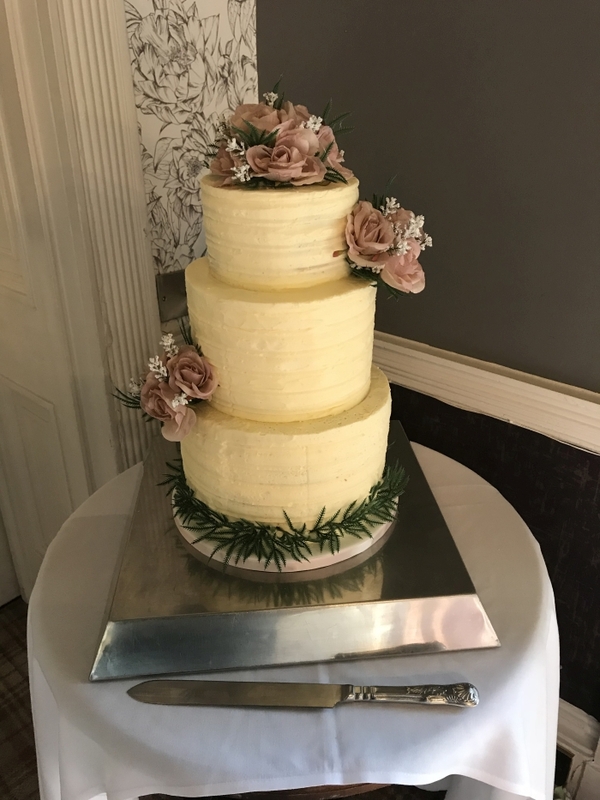 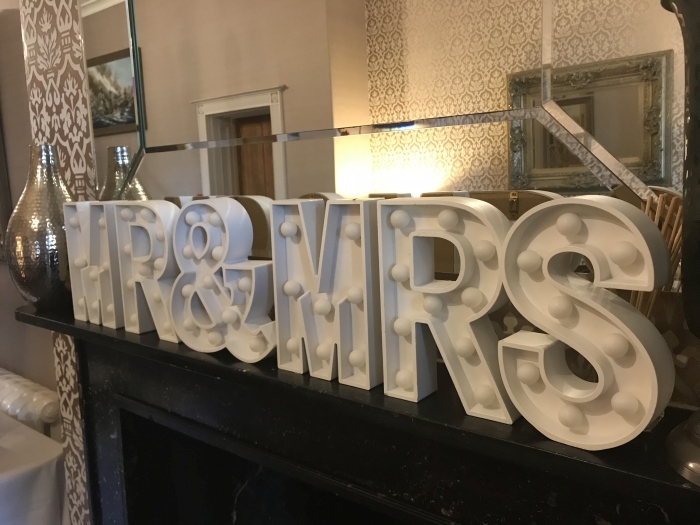 Saturday 1st September 2018 was the Wedding of John and Sacha Taylor at the Lion Hotel Shrewsbury Shropshire. 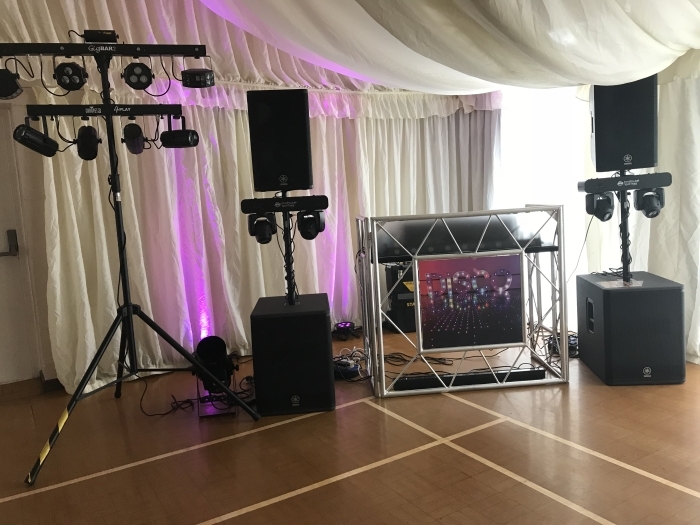 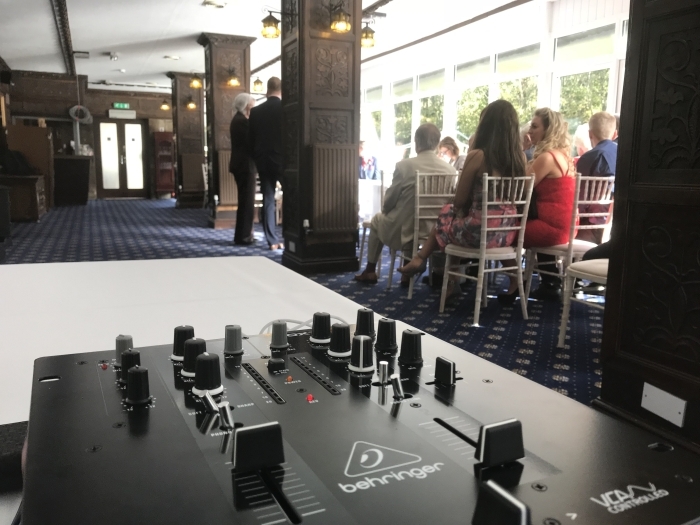 I arrived around to setup at just after 10am as I was supplying Wedding Ceremony Music, Wedding Breakfast Music, Early Evening Background Music and of course the evening reception’s disco. 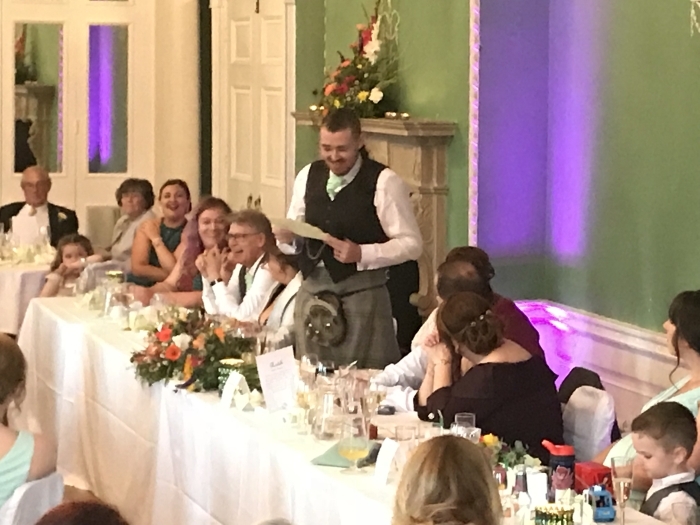 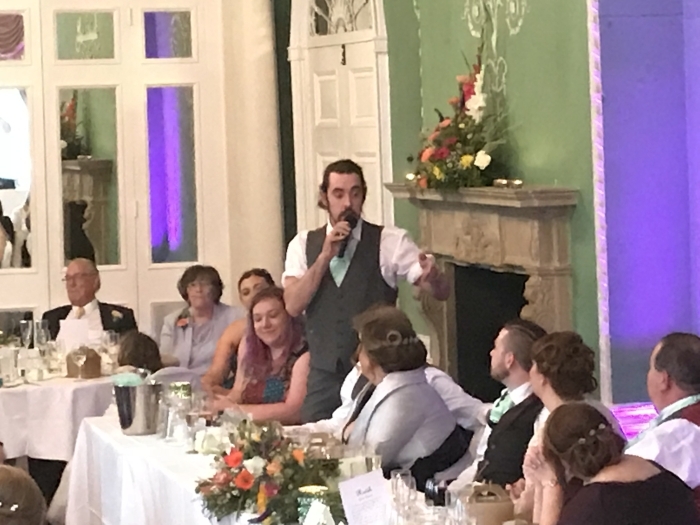 I was also the Wedding MC / Informal toastmaster for the wedding using my wireless microphones for announcements, introduction of bride and groom to room, introduction of speeches and so on. 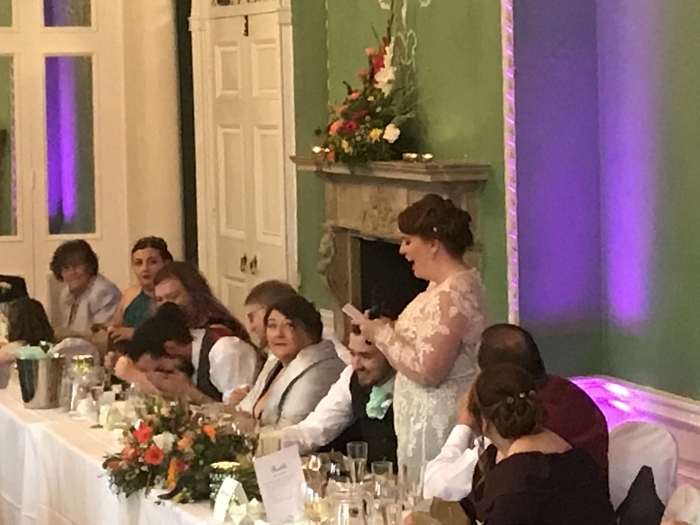 The wedding party also used my wireless microphone for their speeches. 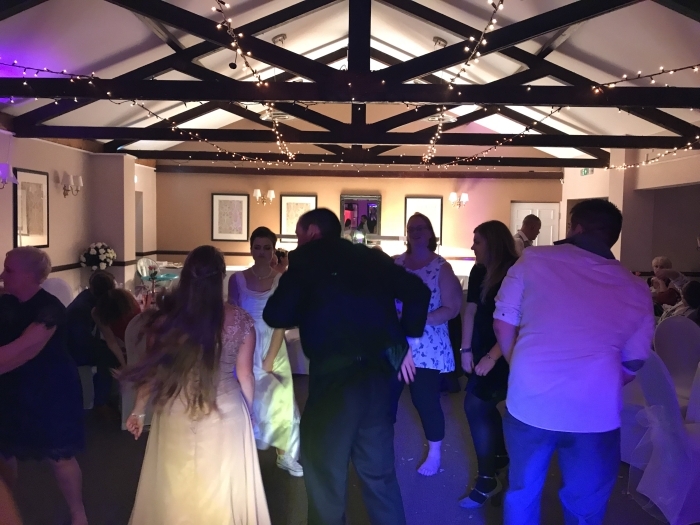 I was asked to provide the wedding ceremony music as there was a fairly large group and a high sound quality was required. 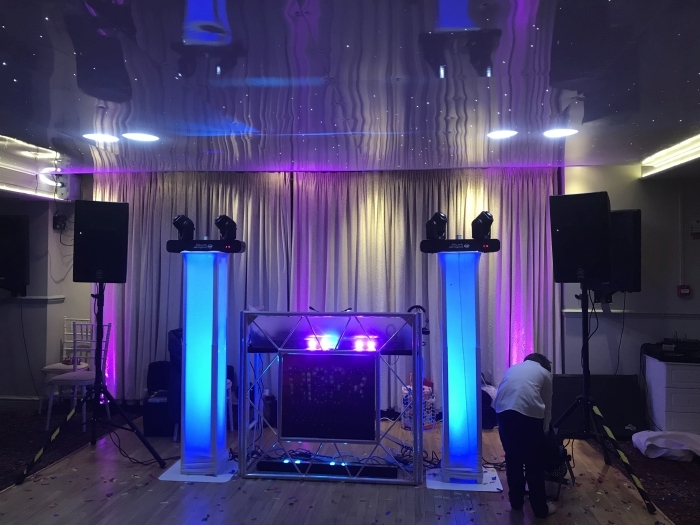 Discretely placed speakers for the Wedding Ceremony to provide a good crisp sound quality around the room without being highly visible. 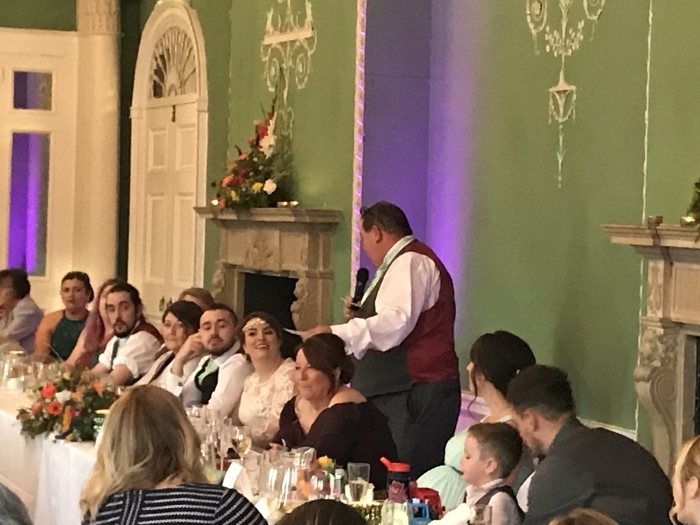 During the afternoon I provided the Wedding MC / Informal Toastmaster services, starting with building up the rooms atmosphere for introducing bride and groom to room with a rapturous applause, announcing the speeches, providing the wireless microphone for the speeches – the importance of using a wireless microphone is something that is often overlooked and greatly helps reinforce the speeches so the older guests and people sitting not in the direct vocal can hear clearly. 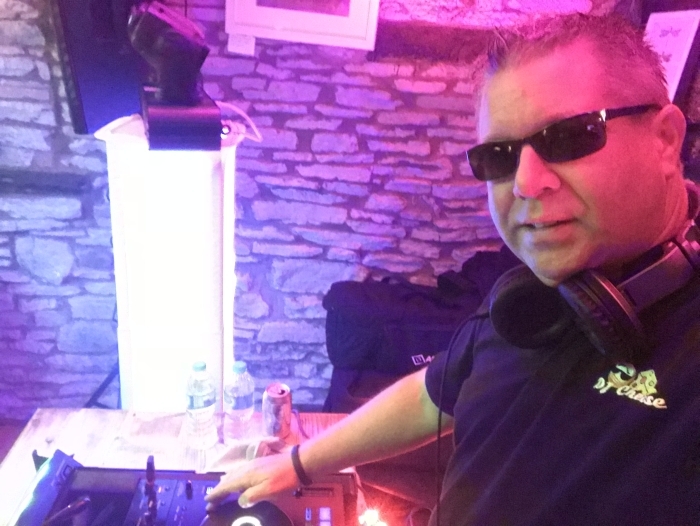 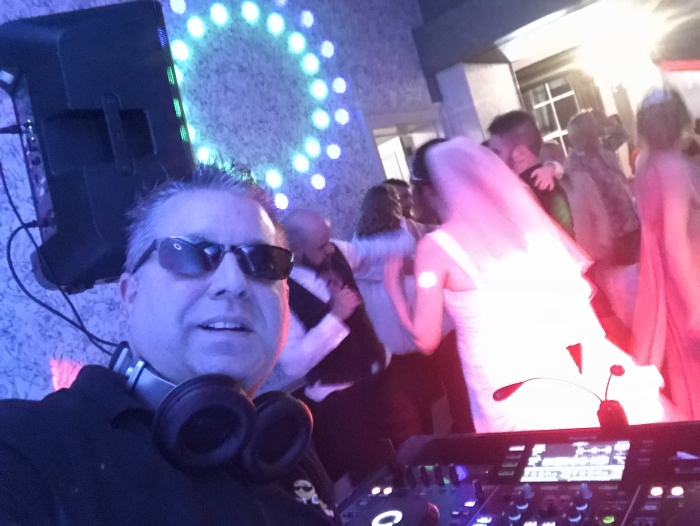 Once we had finished setting up for the evening I decided to produce a quick video just before 1st Dance and the start of the evenings events, it was pointed out to me when I posted this video on Social Media that unusually I was not wearing my sun glasses #DJLife. 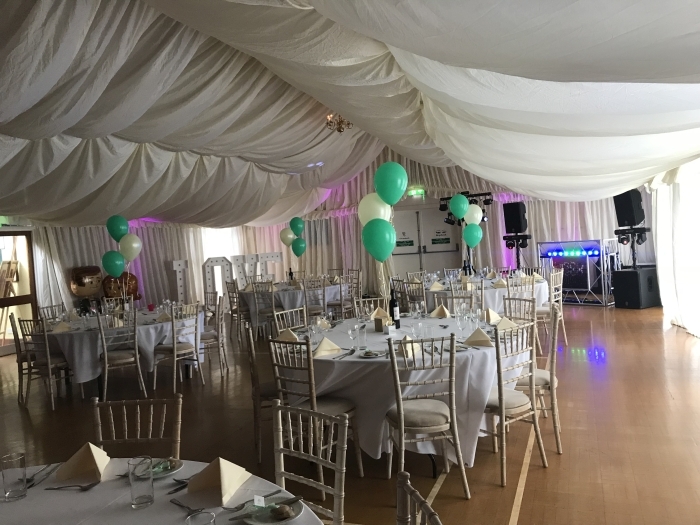 For the Lion Ball Room, because it is upstairs and located on a stage I have a slightly different setup for this venue. 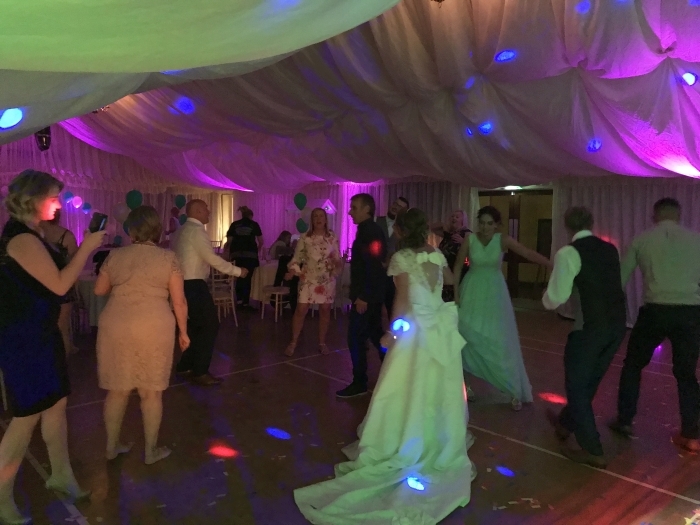 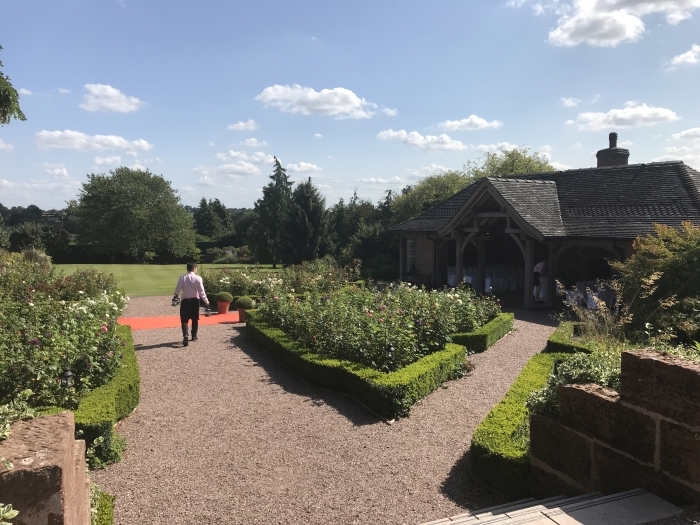 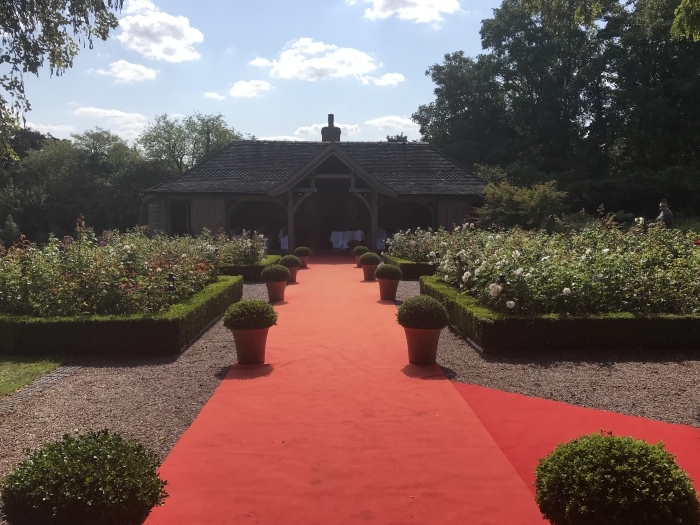 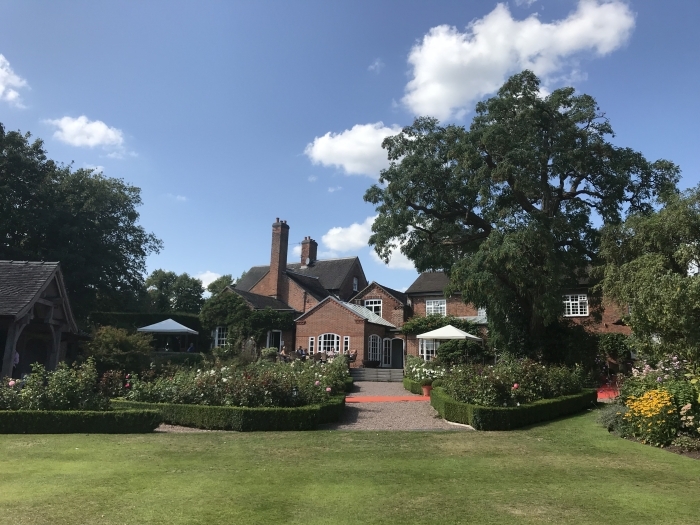 Friday 31st August 2018 was the Wedding of Garry & Julie Webb at the fabulous wedding venue Goldstone Hall Nr Market Drayton Shropshire. 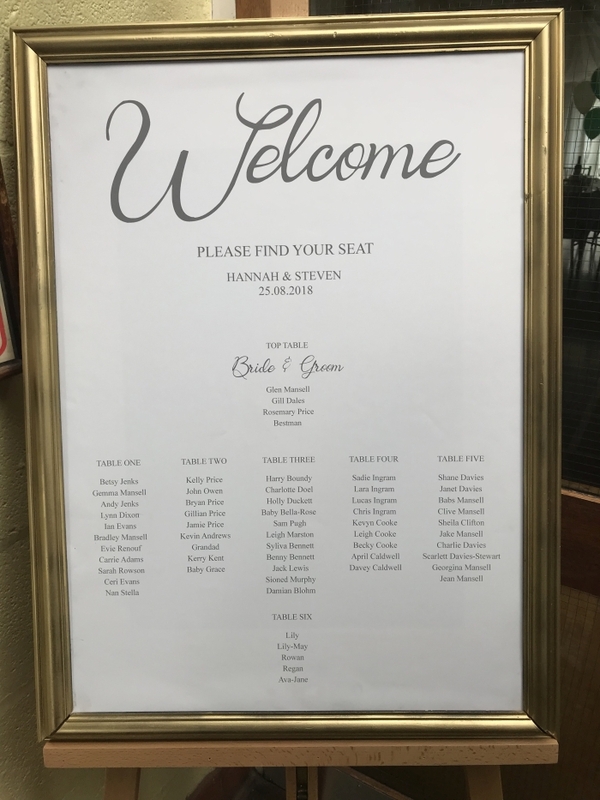 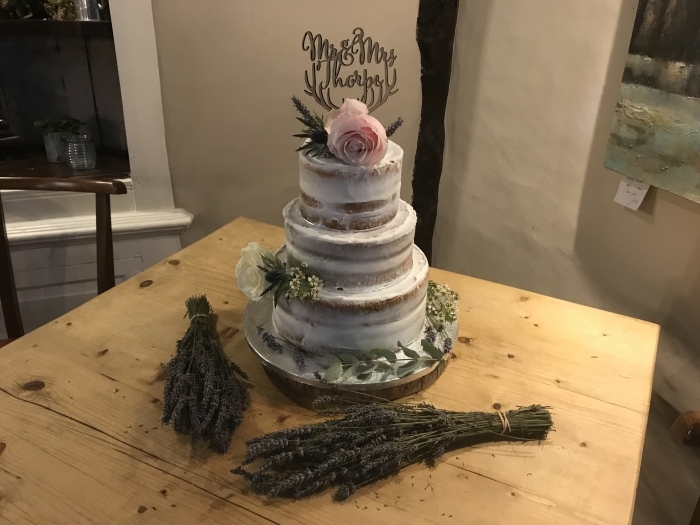 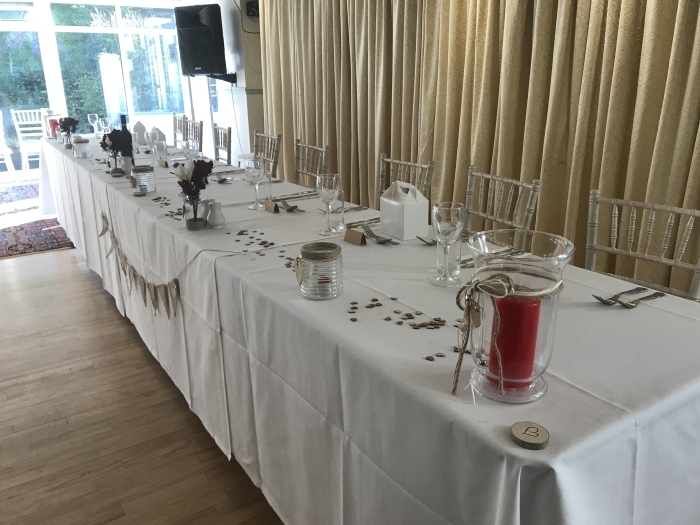 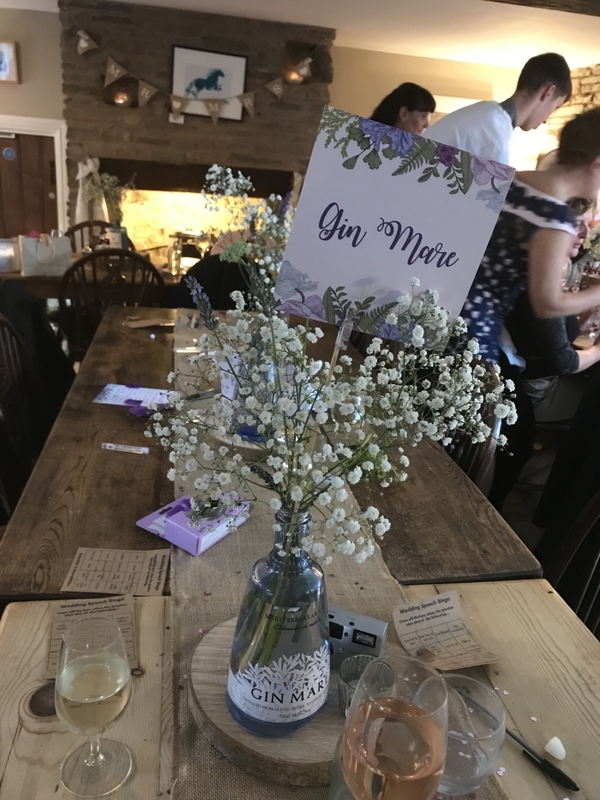 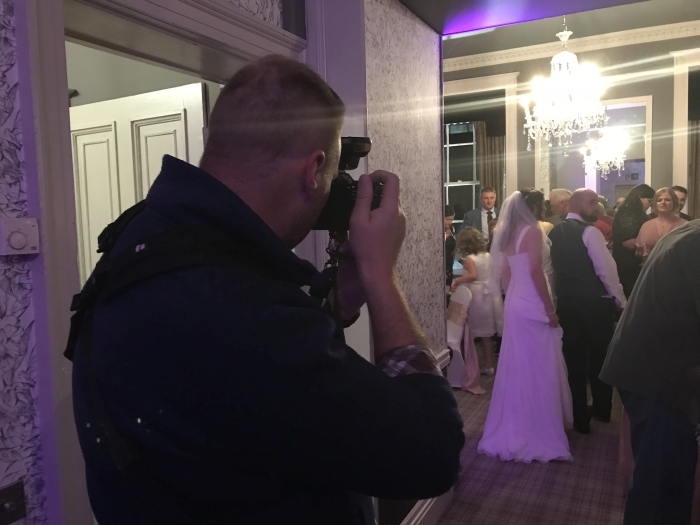 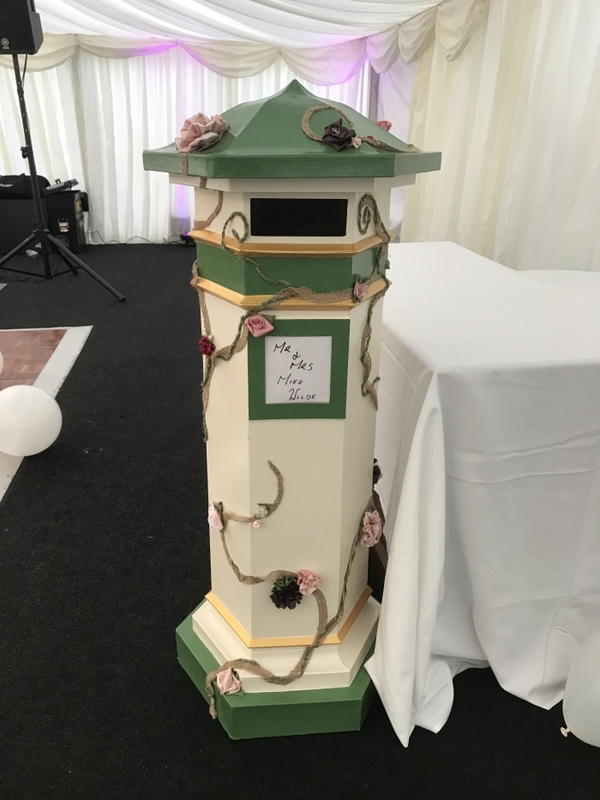 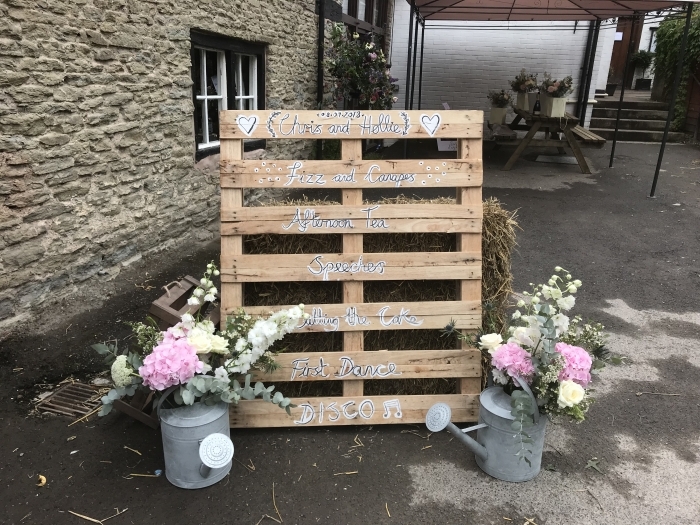 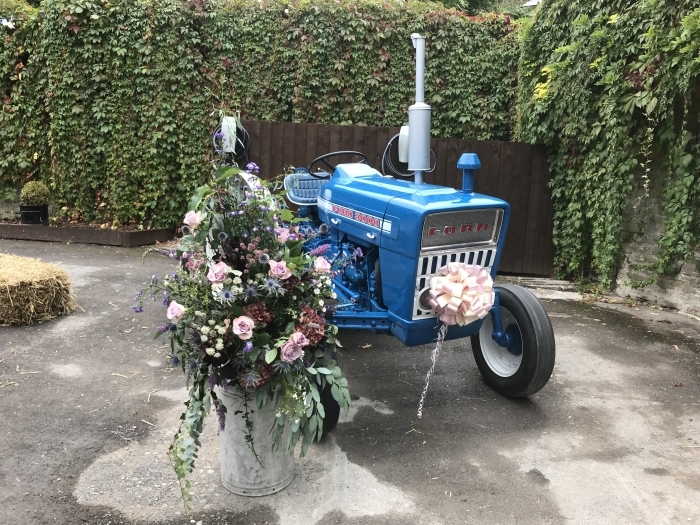 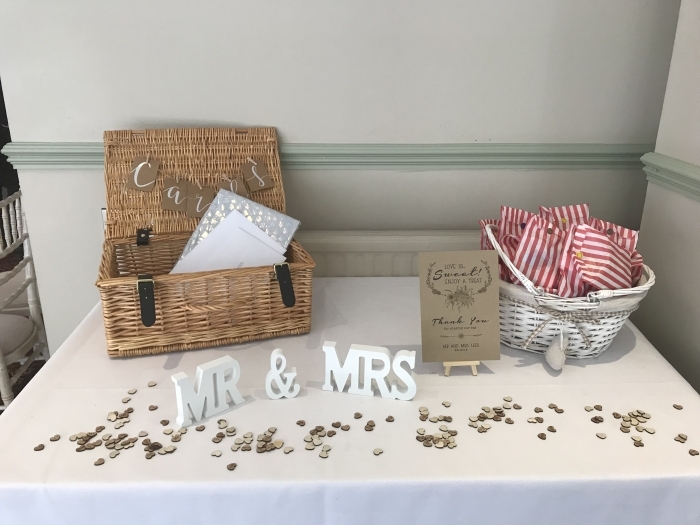 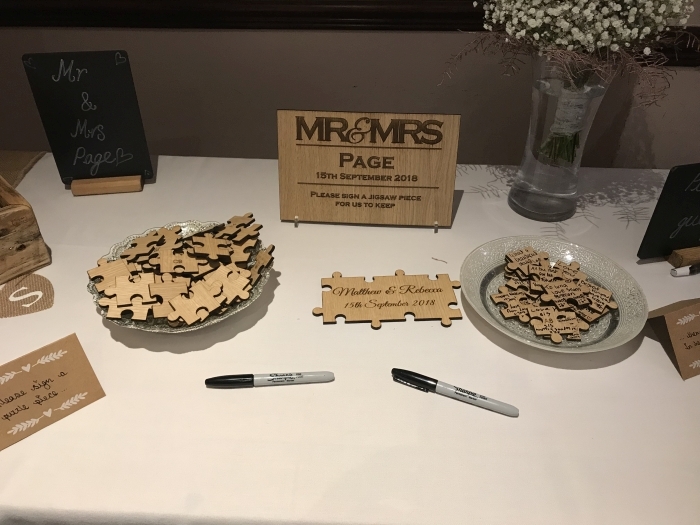 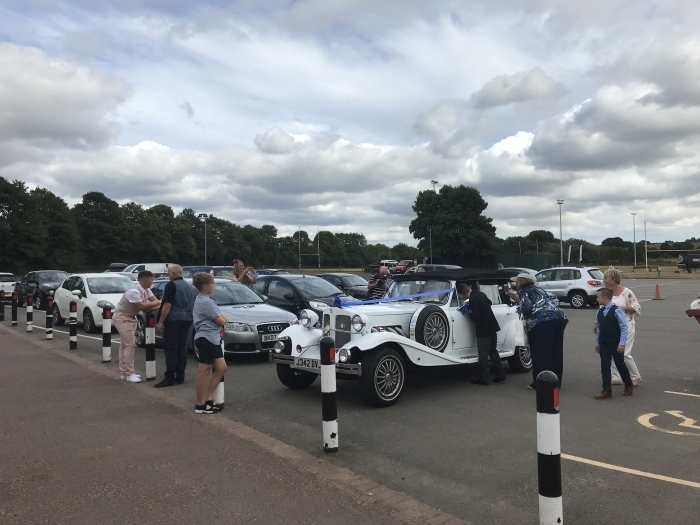 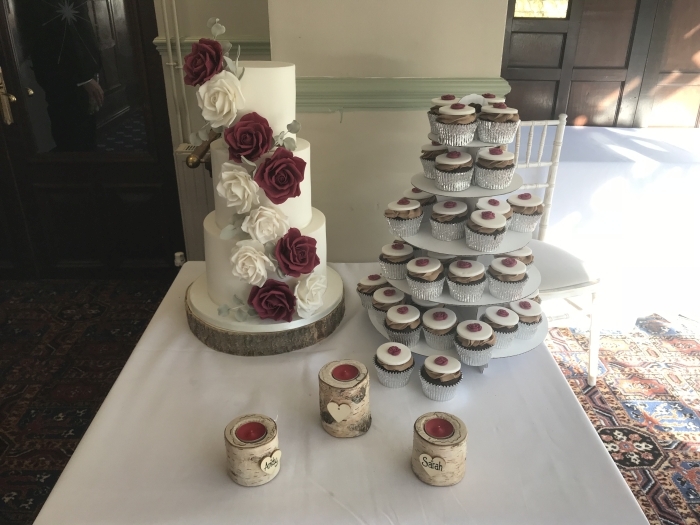 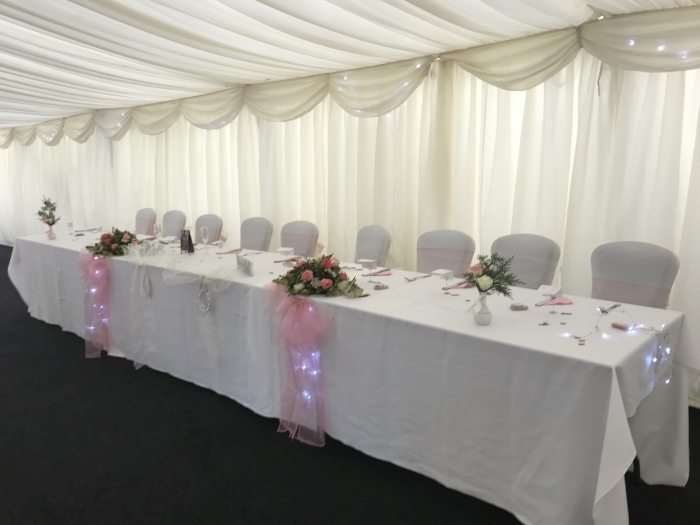 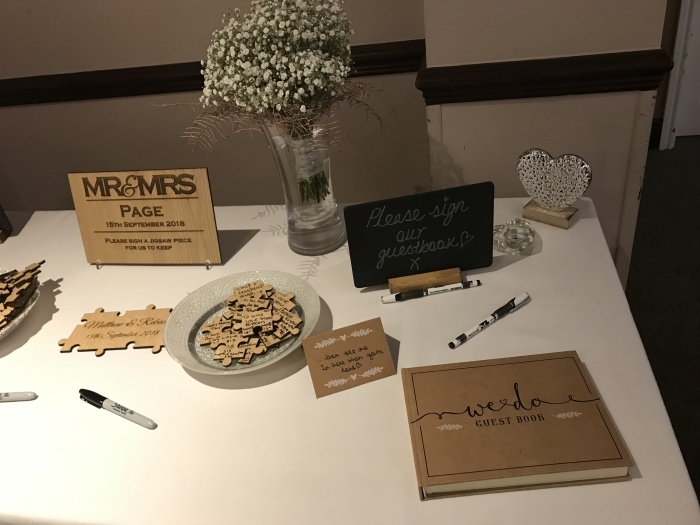 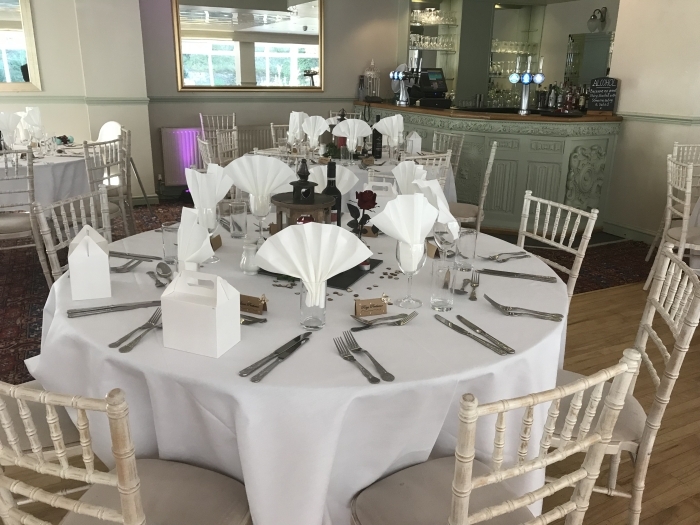 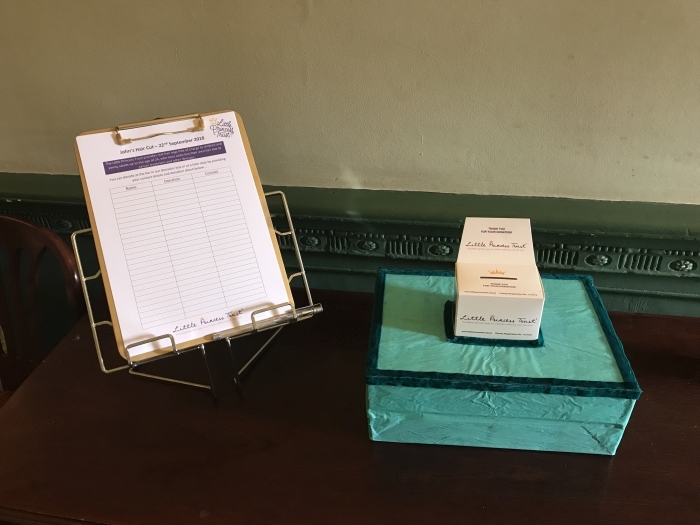 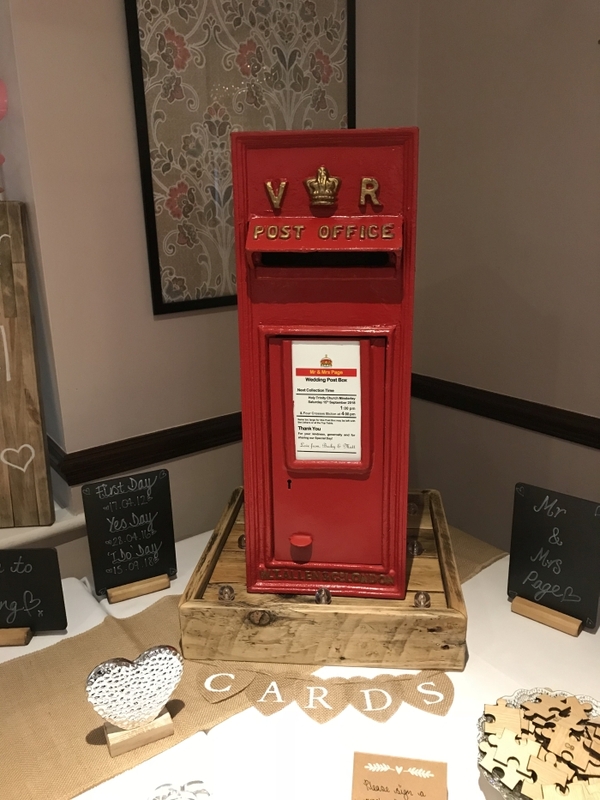 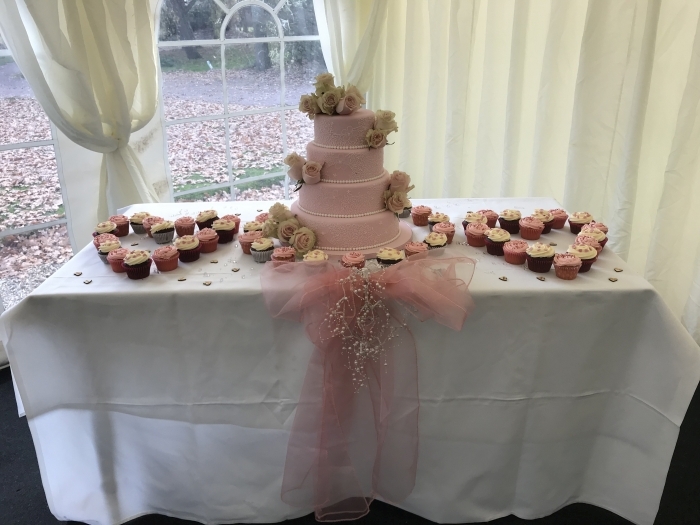 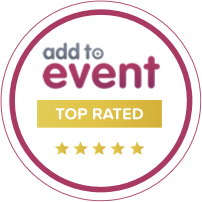 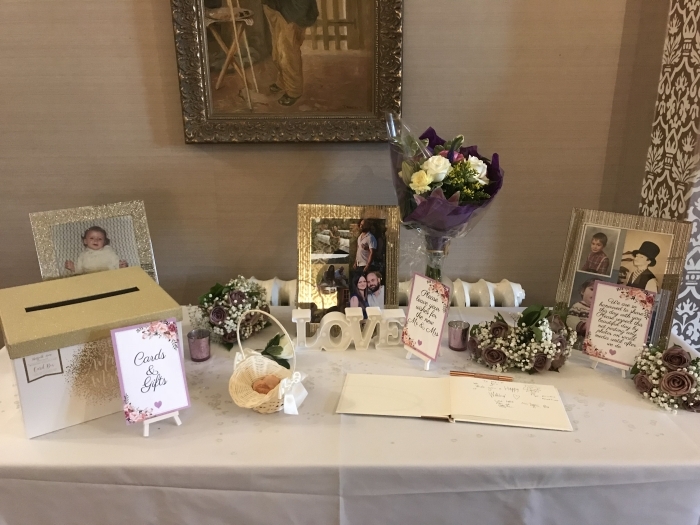 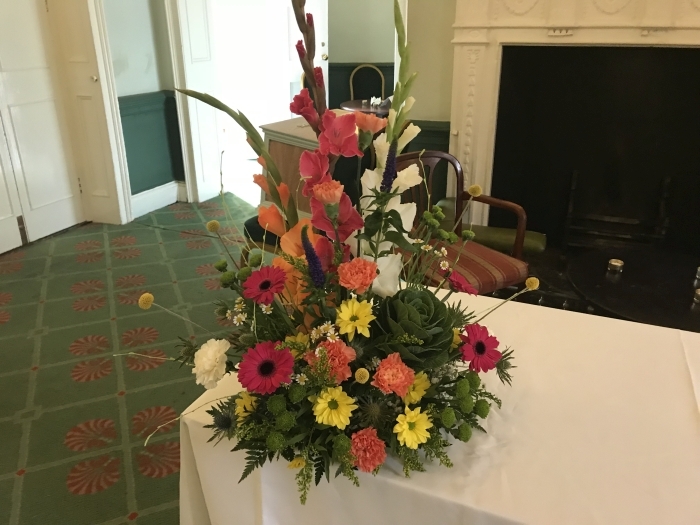 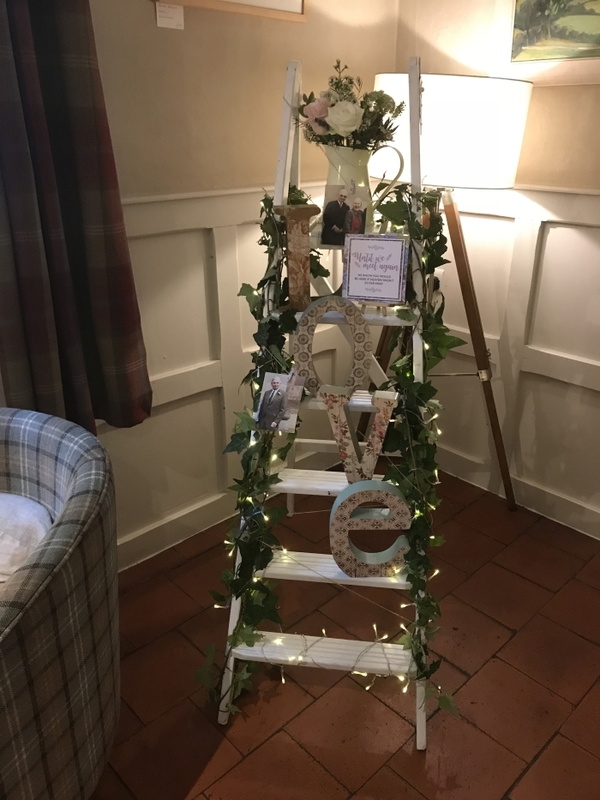 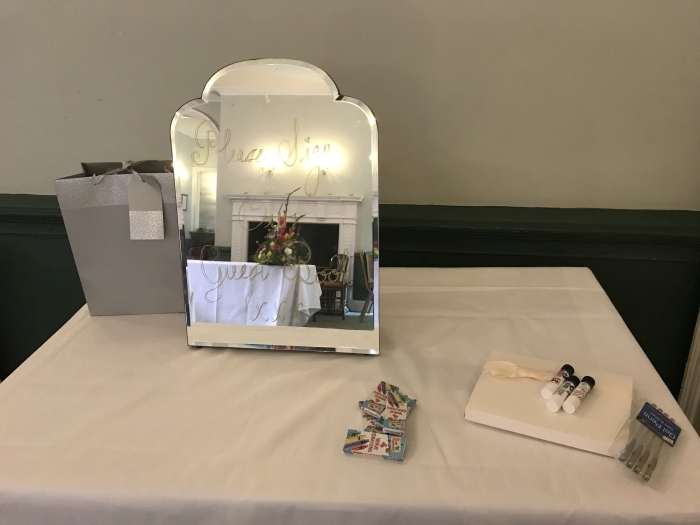 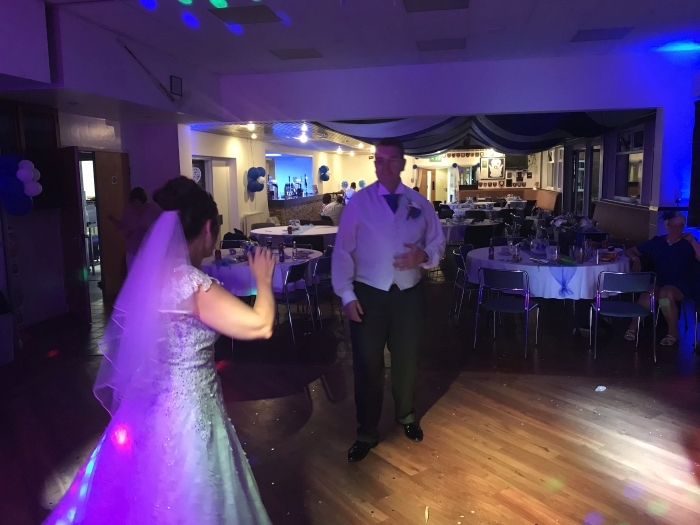 I arrived around 10:30am to setup well in advance of the bride and groom and their guests, Garry & Julie had chosen my evening only package so following setup I headed off for the day and returned at 5:30pm ready for my 6pm start through to 12:30. 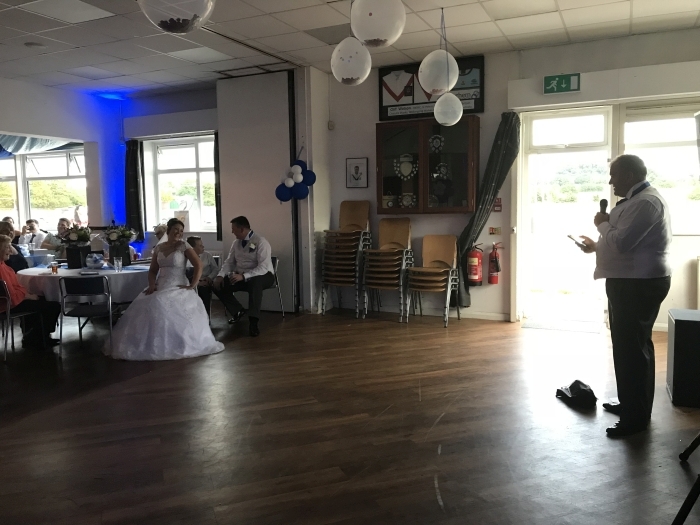 Once I had finished setting up I decided to produce a quick video showing the venue and the setup. 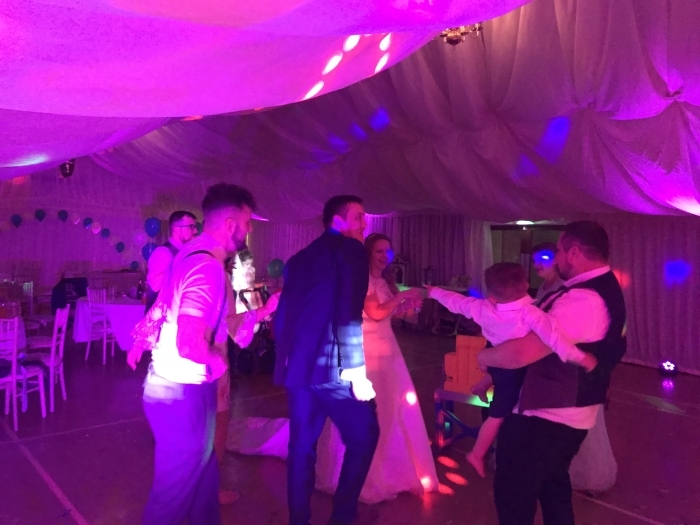 Goldstone Hall Wedding DJ – Time to party! 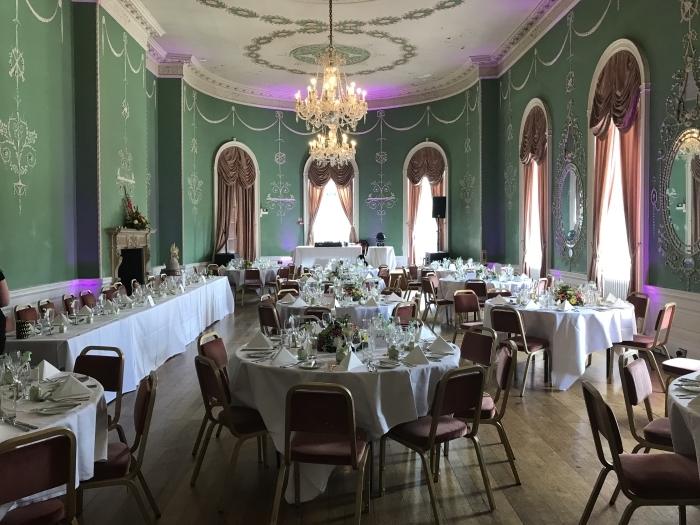 The room which I setup in was located in the centre of Goldstone Hall with other rooms coming off it. 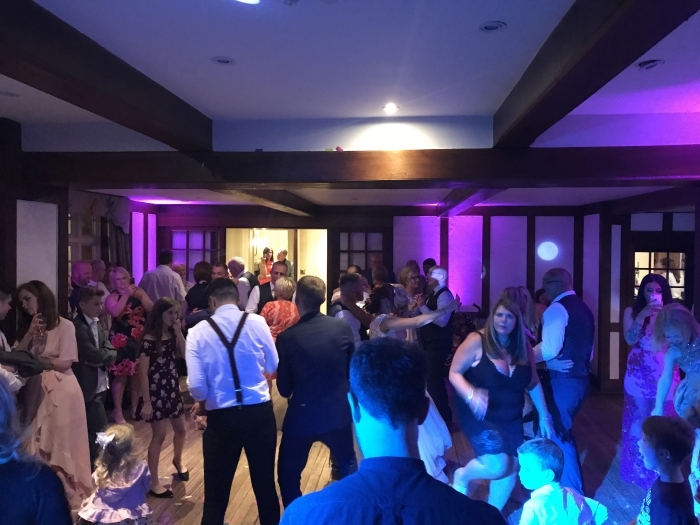 I was able to put mood lighting around the room to provide a great ambiance. 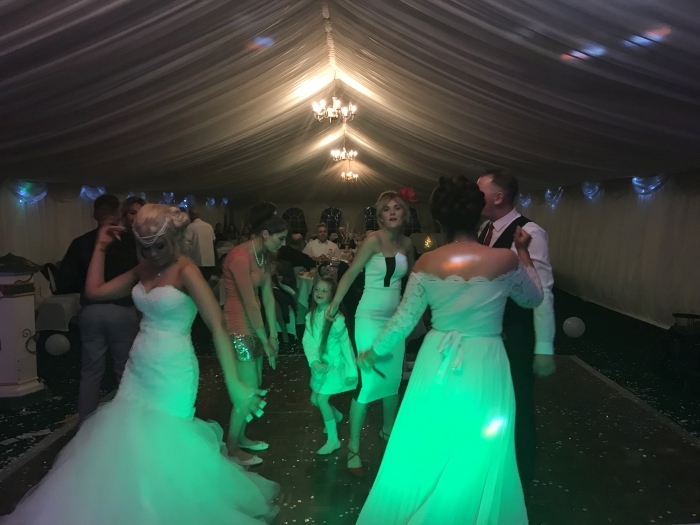 This photo reminds me of the Wedding at Goldstone Hall Market Drayton Shropshire. 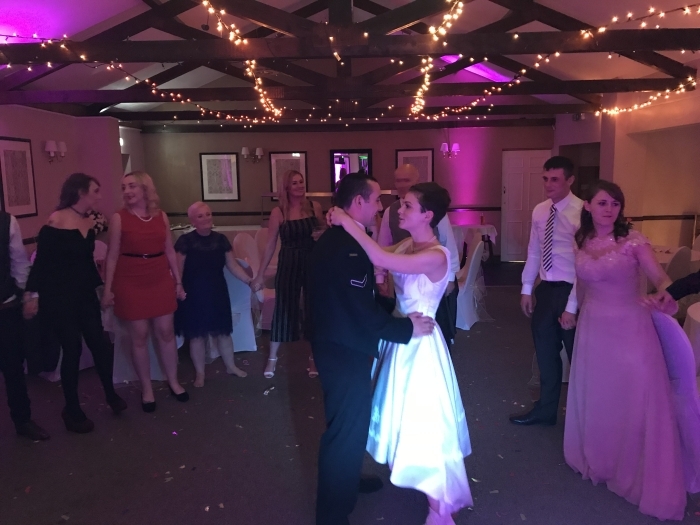 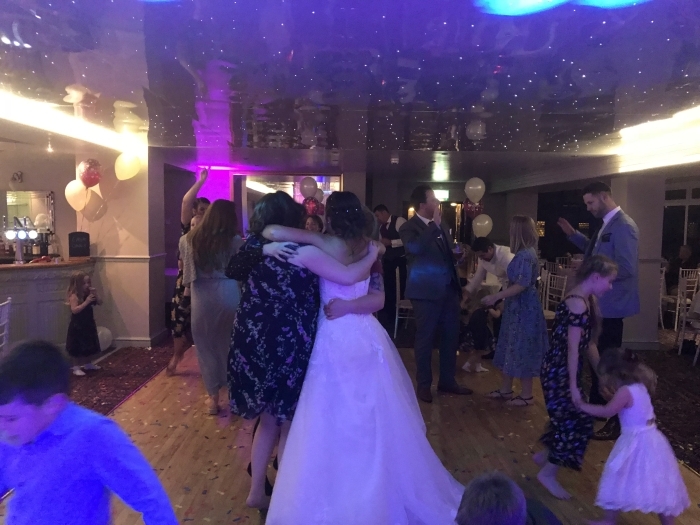 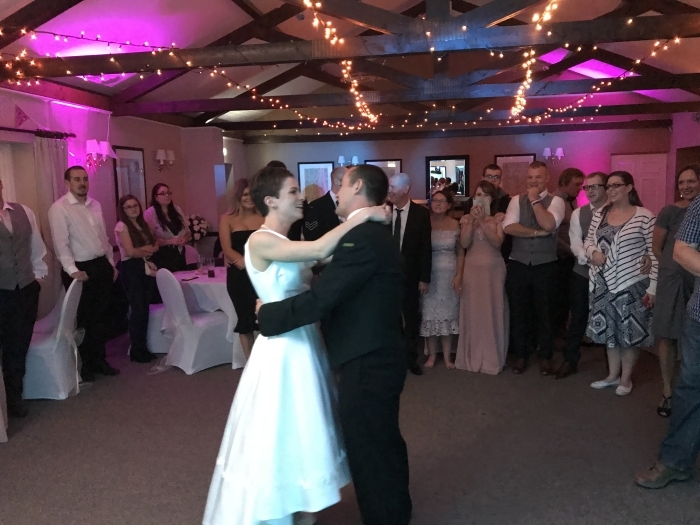 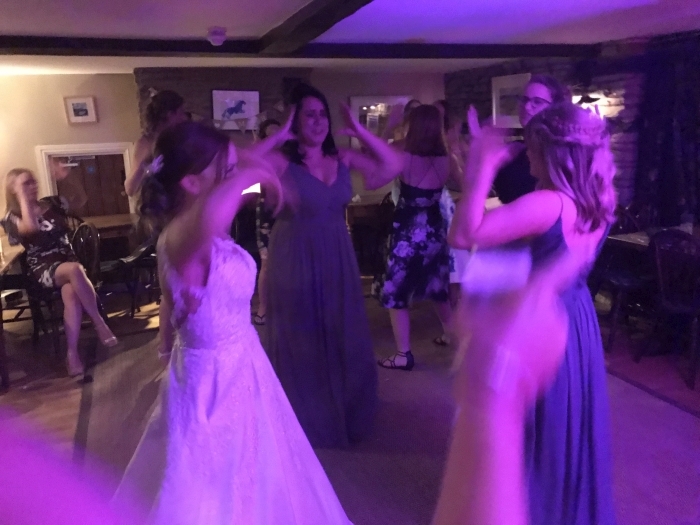 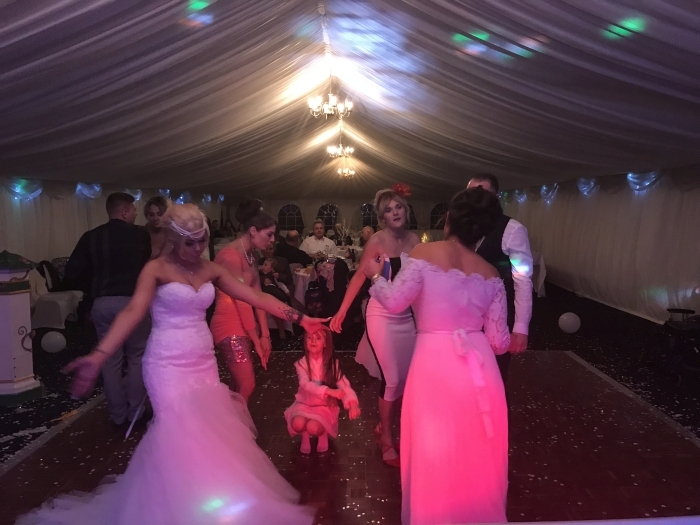 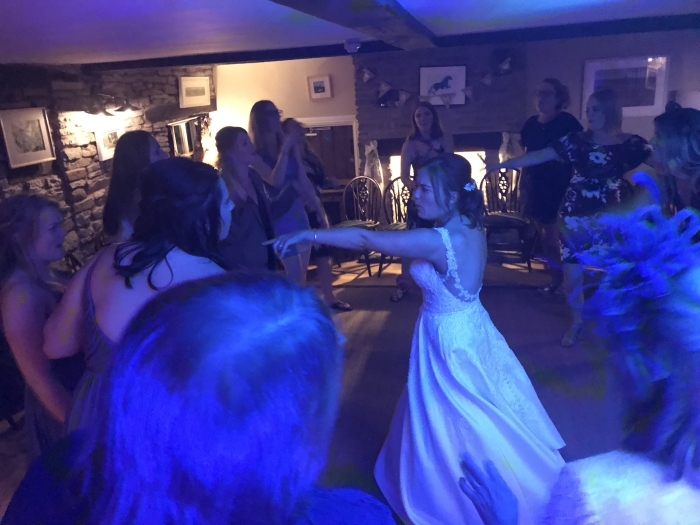 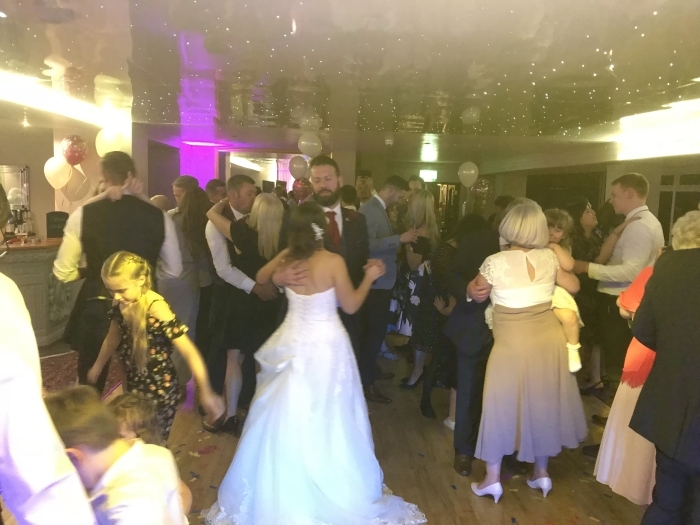 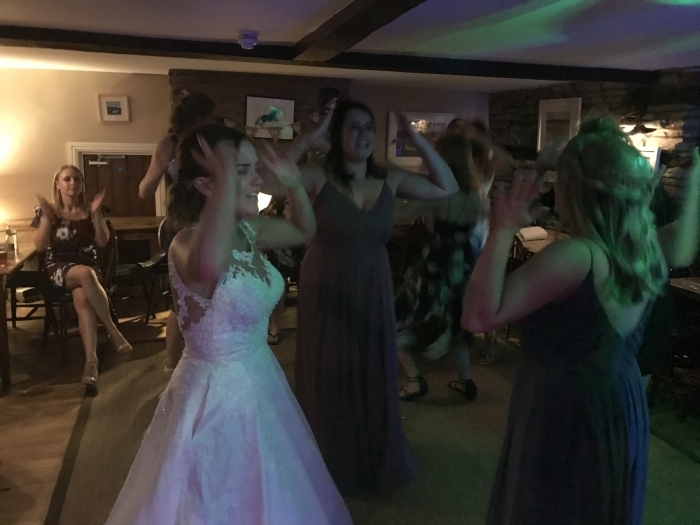 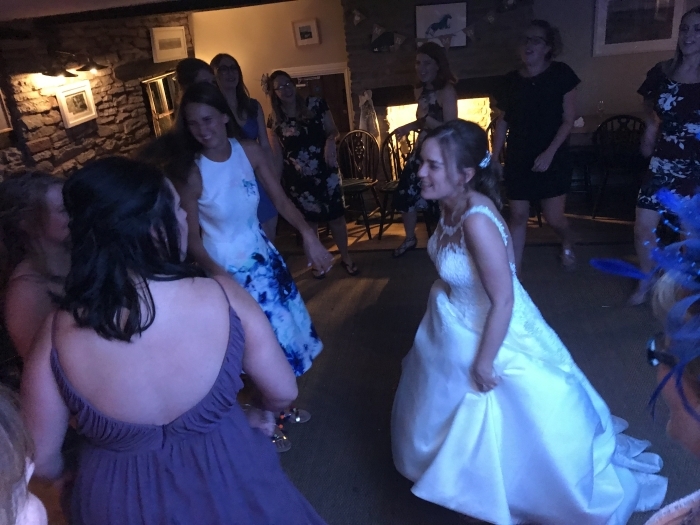 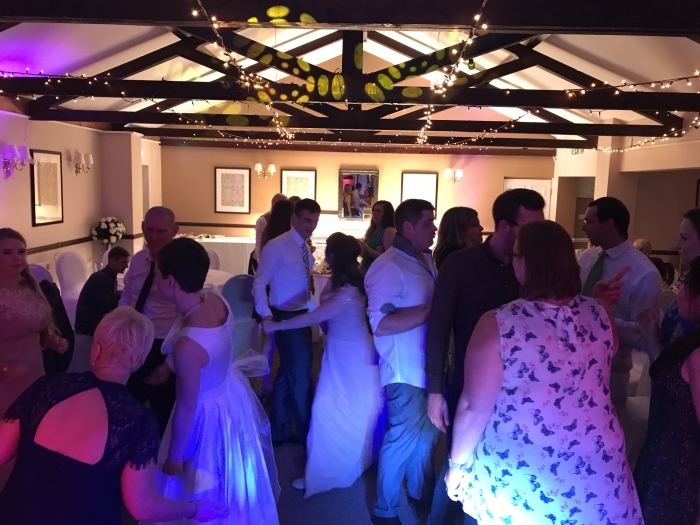 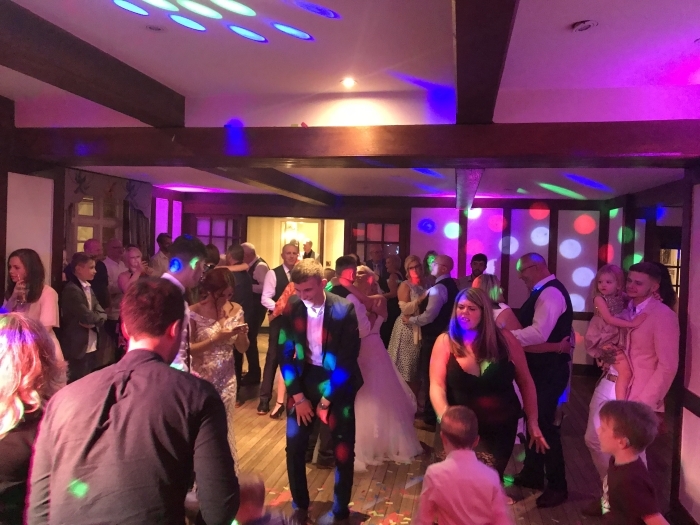 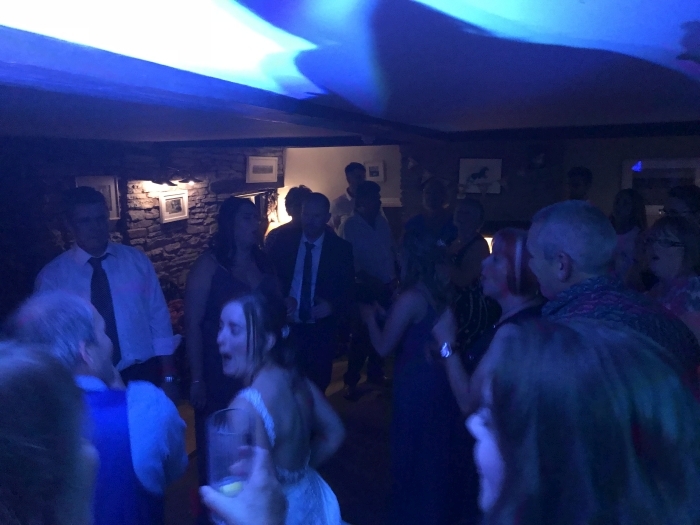 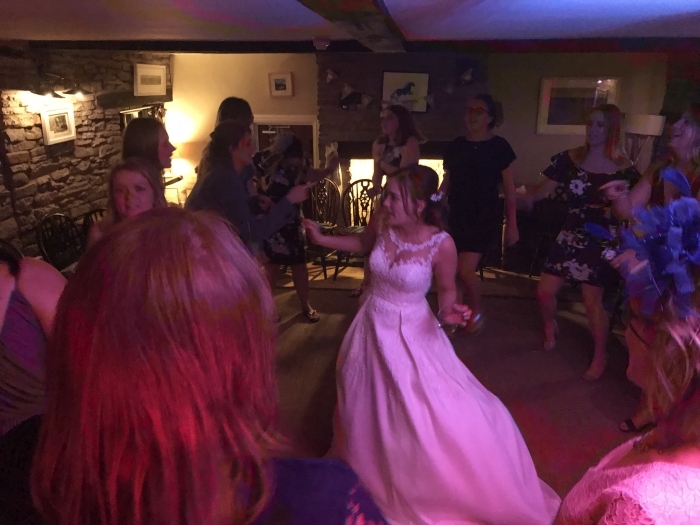 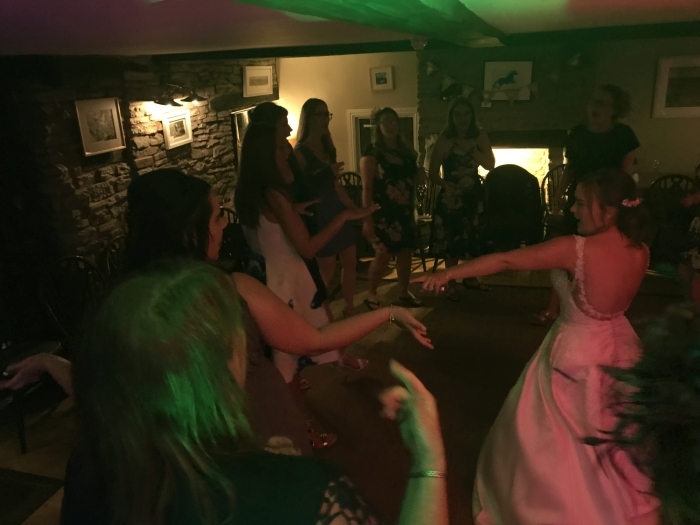 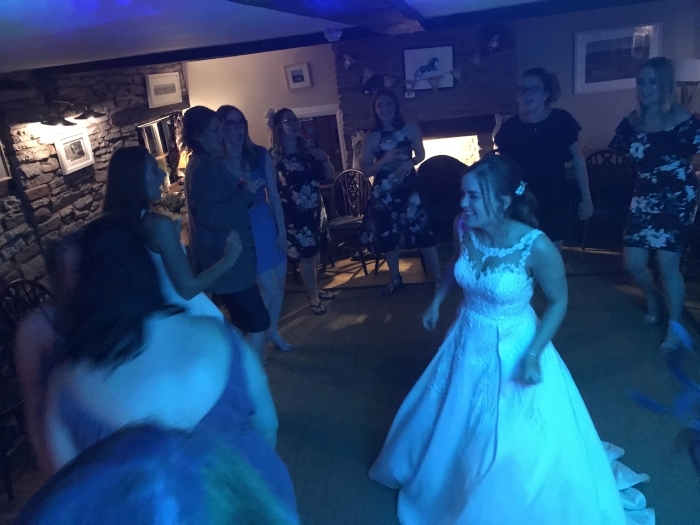 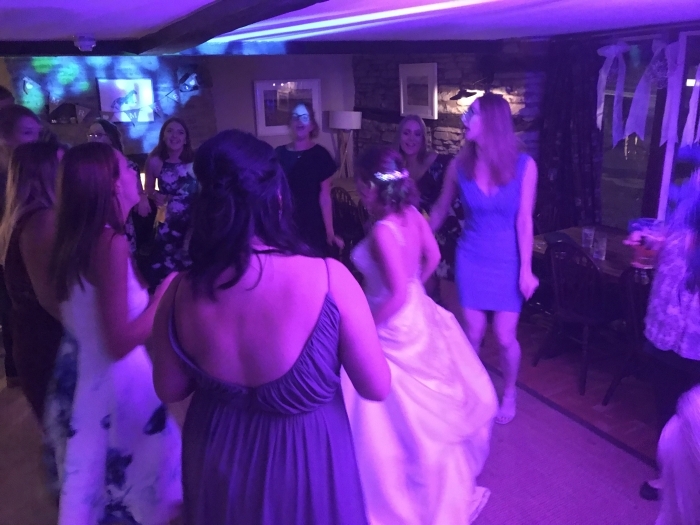 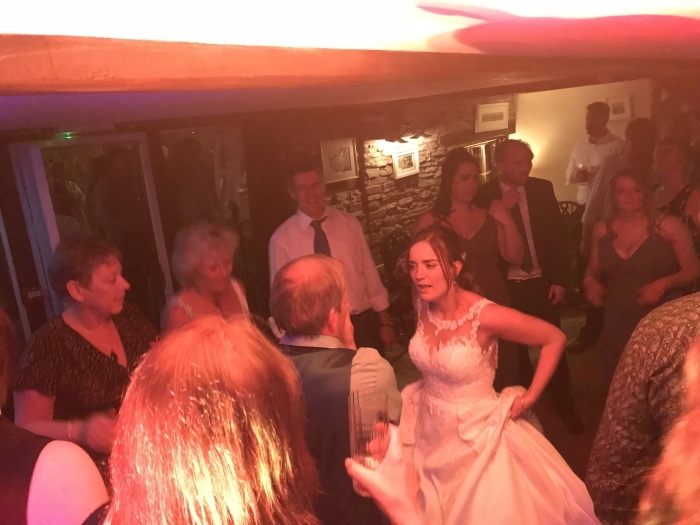 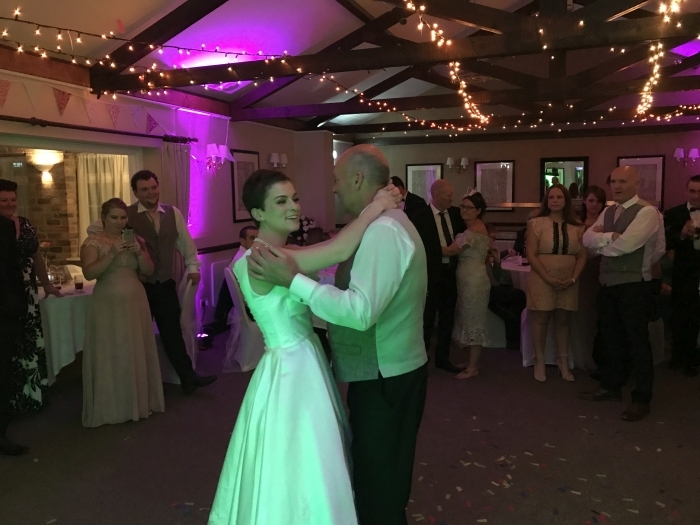 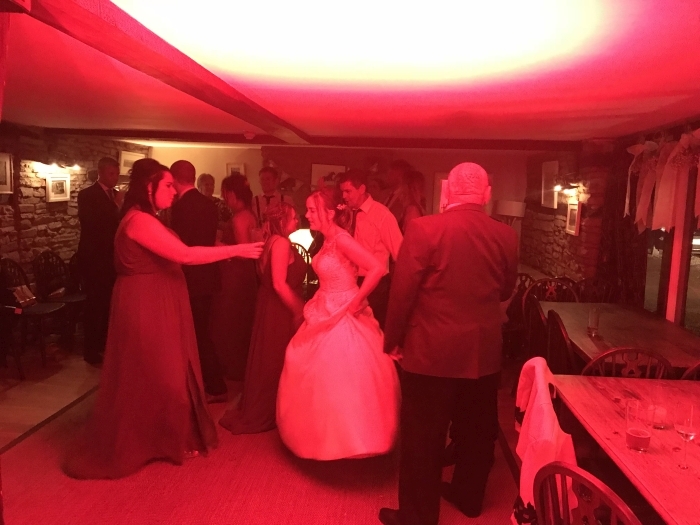 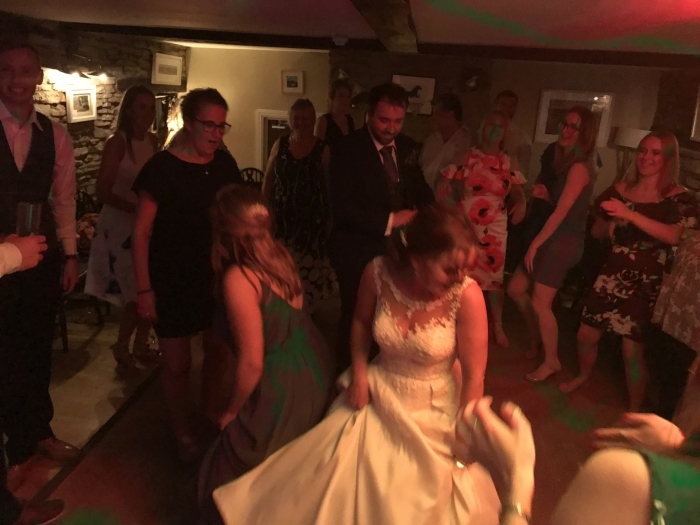 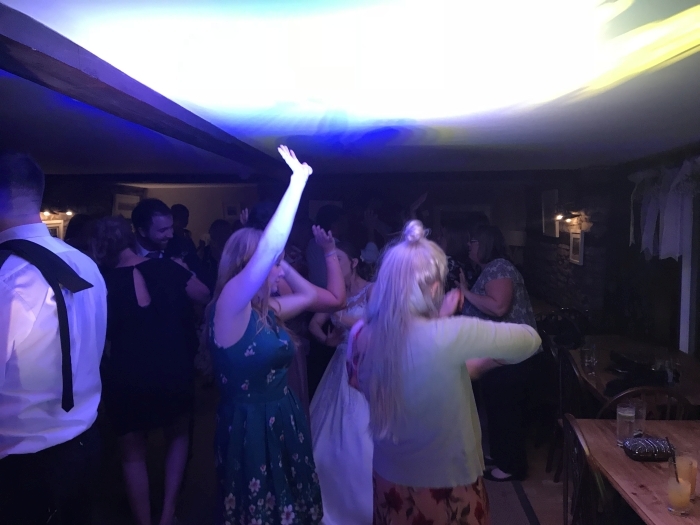 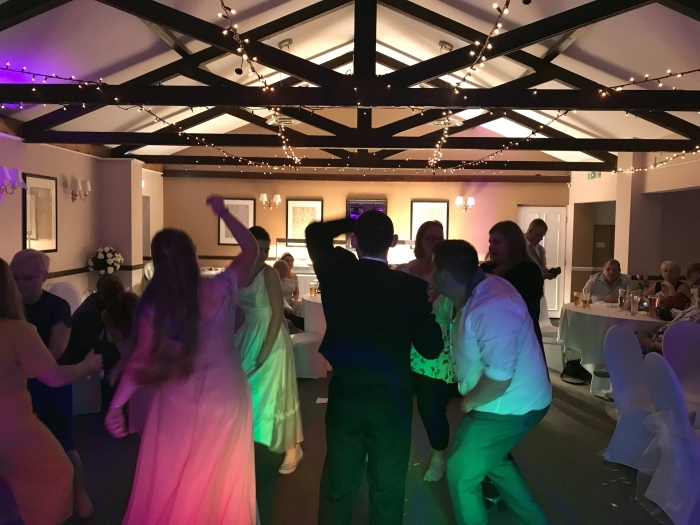 Saturday 25th August 2018 was Steven & Hannah’s wedding at Forden Village Hall Powys and I was asked to provide my Wedding DJ services. 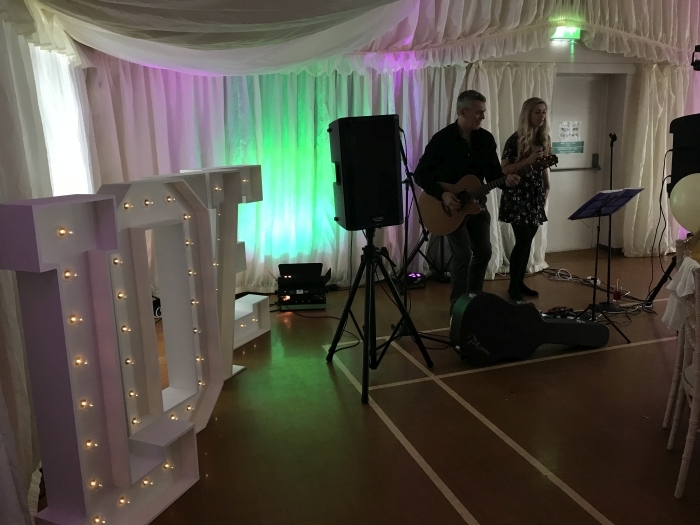 Working along side the fabulous Acoustic Duo of Sarah and Martyn in the late afternoon and then a 4-piece band in the evening this wedding had a lot of great music setting for an inviting and memorable atmosphere. 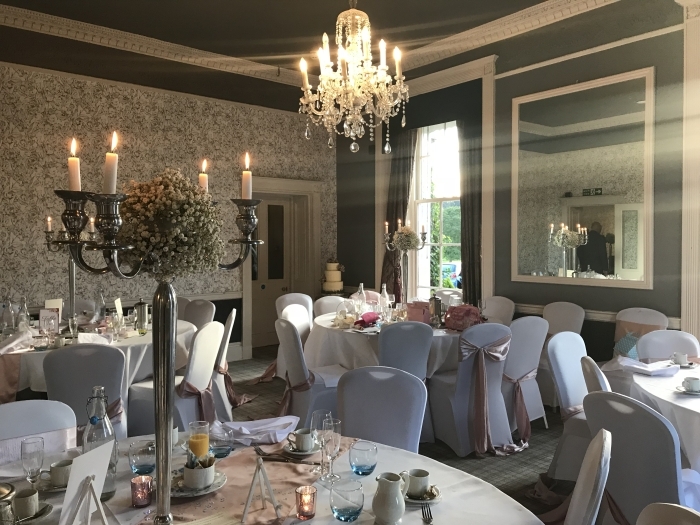 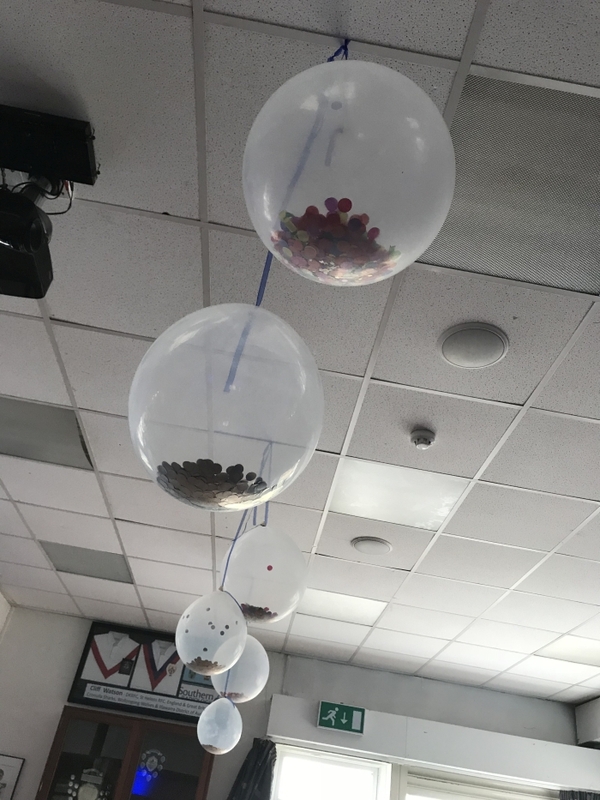 I decided to setup at 9am the morning of the wedding as that way everything was in place and ready prior to any guest arrival, additionally allowing the Bride and Groom to benefit from the room mood lighting being in place throughout the day and night. 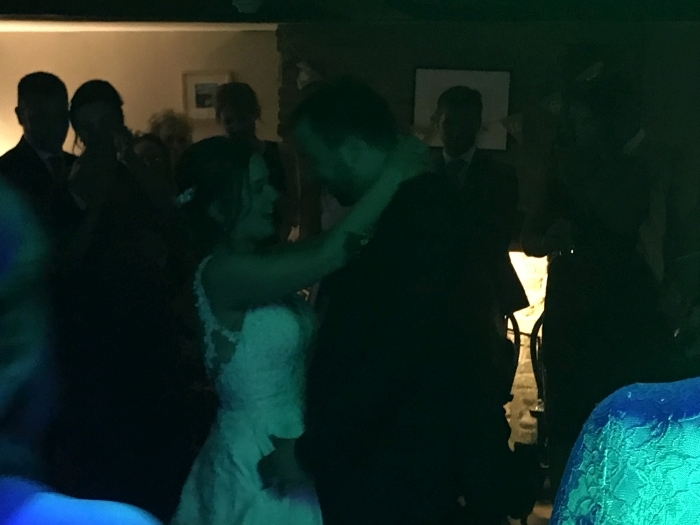 Upon arriving at 5:30pm the speeches were just underway, quickly followed by Sarah and Martyn’s last set. 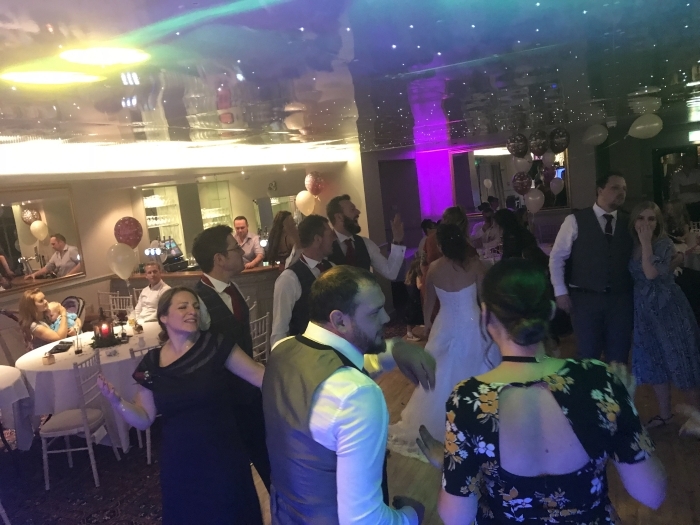 Once completed I started my first set with some upbeat background music, I decided to DJ that set properly opposed to simply putting on a play list as it allowed me to tailor the music to the guests and sure enough within a couple of tunes we had people on the dance floor. 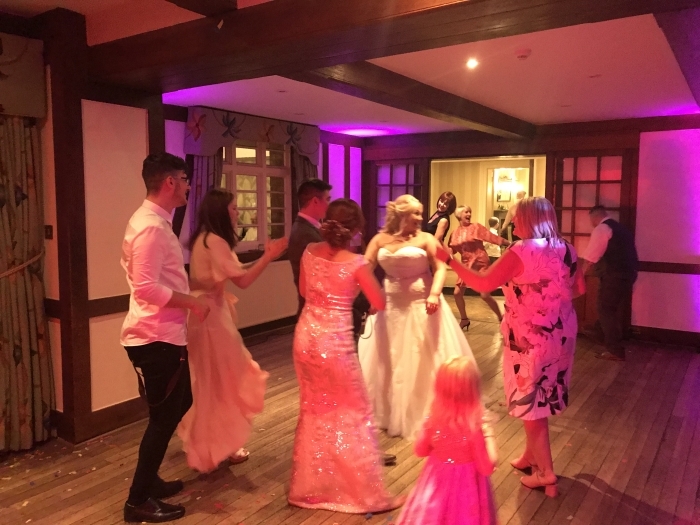 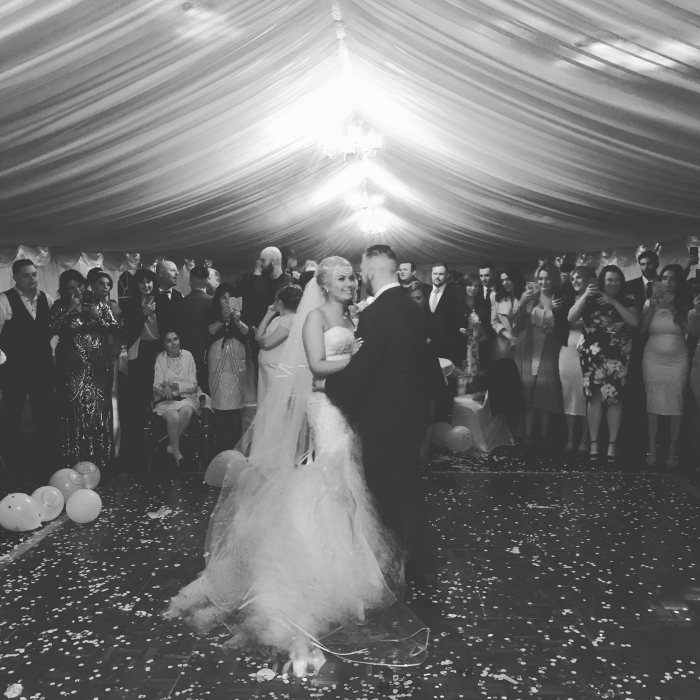 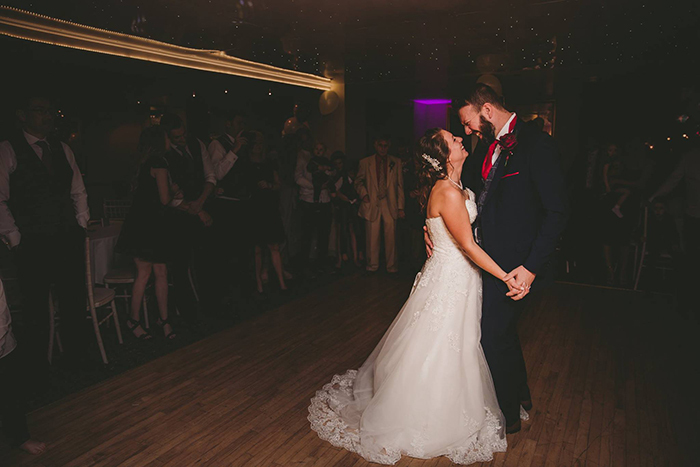 At 8pm the bride and groom had their first dance with all their friends and family up around the dance floor making it a truly magical first dance. 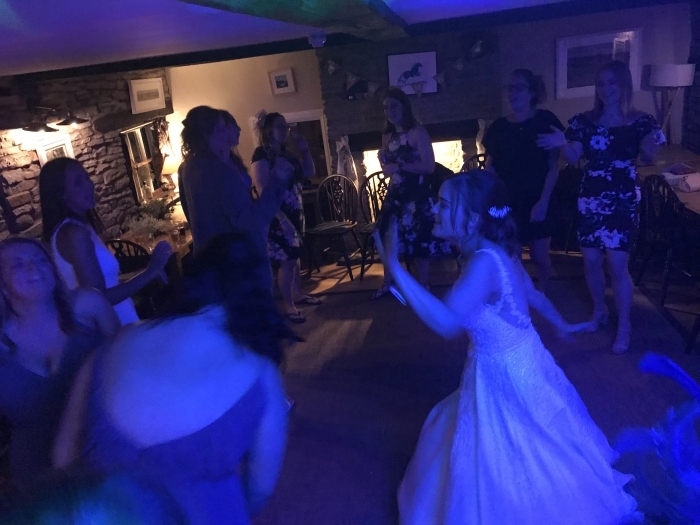 Following the first dance I moved into an upbeat set of wedding dance floor fillers keeping the floor busy for the next 20 minutes whilst the band finished setup and then took over. 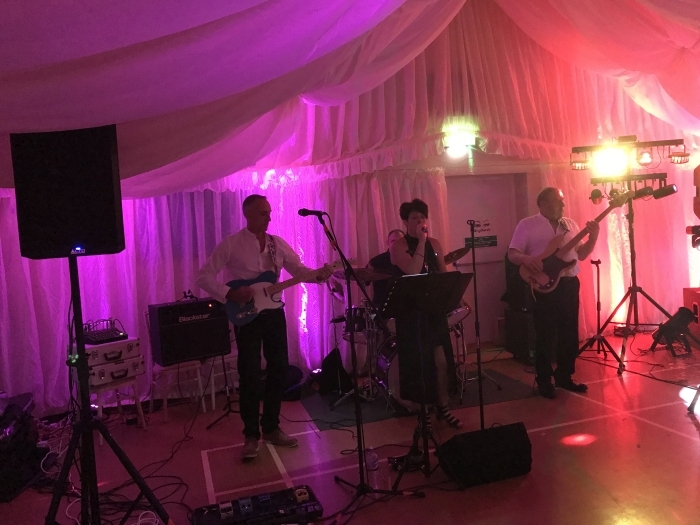 The band (Unfortunately I did not get their name!) 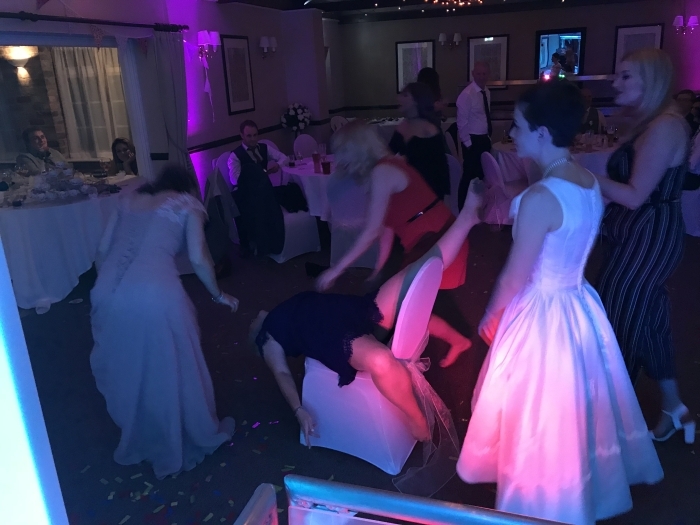 first set was for 1 hour so I took a short break. 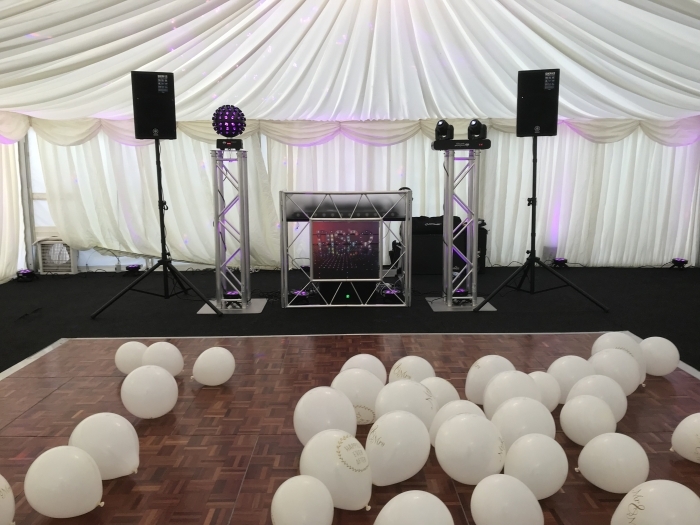 Returning for the bands intermission to do another DJ set for 20 minutes and then taking over following their last set through to 1am. 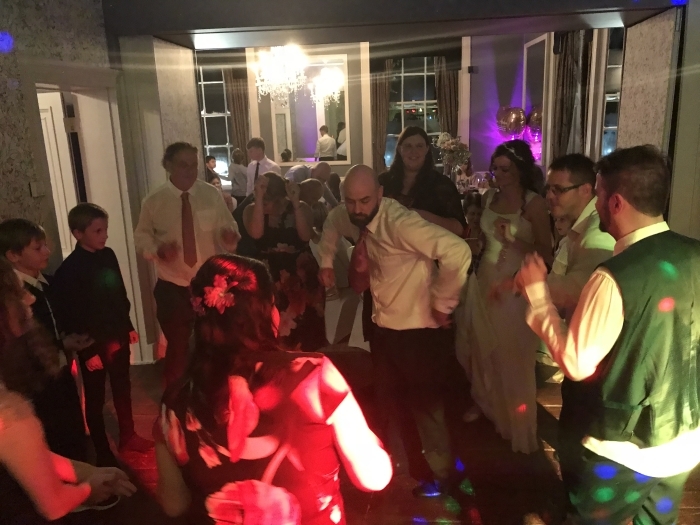 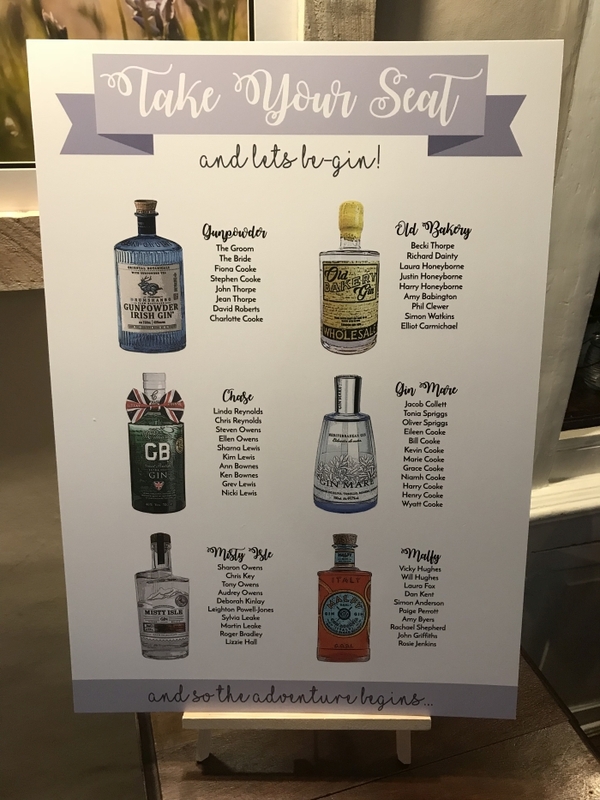 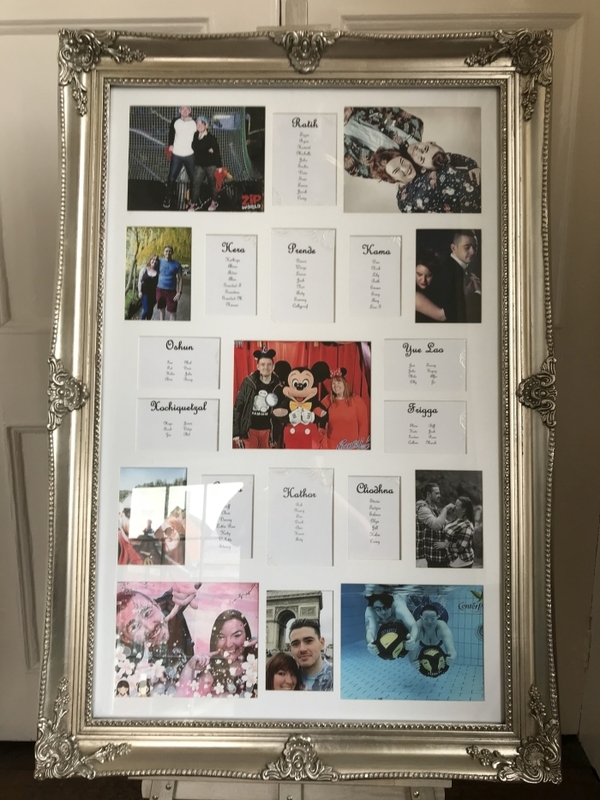 Having meet with Steven and Hannah prior to the wedding I knew exactly what they wanted me to play at the various points of the wedding and this helped ensure I delivered exactly what they wanted. 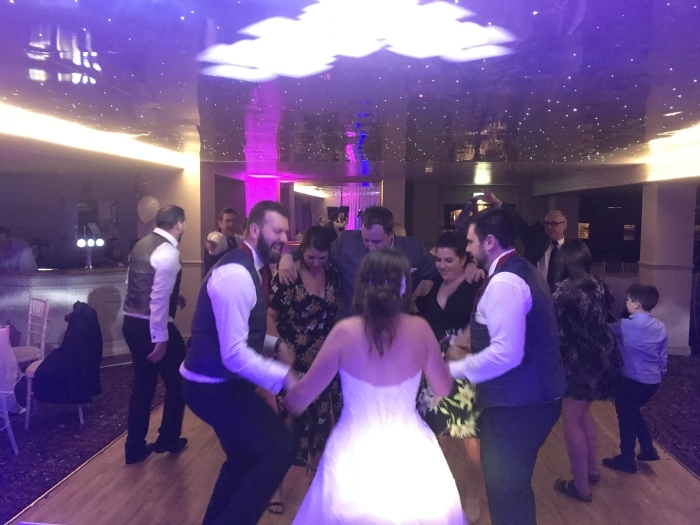 Both Steven and Hannah did ask me during the evening to repeat a couple of their favourite tunes again during the last hour which I was only too happy to do, it was their wedding day! 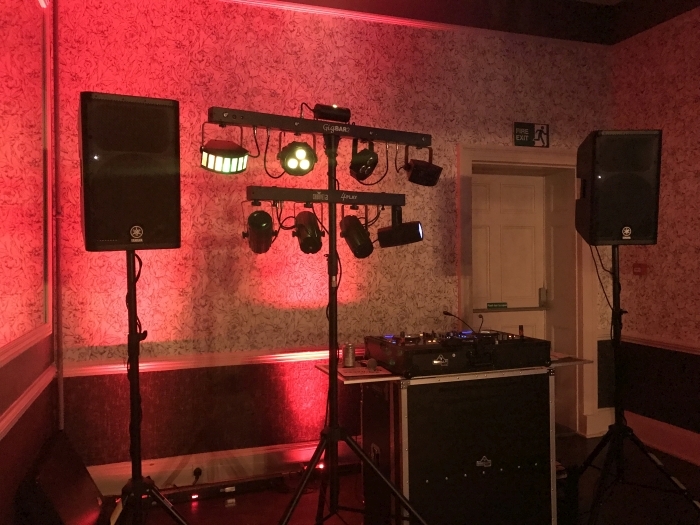 Once I had finished setting up the DJ Equipment and Lighting I produced this short video. 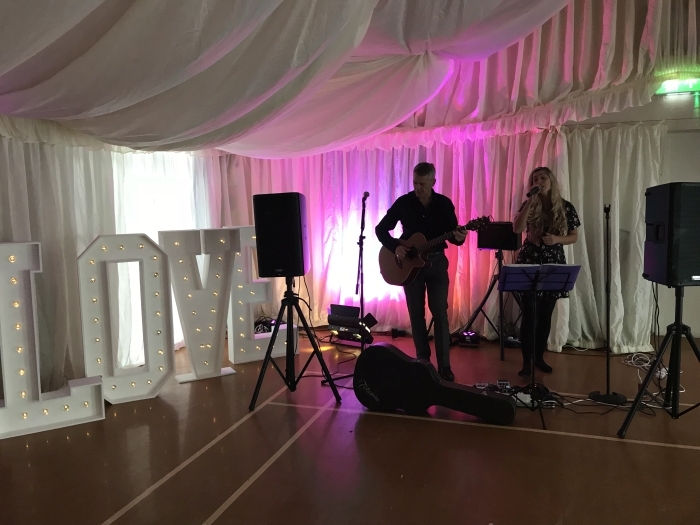 These pictures are of the Wedding DJ Setup used, room, Acoustic Duo and Band. 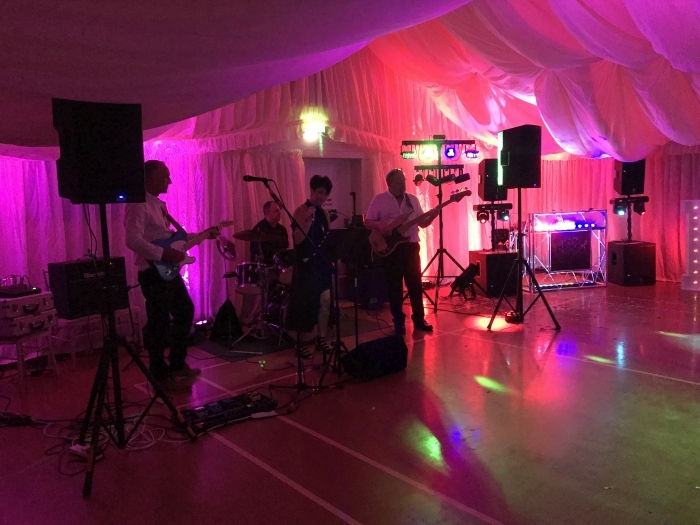 I switched on all my DJ Lights for the band so it provided that extra visual wow factor. 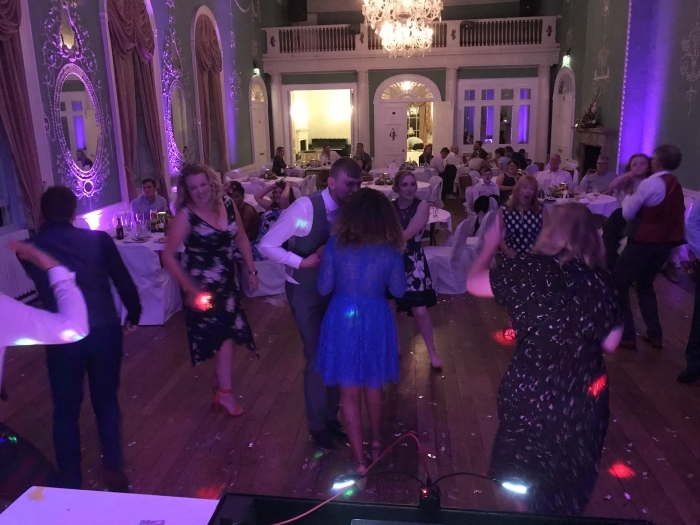 During the evening I took a couple of pictures from the Wedding DJ Booth, unfortunately I did not get any of the first dance or during the first dance when I fired the confetti cannon! 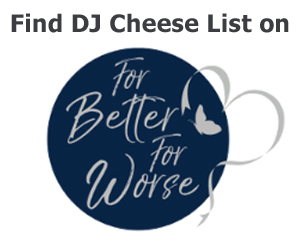 I’m just too busy at that point. 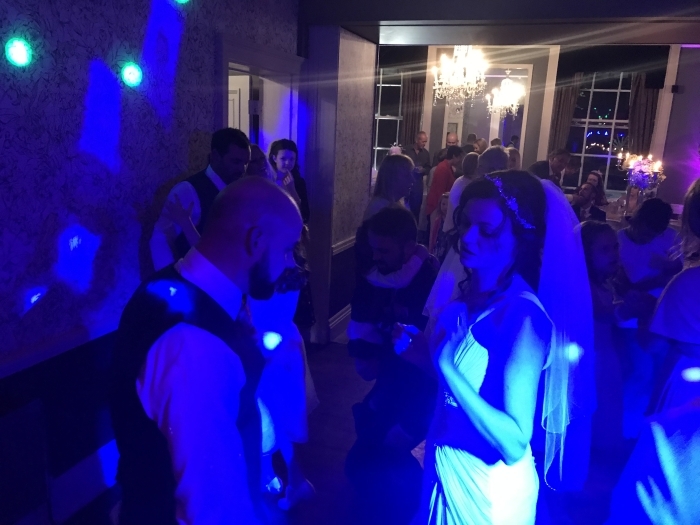 This is a picture I took during the Wedding that shows off the lighting I provided really well. 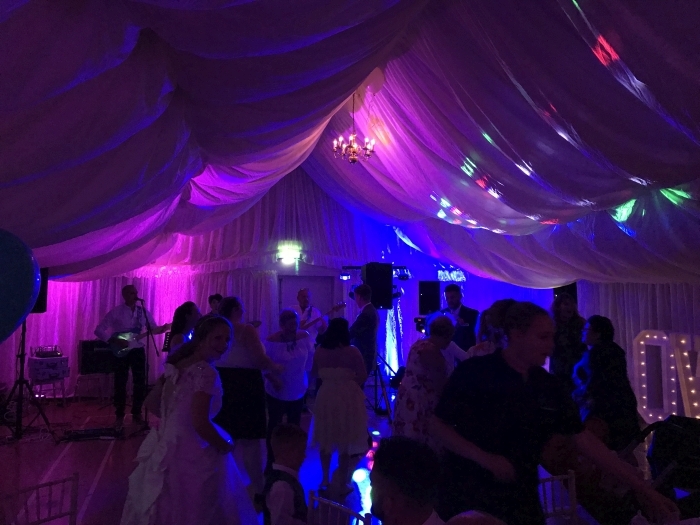 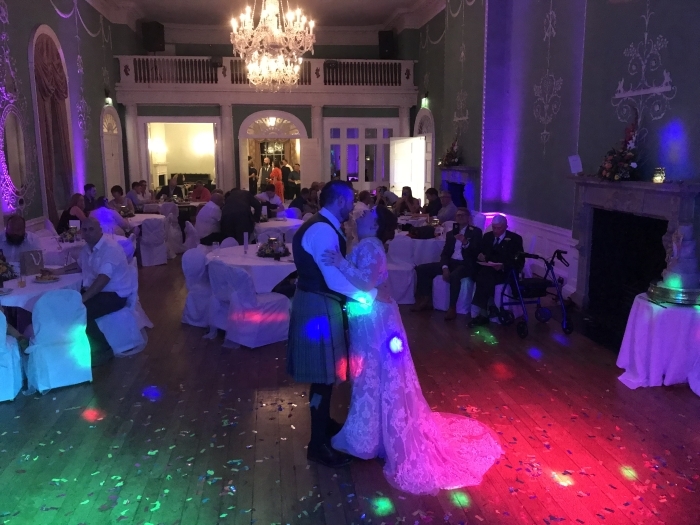 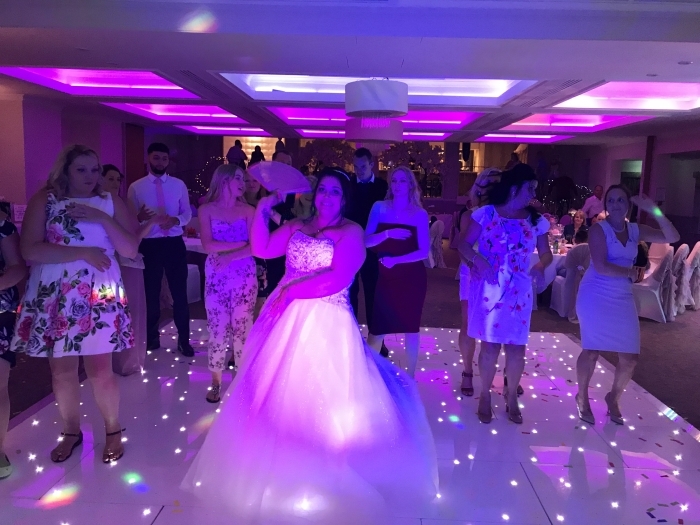 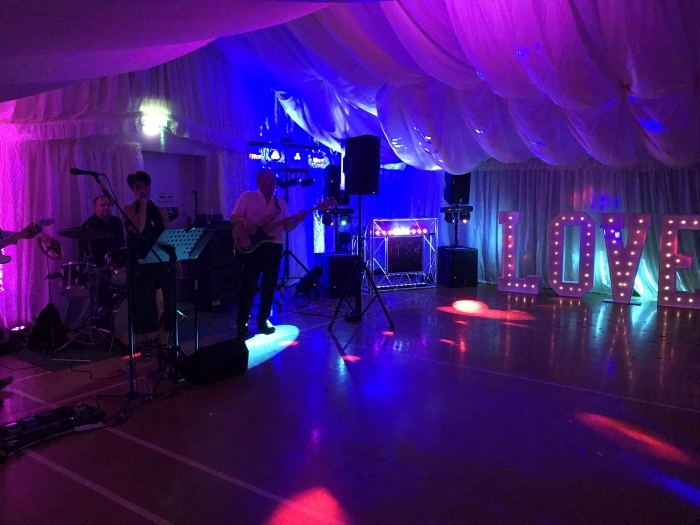 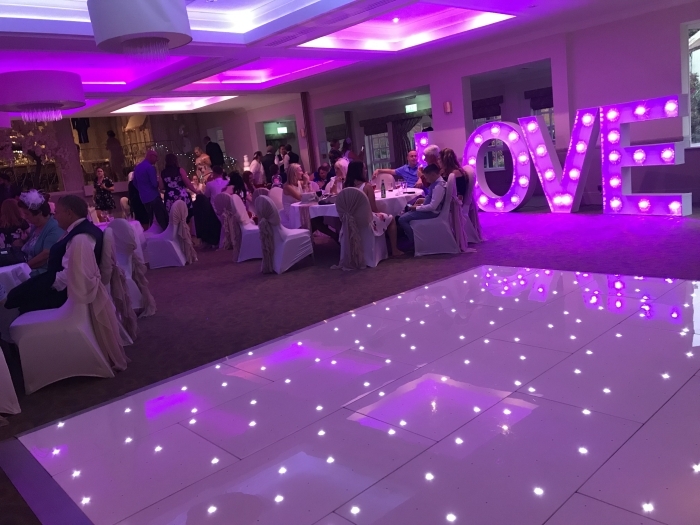 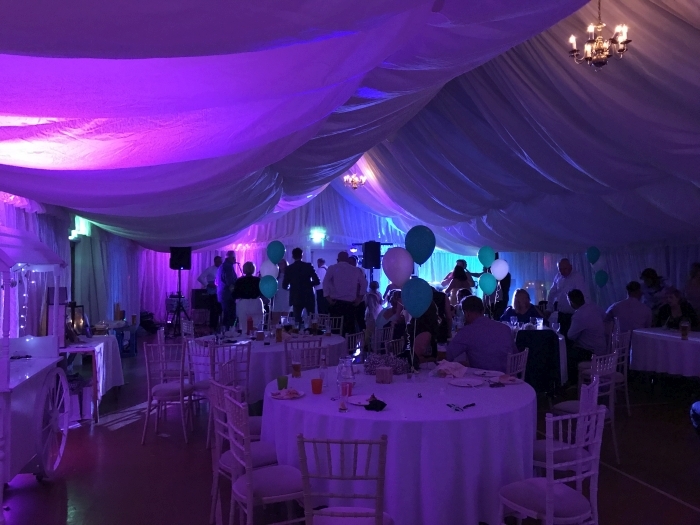 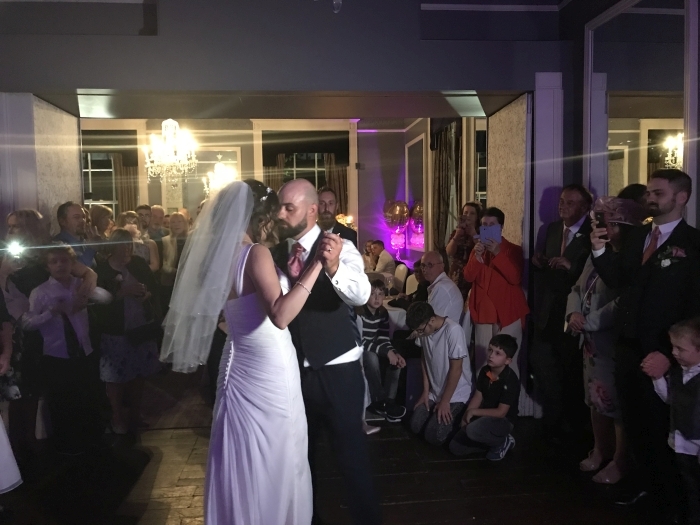 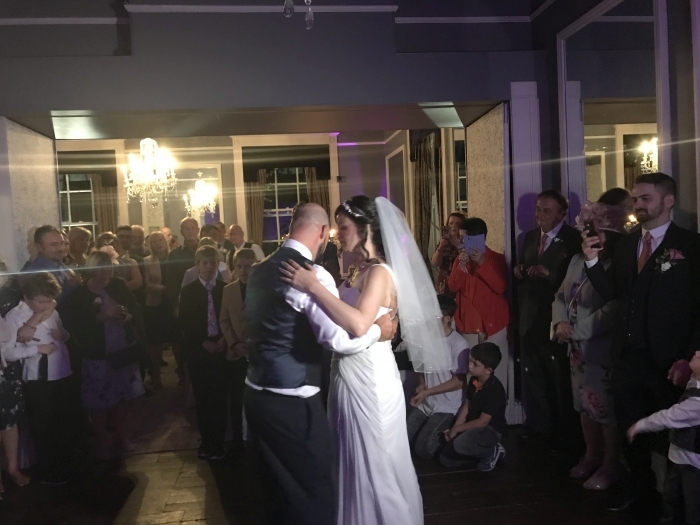 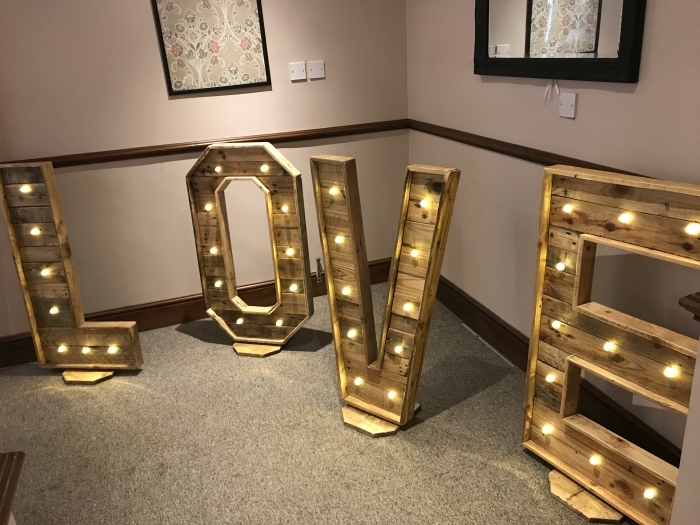 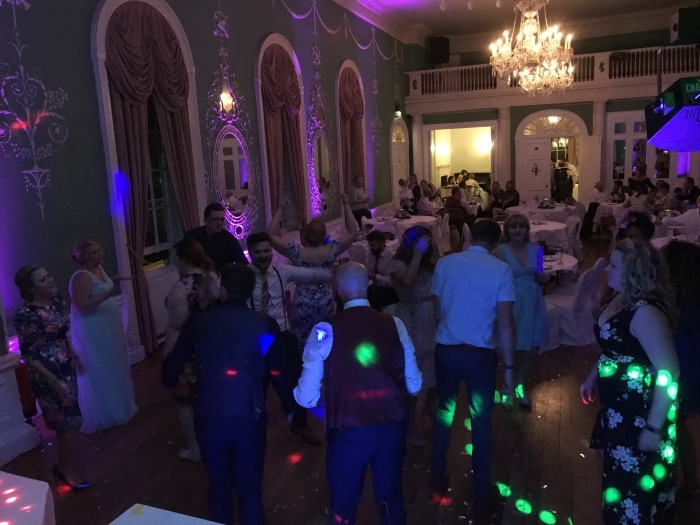 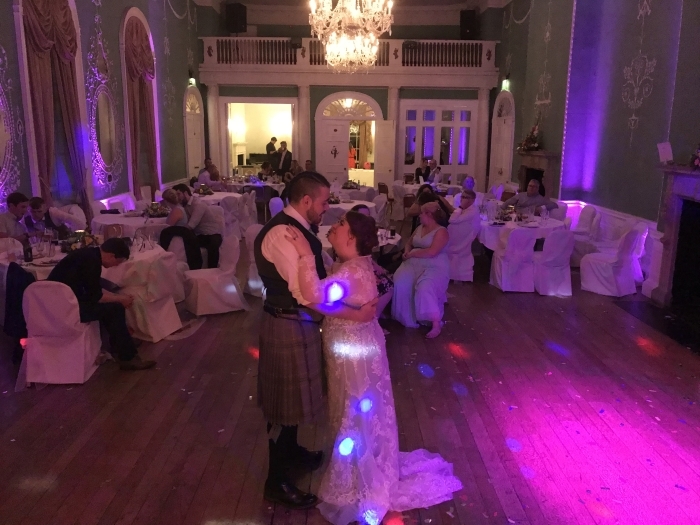 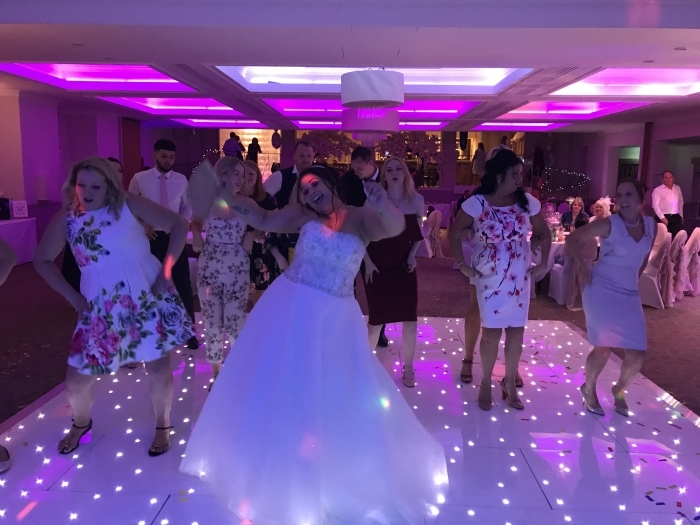 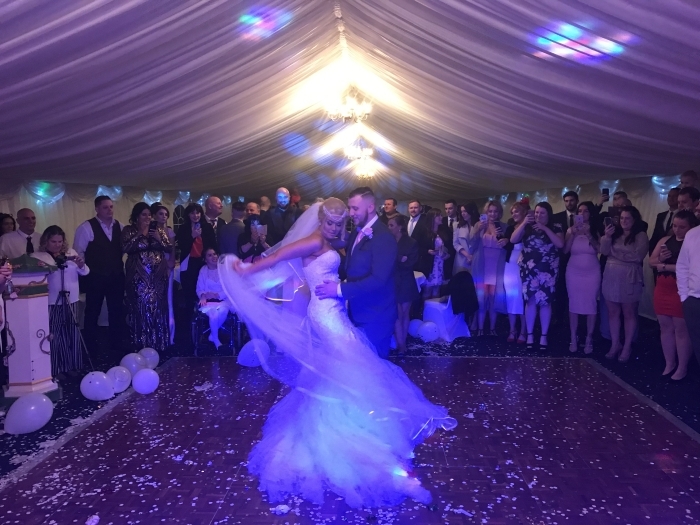 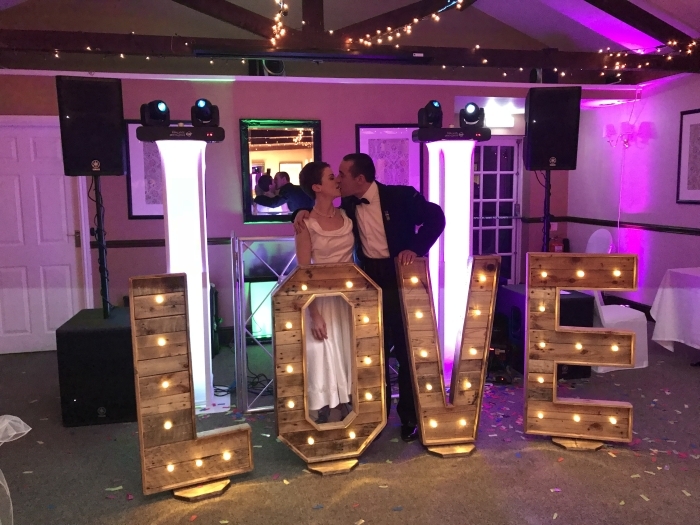 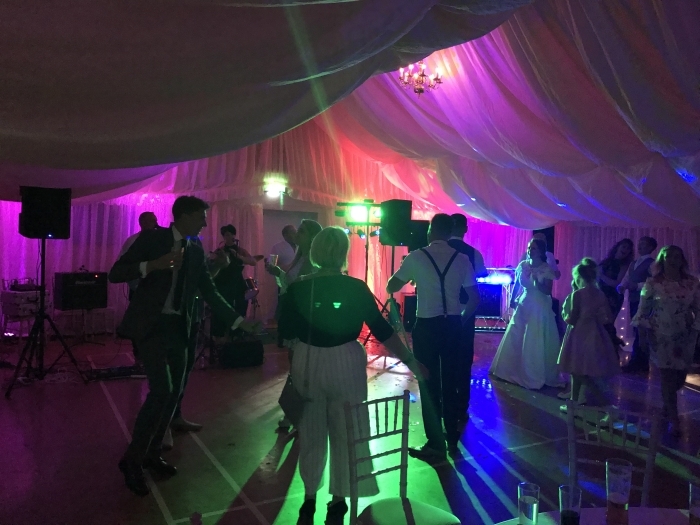 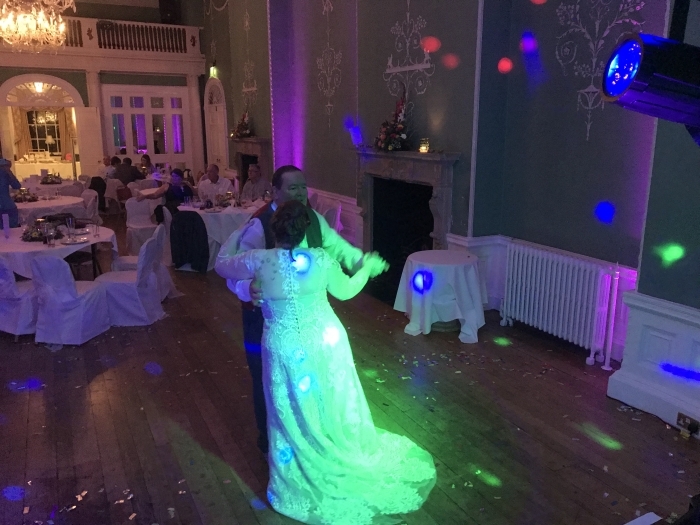 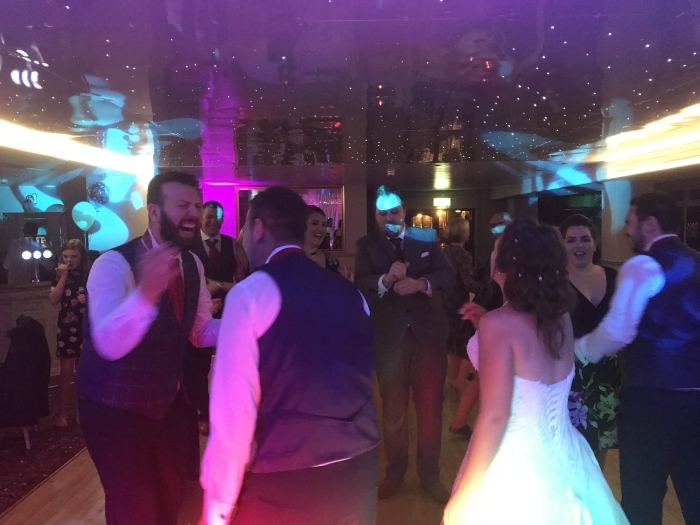 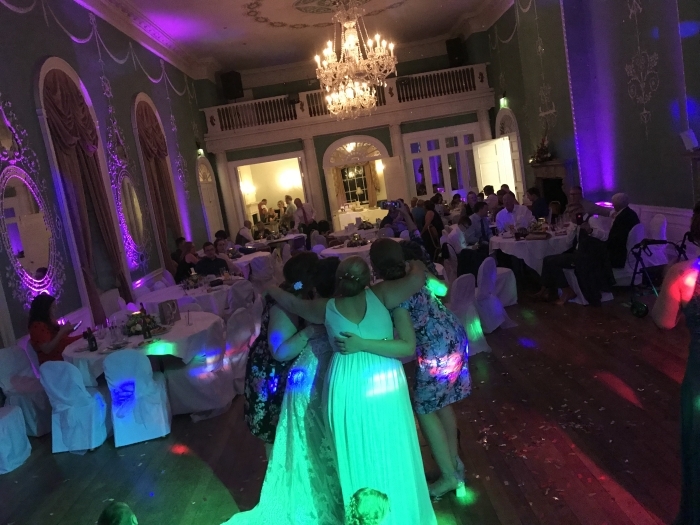 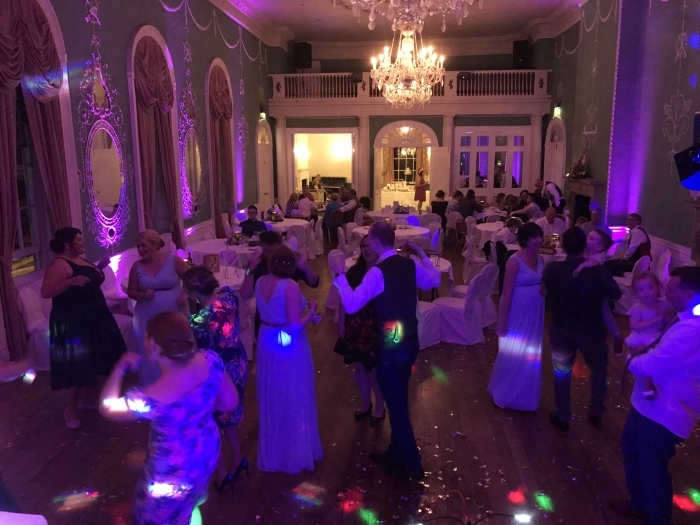 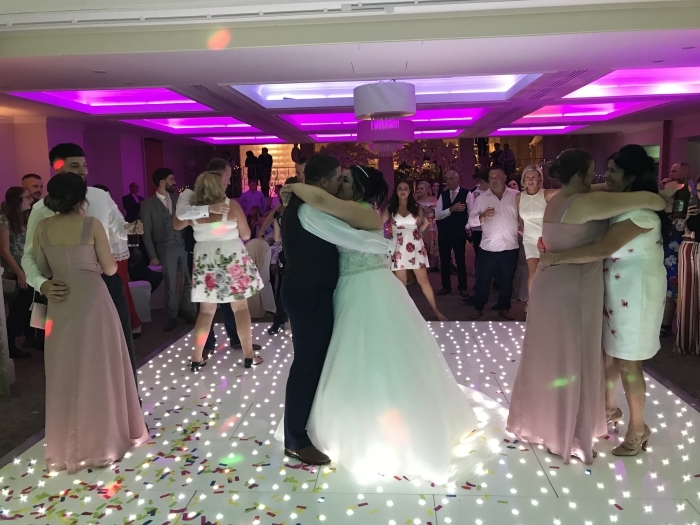 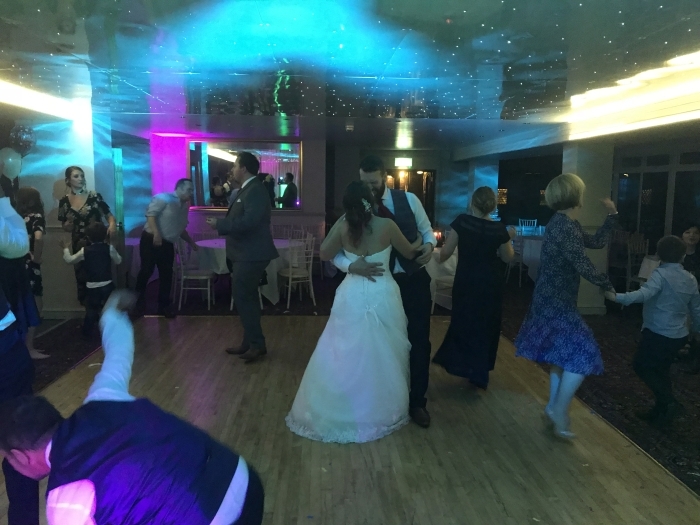 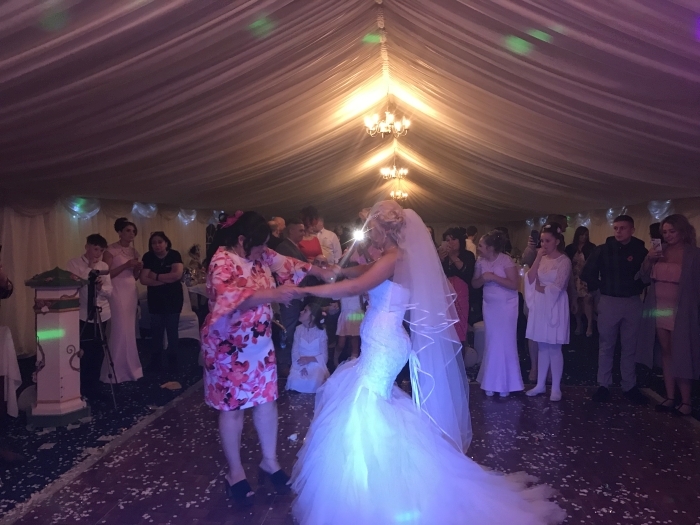 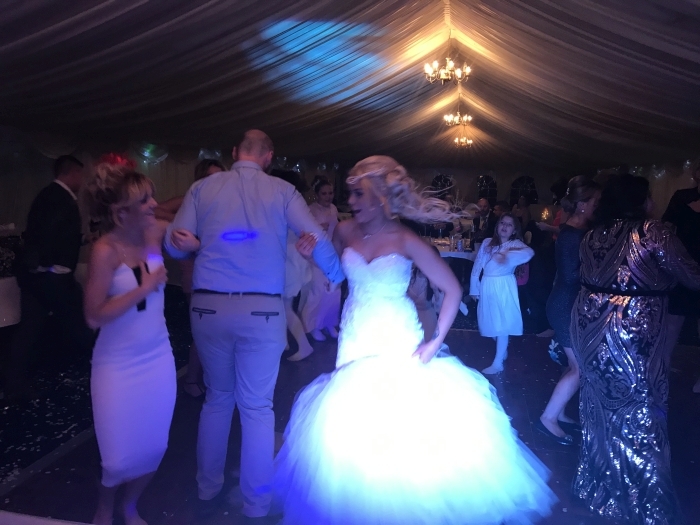 Saturday 18th August 2018 I provided my evening Wedding DJ package to Victoria & Chris at The Albrighton Hall Hotel Shrewsbury, this wedding had the full wedding wow factor with not only my full Wedding Setup which looked amazing but this was complimented by a very shinny and sparkling LED dancefloor, Giant 5’ LED ‘LOVE’ letters witch had 4 way LED bulbs making amazing lighting combinations and a whole host of other wedding favourites such as a photo booth (additional products supplied by Little Gem FX Shrewsbury). 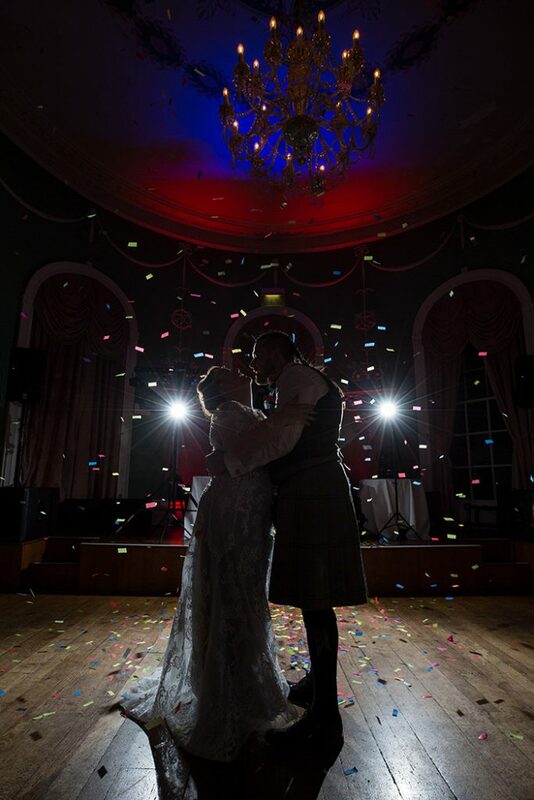 As you can see from the room pictures I took below this wedding had visual wow factor by the bucket loads! 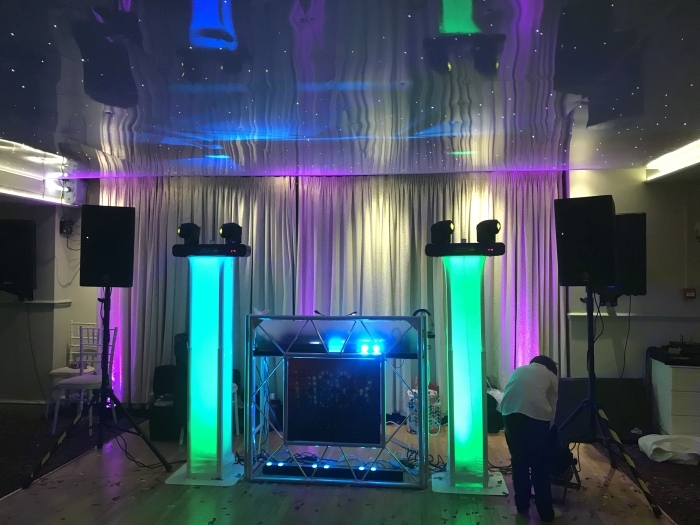 My initial setup time was scheduled for 5:30pm and a start time of 7:30pm for some upbeat background music following an acoustic trio who performed a 30-minute set, we however had a slight delay as the speeches did not finish until 6:30 which meant I had to get busy on setup and get it all done in super-fast time (Usually takes two hours)! 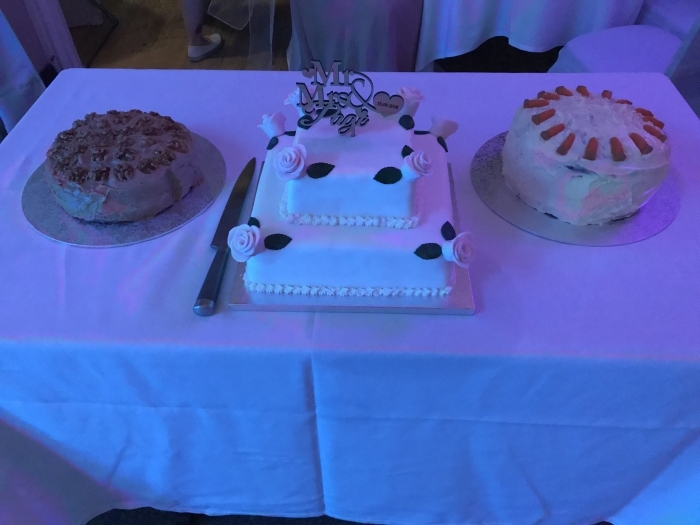 Straight after the cutting of the cake we went to first dance followed by a mother daughter dance. 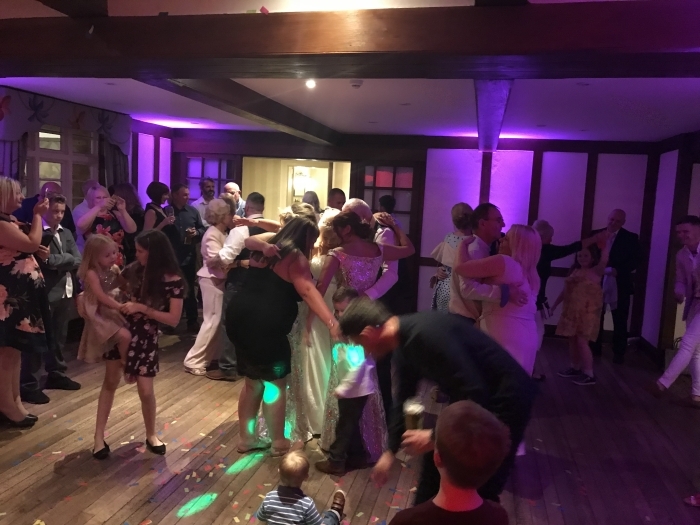 The dance floor was busy all night with the party going through to half past midnight and finishing on the first dance tune with close family and friends gathered around the dancefloor singing along. 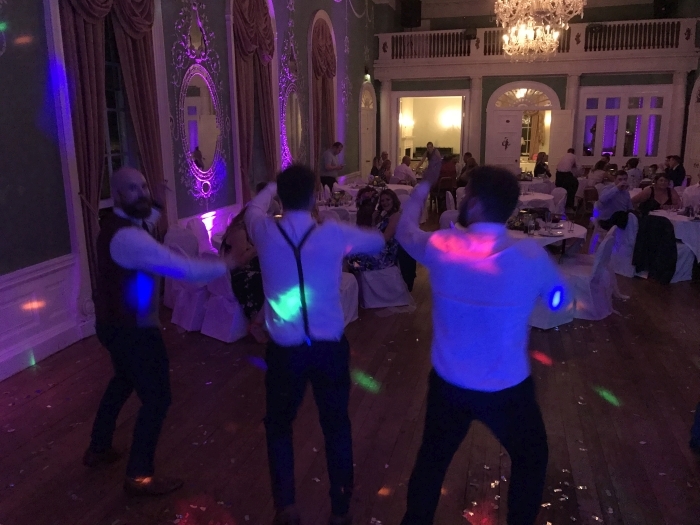 In my opinion its really nice when you can finish with everyone involved opposed to simply the music ending, it provides that extra special ending and makes a couple more amazing memories. 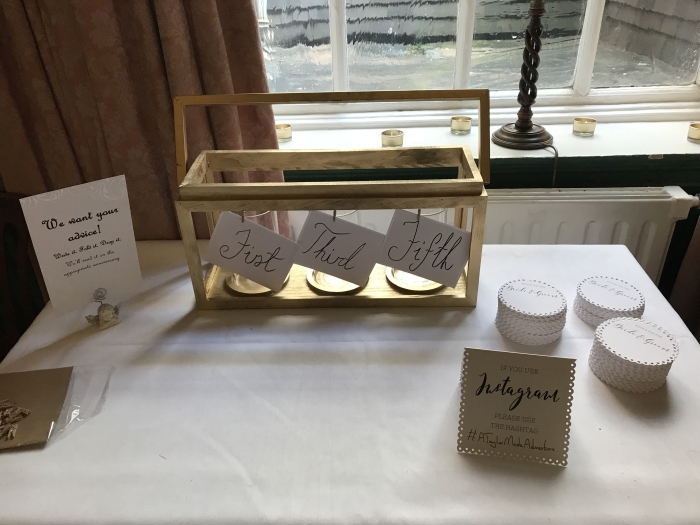 When given the opportunity I try and encourage bride and grooms to this. 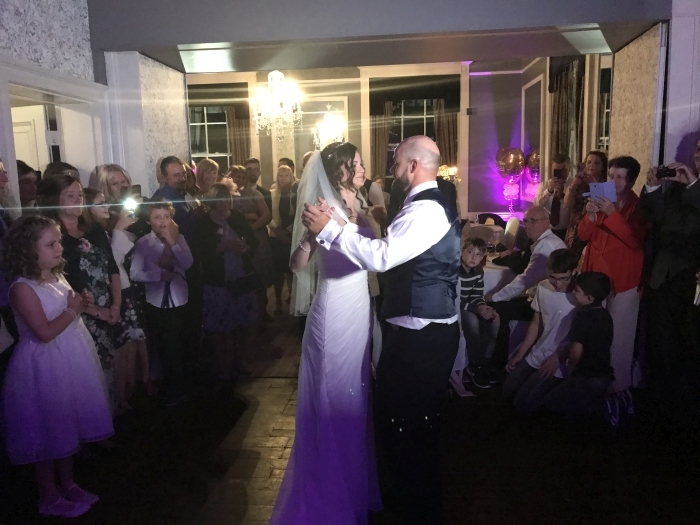 As you can see from the video below it really makes to a special ending of a most wonderful day. 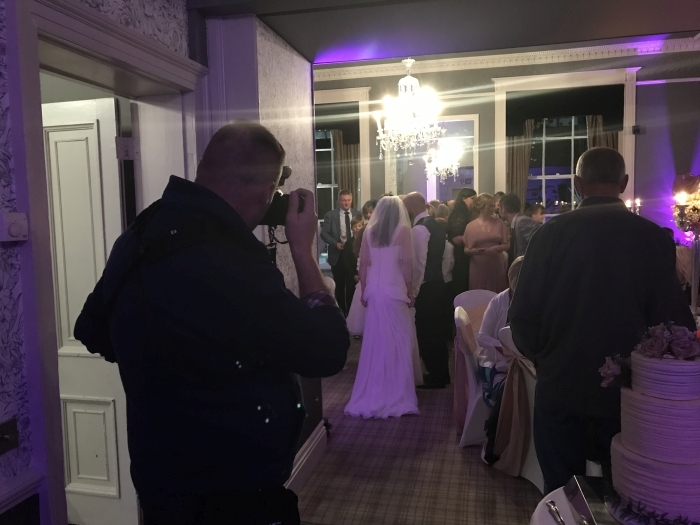 As always, I like to try and take a few videos during the event, usually starting with one where I’m doing a bit of a tour of the room, setup and venue. 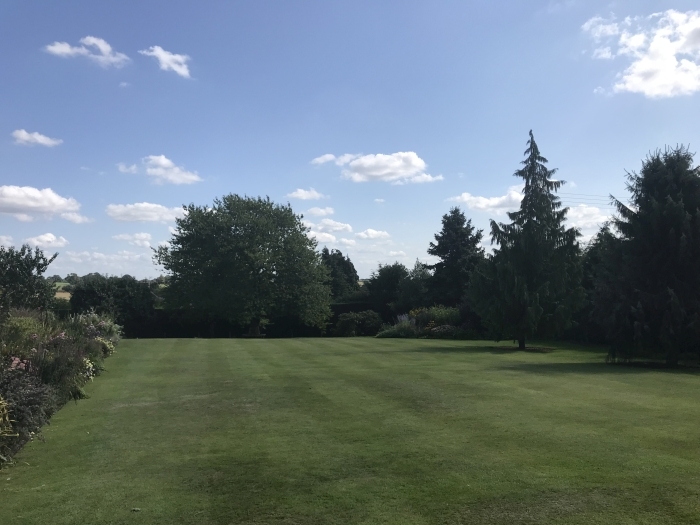 Unfortunately, due to time constraints I was not able to produce a video tour as I would have liked this time which is a shame as it truly was a visual wow and would of made for a fabulous video! 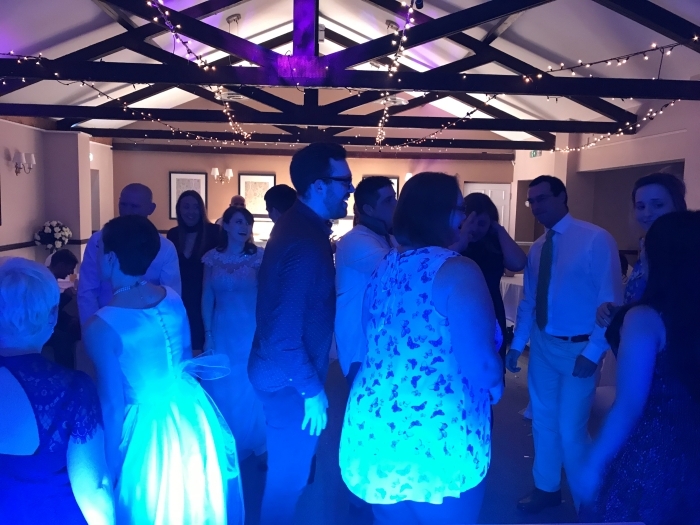 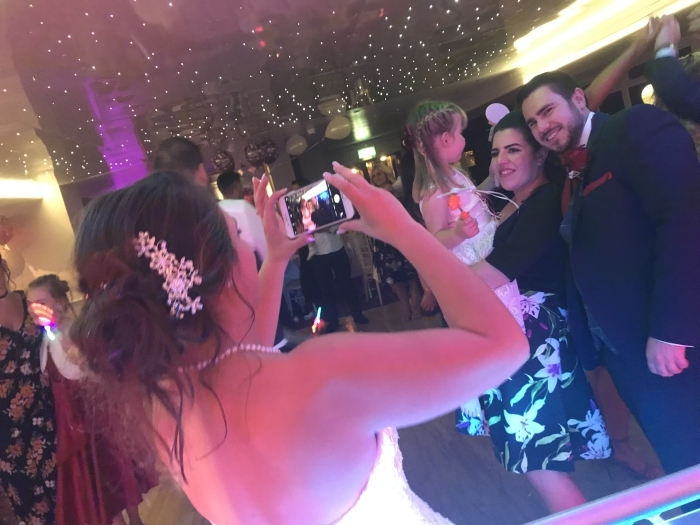 I did however manage to record an introduction and a couple of short films of the wedding dancefloor throughout the evening including the final dance. 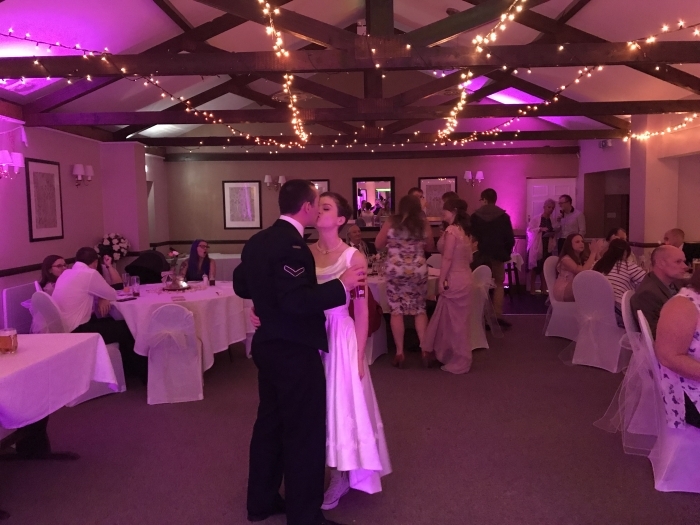 Last dance of the night – making those very special memories. 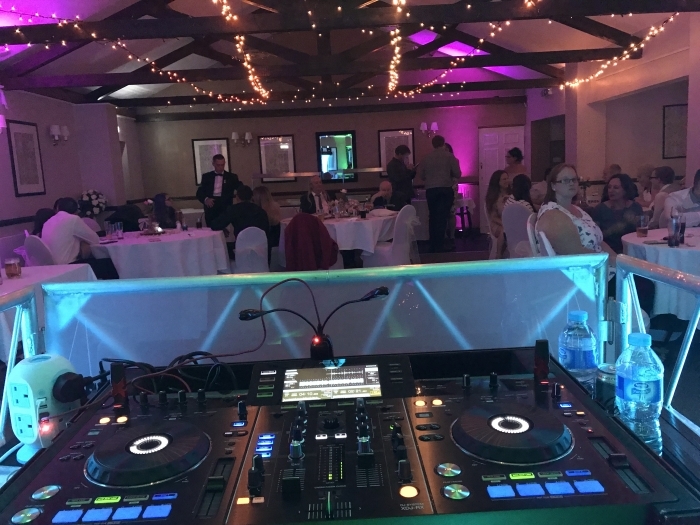 Here are a few photos of what the Wedding DJ Setup and room looked like. 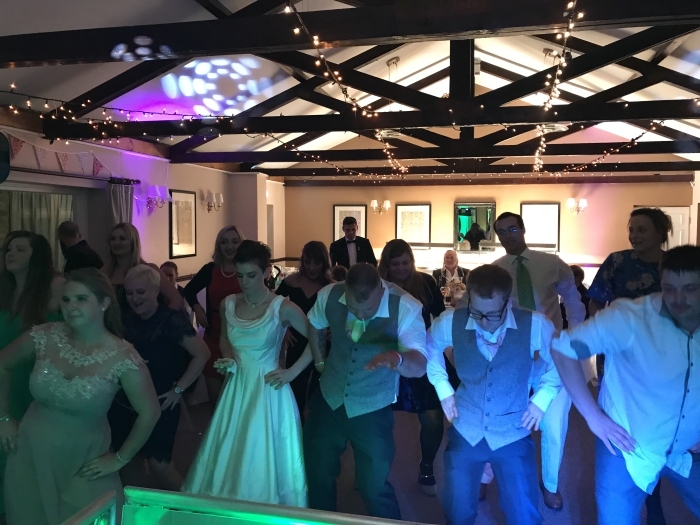 With a busy dancefloor throughout the night I had an absolute load a fabulous picture to choose from, here are a selection of photos I took from the DJ Booth of the Wedding Dancefloor. 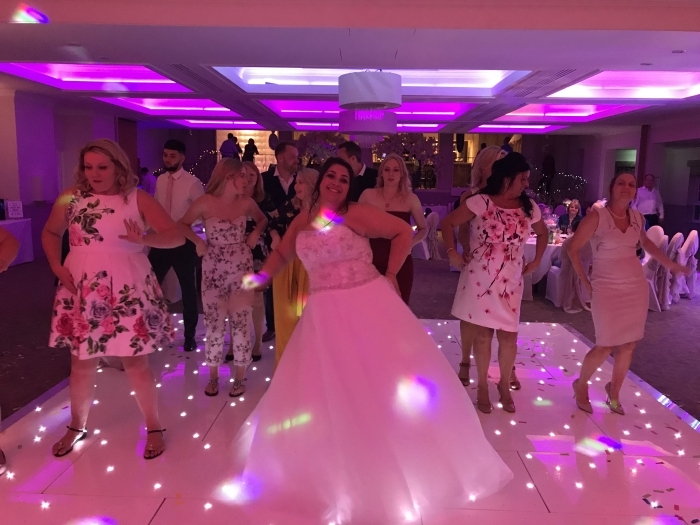 Vicky and Chris decided that they would like my full Wedding Setup and it was the perfect fit for their wedding disco. 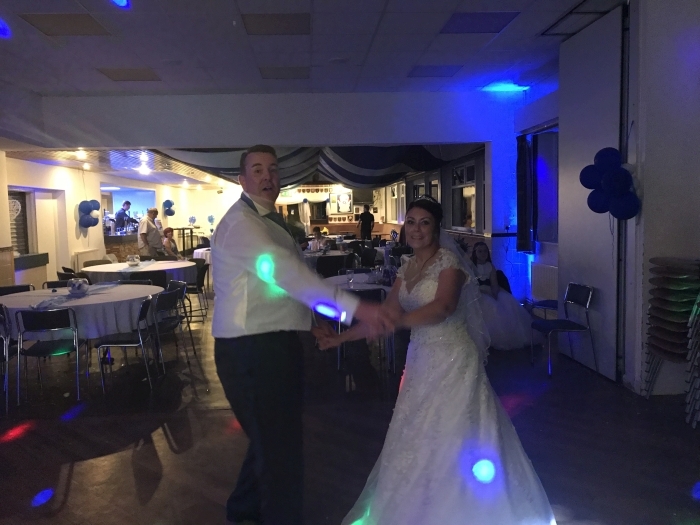 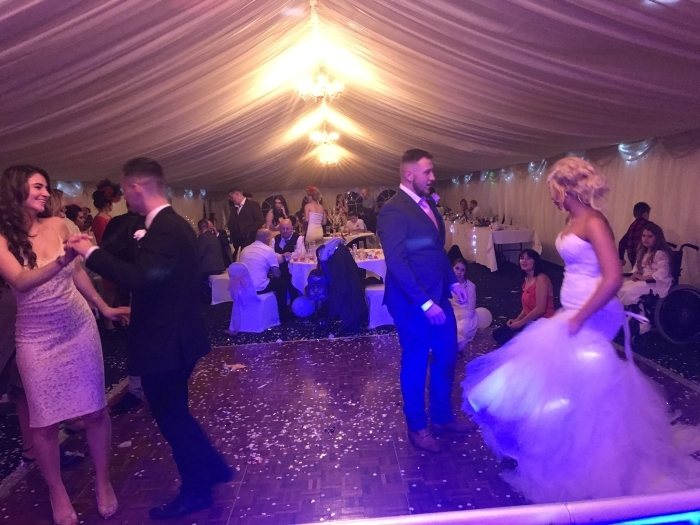 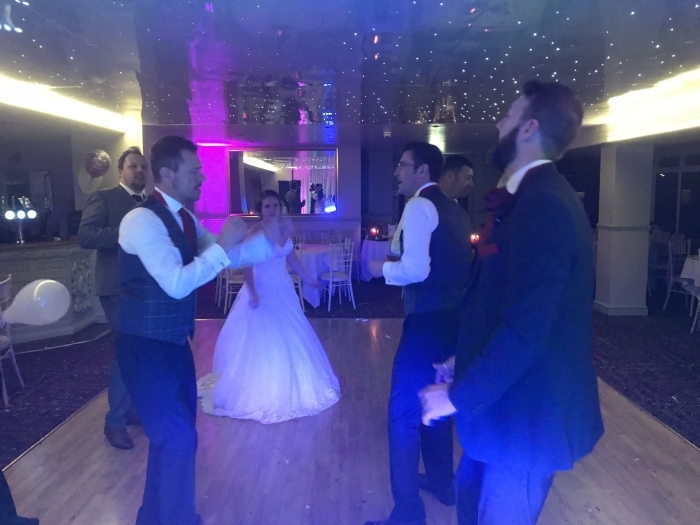 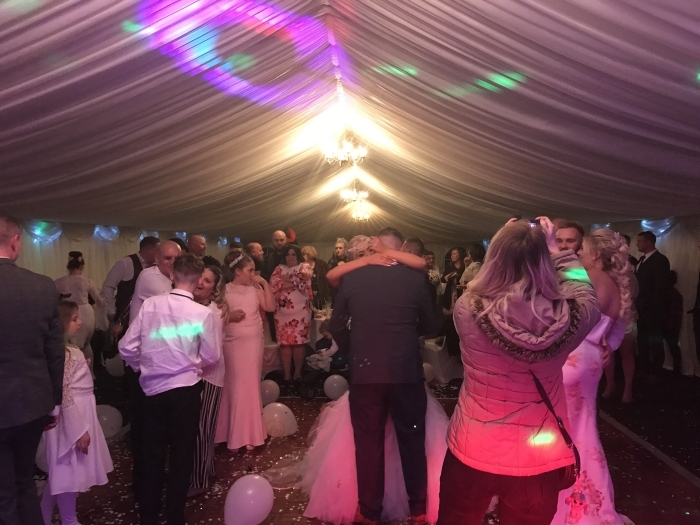 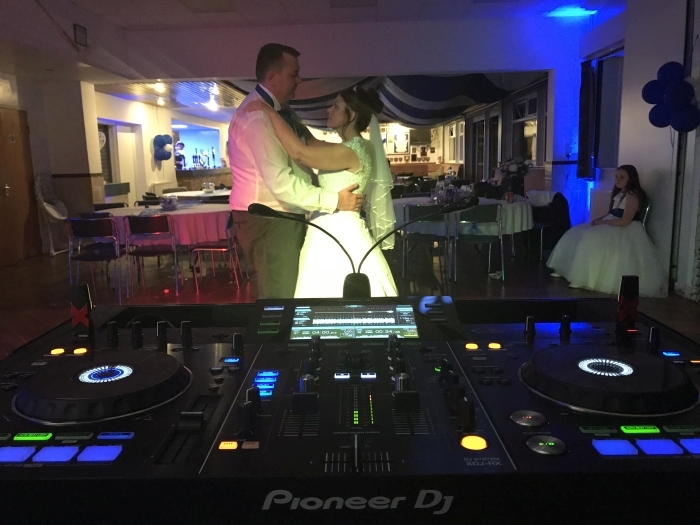 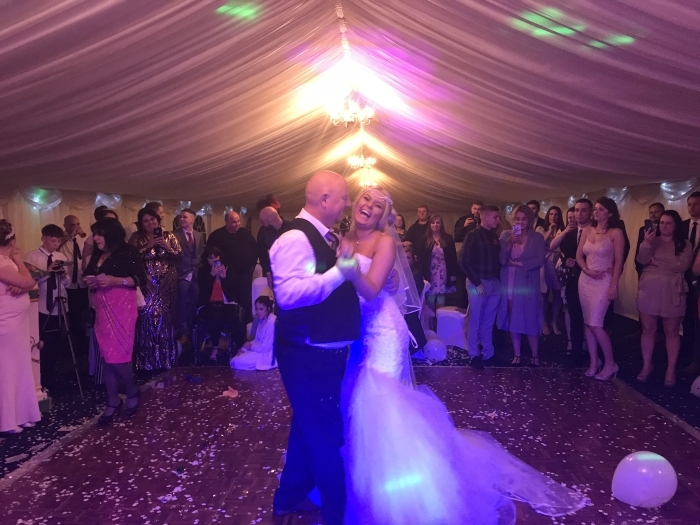 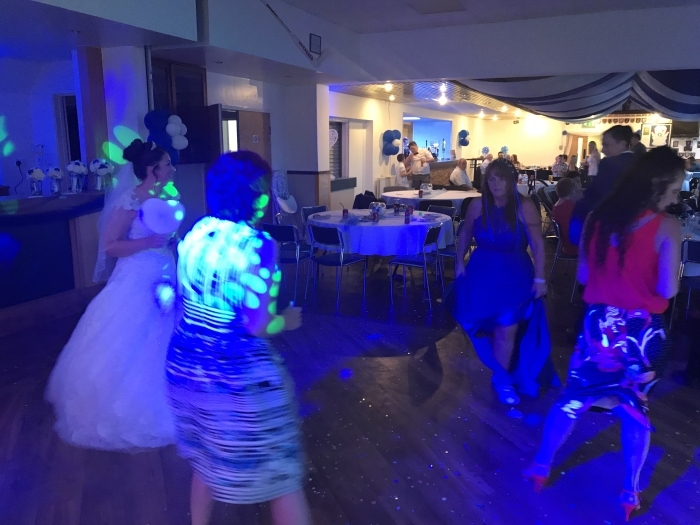 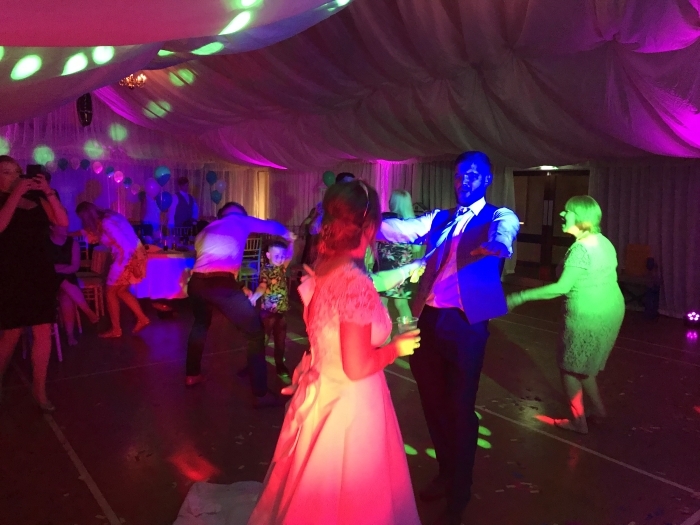 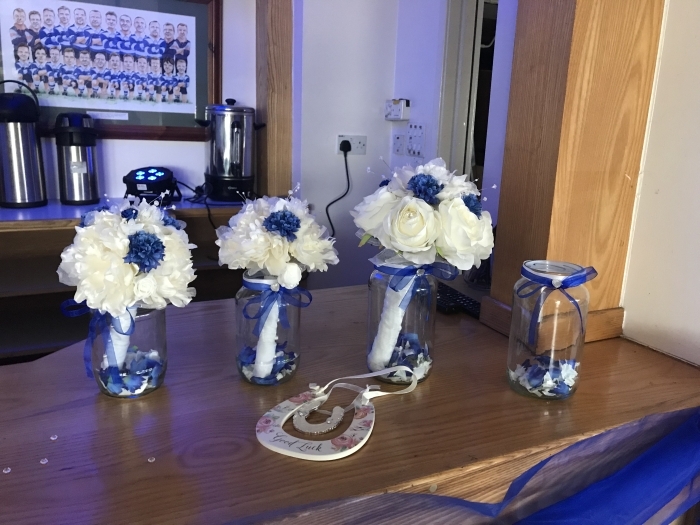 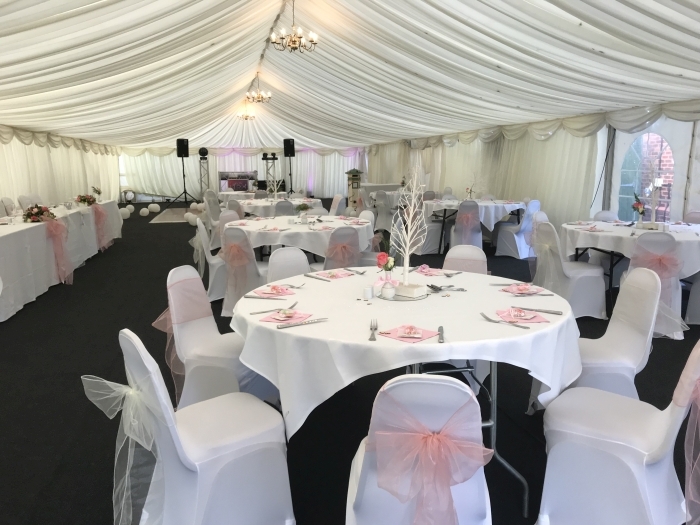 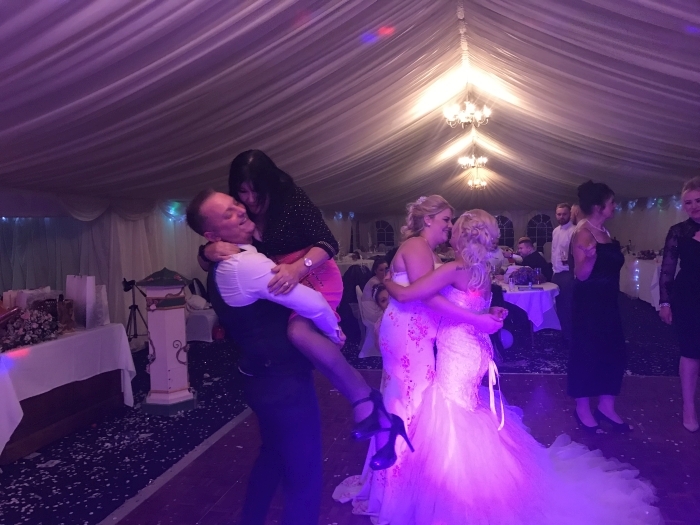 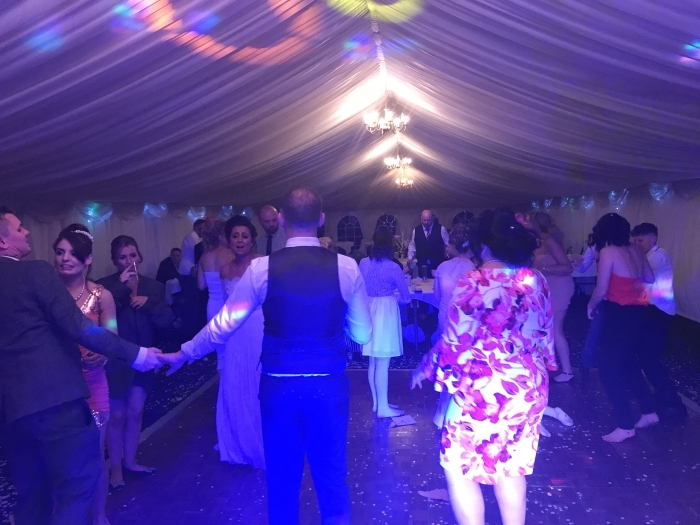 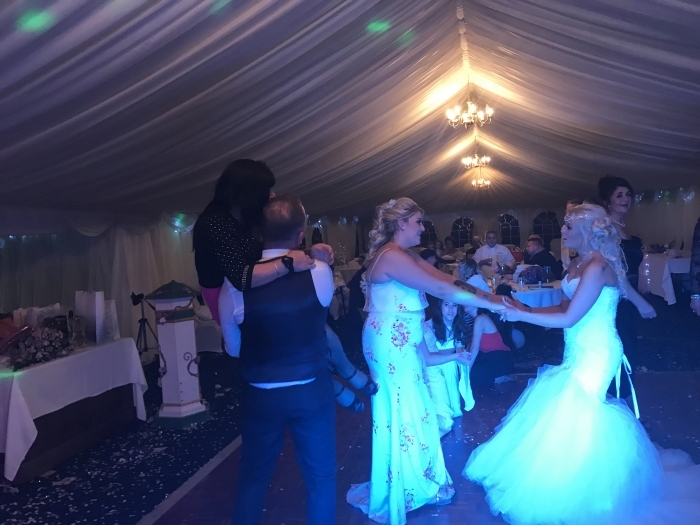 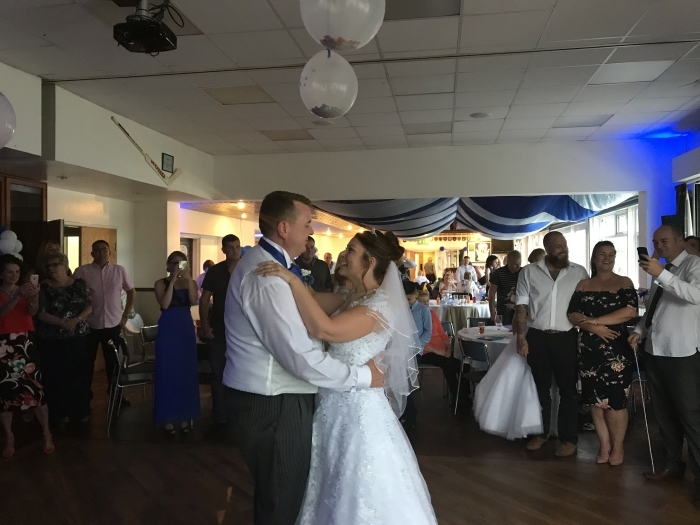 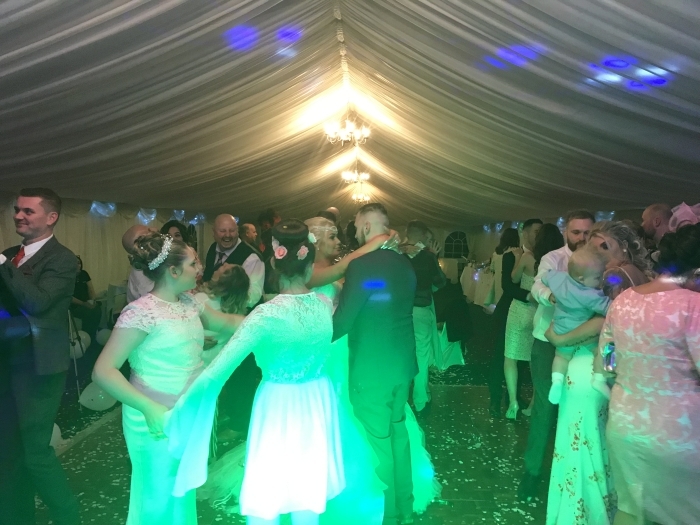 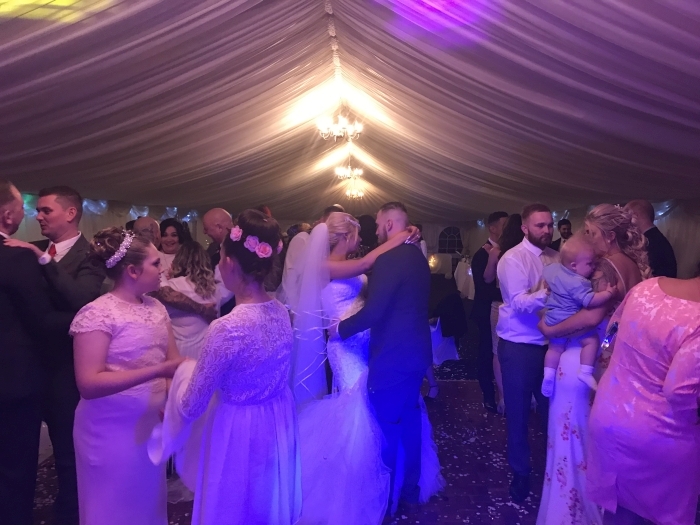 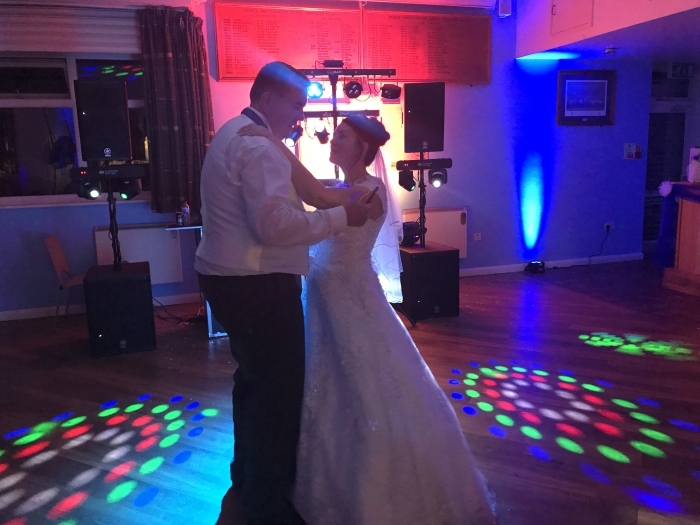 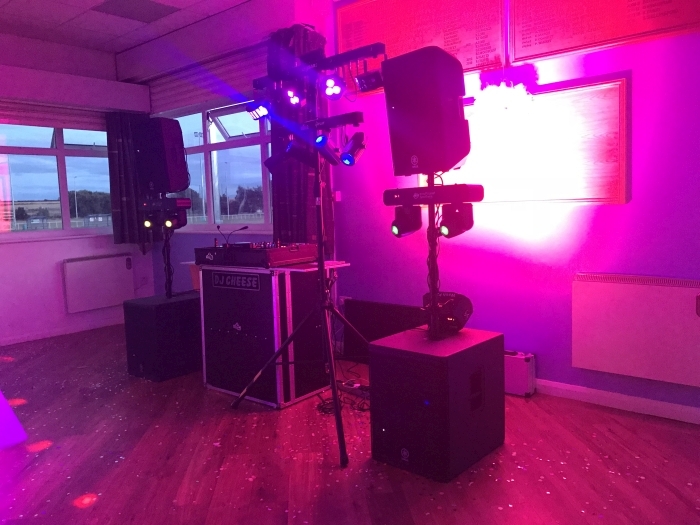 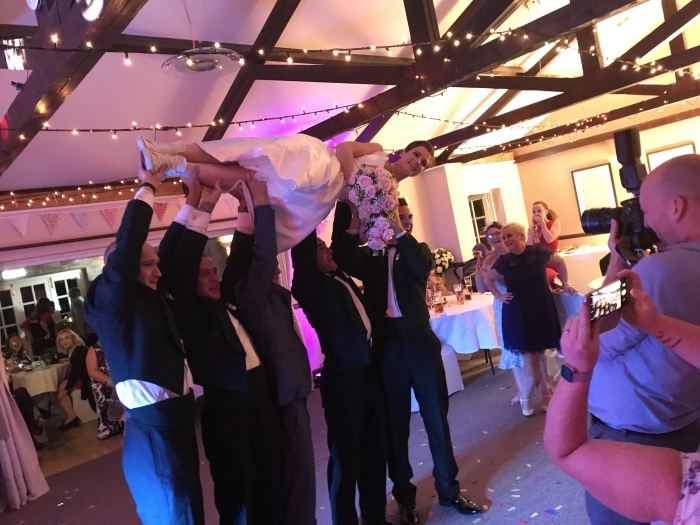 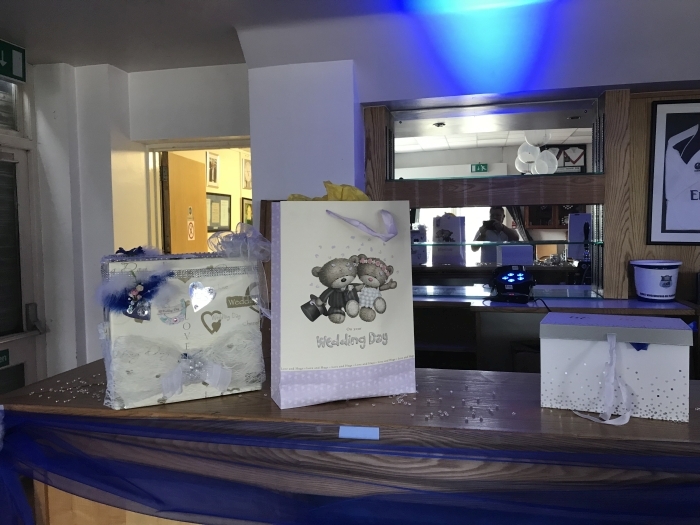 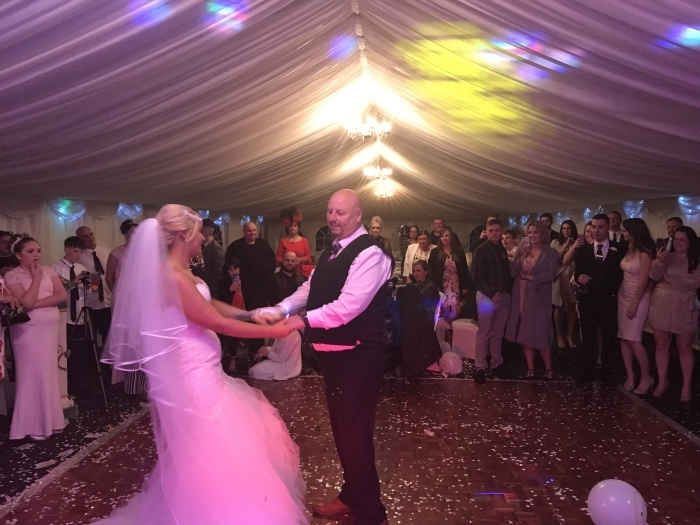 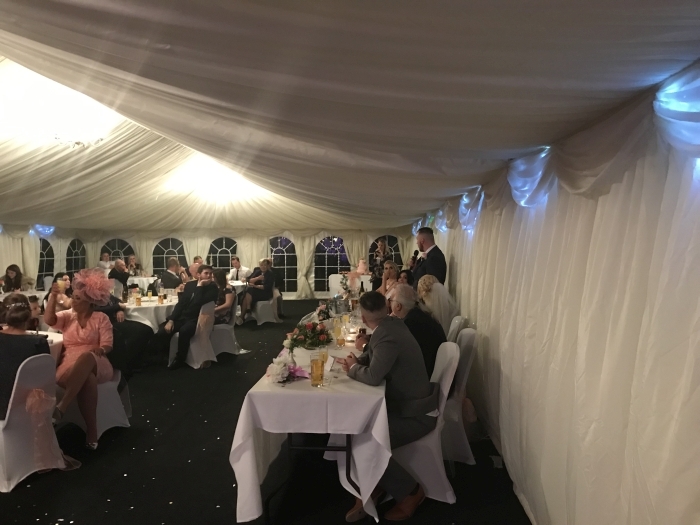 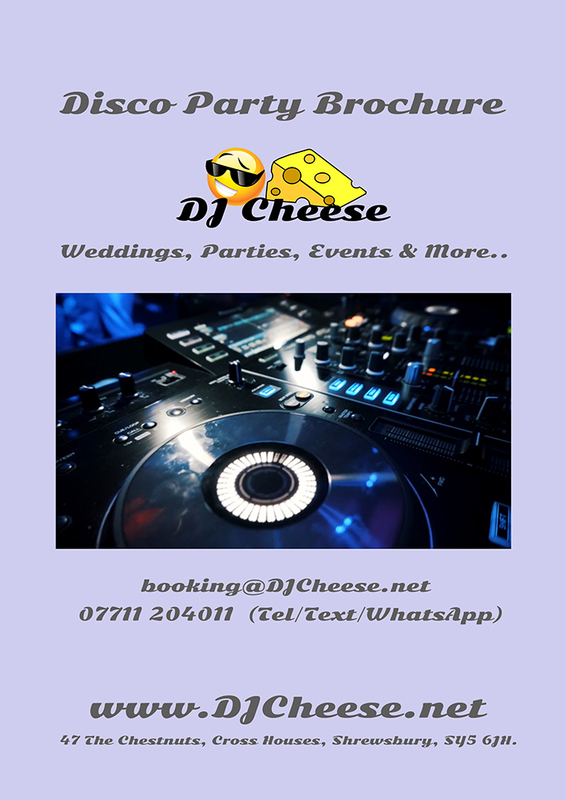 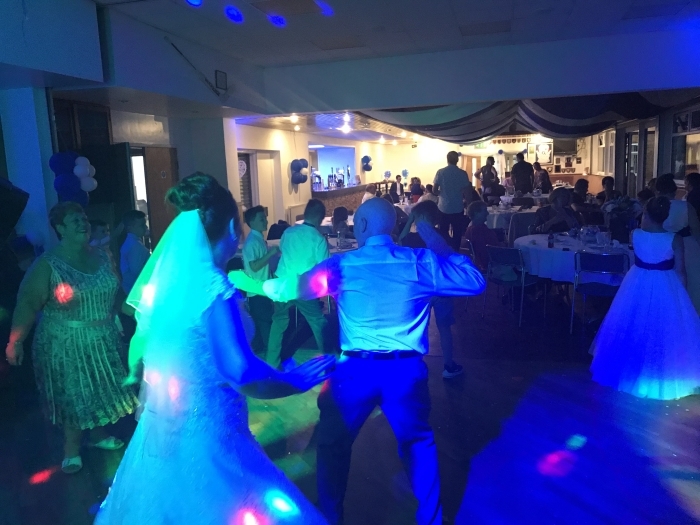 Friday 3rd August 2018 I provided my evening Wedding DJ package to Richard & Kerry at The DK Rugby Club Kingswinford, with an arrival setup time of 3pm and background music start at around 4pm for gust arrival following the wedding ceremony locally. 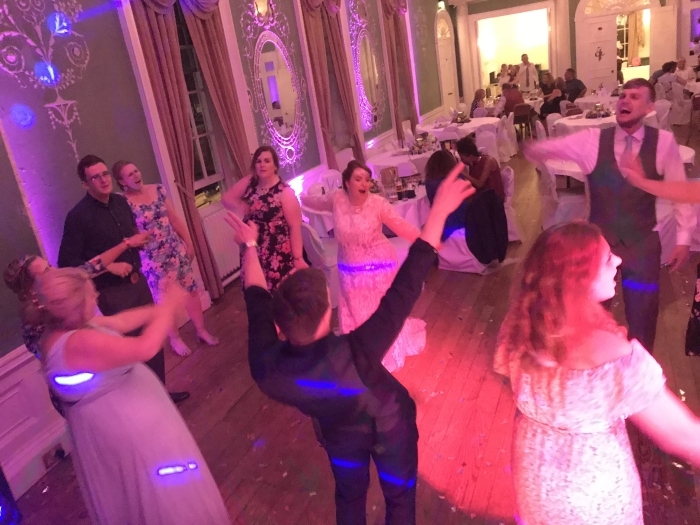 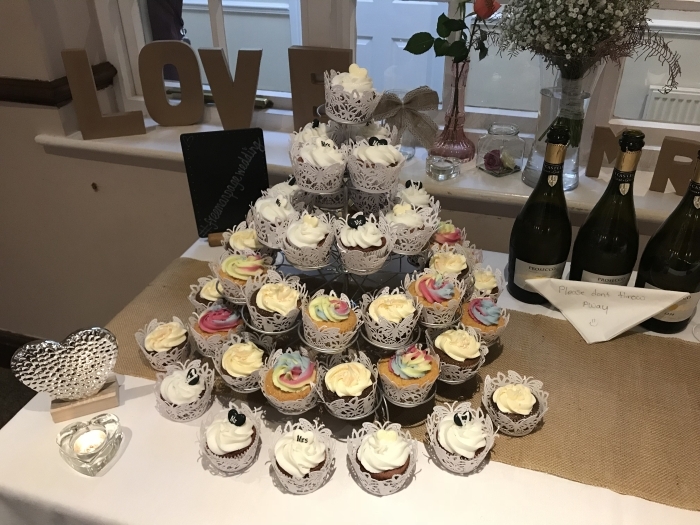 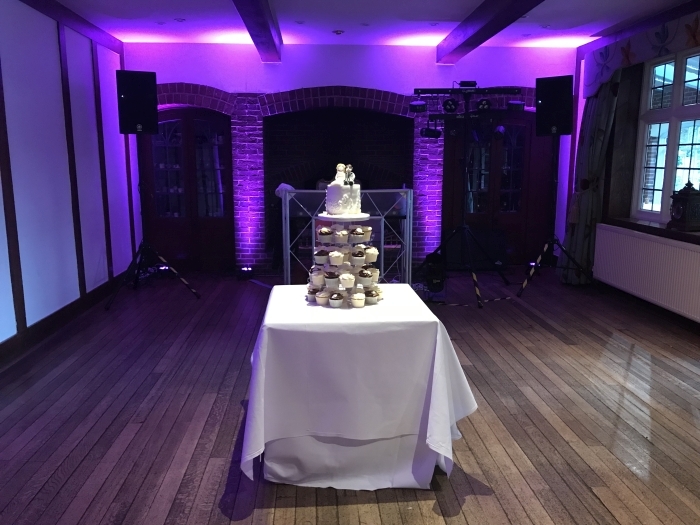 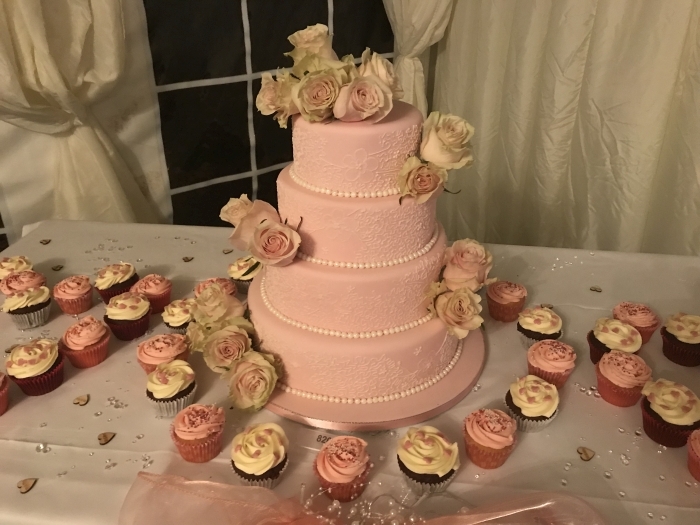 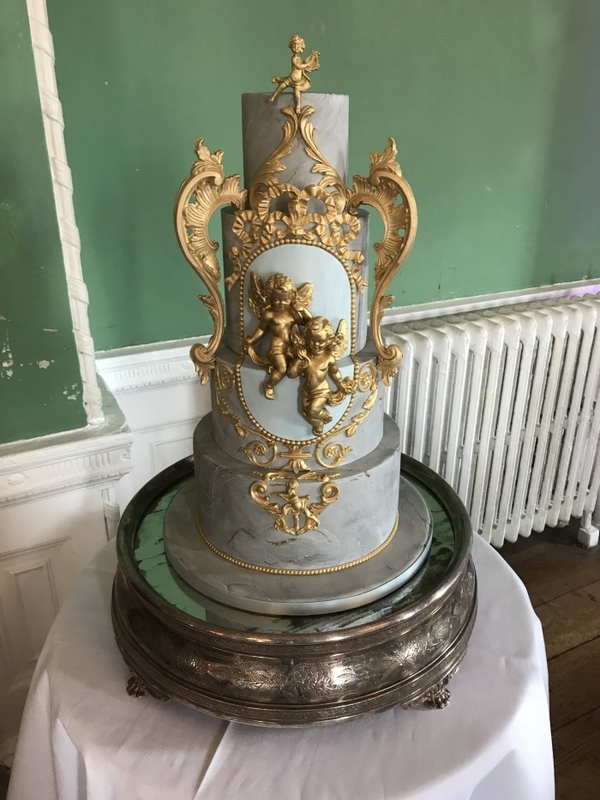 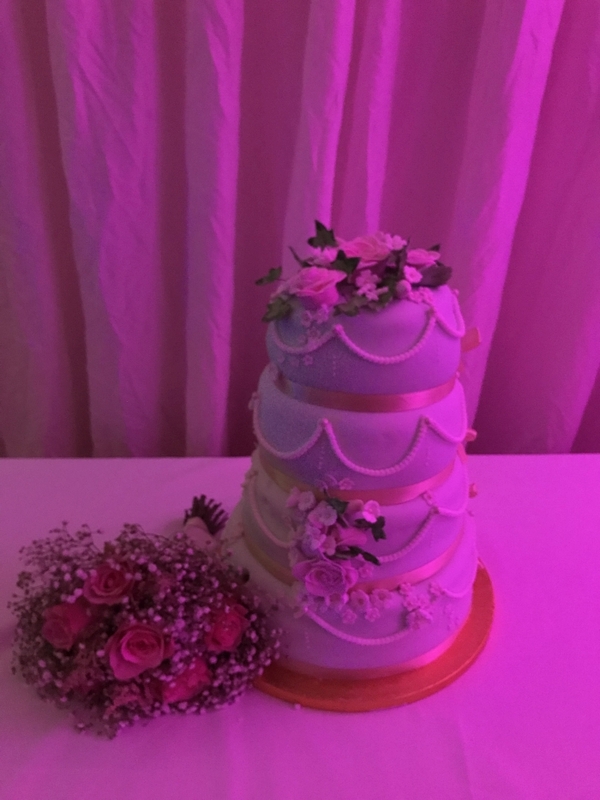 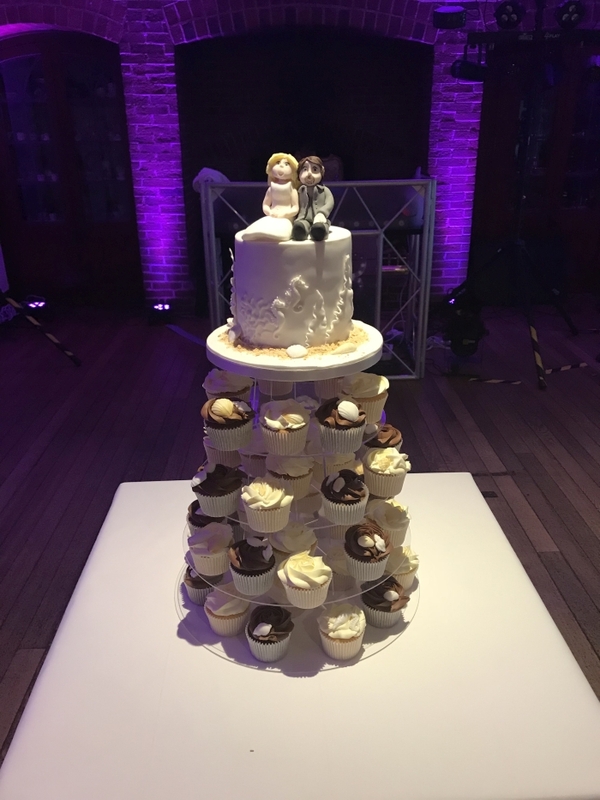 Once the wedding party had finished their Wedding Breakfast I provided wireless microphones for the speeches, then I announced the cutting of the cake, Later that evening at around 8:30pm was the first dance going straight in to the evening disco through to midnight. 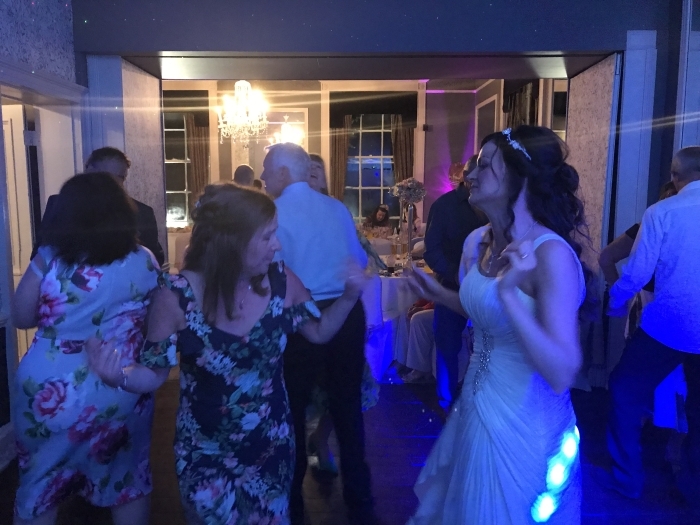 I was provided with a comprehensive playlist which was a great guide for the music the bride and groom wanted for the evening. 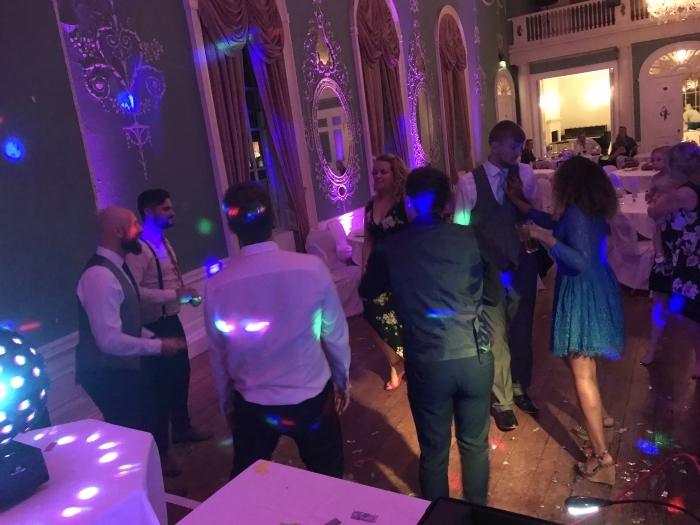 As always, I like to try and produce a video to run through what is planned for the day / night. 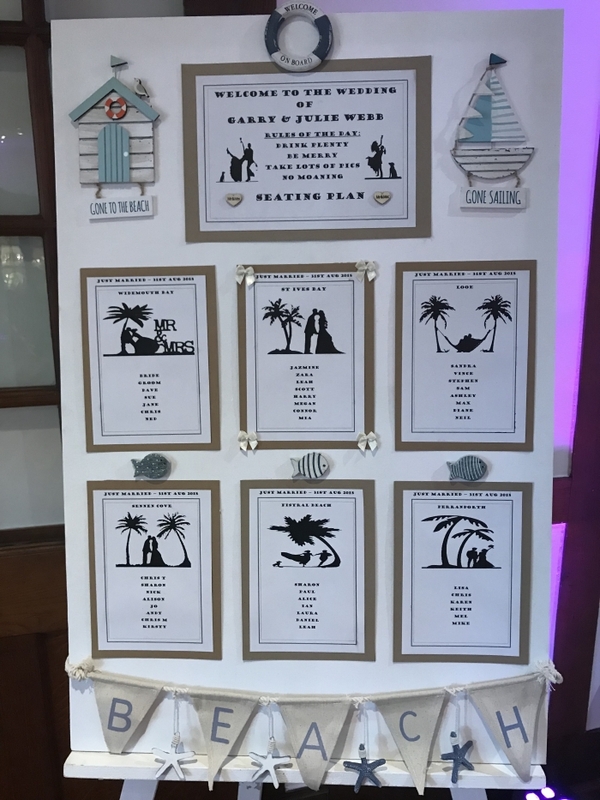 A couple of pictures I took prior to the Wedding Disco. 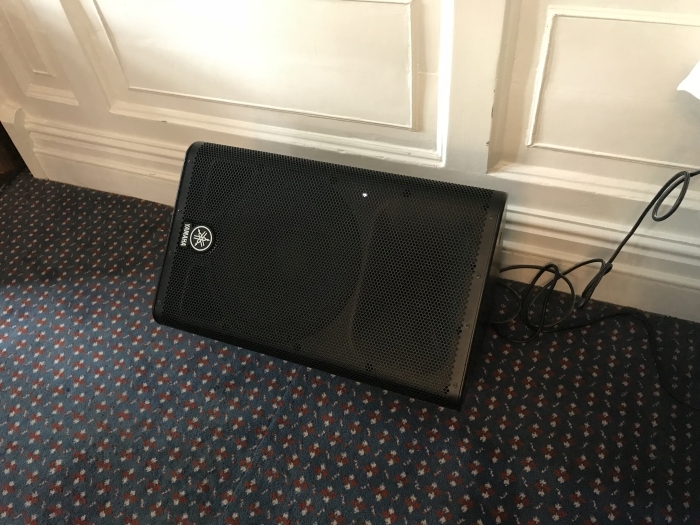 This is a list of the equipment used at this wedding.